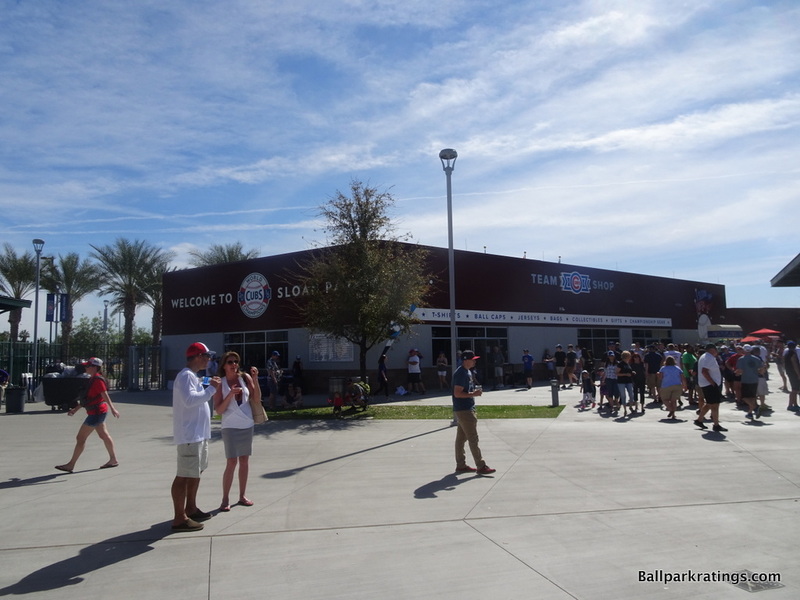 Lauded as further raising the bar for spring training facilities, my expectations for Sloan Park actually weren’t that high. 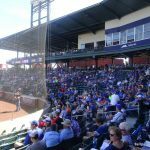 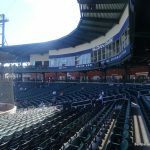 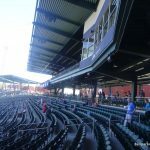 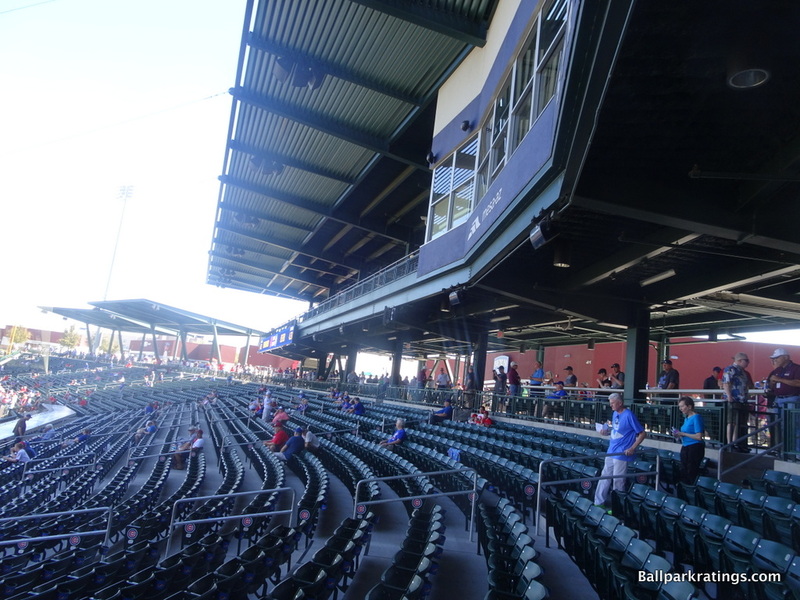 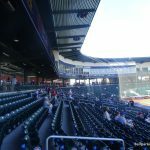 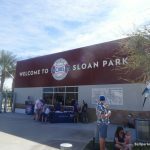 While this was still an elaborate facility built for one of baseball’s most beloved teams, Sloan Park made no pretensions of trying to outdo Camelback Ranch or Salt River Fields at Talking Stick from an aesthetic standpoint. 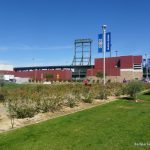 This has held true, but Sloan Park compensates for that fact by succeeding in something that has eluded Cactus League parks for decades. 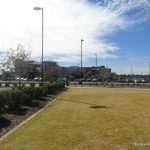 Moreover, it does so while still being a very attractive place with all of the essentials and amenities. 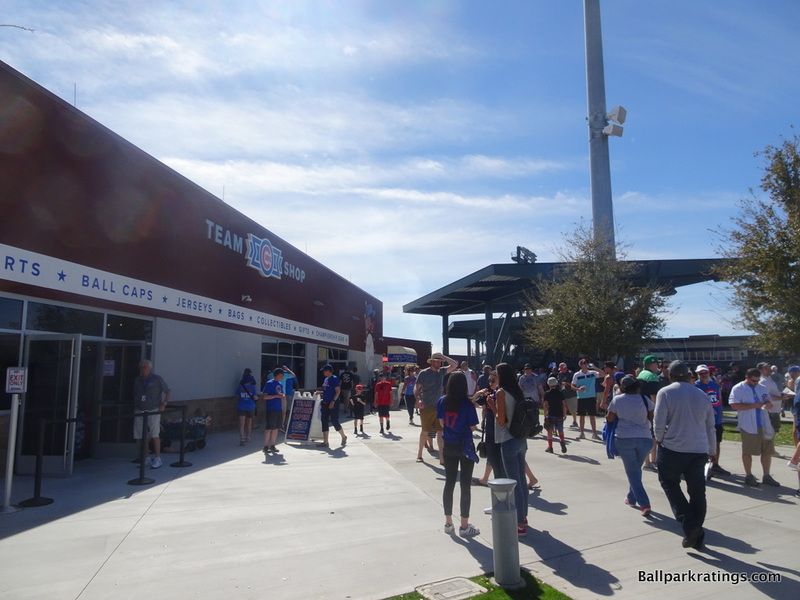 With fewer shared complexes and more older facilities, Grapefruit League parks have historically done a better job of representing the teams that inhabit them. 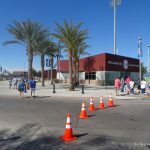 Prime examples include JetBlue Park (Red Sox), Steinbrenner Field (Yankees), Joker Marchant Stadium (Tigers), Florida’s Fenway McKechnie Field (Pirates), Ed Smith Stadium (Orioles), and the list goes on. 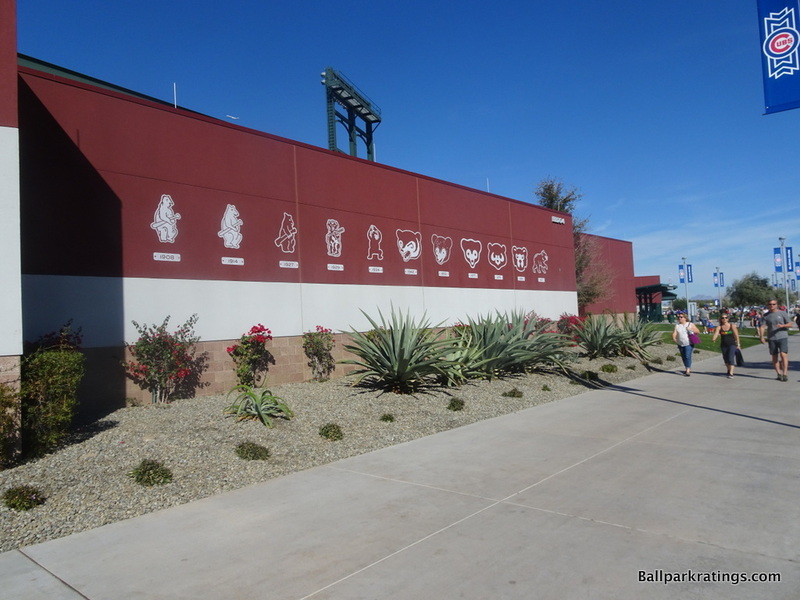 Five shared Cactus League complexes may have been otherwise better, but they lacked the charming sensibility that reminded fans of home. 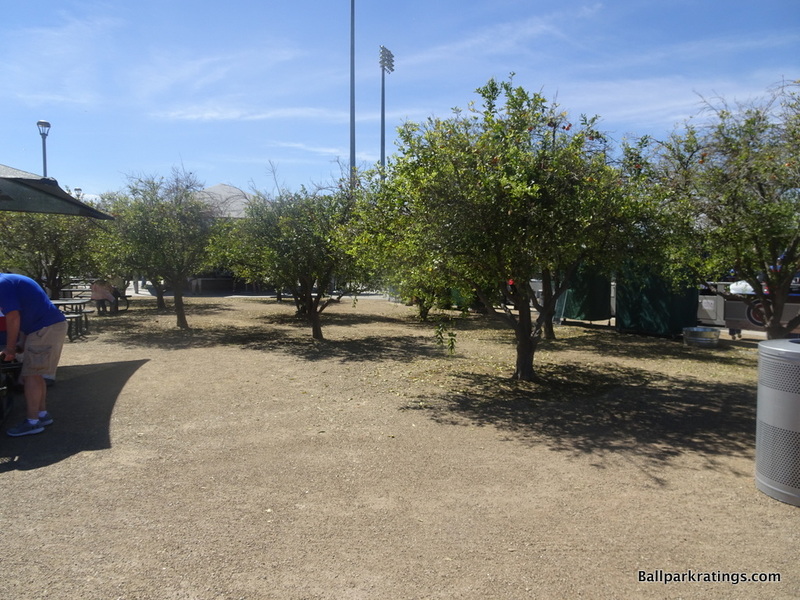 At the same time, the Floridian spring parks were often lacking in amenities and fan-friendly elements like being able to circle the concourse. 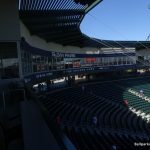 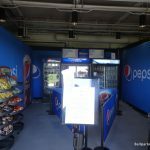 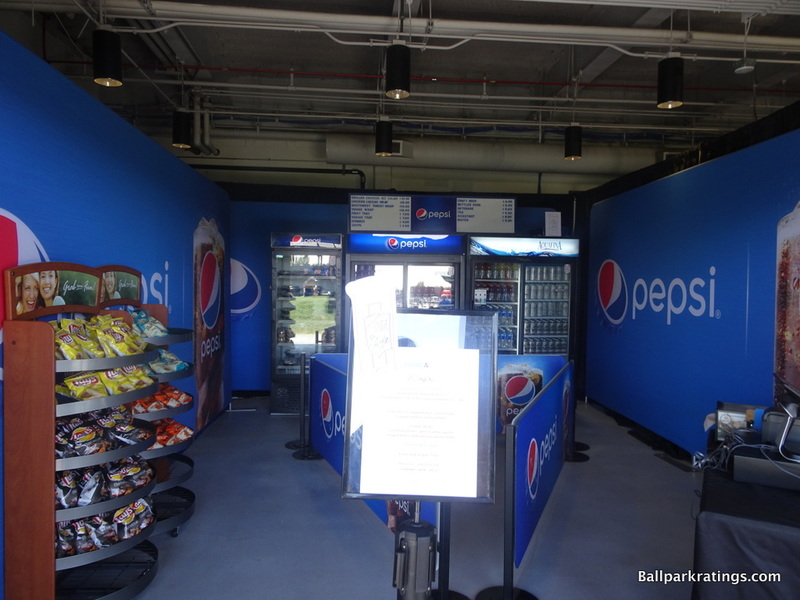 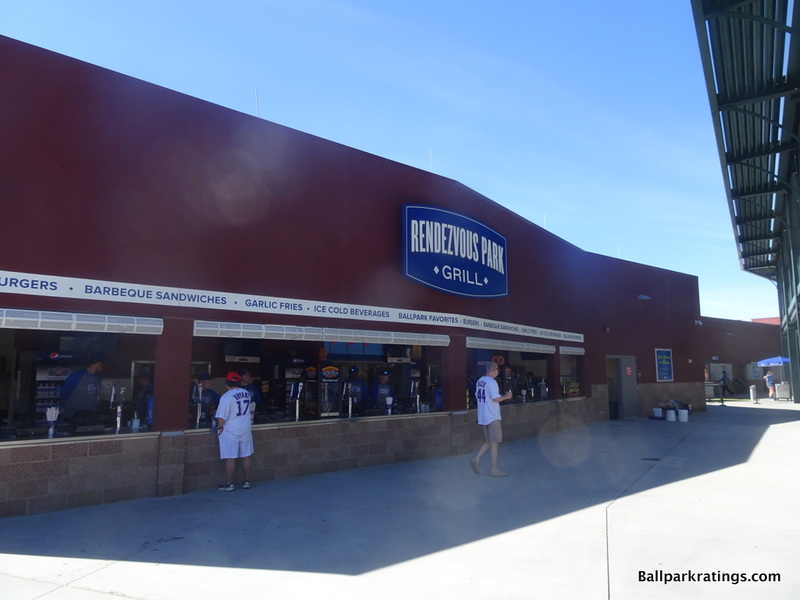 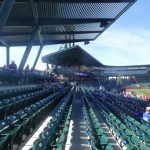 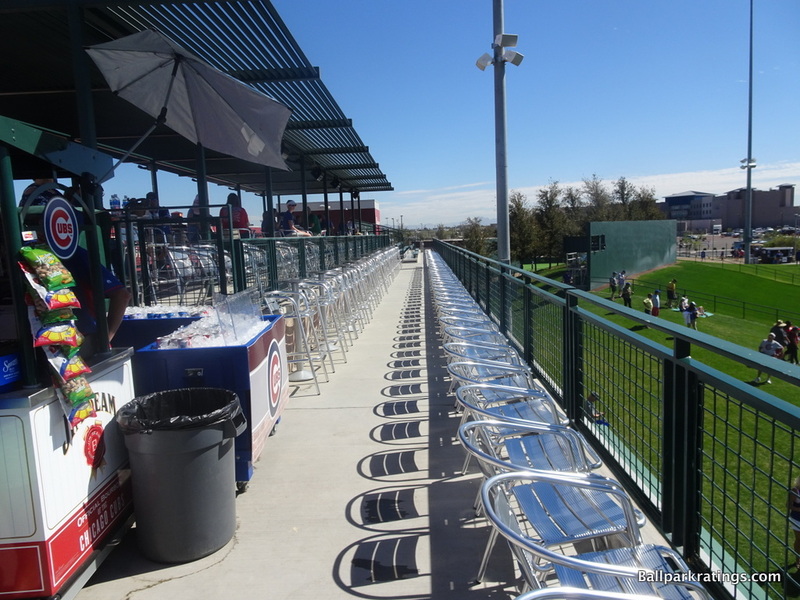 At one point, only one park in the Grapefruit League had a 360-degree, open concourse, while not one in the Cactus League lacked both of those features. 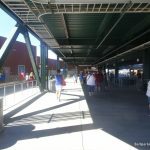 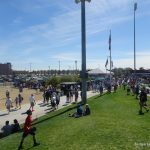 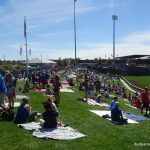 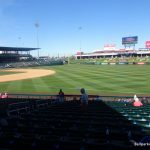 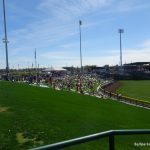 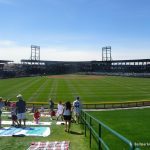 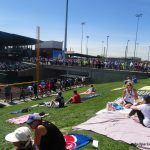 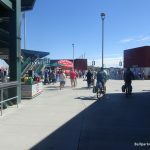 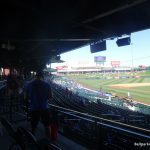 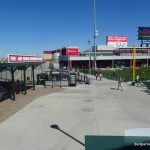 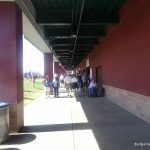 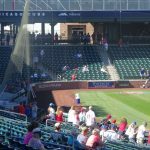 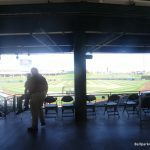 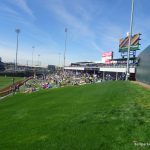 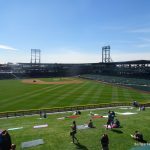 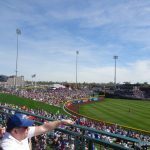 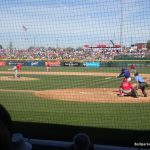 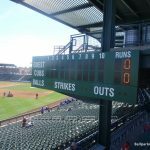 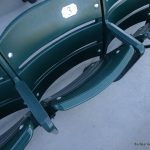 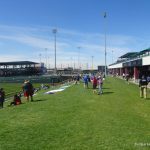 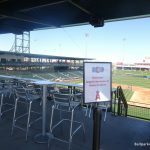 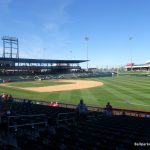 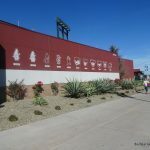 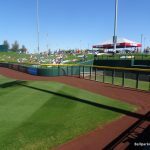 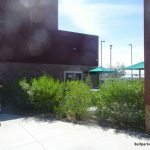 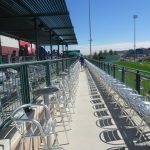 Before the 2010s, Cactus League parks were objectively better, and they mostly still are from a functional point of view. 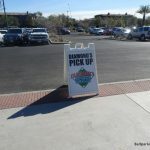 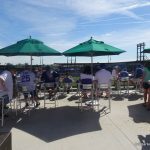 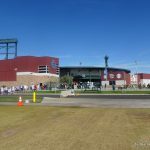 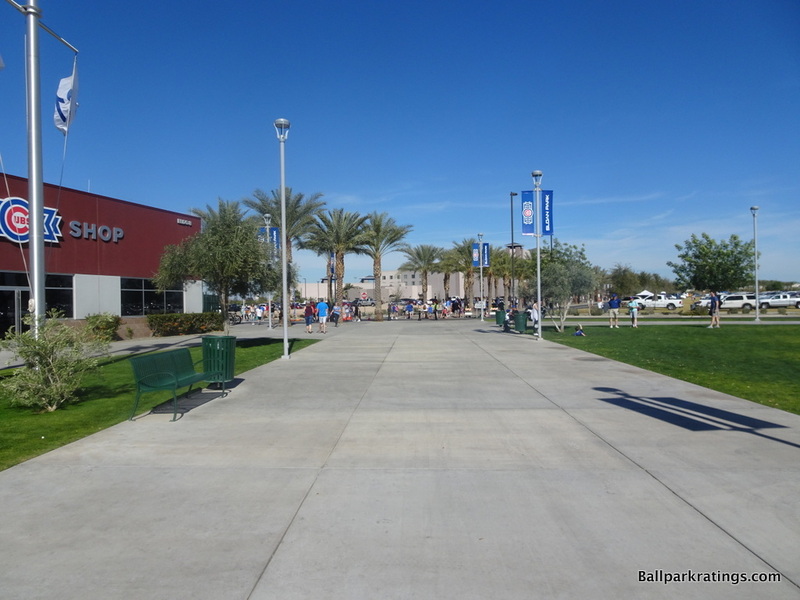 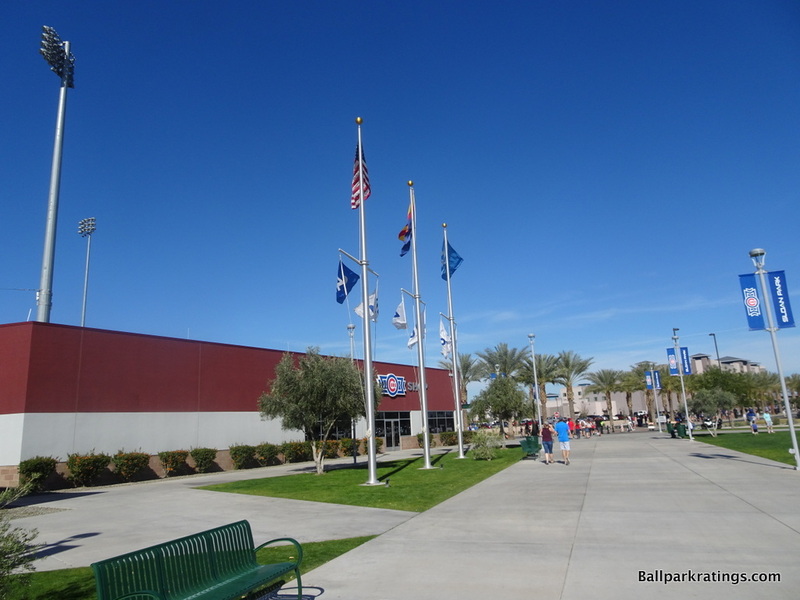 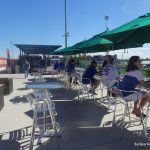 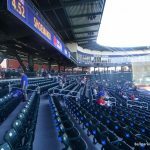 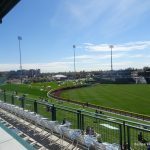 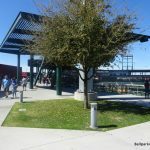 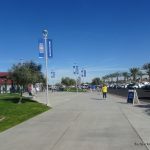 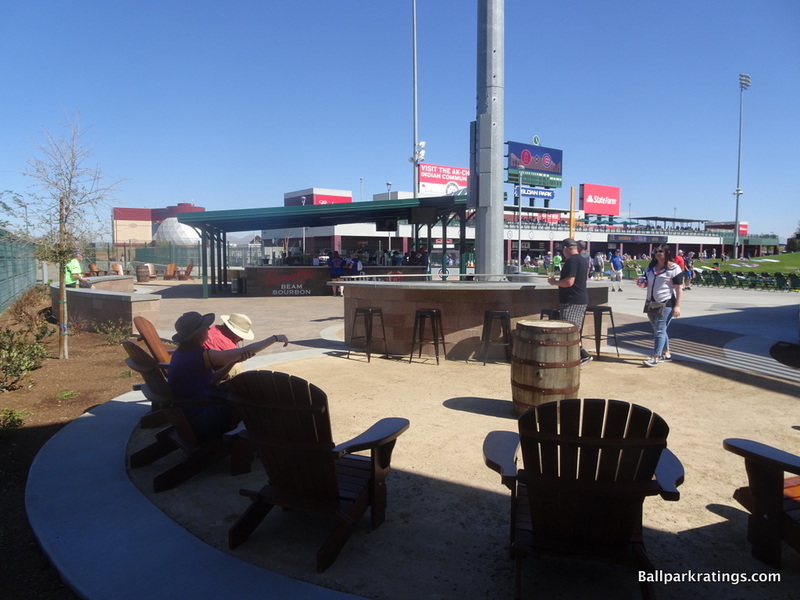 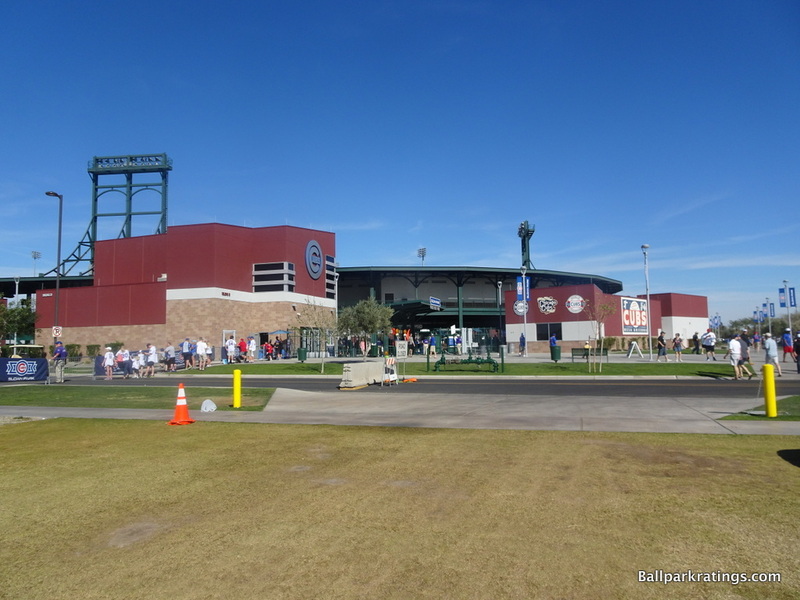 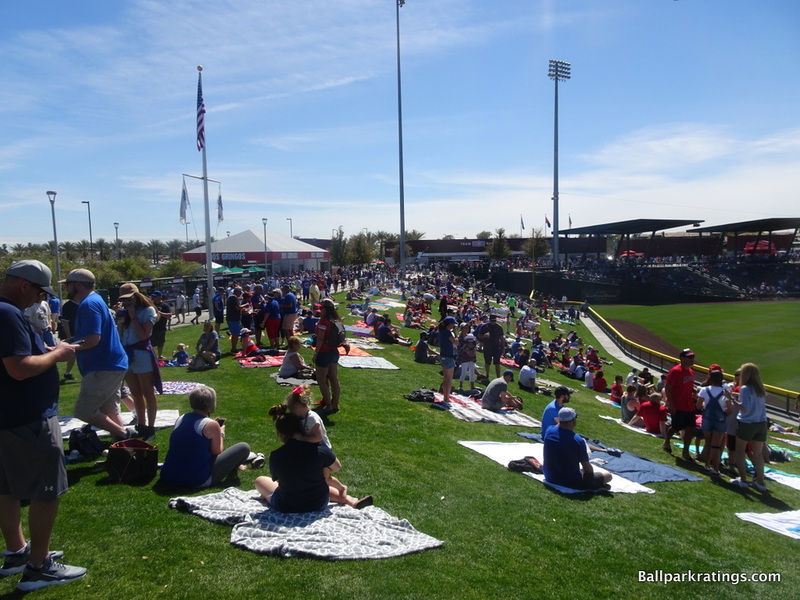 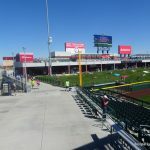 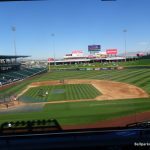 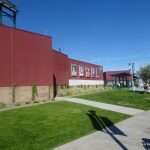 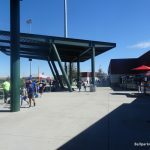 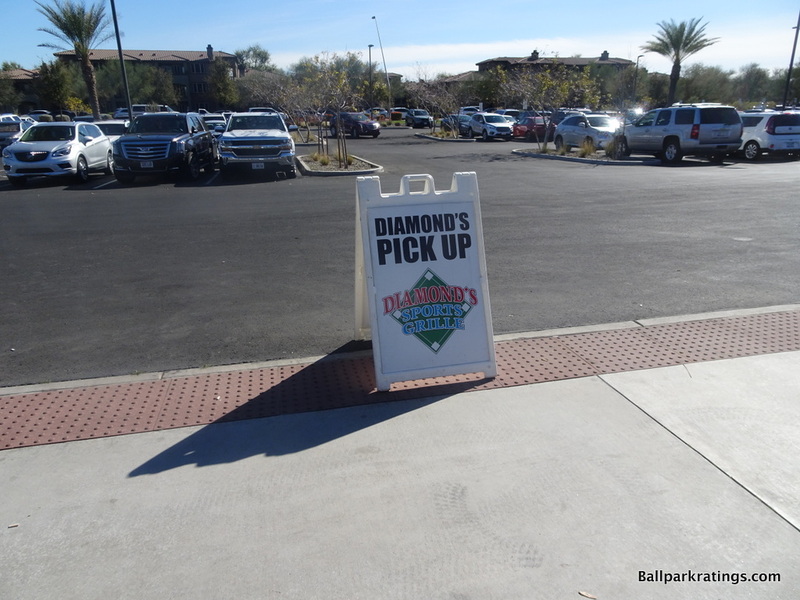 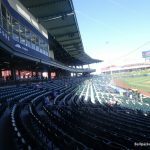 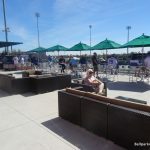 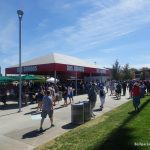 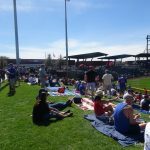 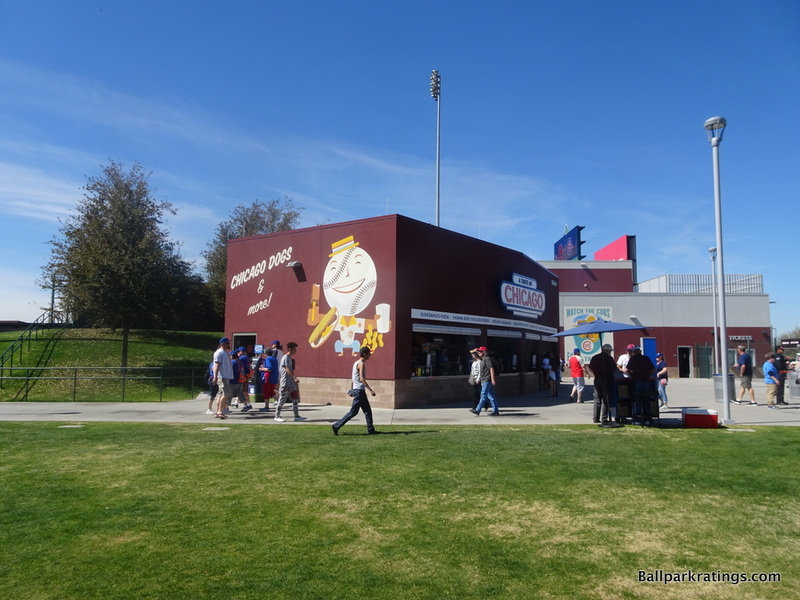 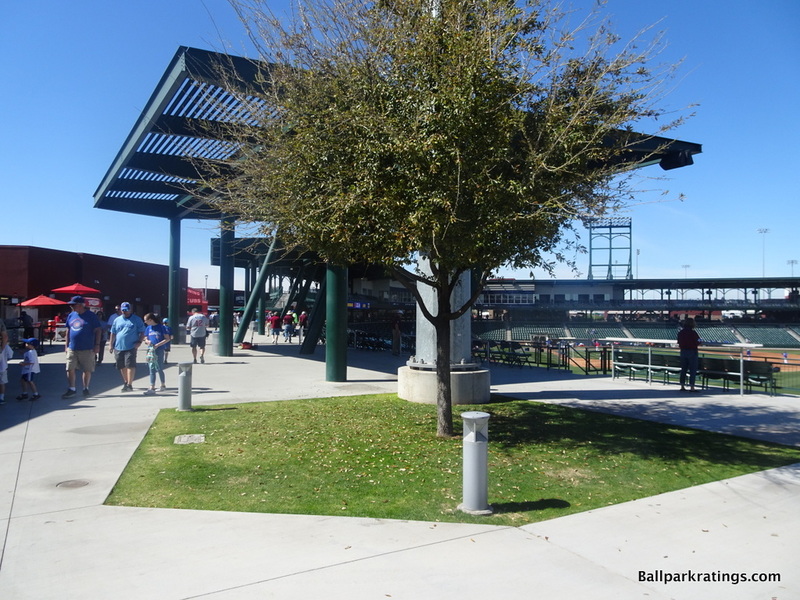 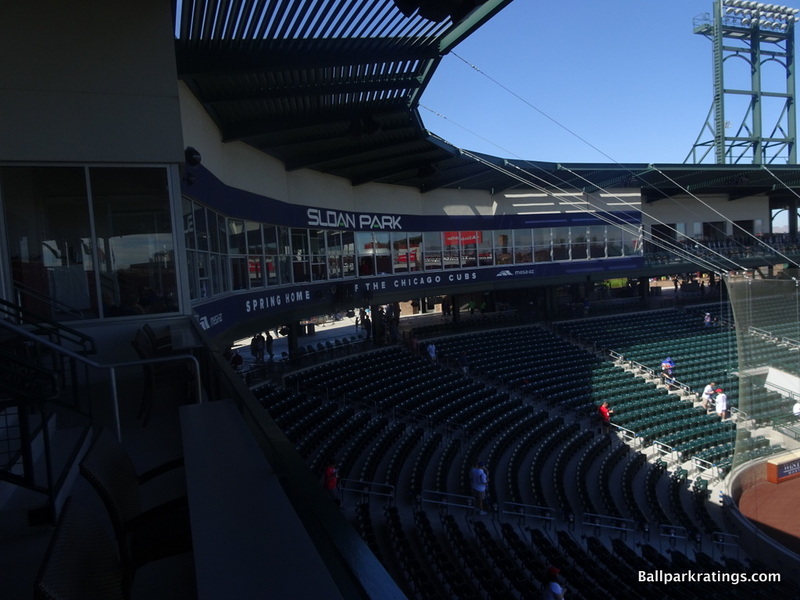 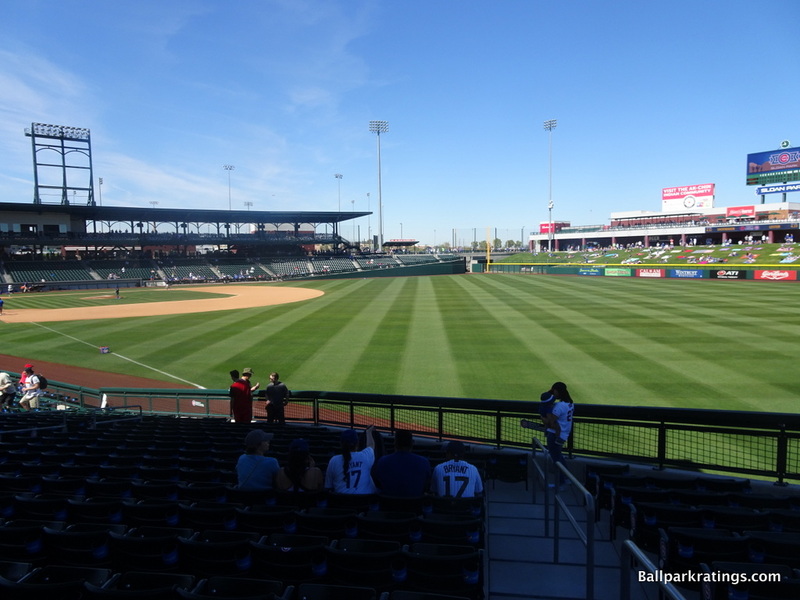 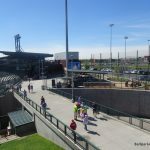 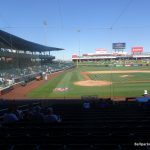 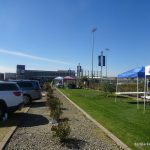 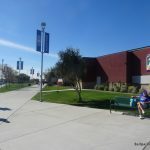 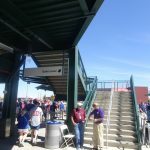 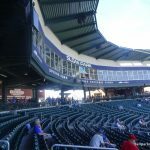 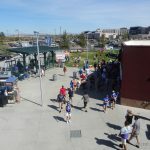 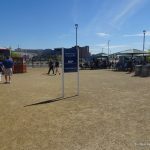 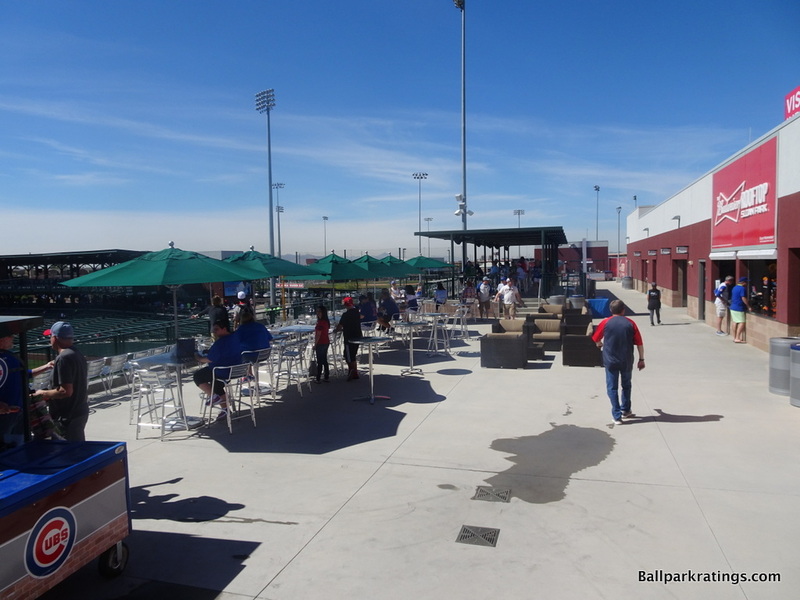 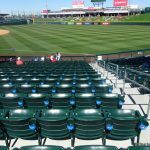 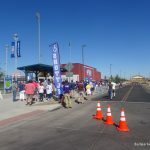 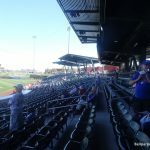 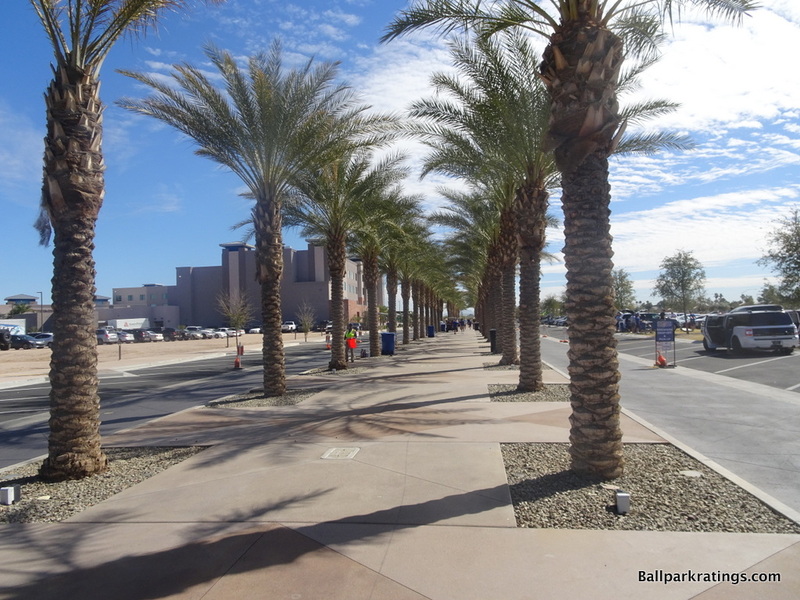 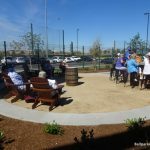 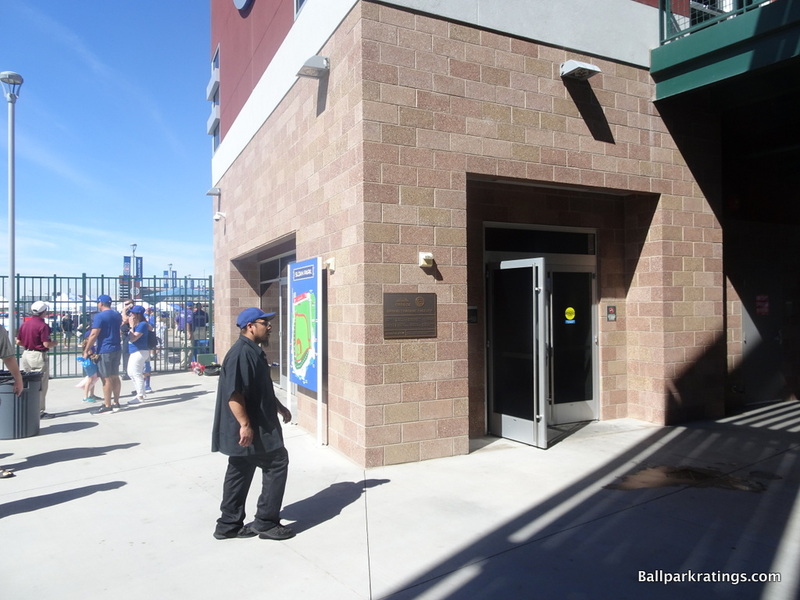 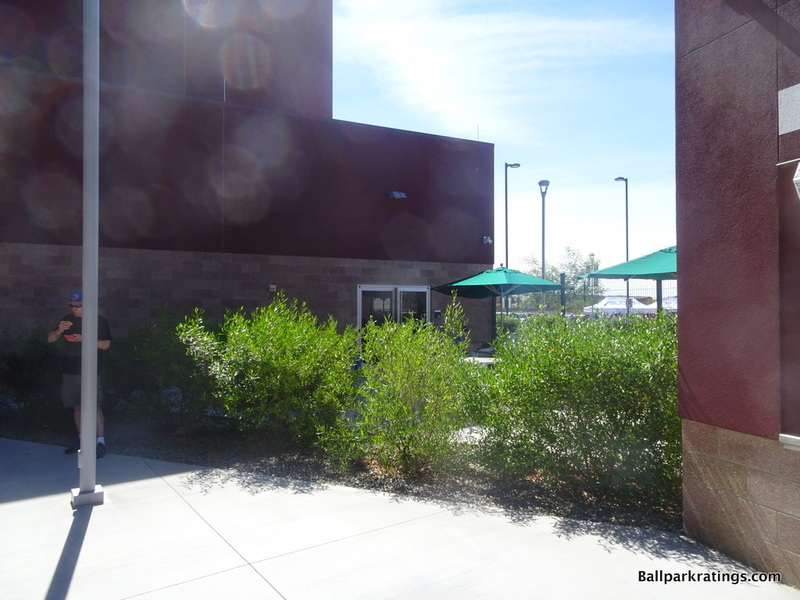 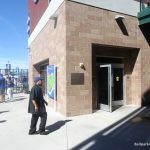 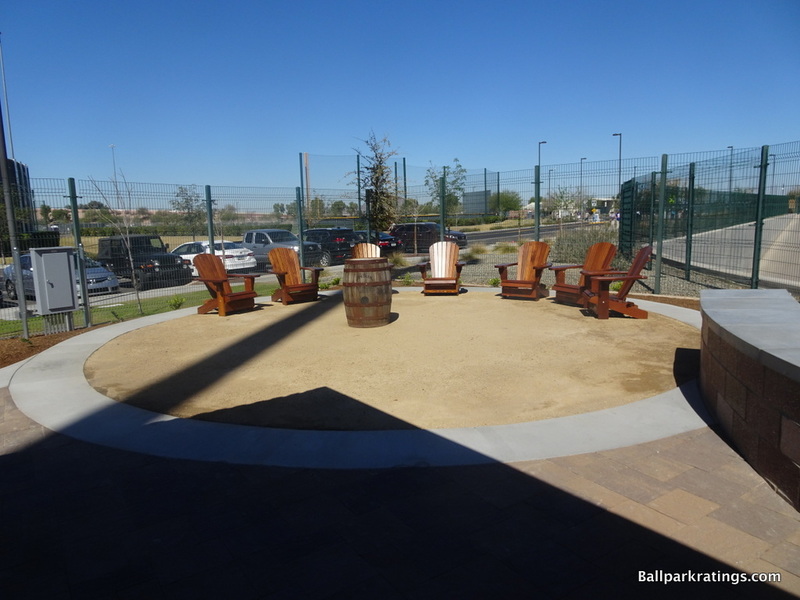 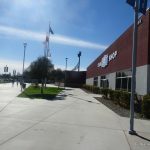 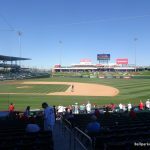 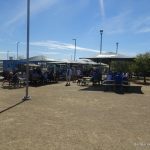 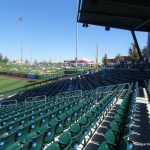 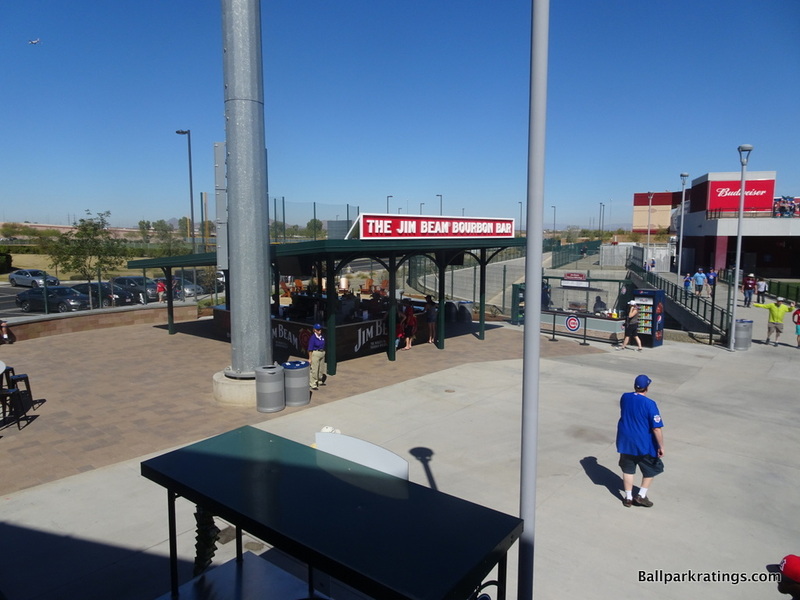 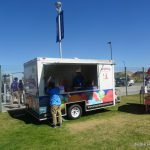 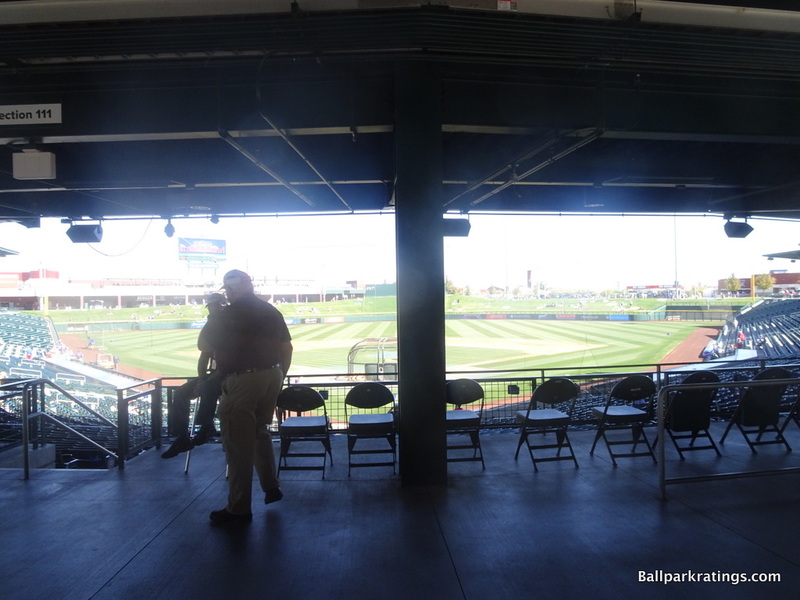 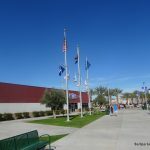 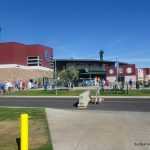 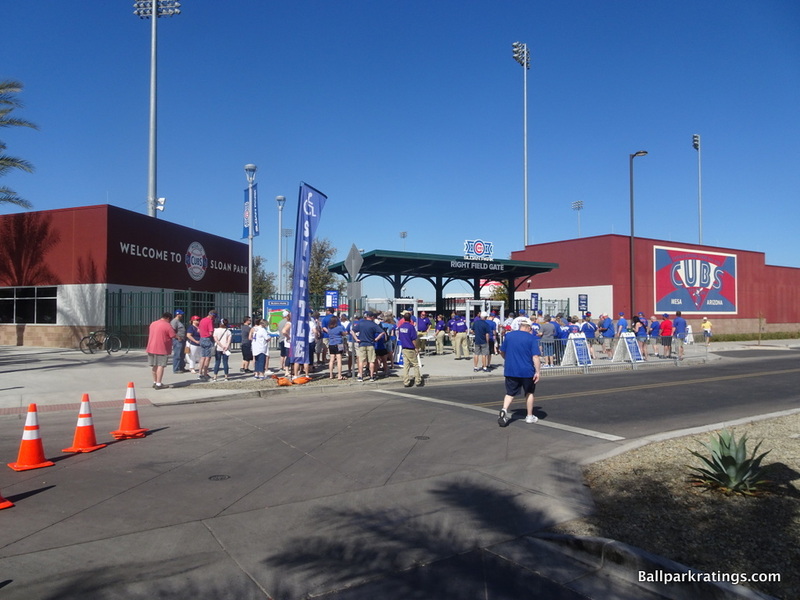 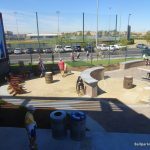 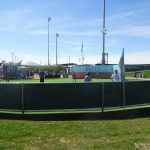 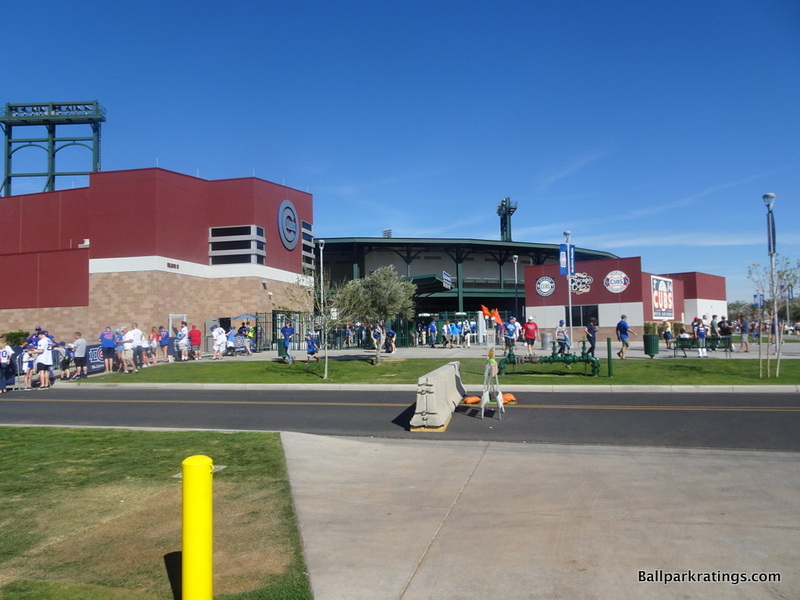 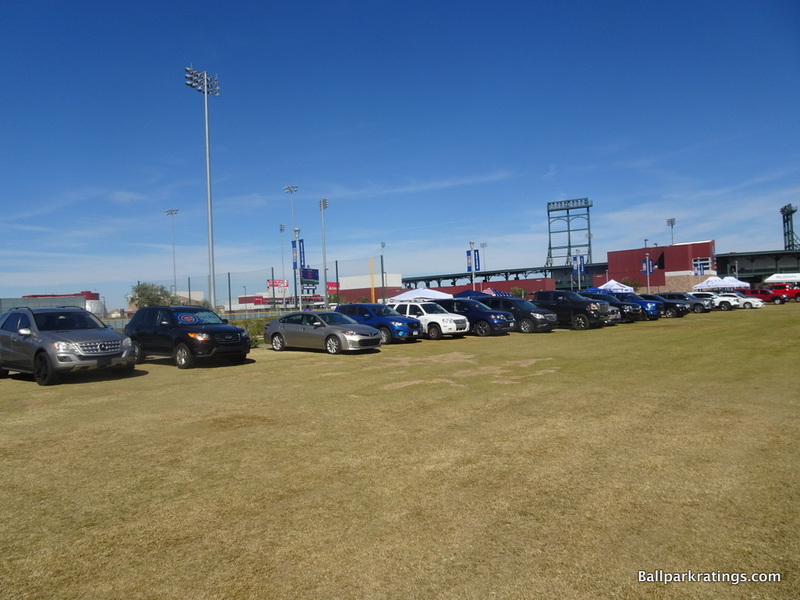 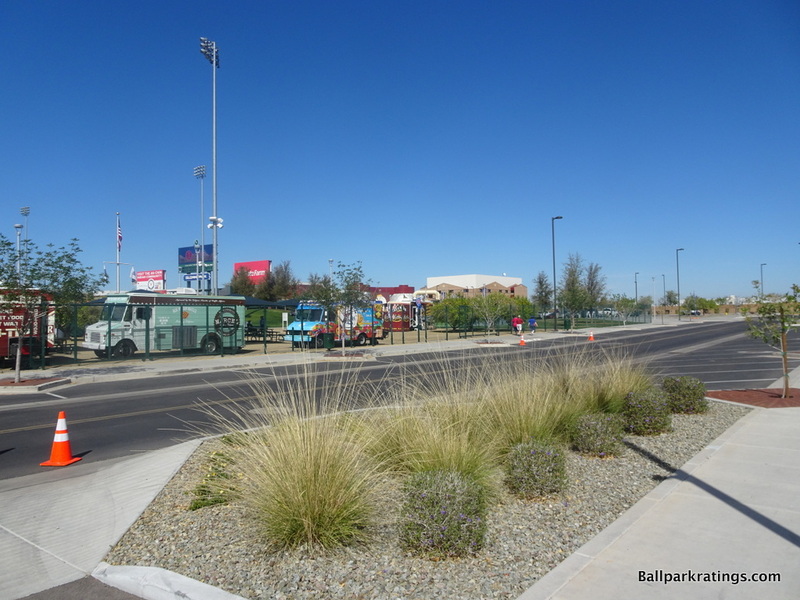 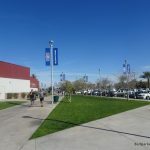 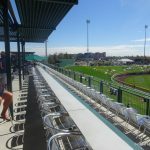 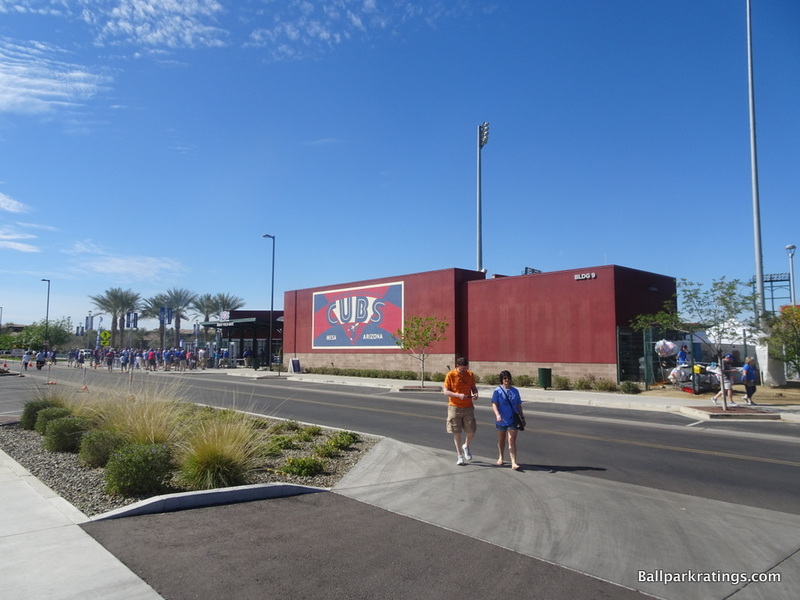 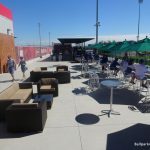 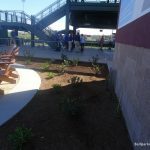 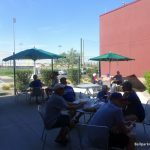 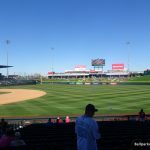 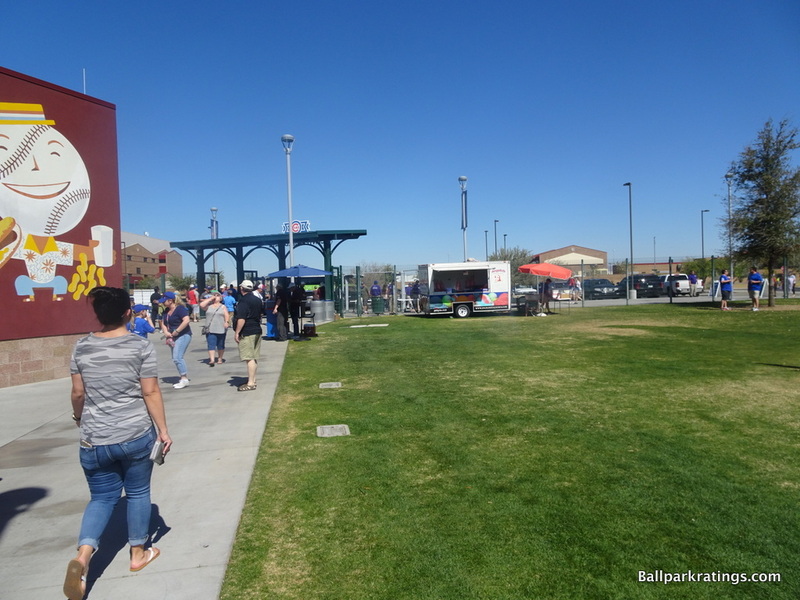 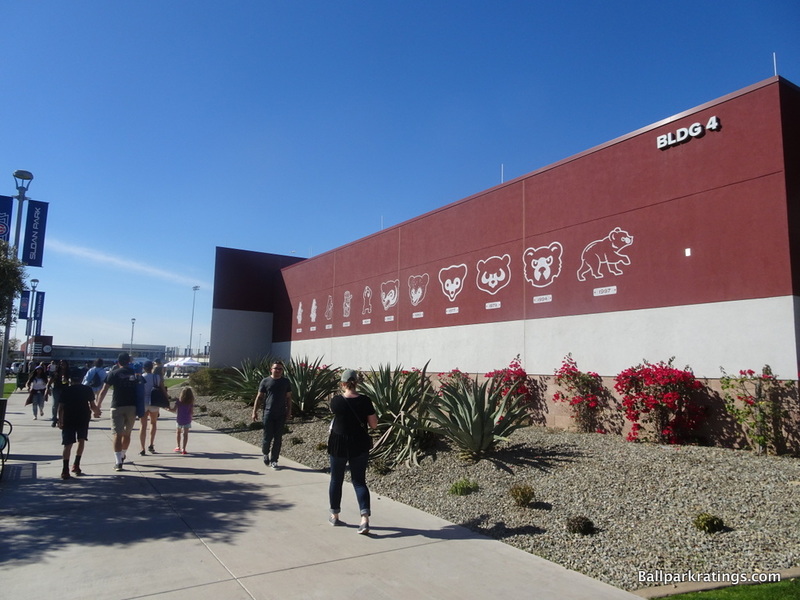 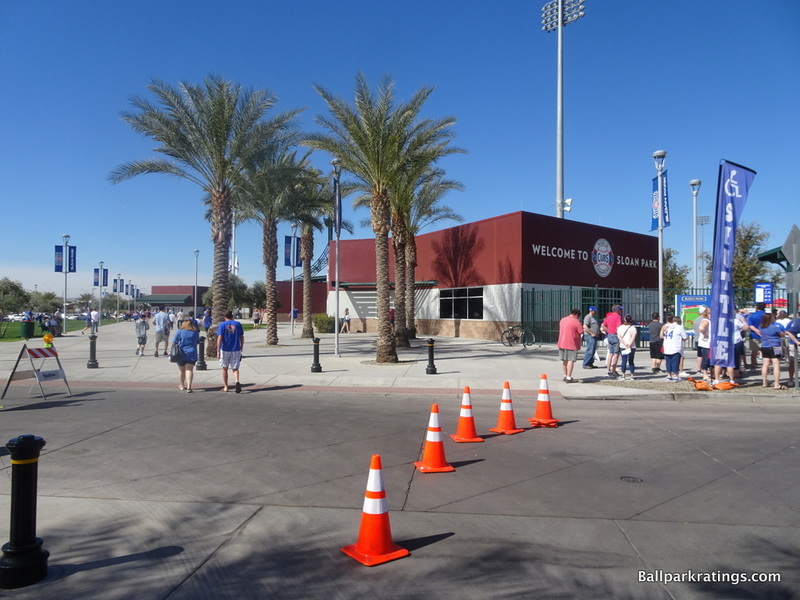 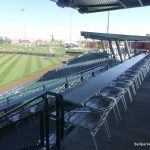 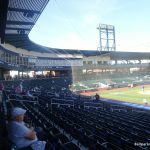 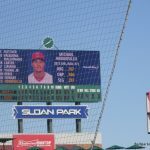 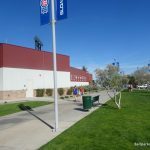 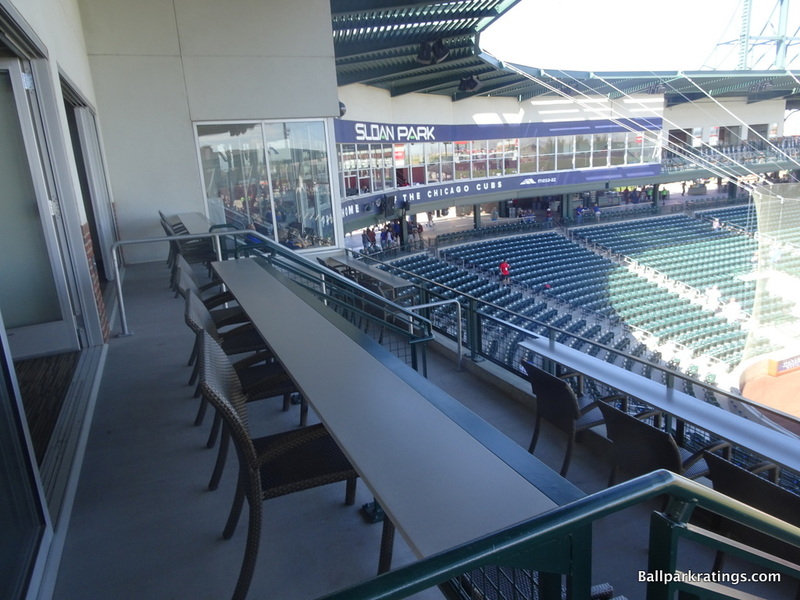 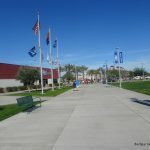 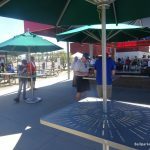 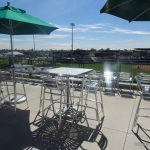 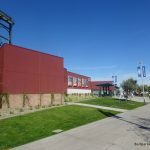 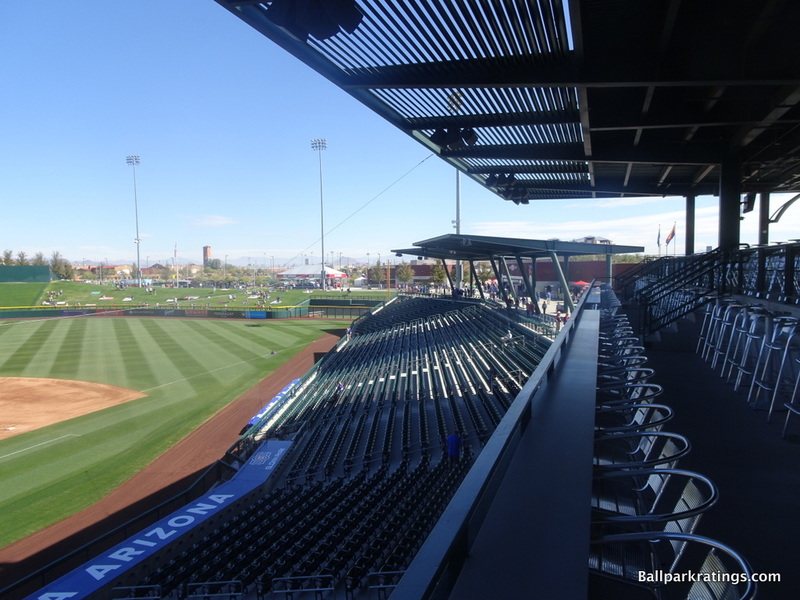 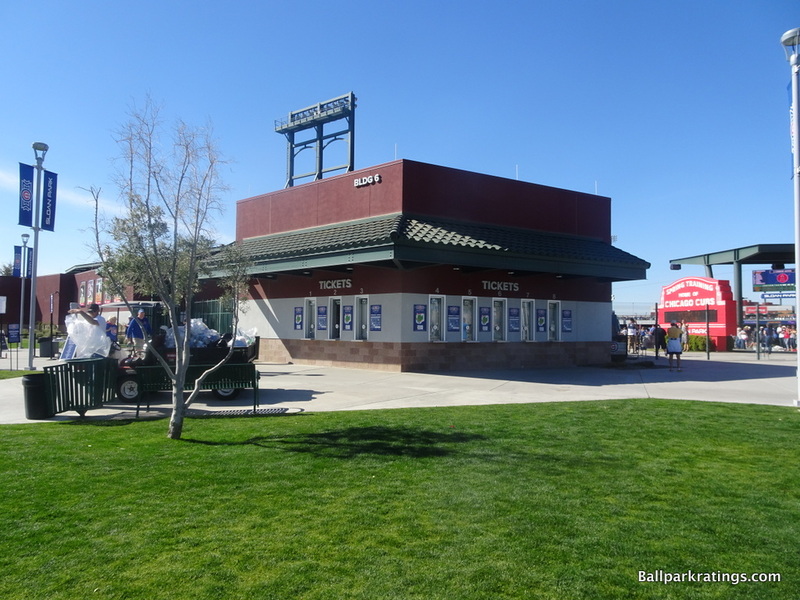 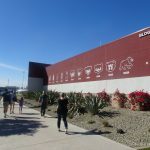 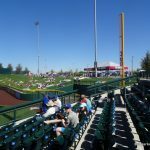 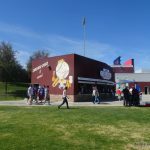 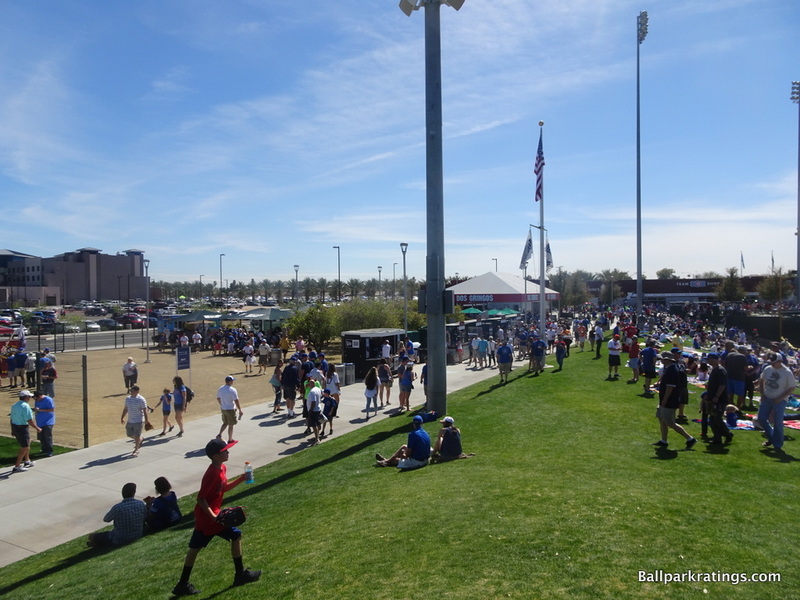 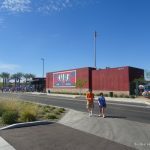 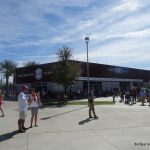 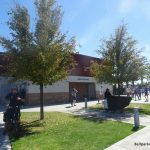 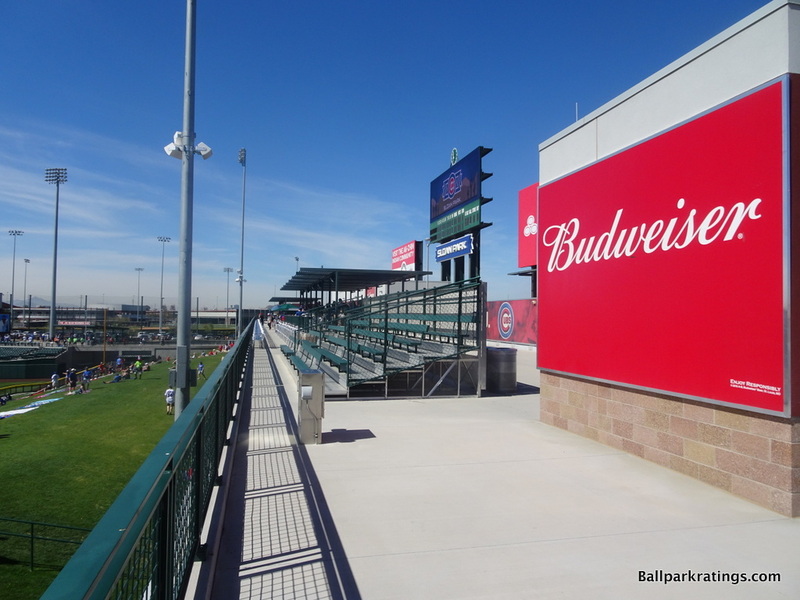 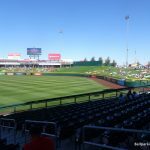 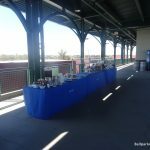 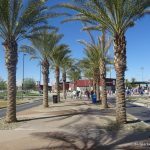 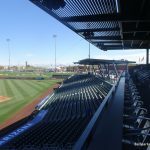 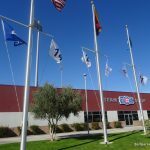 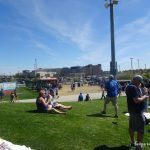 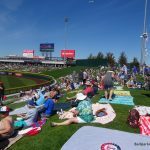 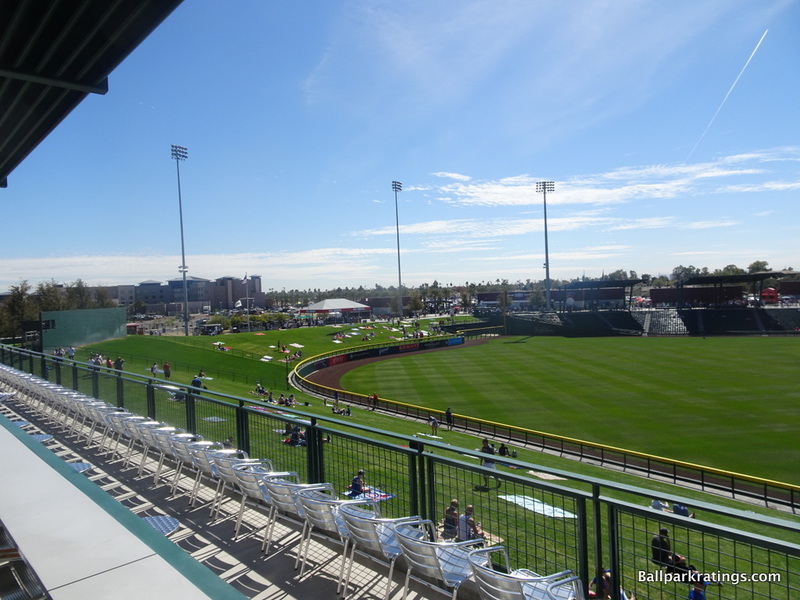 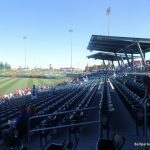 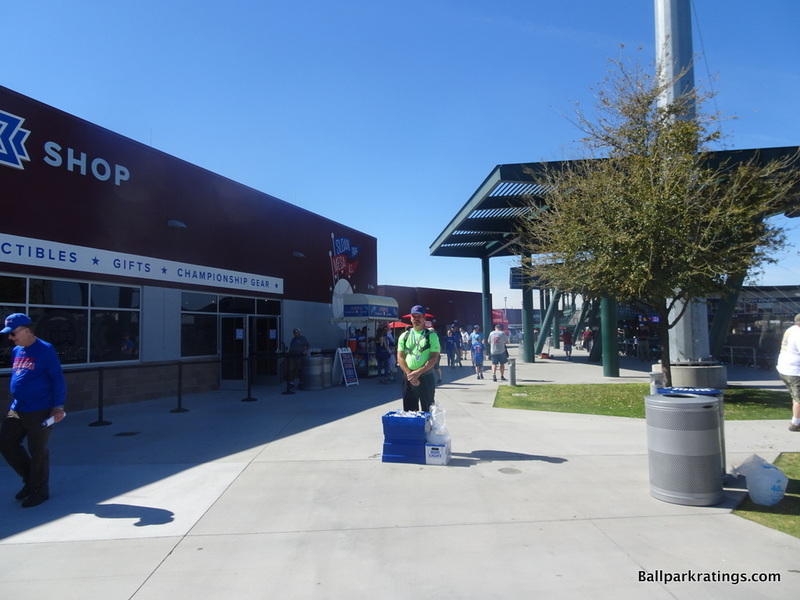 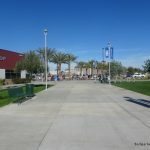 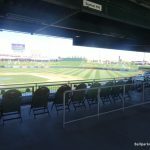 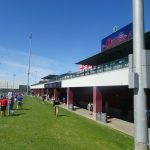 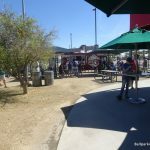 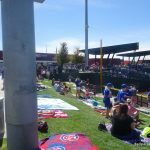 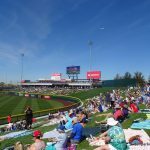 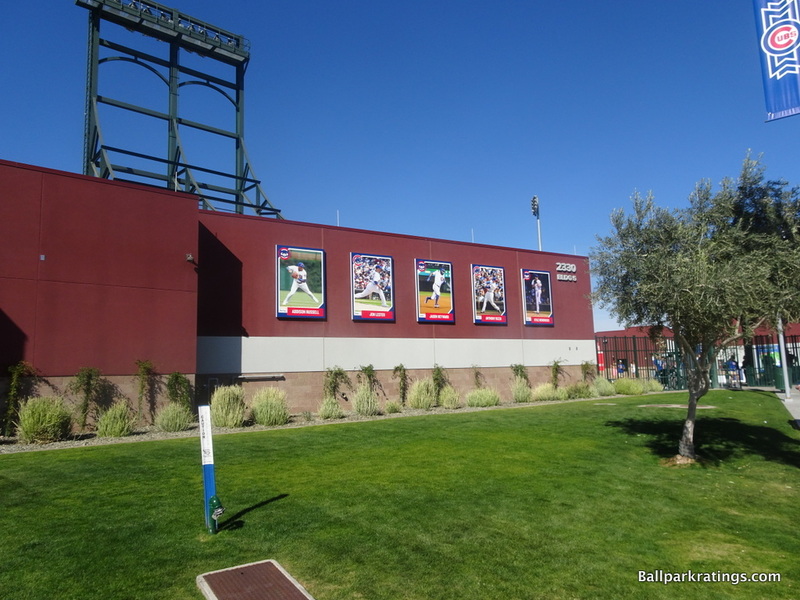 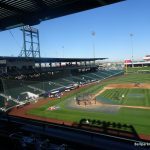 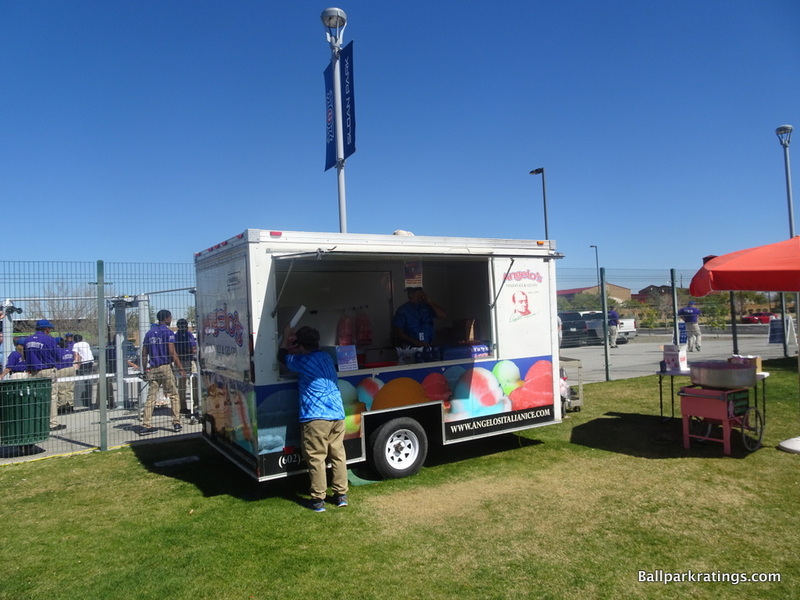 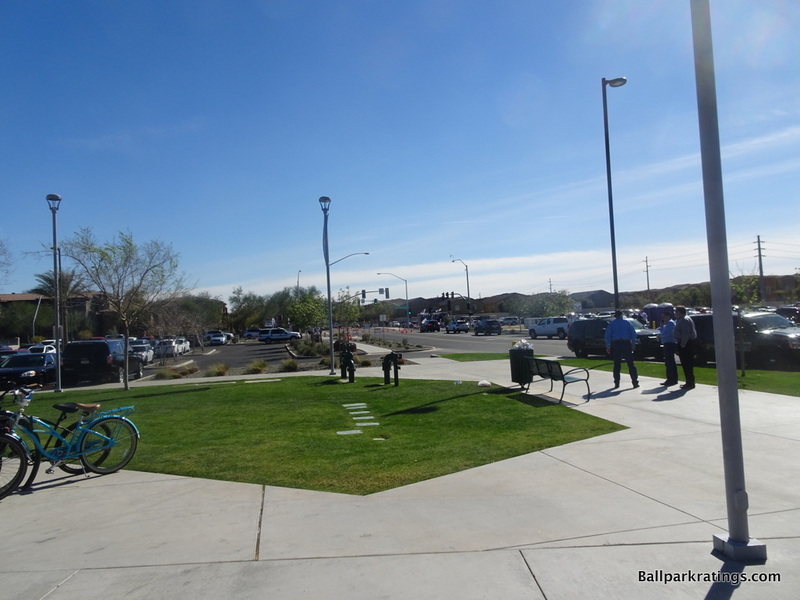 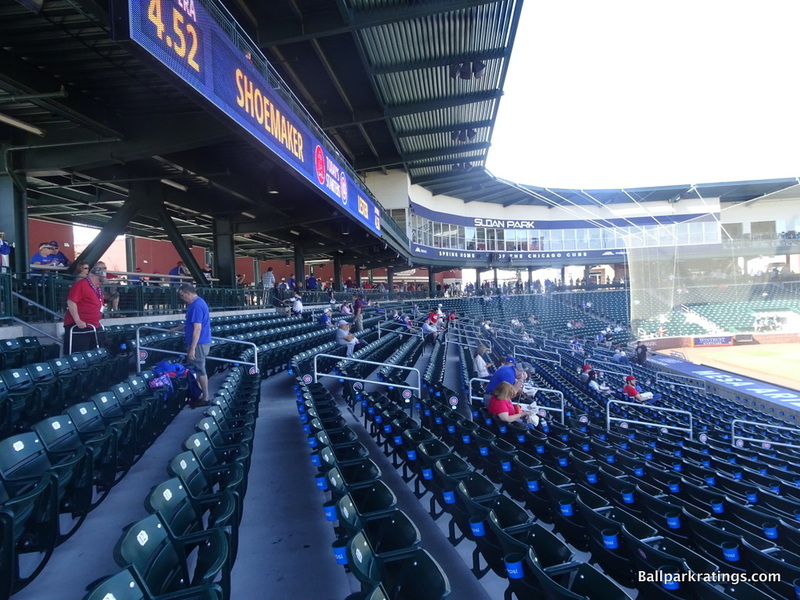 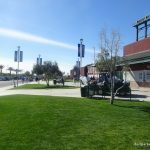 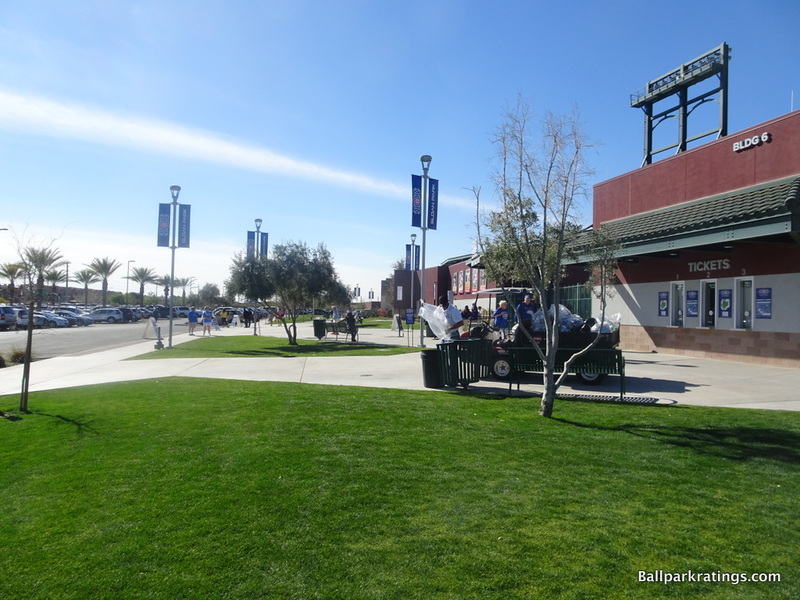 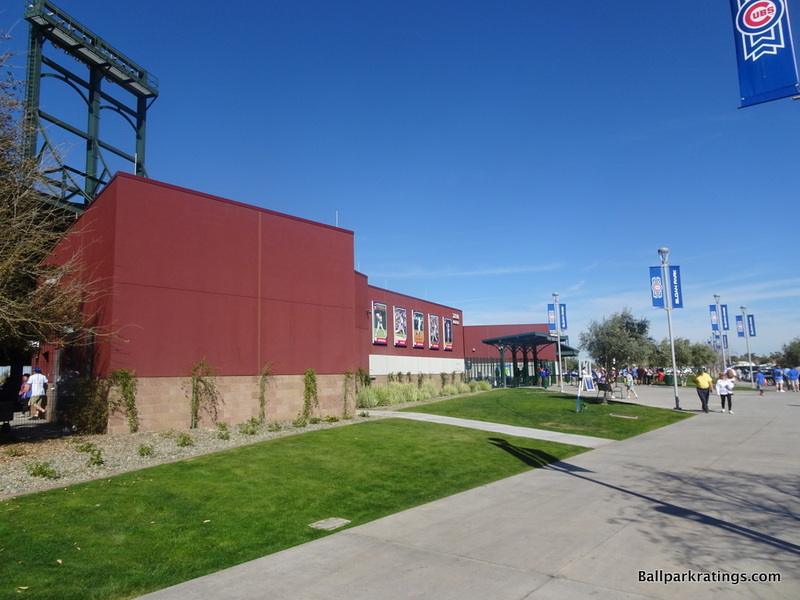 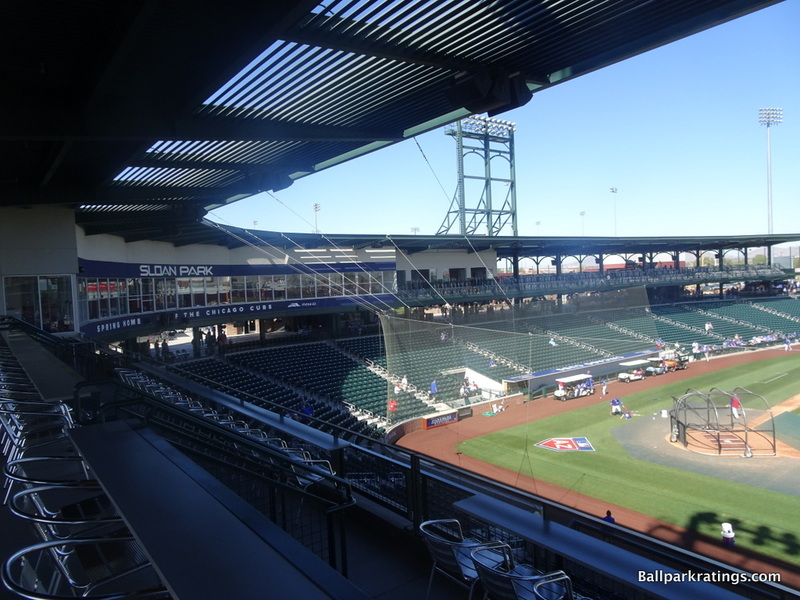 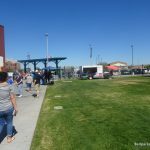 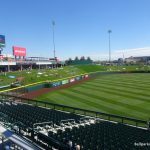 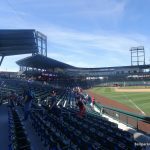 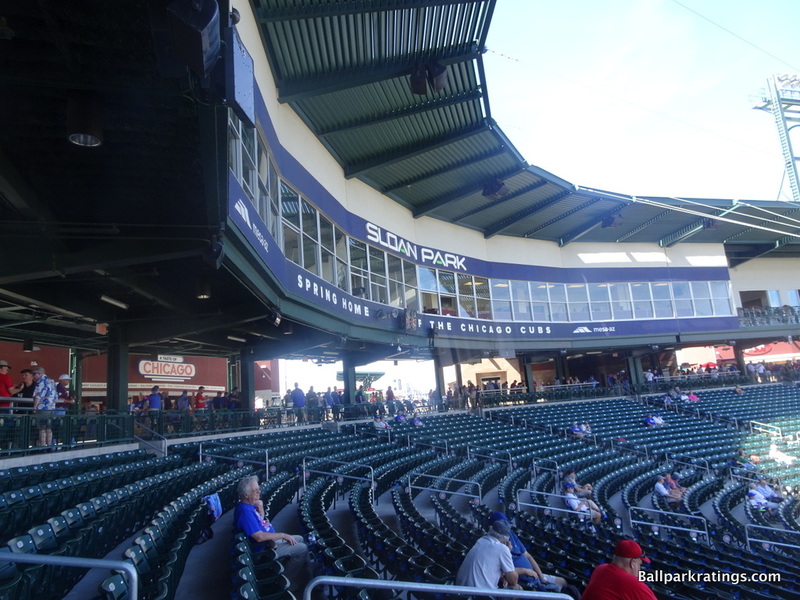 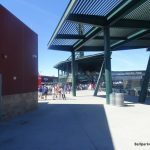 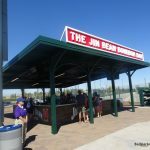 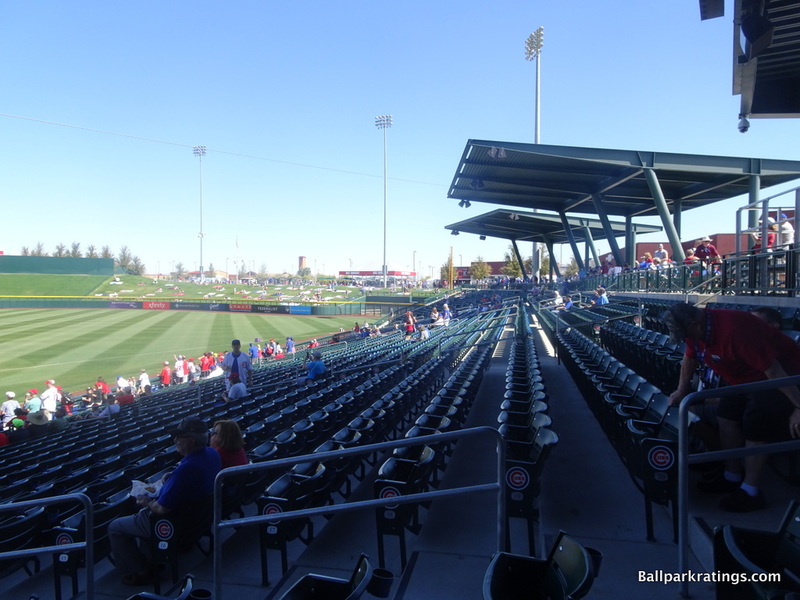 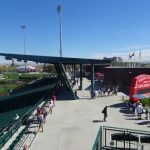 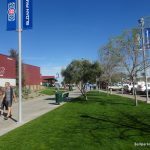 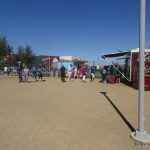 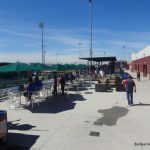 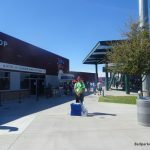 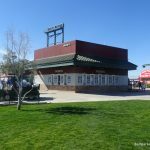 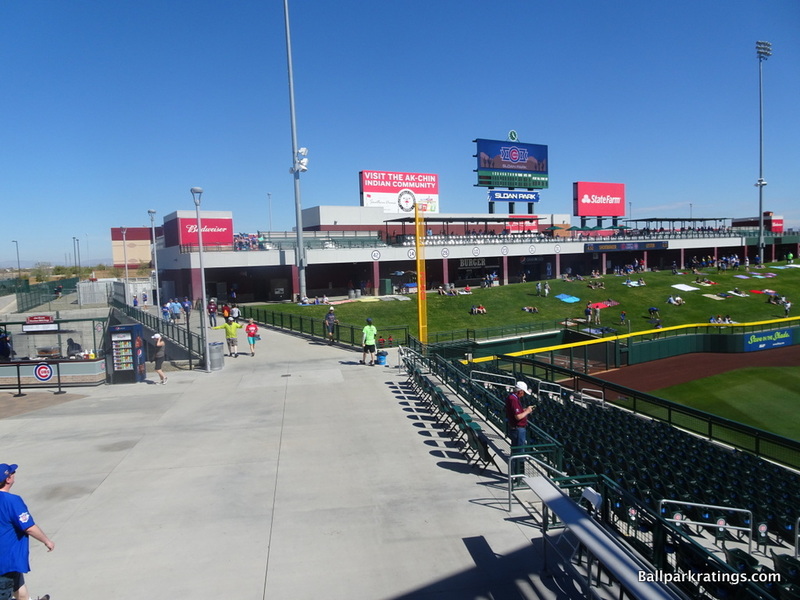 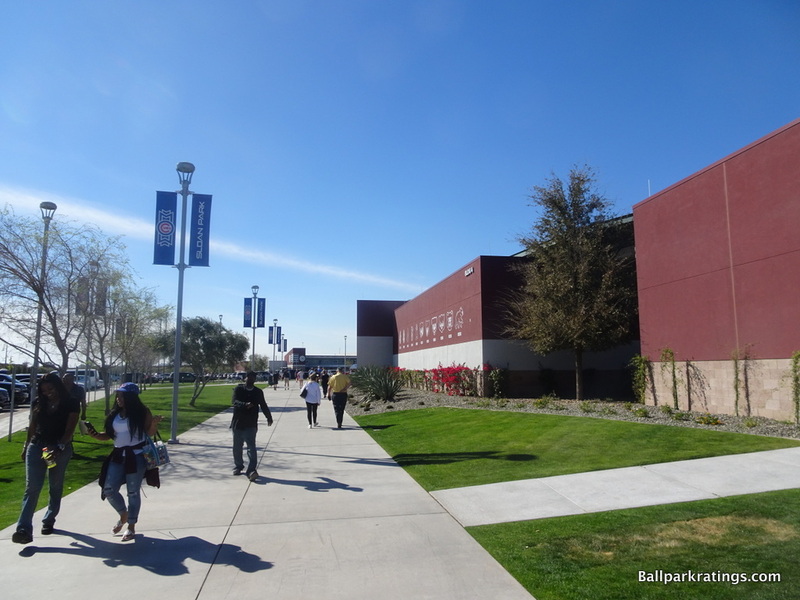 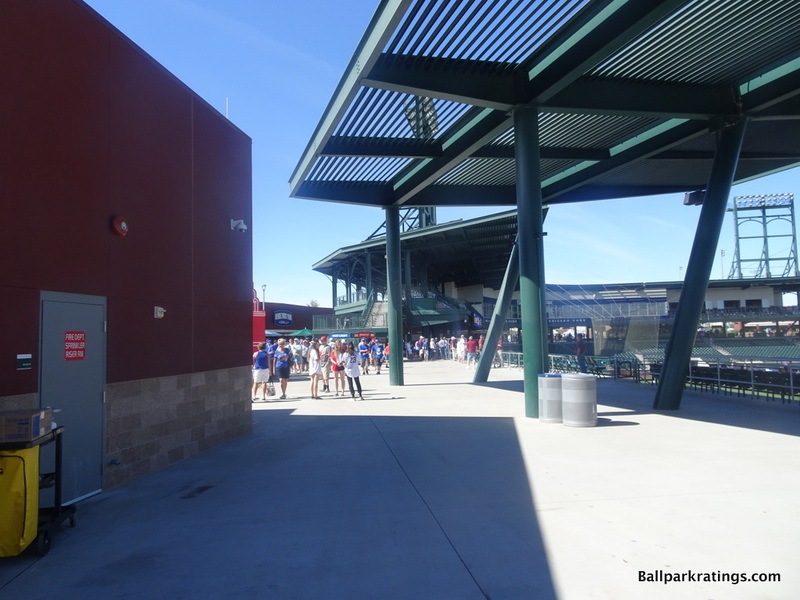 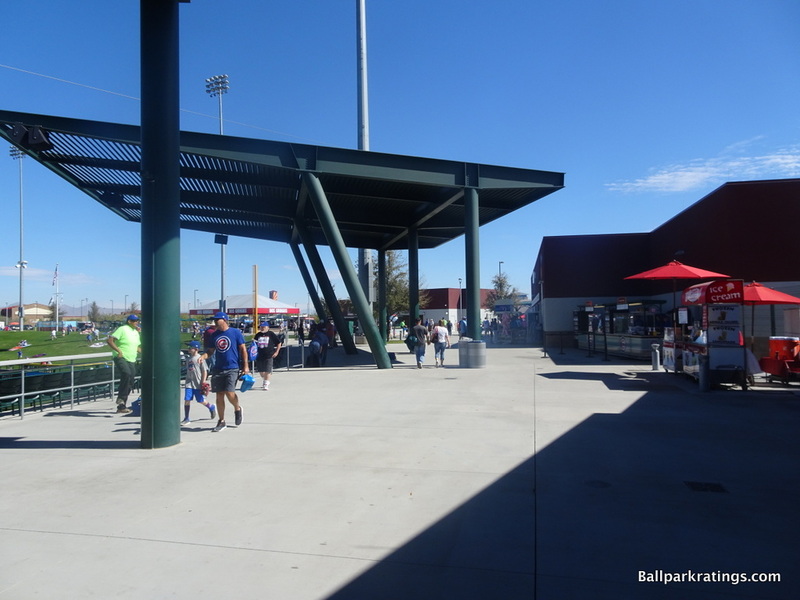 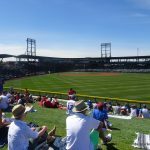 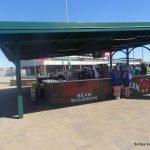 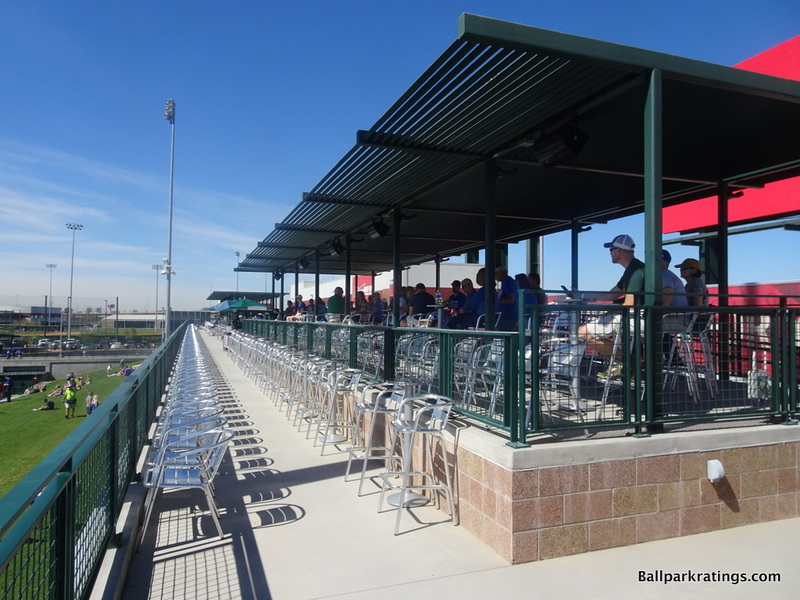 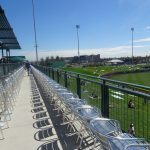 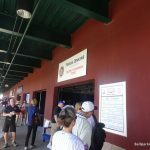 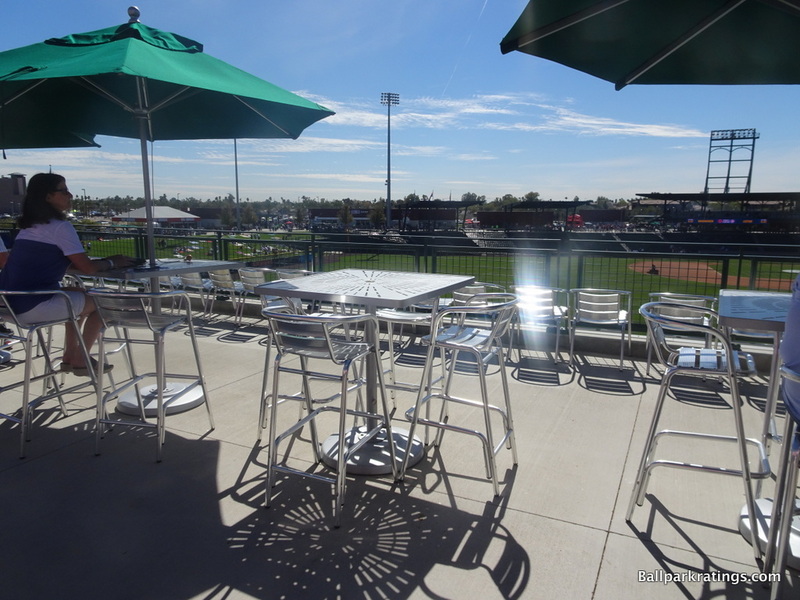 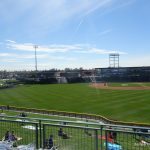 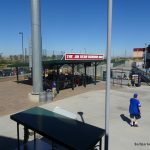 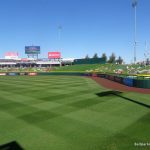 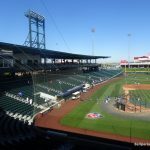 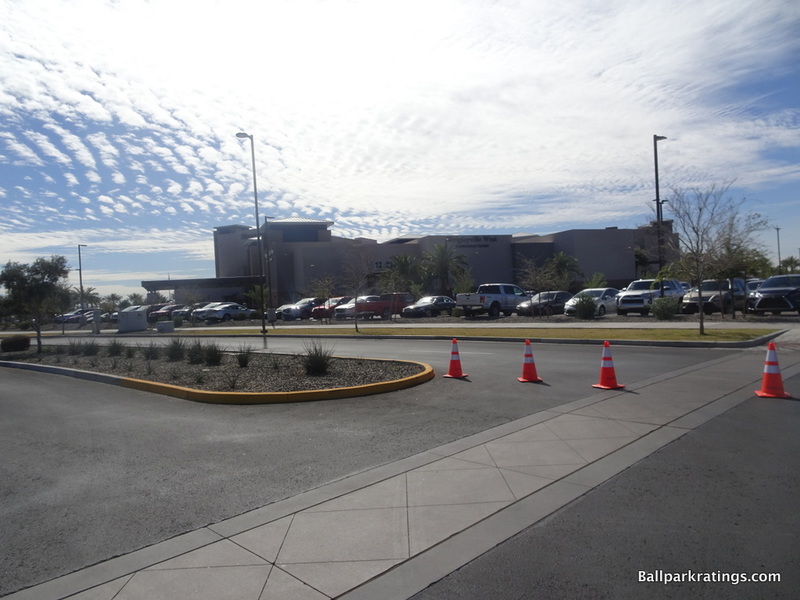 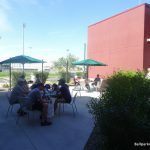 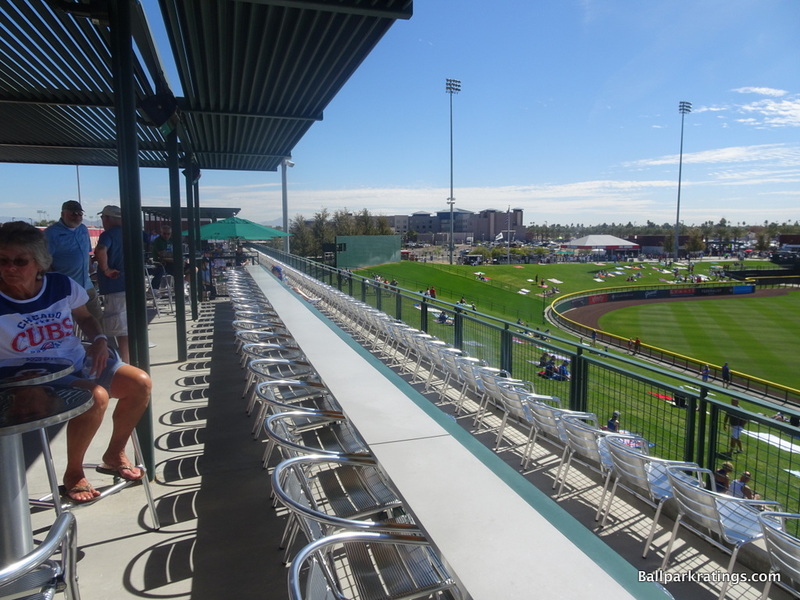 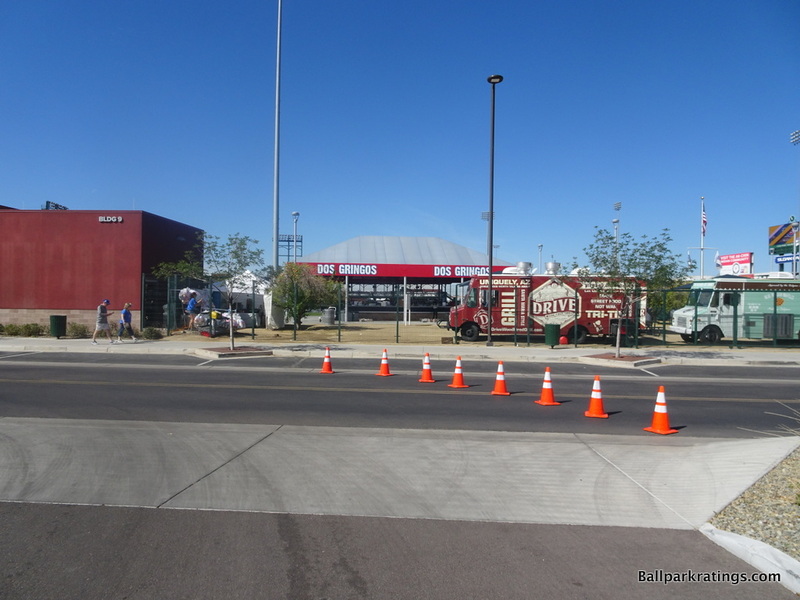 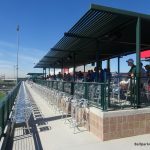 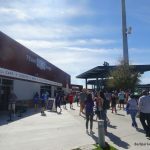 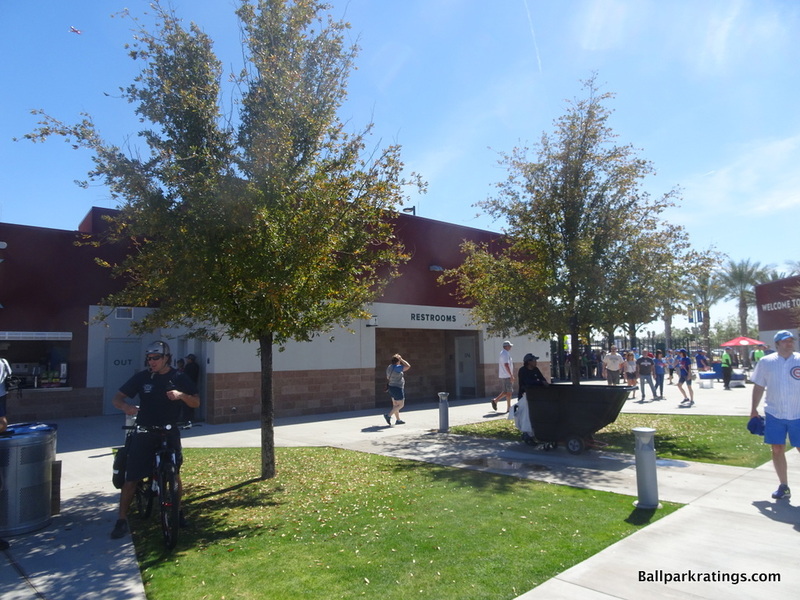 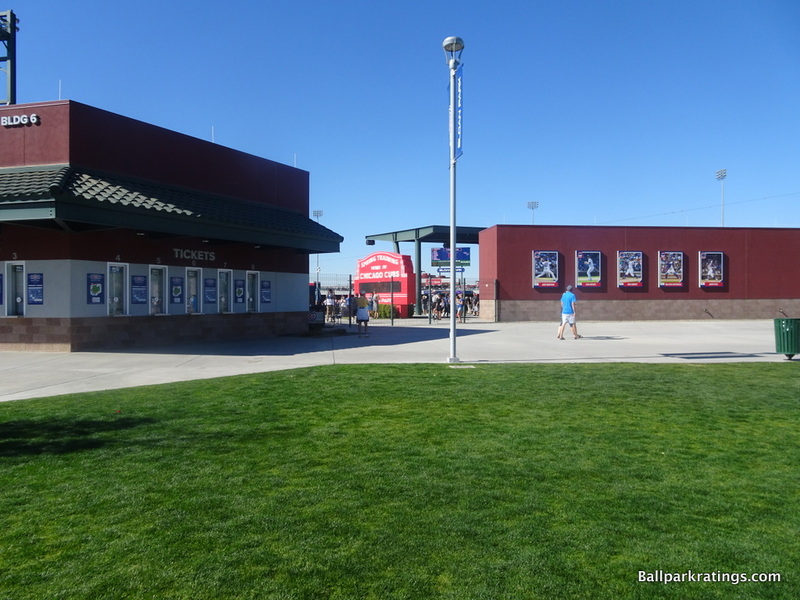 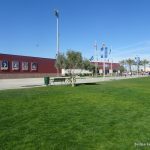 Sloan Park is the first new spring venue to take the team character and historical charm traditionally seen in the Grapefruit League and combine it with the superior functionality and amenities often seen in the Cactus League. 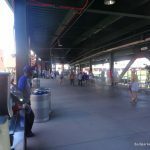 The result is one of the top ballpark experiences in America. 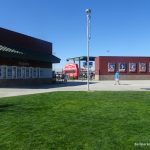 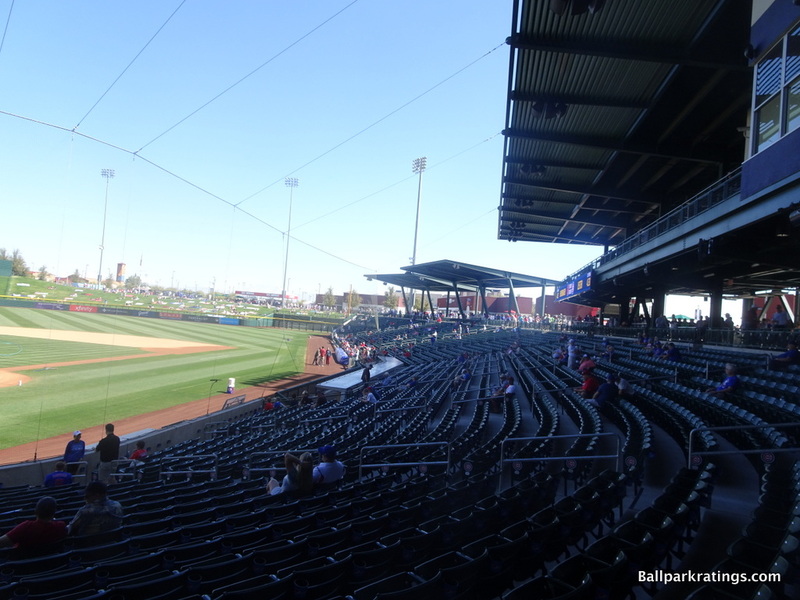 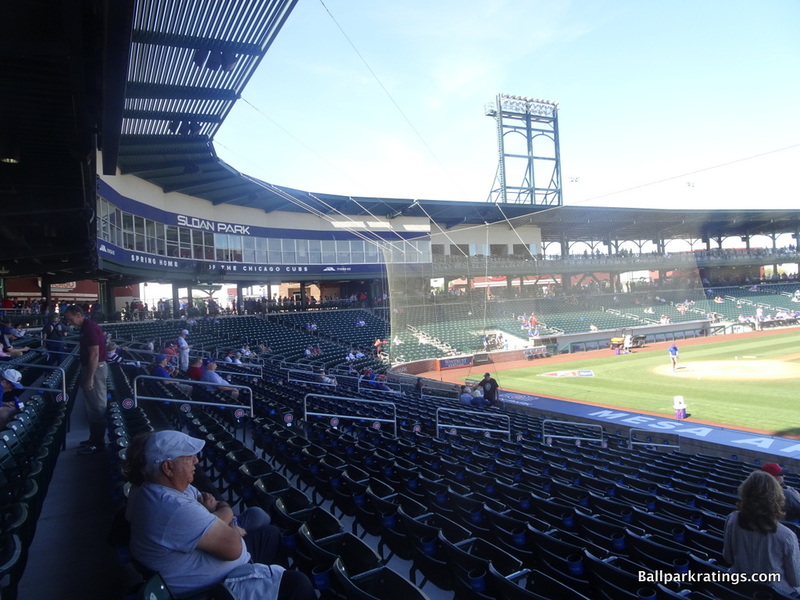 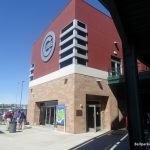 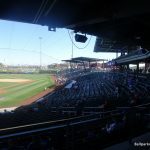 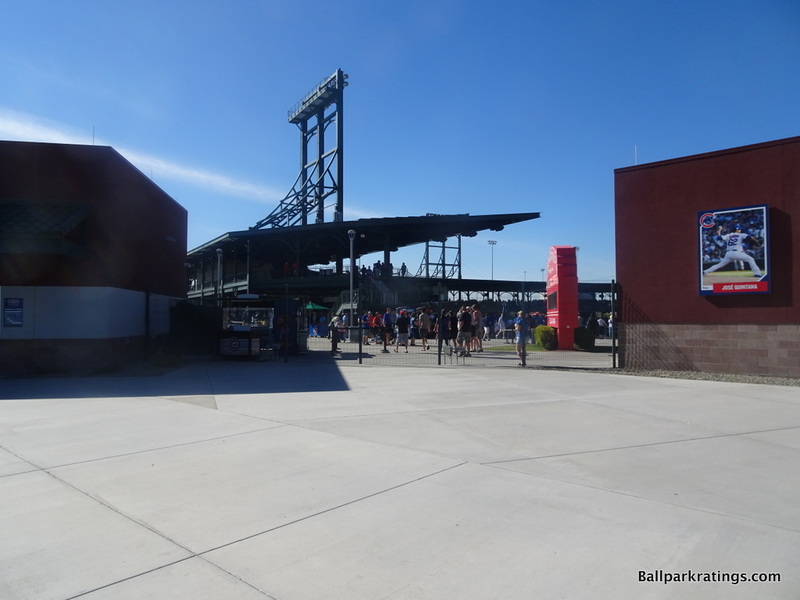 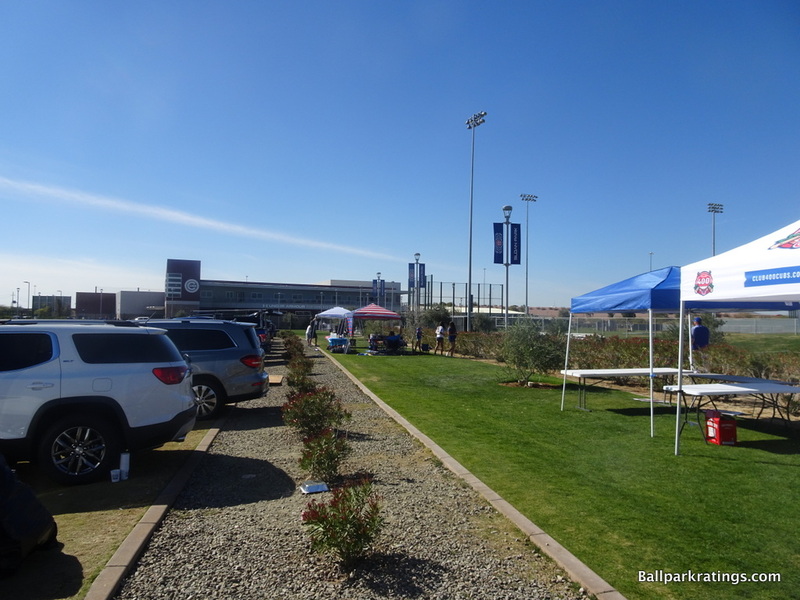 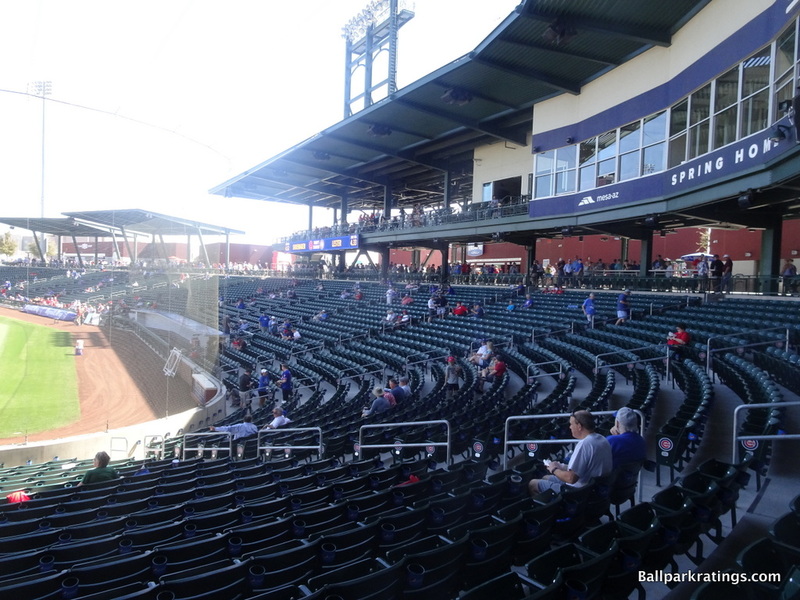 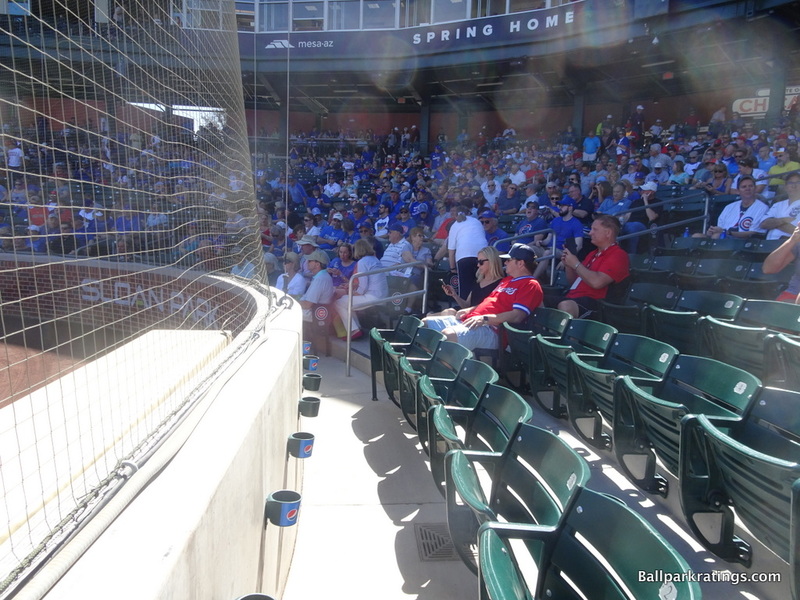 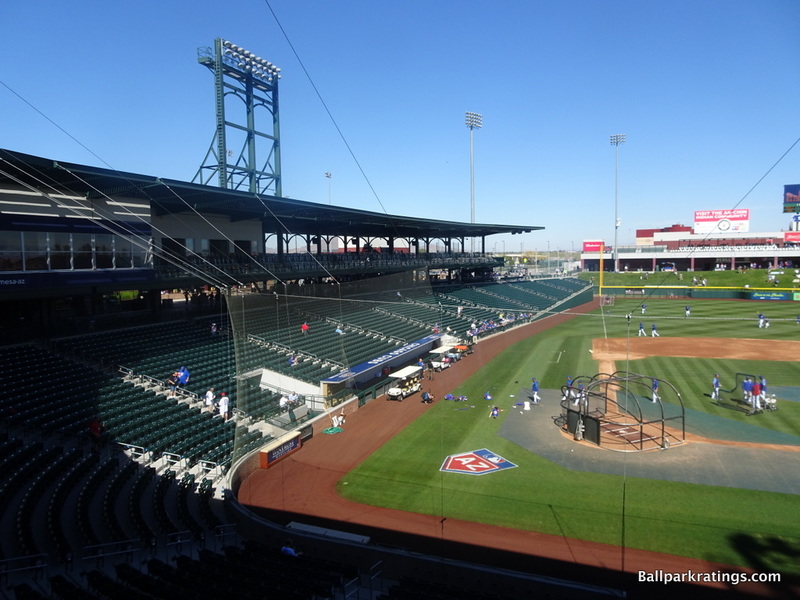 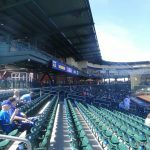 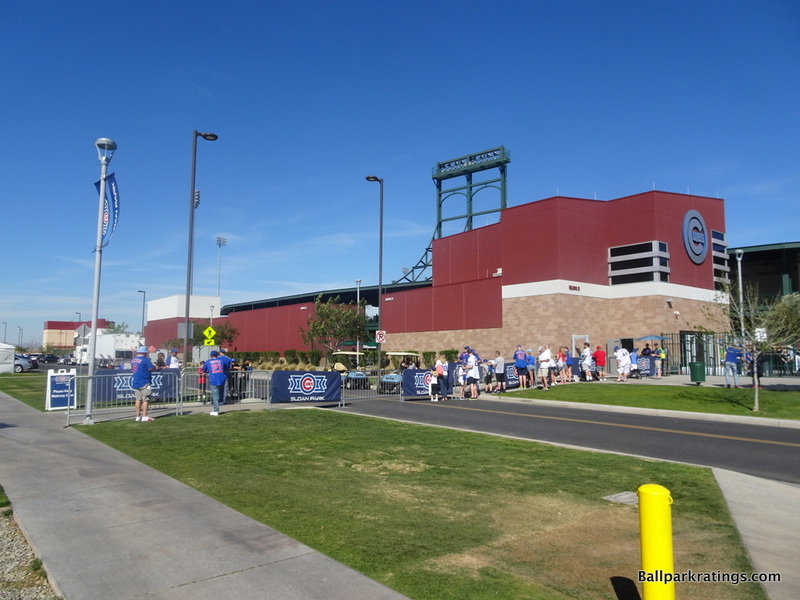 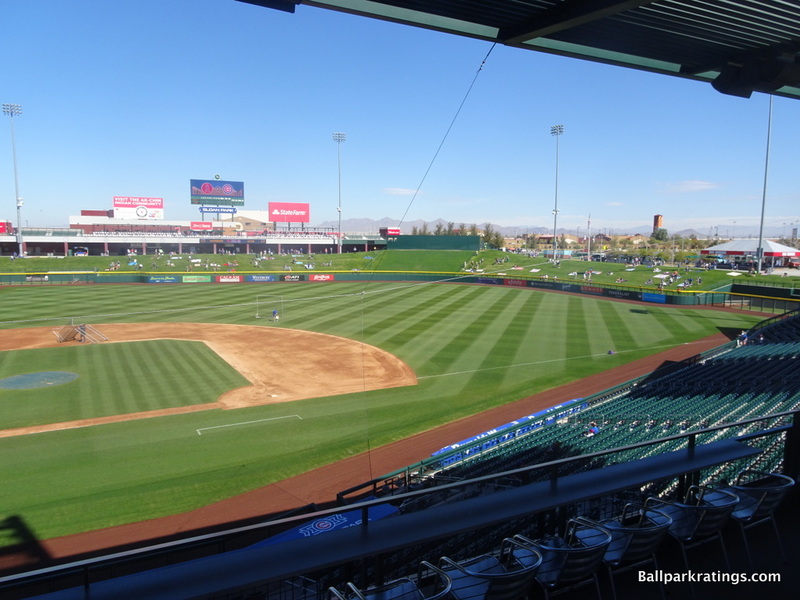 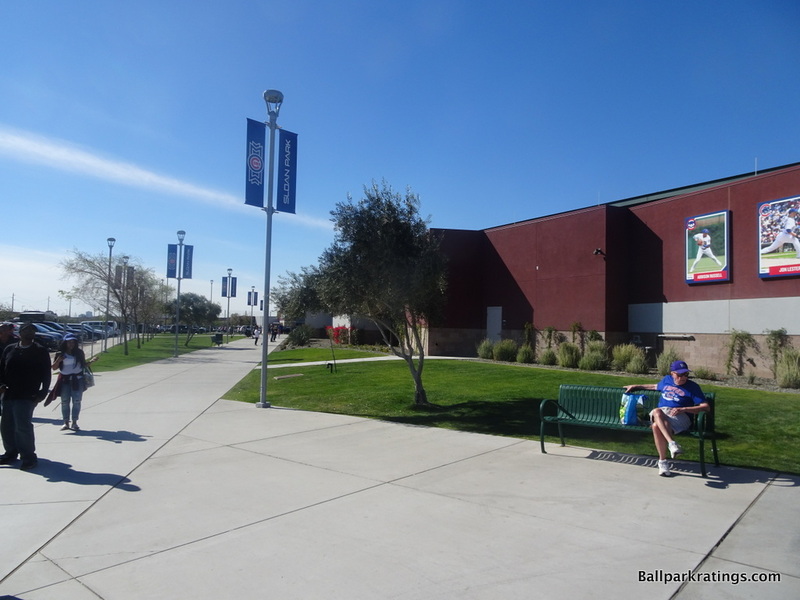 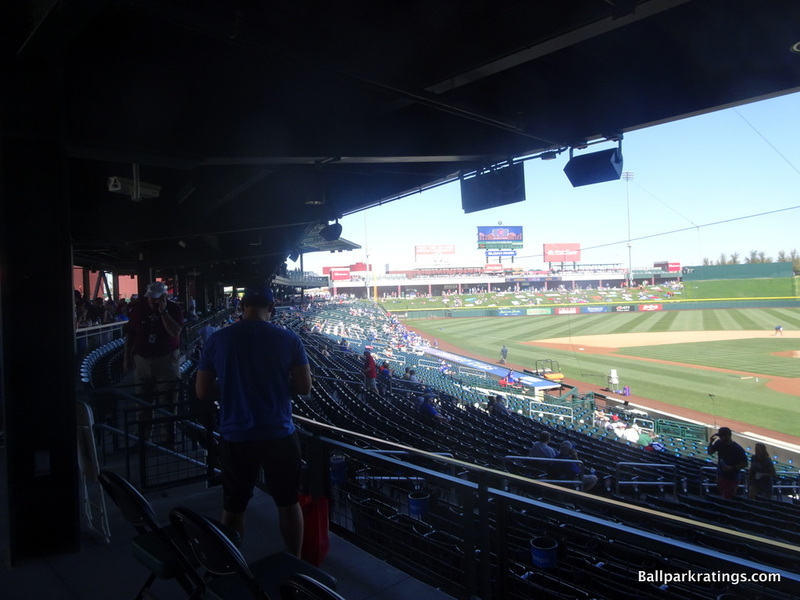 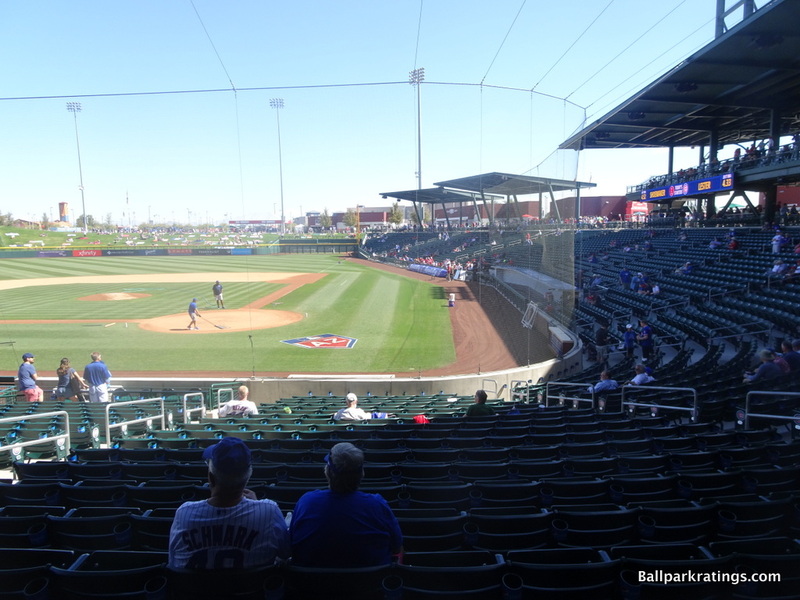 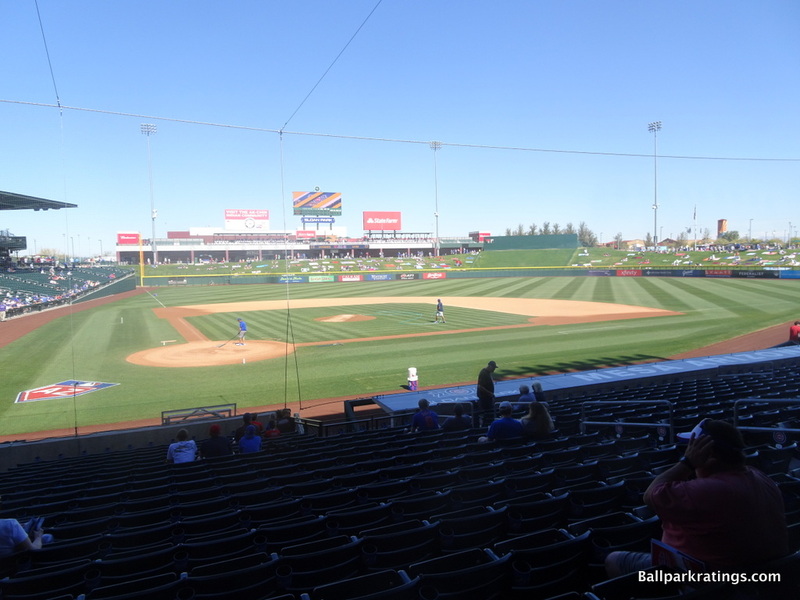 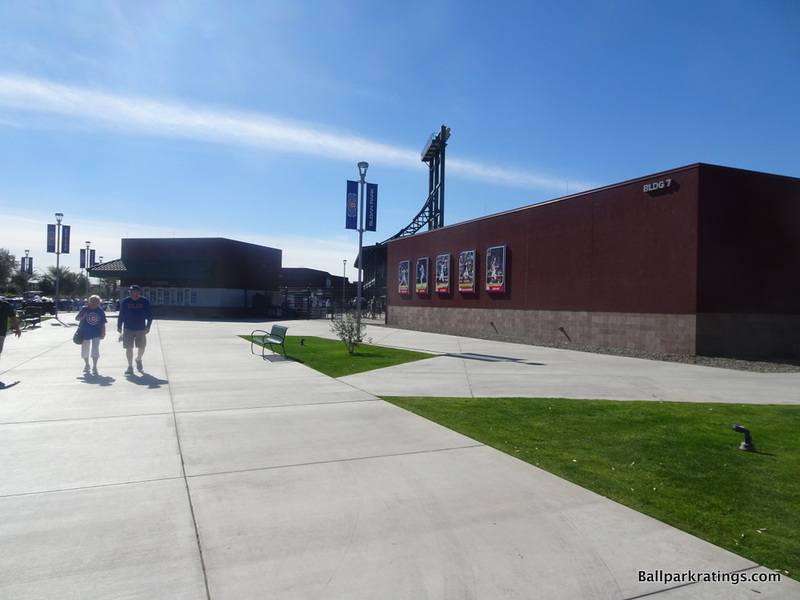 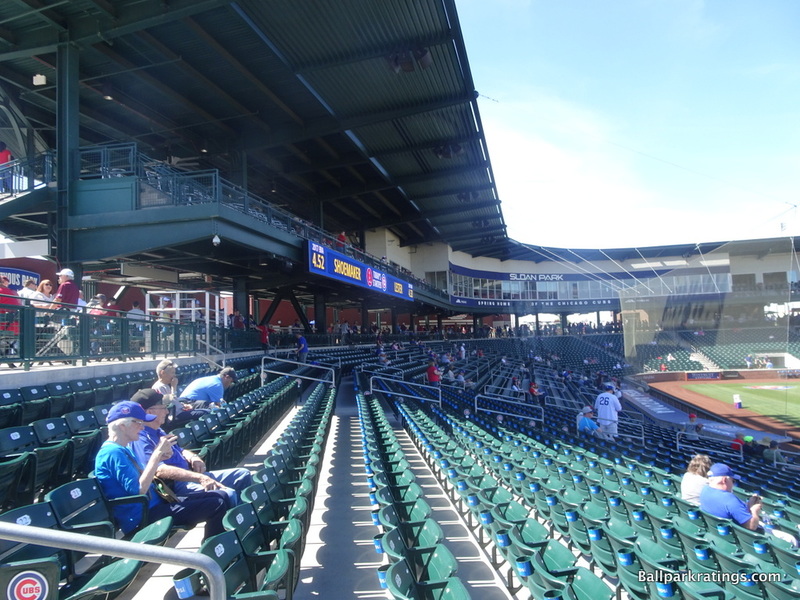 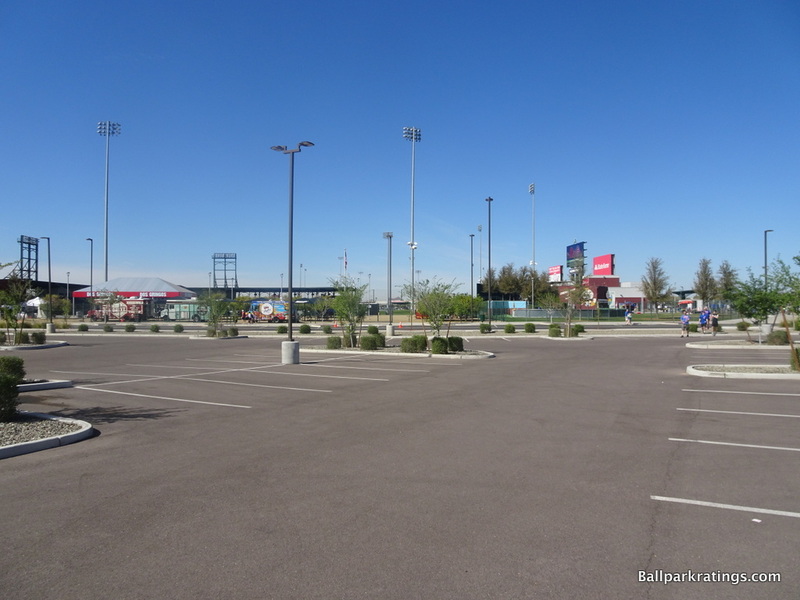 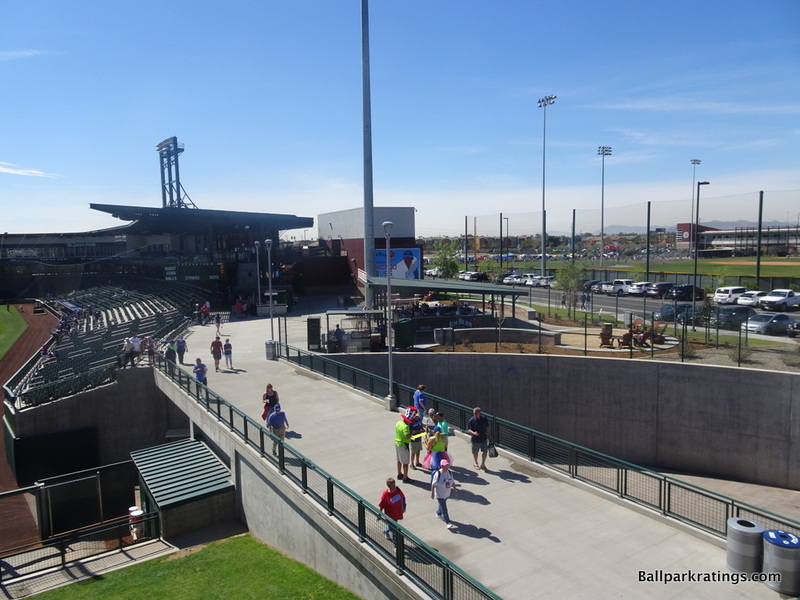 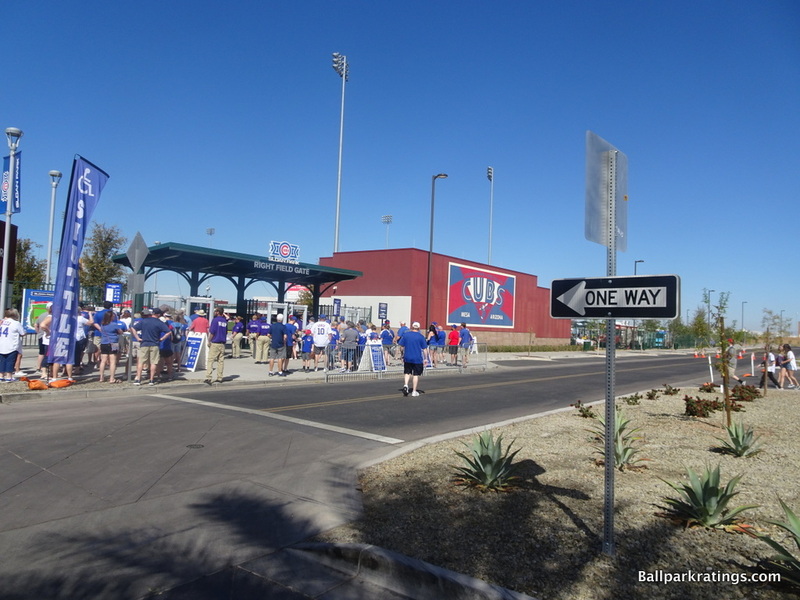 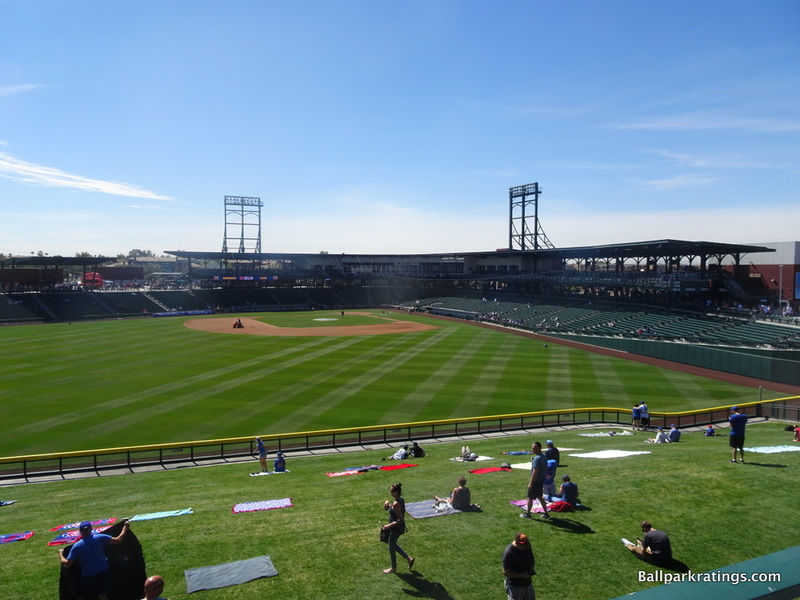 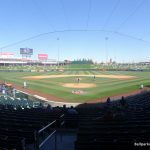 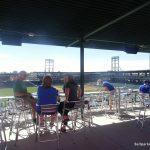 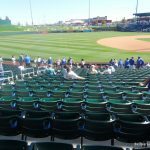 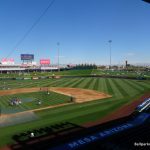 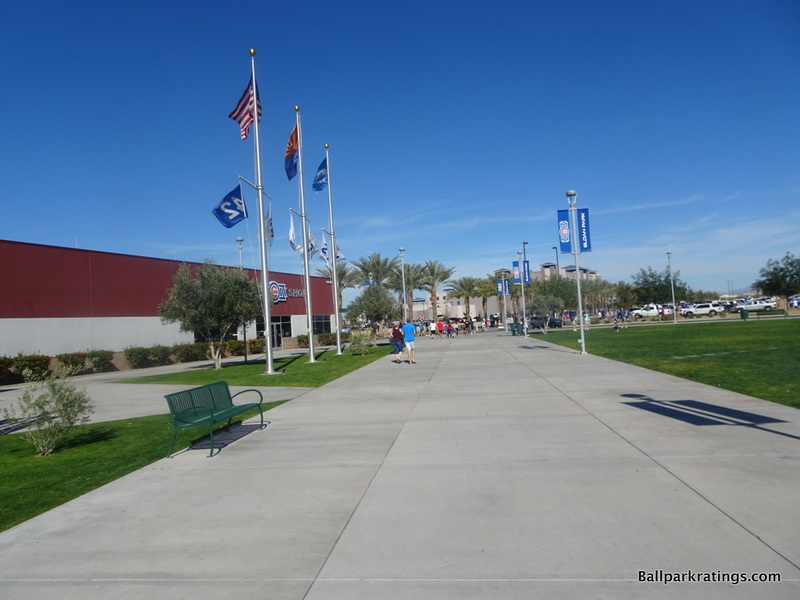 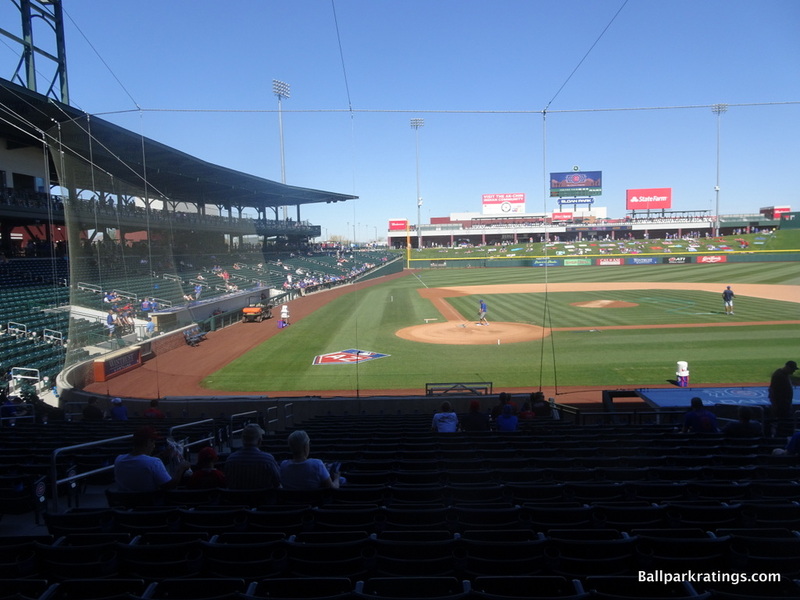 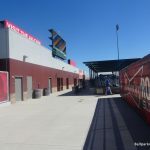 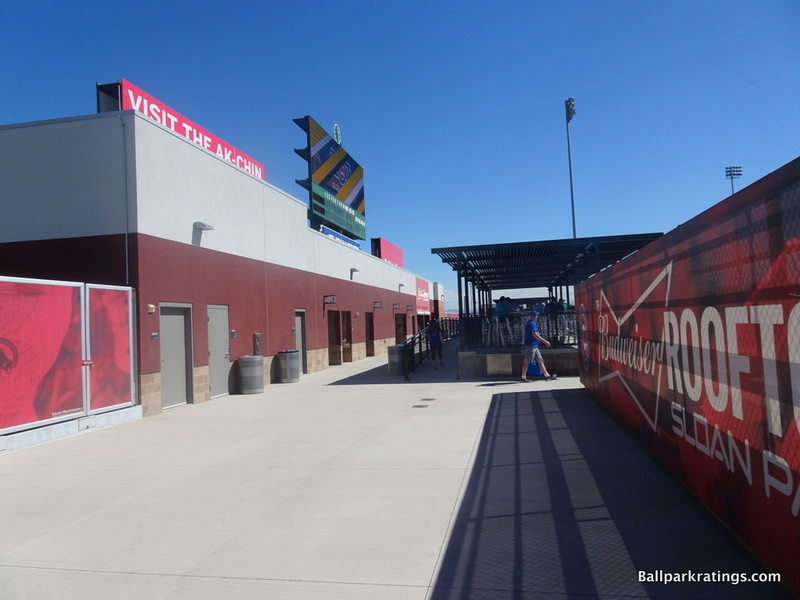 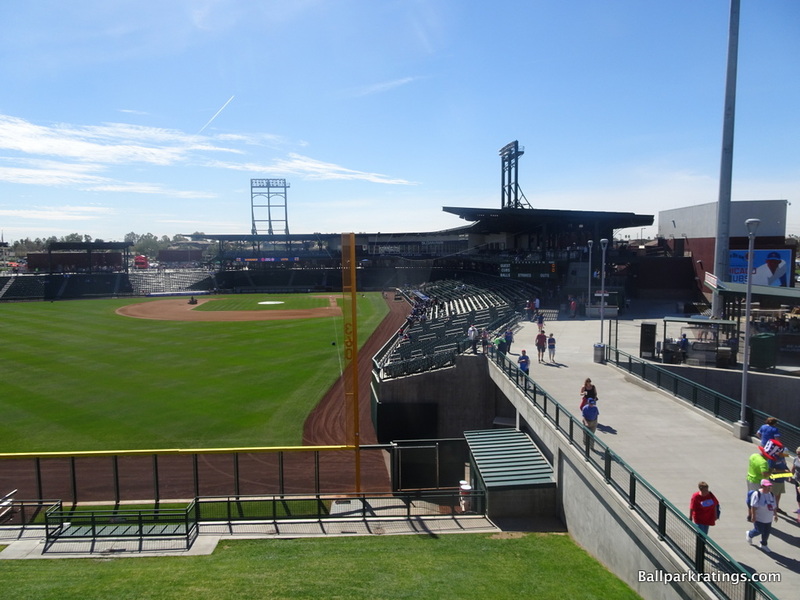 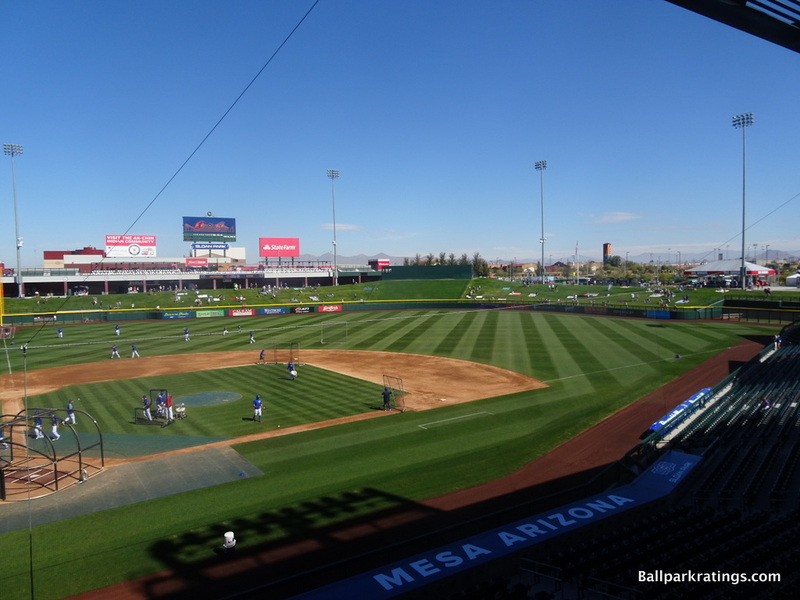 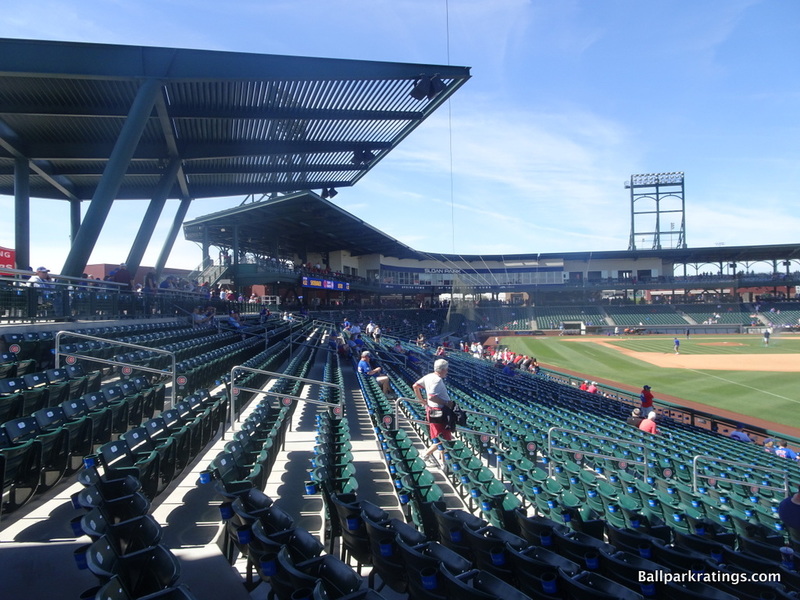 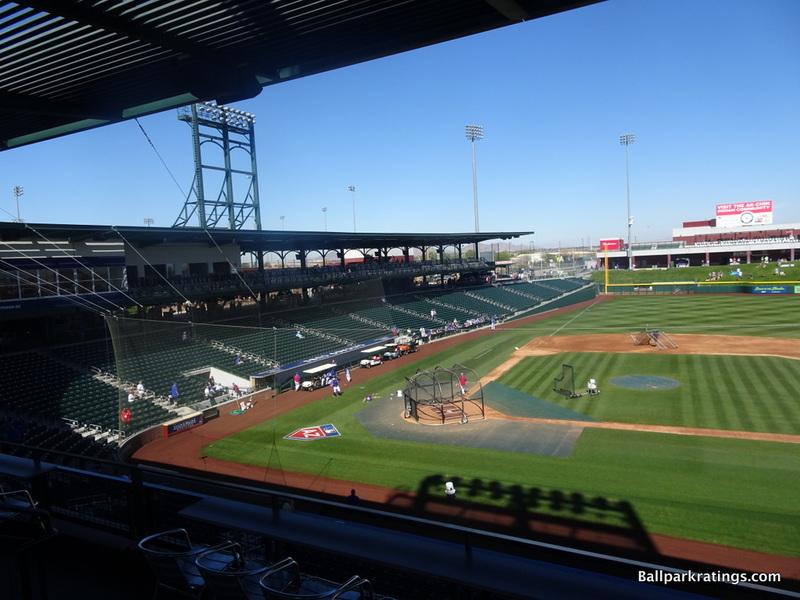 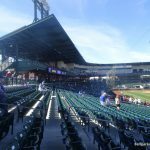 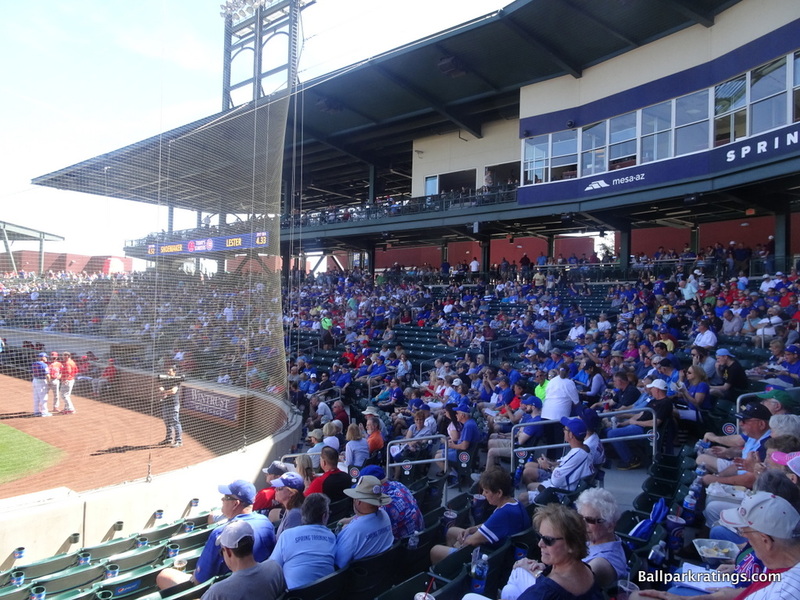 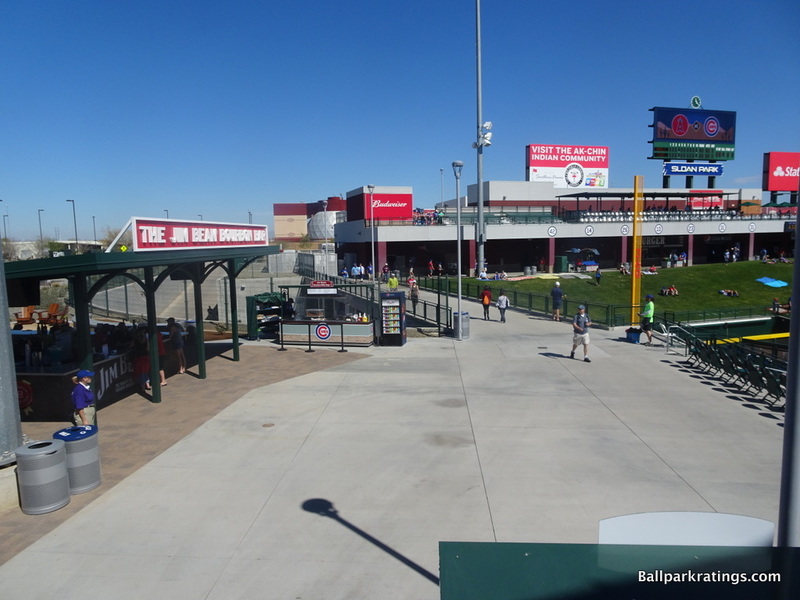 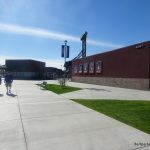 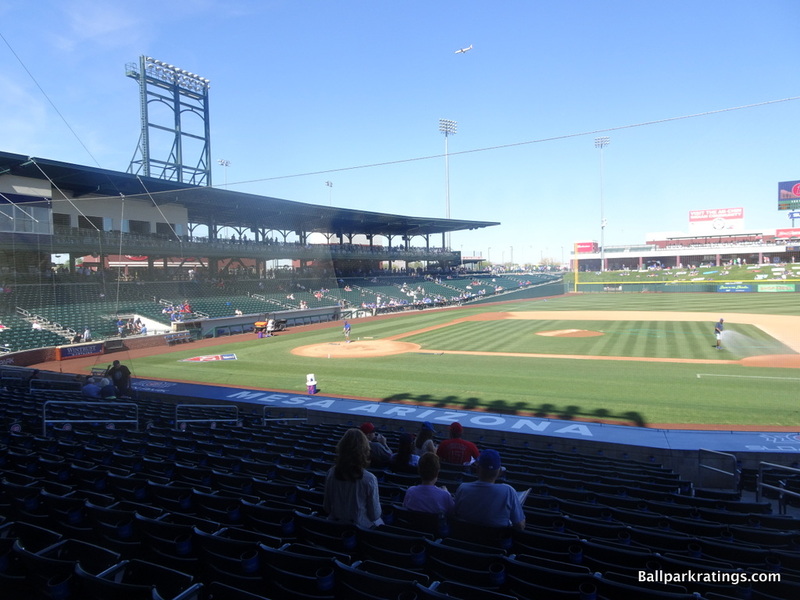 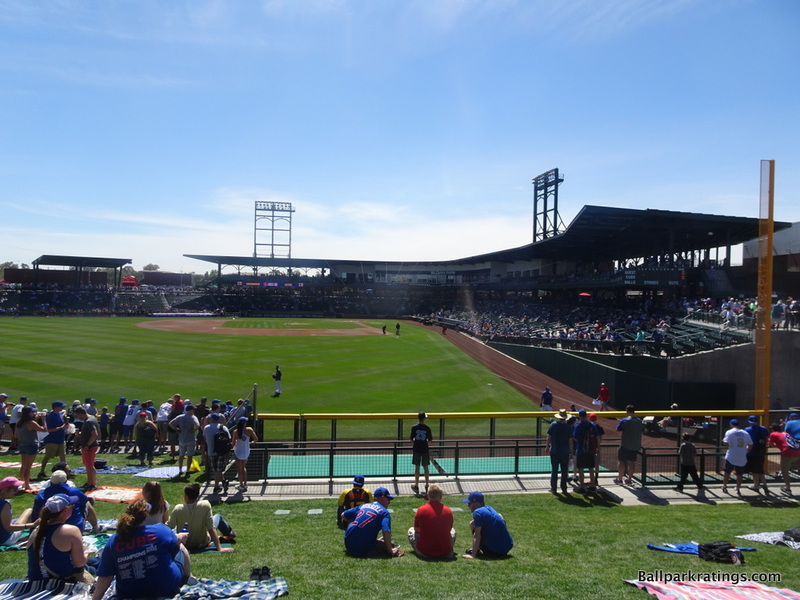 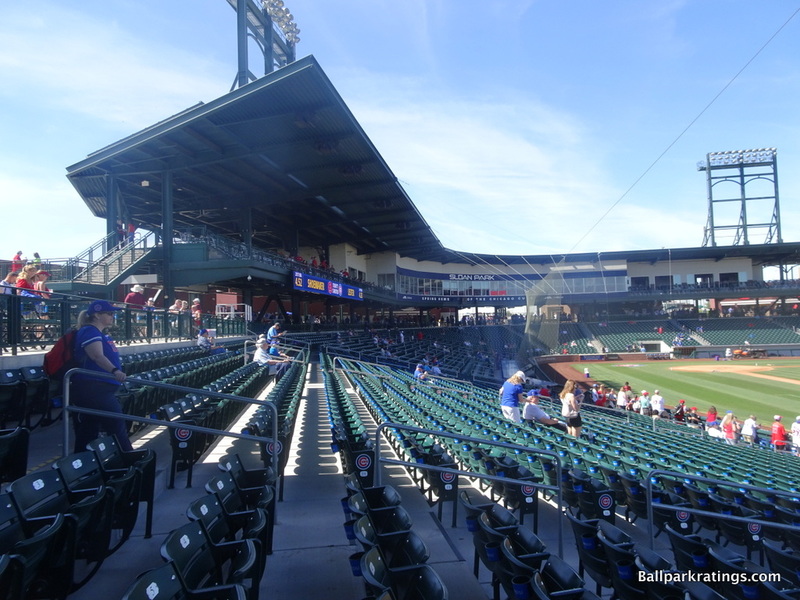 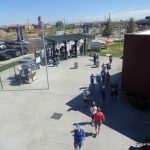 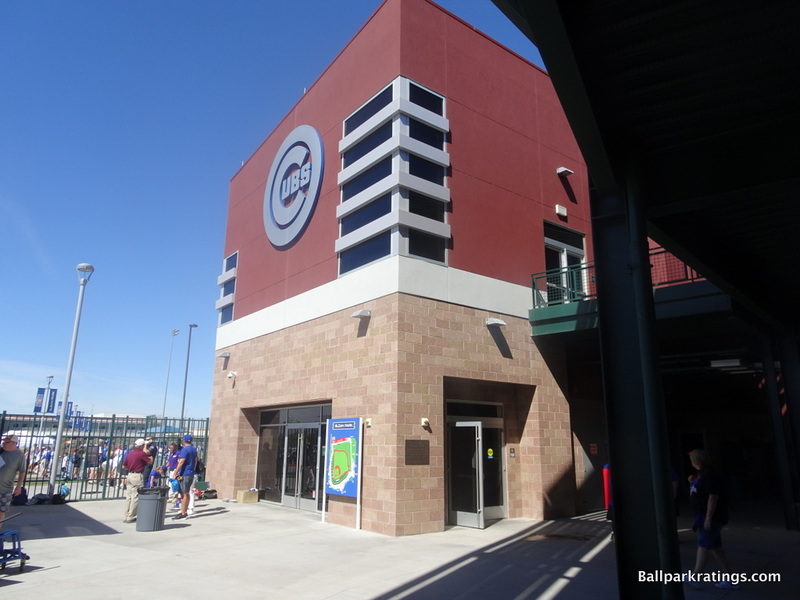 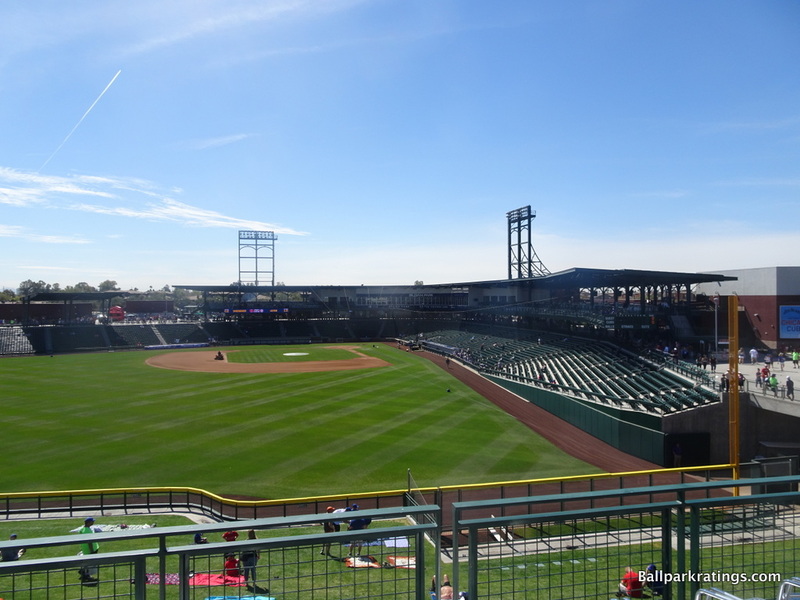 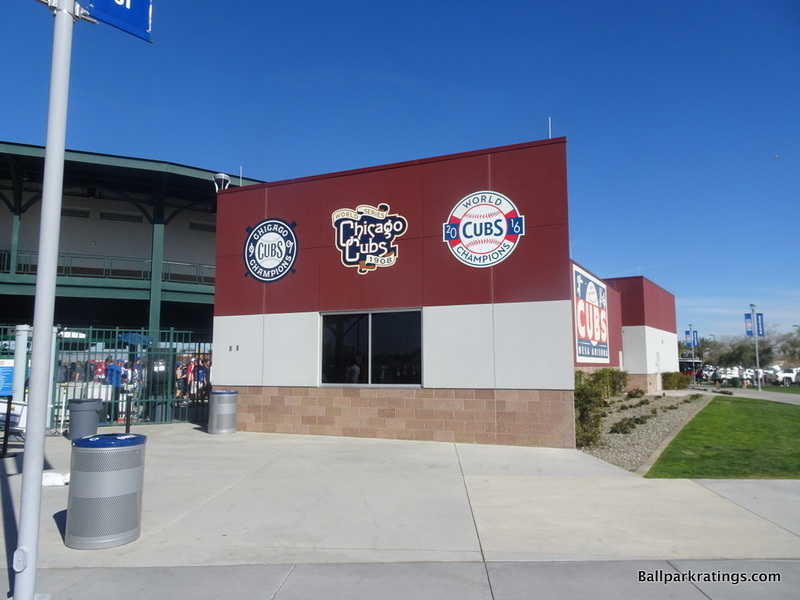 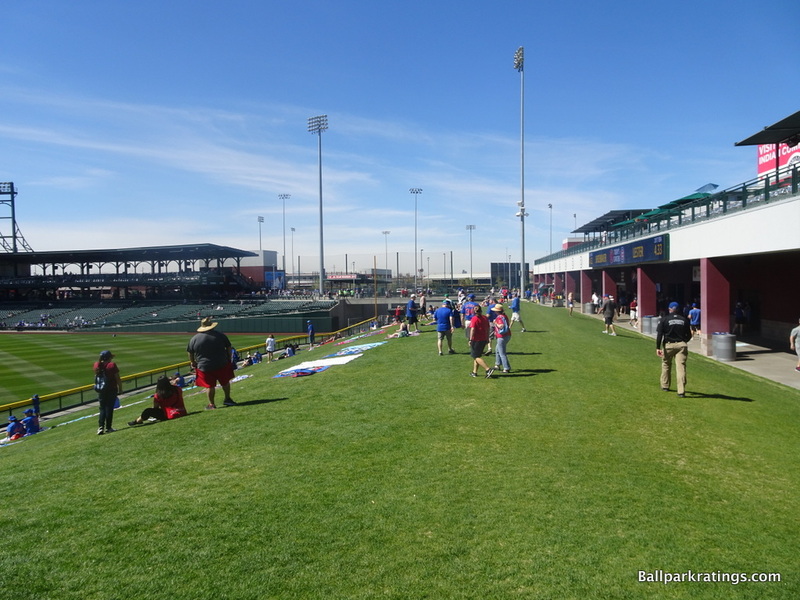 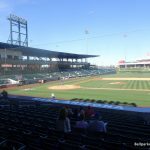 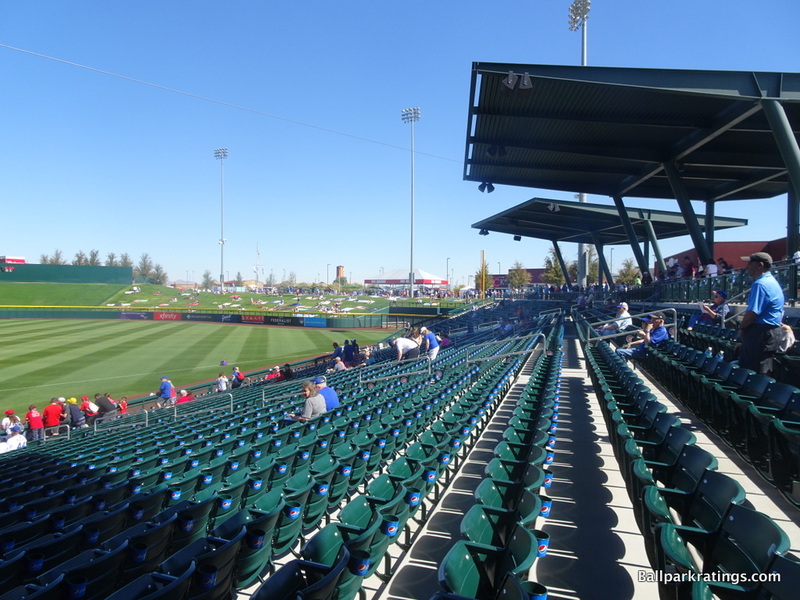 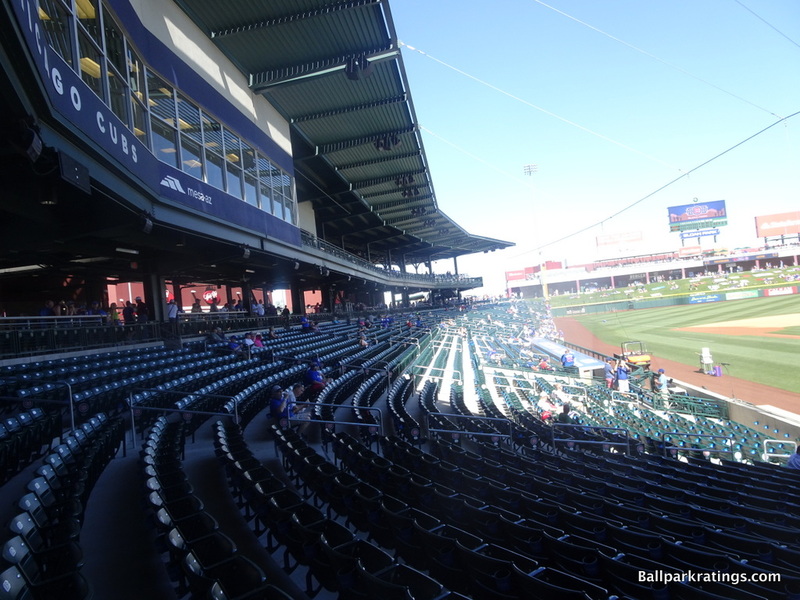 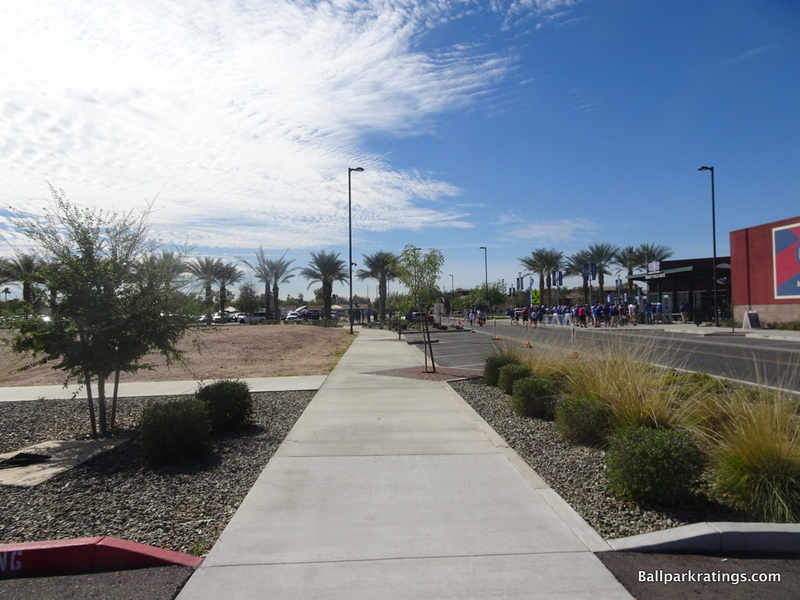 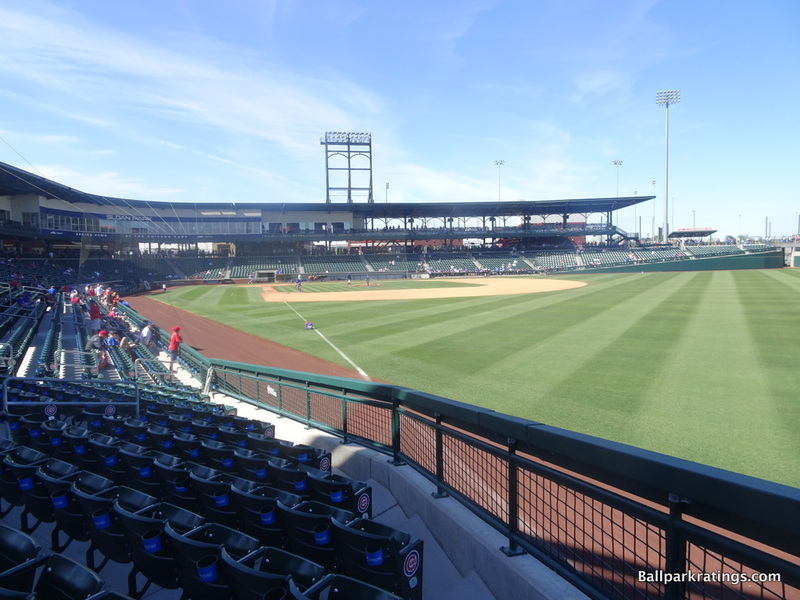 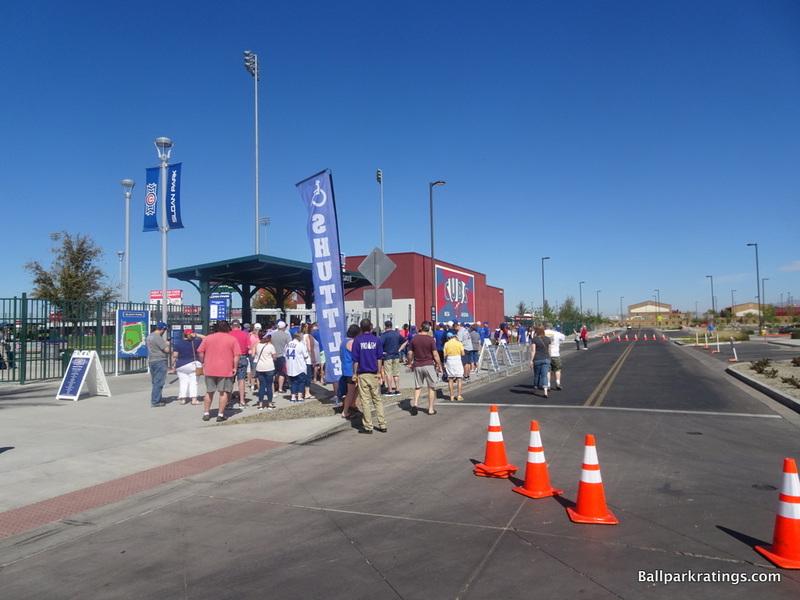 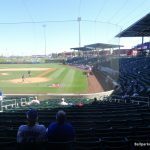 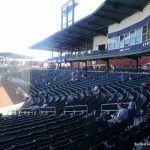 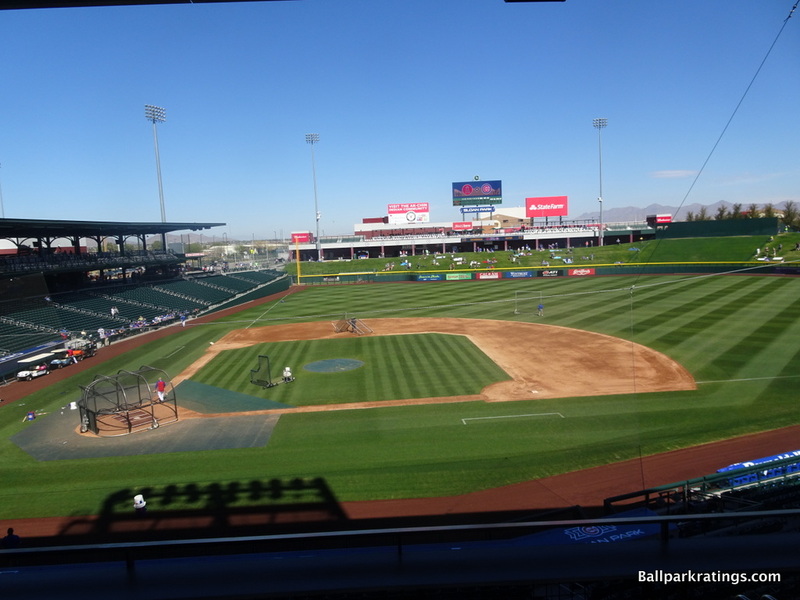 While it doesn’t yet match the ambitious Wrigleyville West vibe as originally intended, Sloan Park has one of the better locations in the Cactus League. 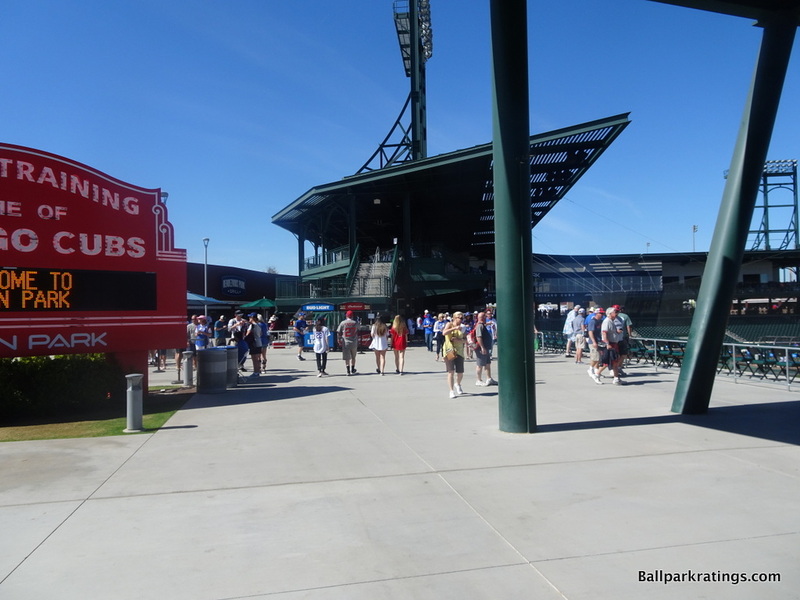 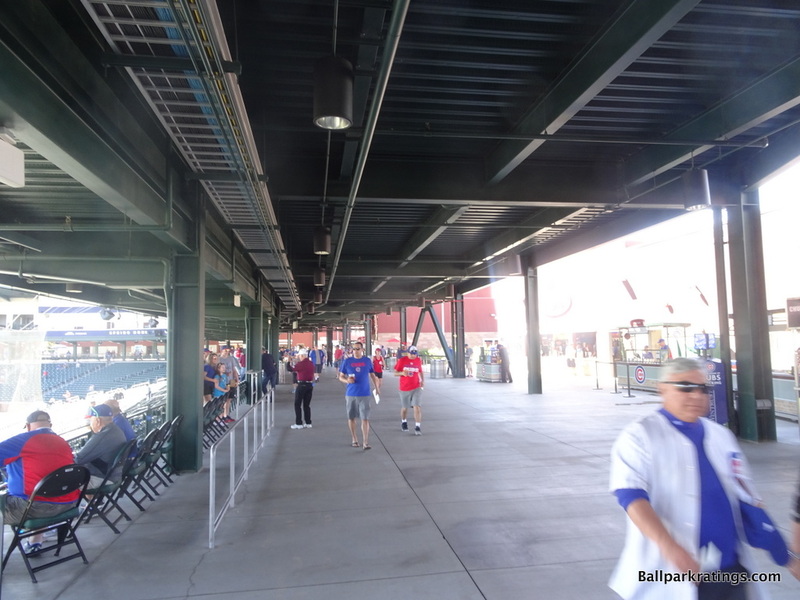 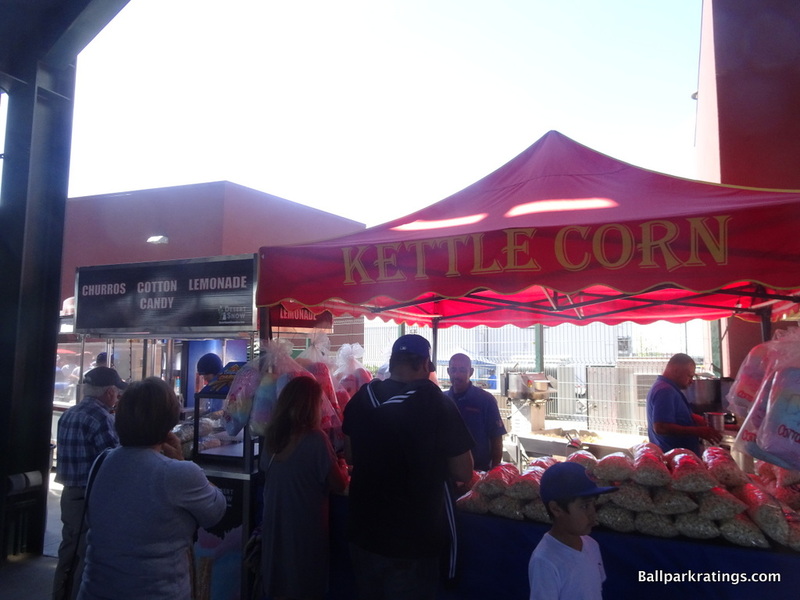 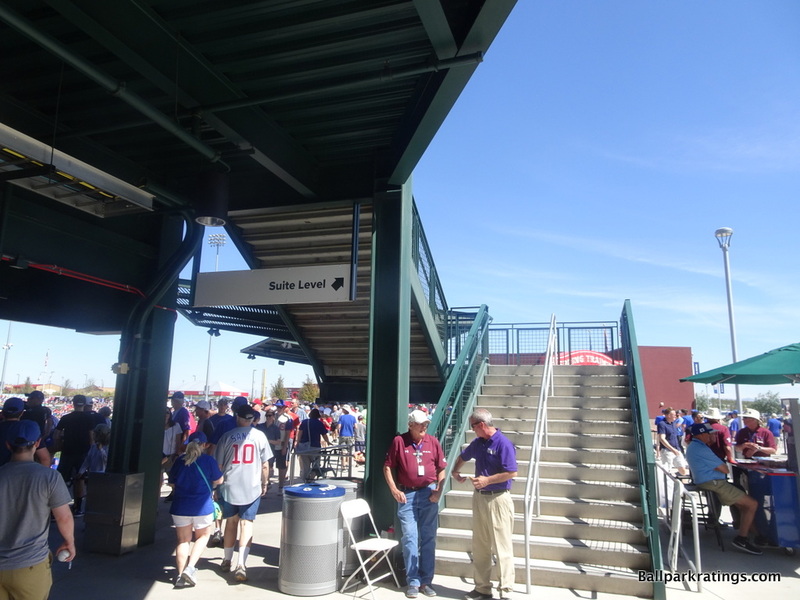 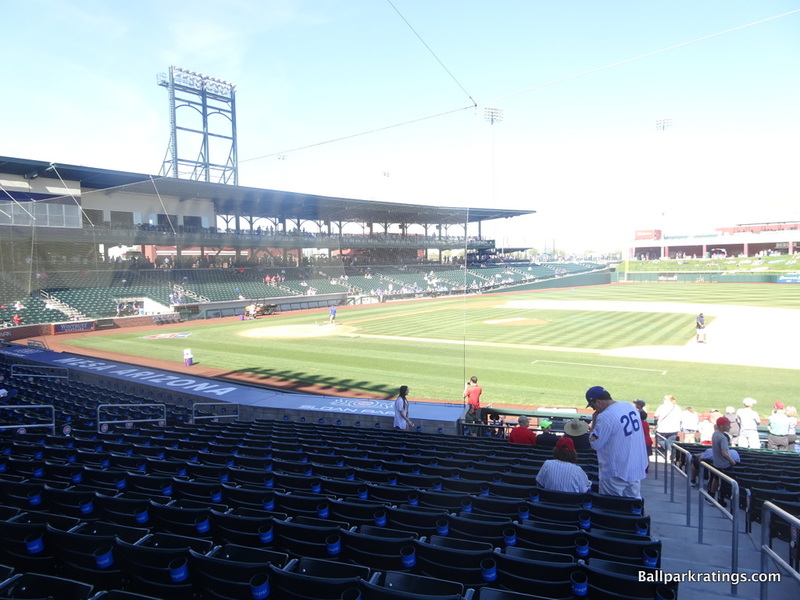 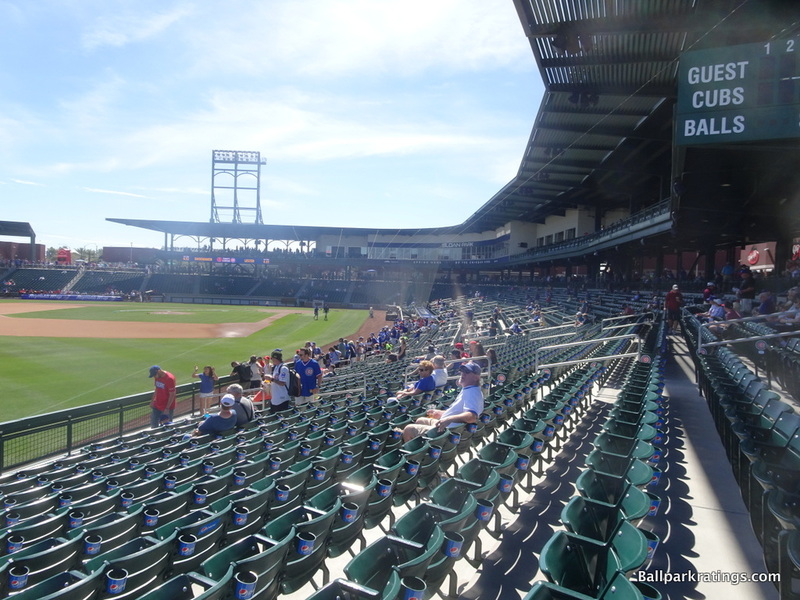 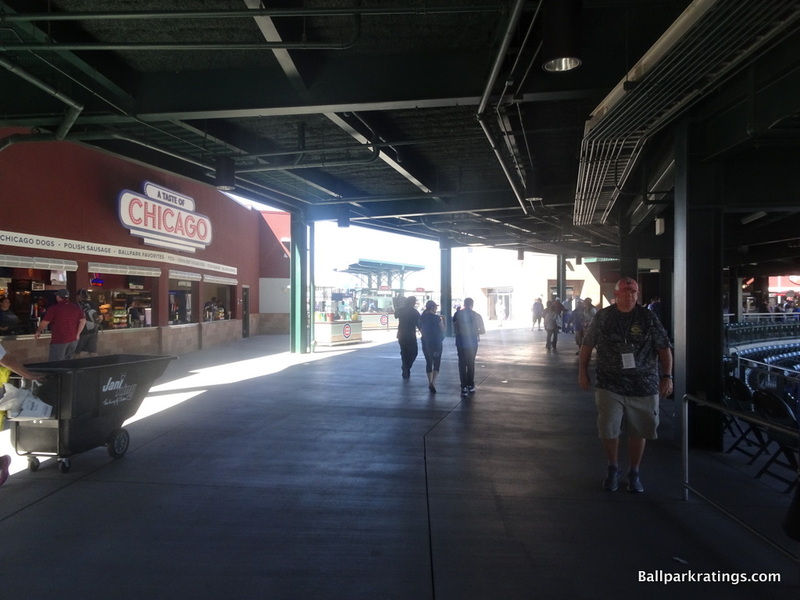 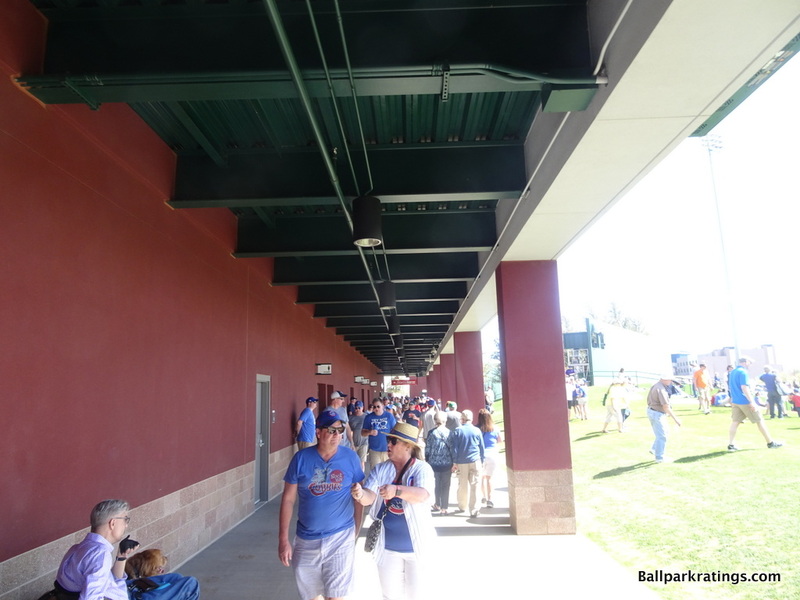 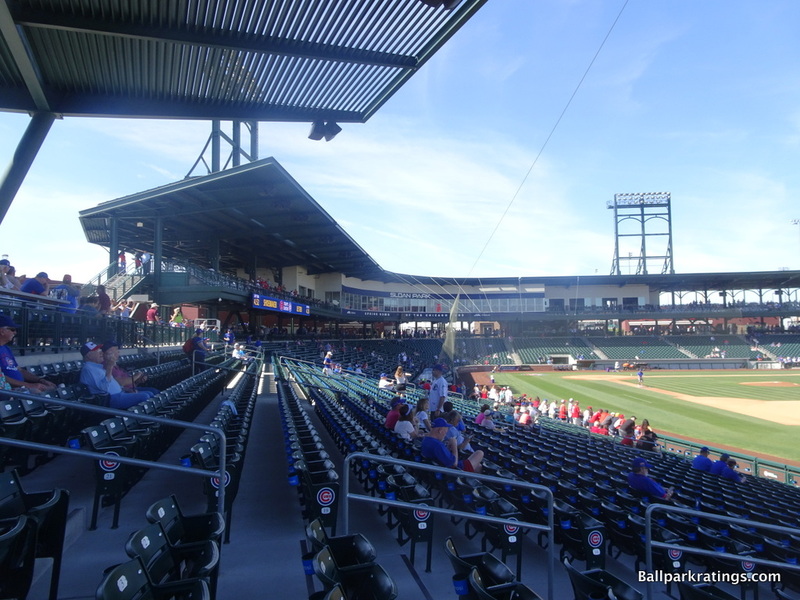 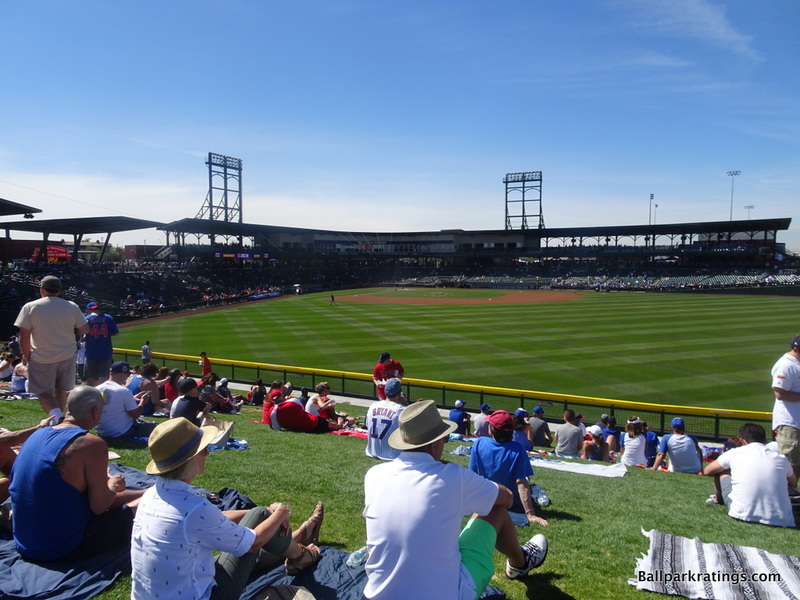 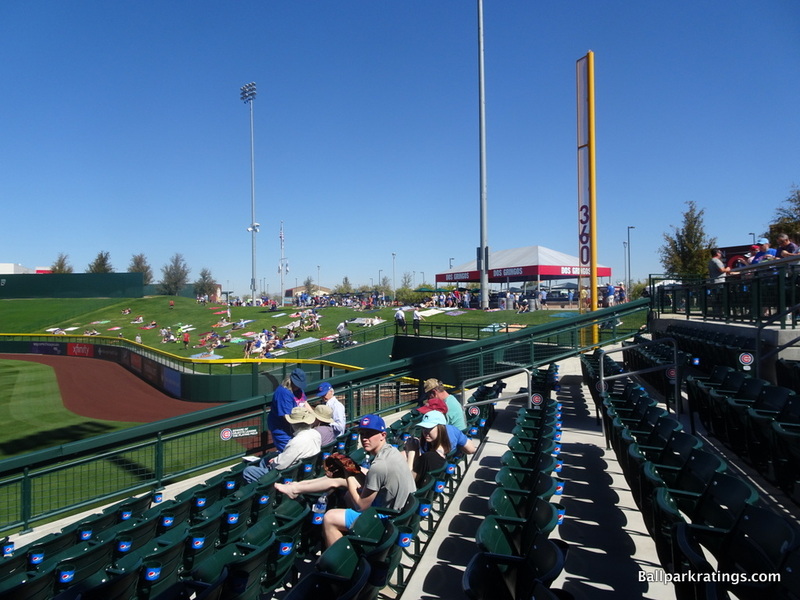 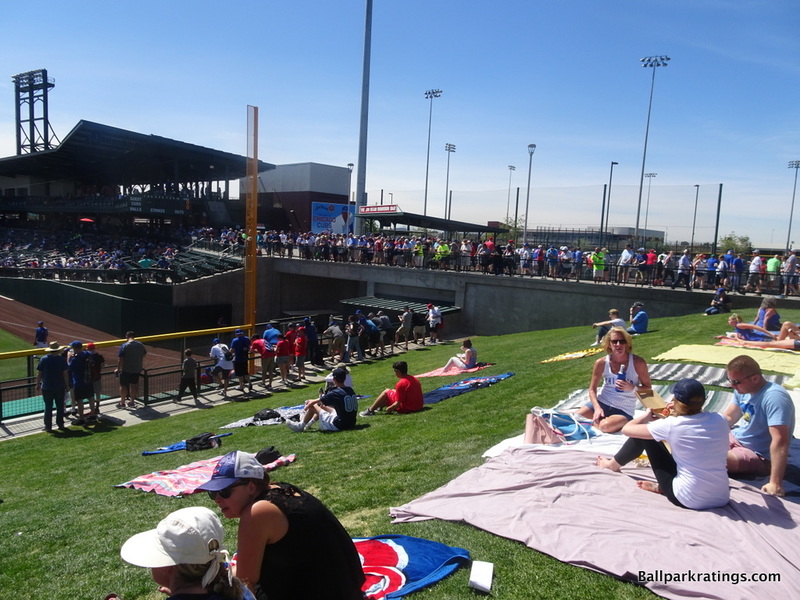 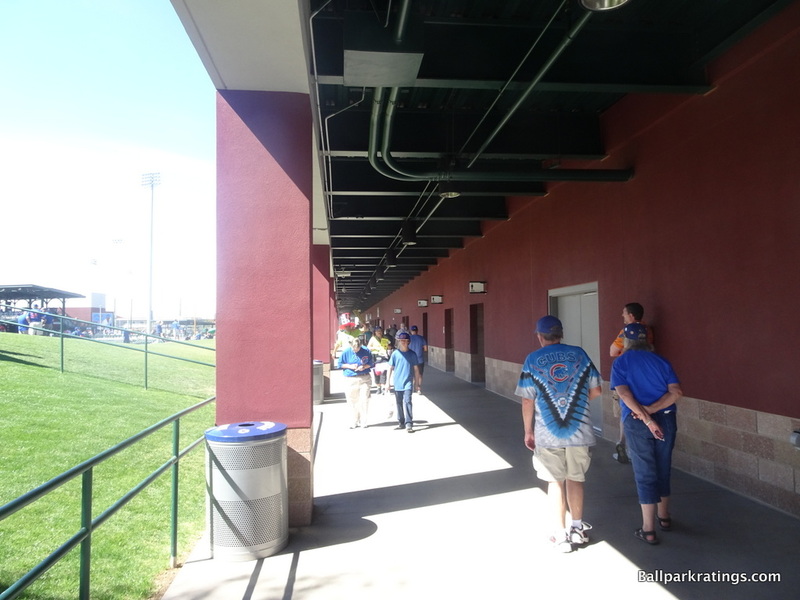 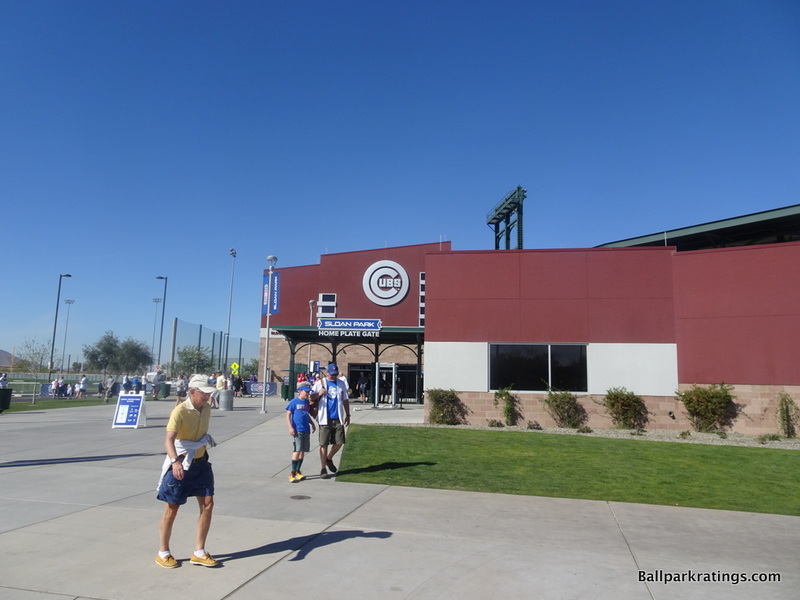 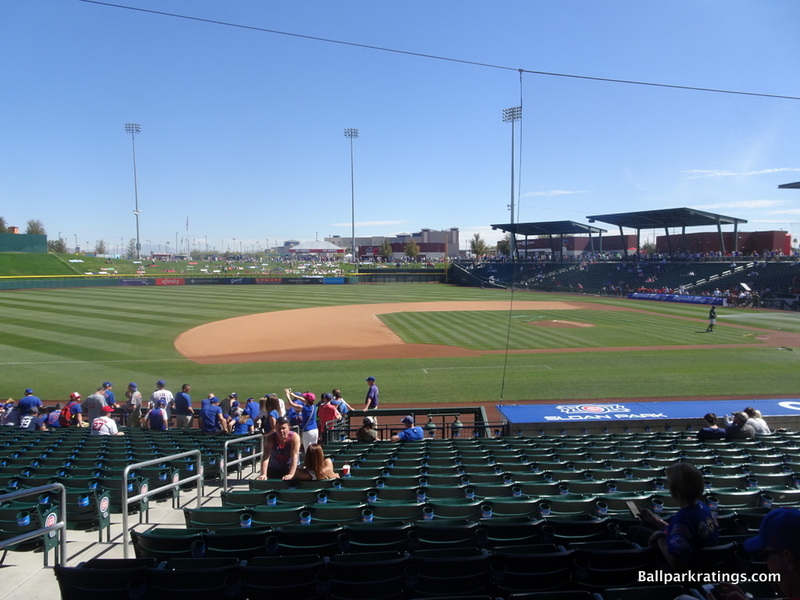 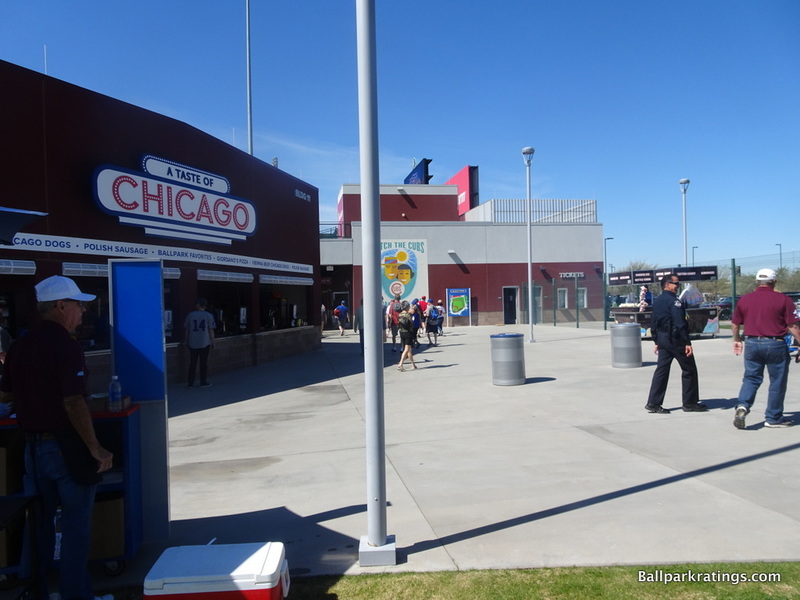 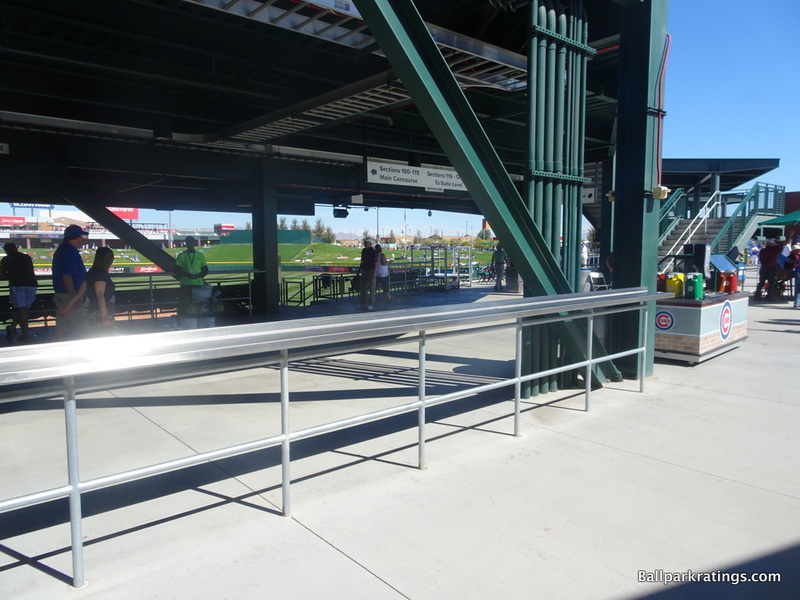 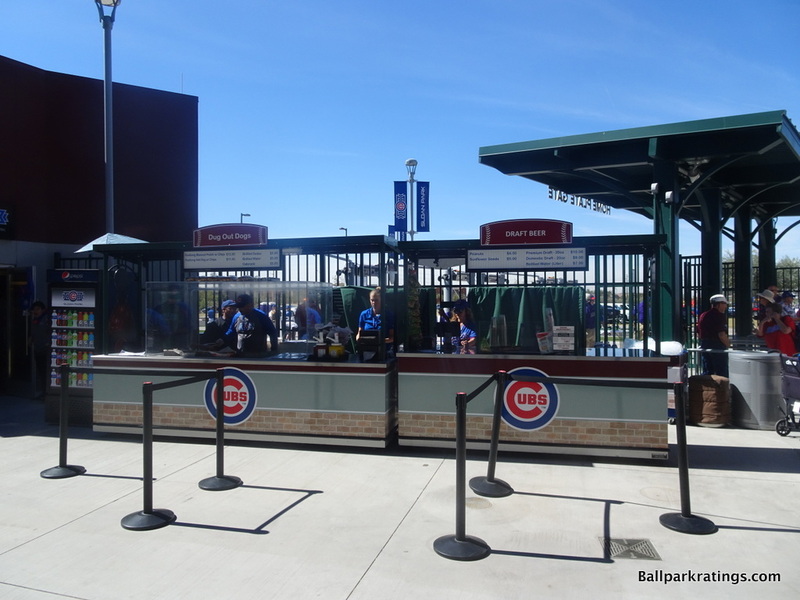 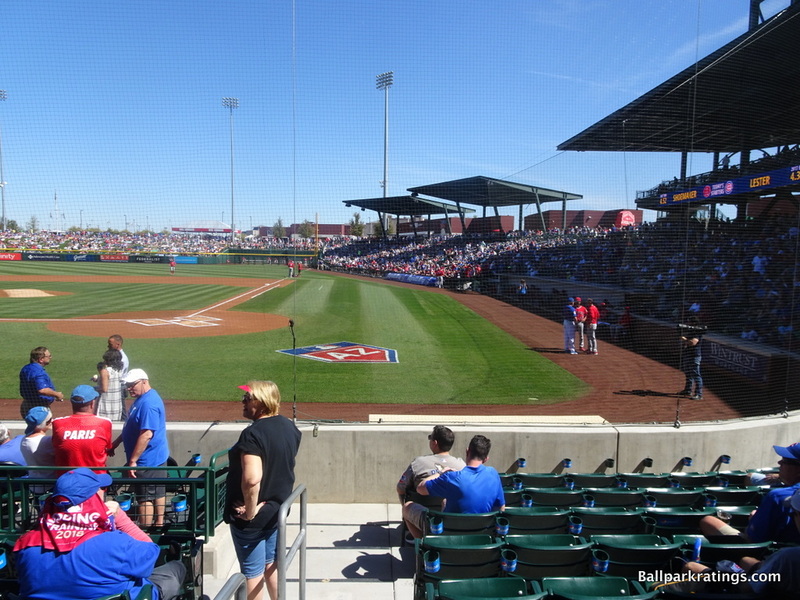 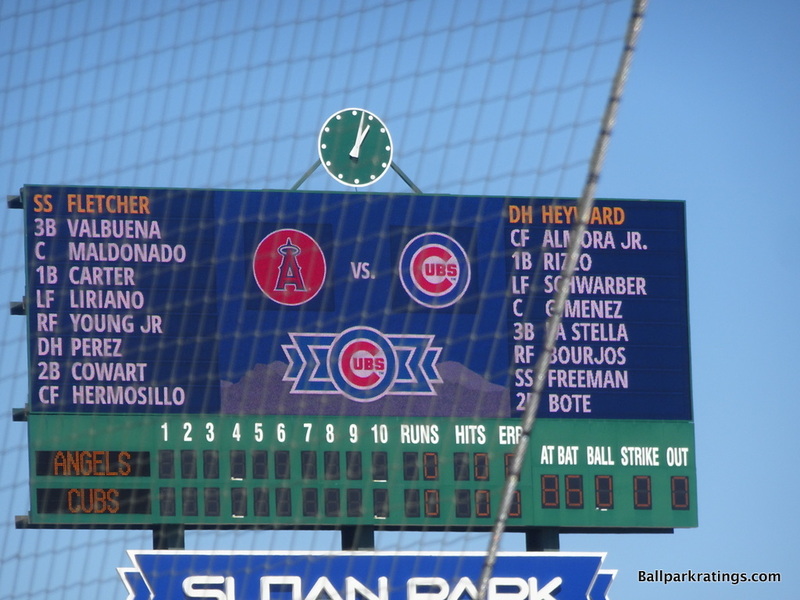 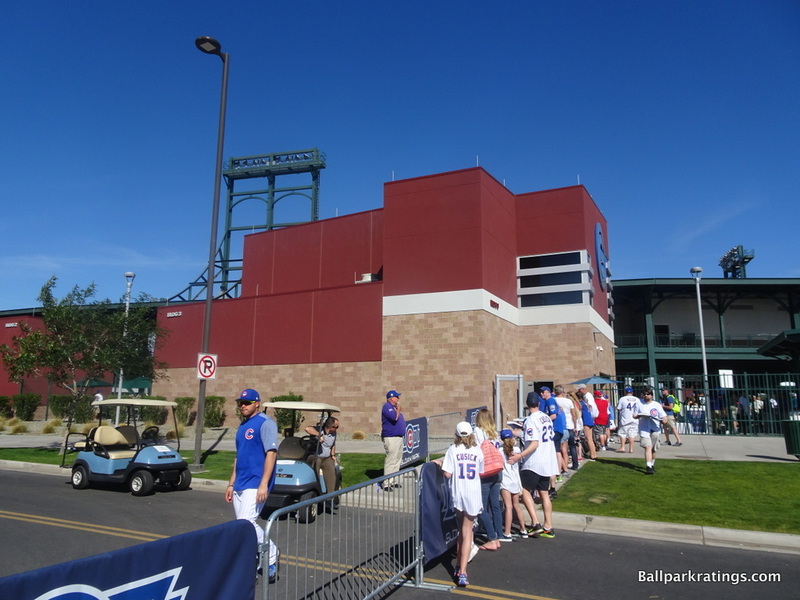 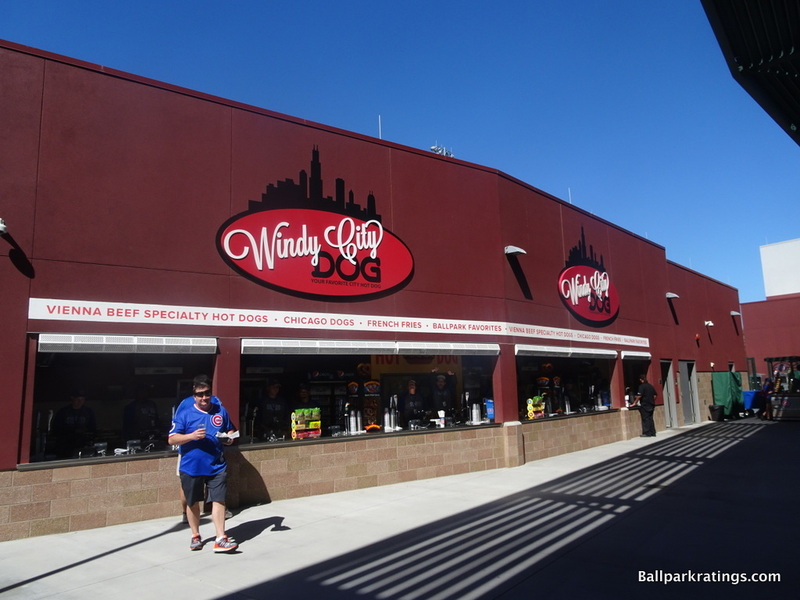 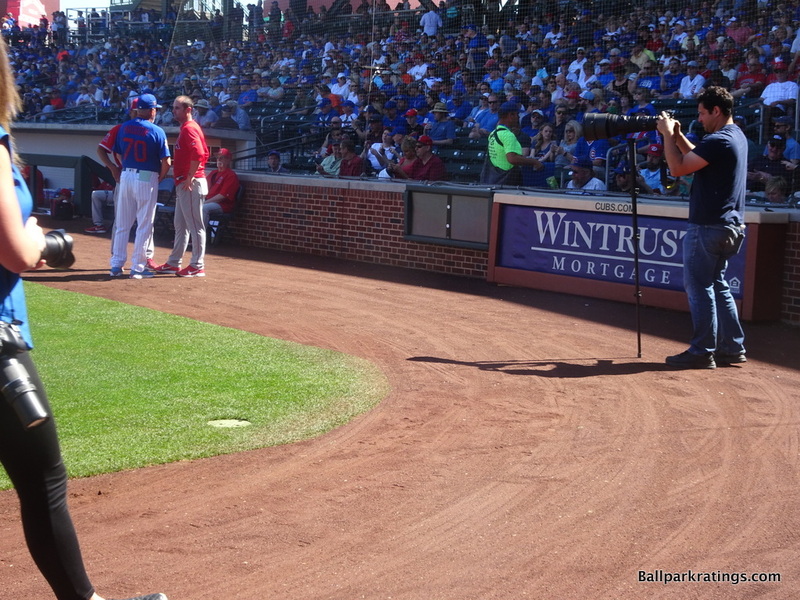 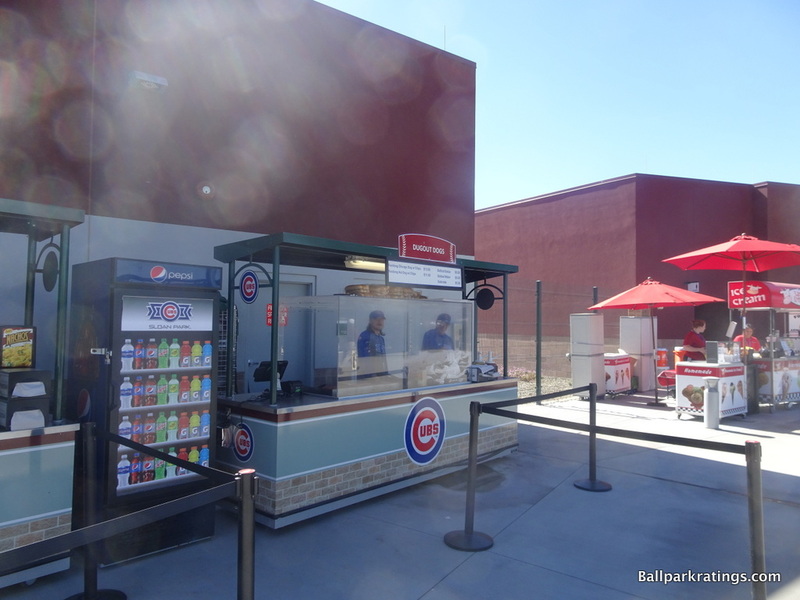 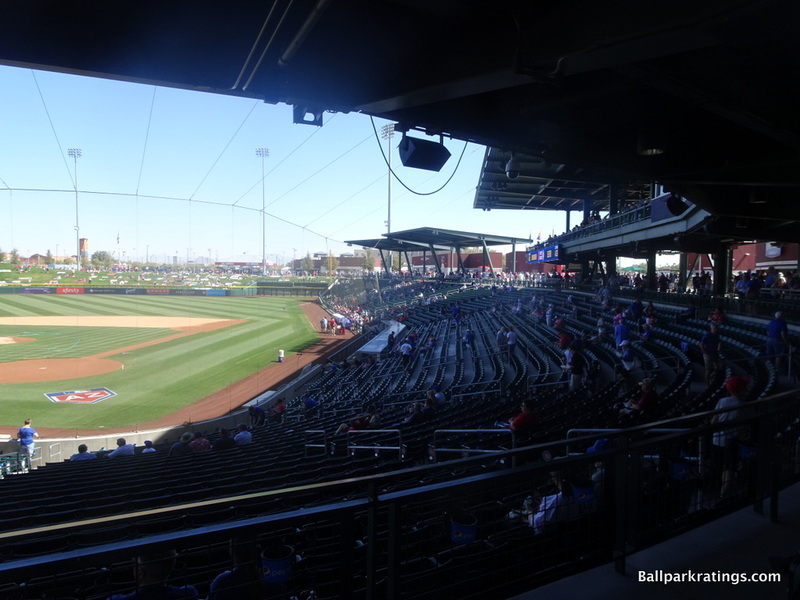 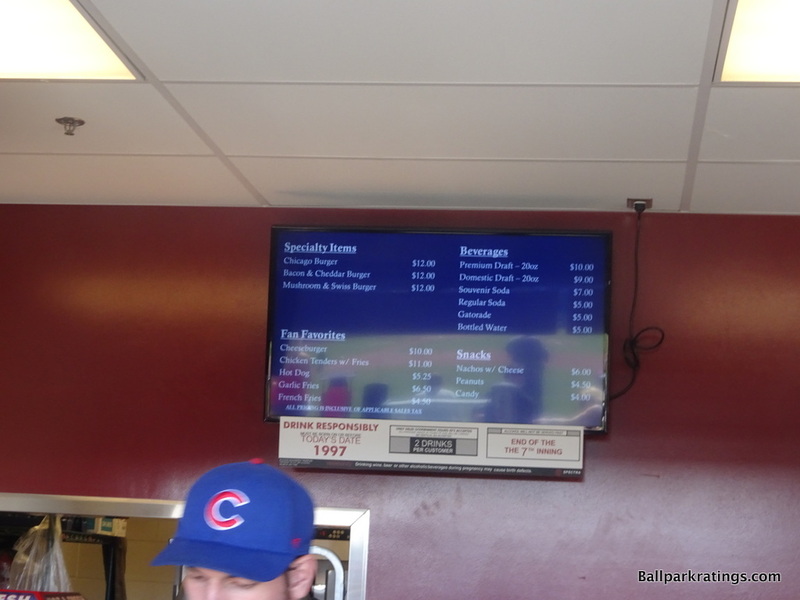 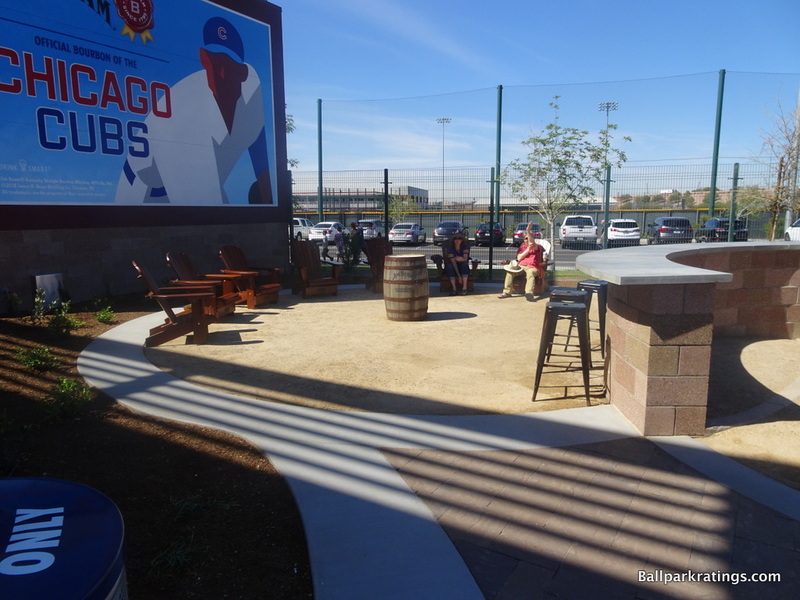 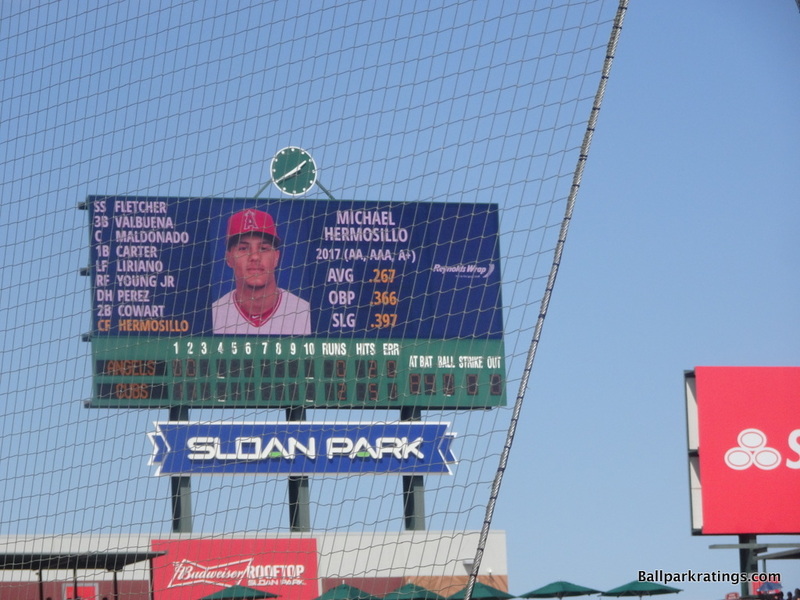 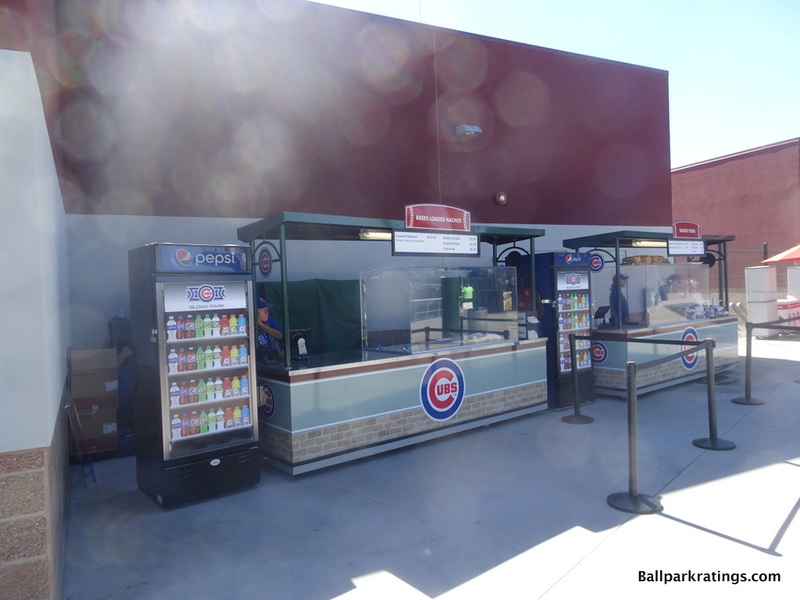 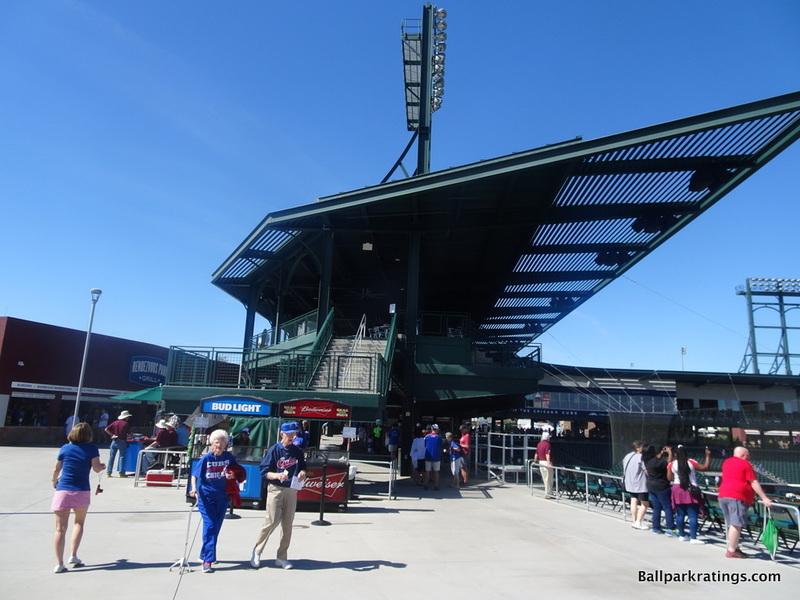 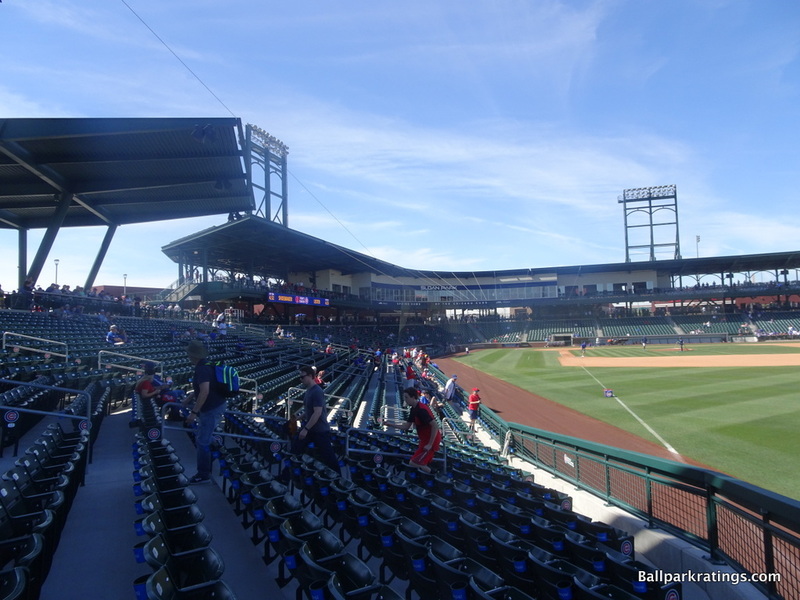 Sloan Park possesses Wrigley Field’s aesthetics with a Southwestern flare. 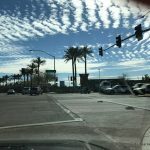 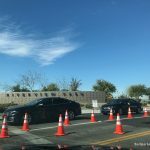 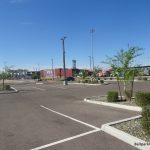 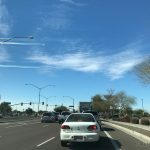 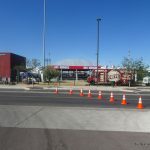 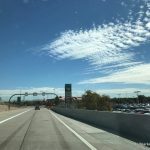 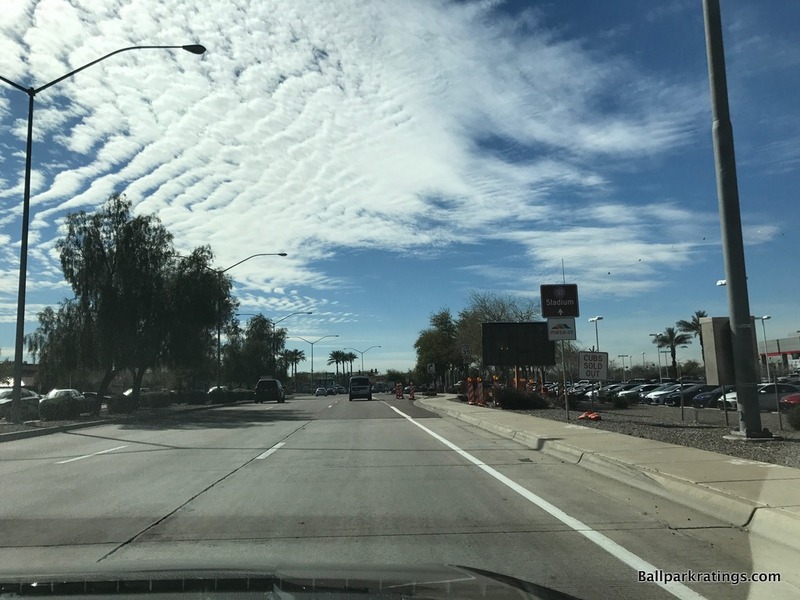 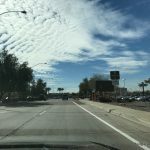 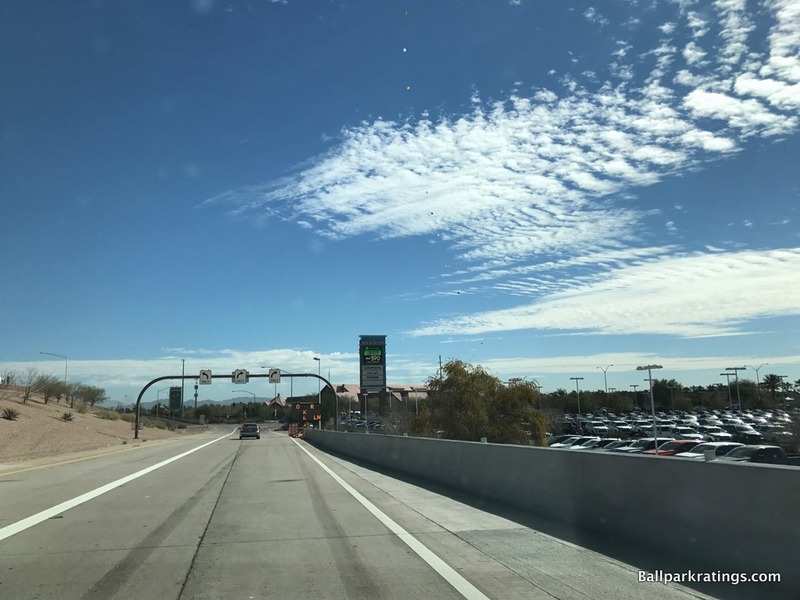 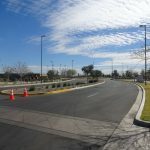 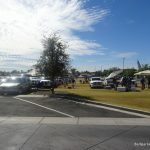 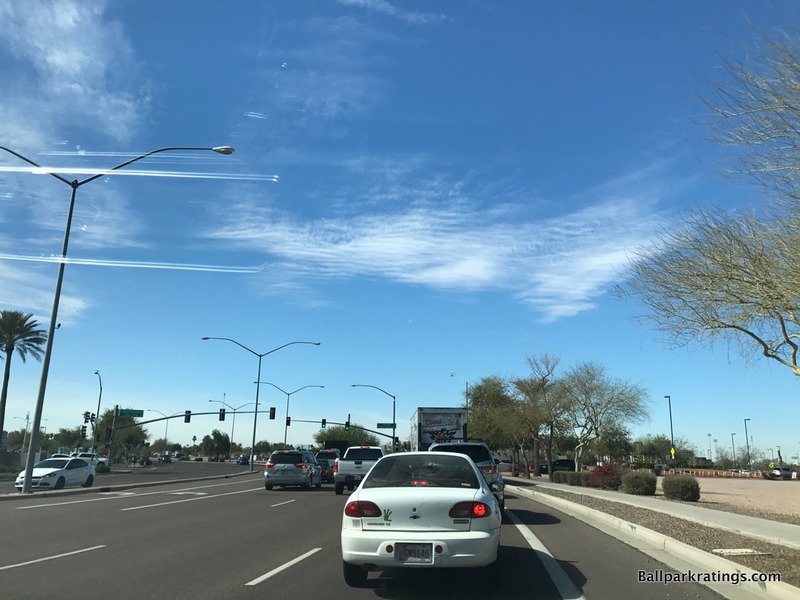 Right by two freeways and a major interchange at the Tempe-Mesa line, the surrounding area is bustling with activity. 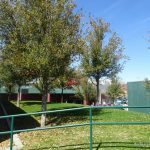 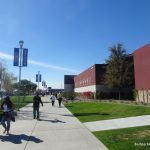 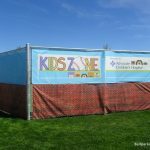 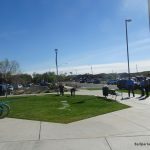 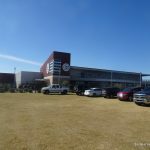 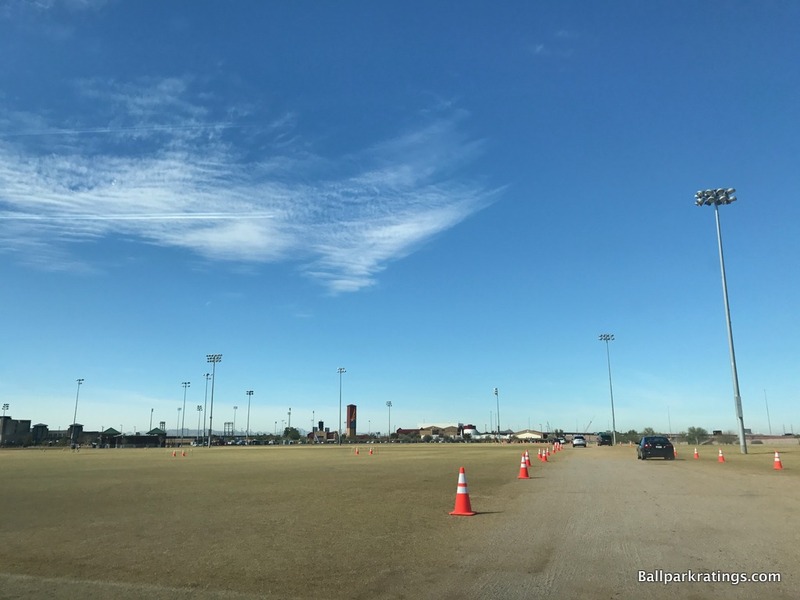 Most notable is Riverview Park, a green space with a scenic walkway, fishing lake, climbing tower, two playgrounds, picnic areas, fountains, and other engaging activities. 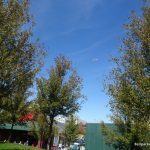 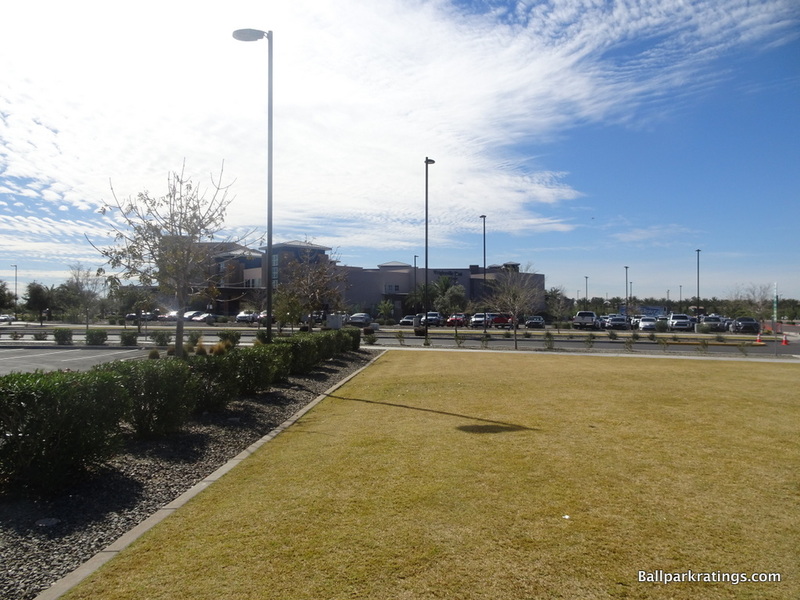 Shopping centers and plentiful dining options are nearby. 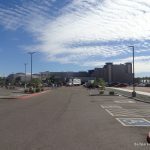 The Sheraton Mesa is right next door. 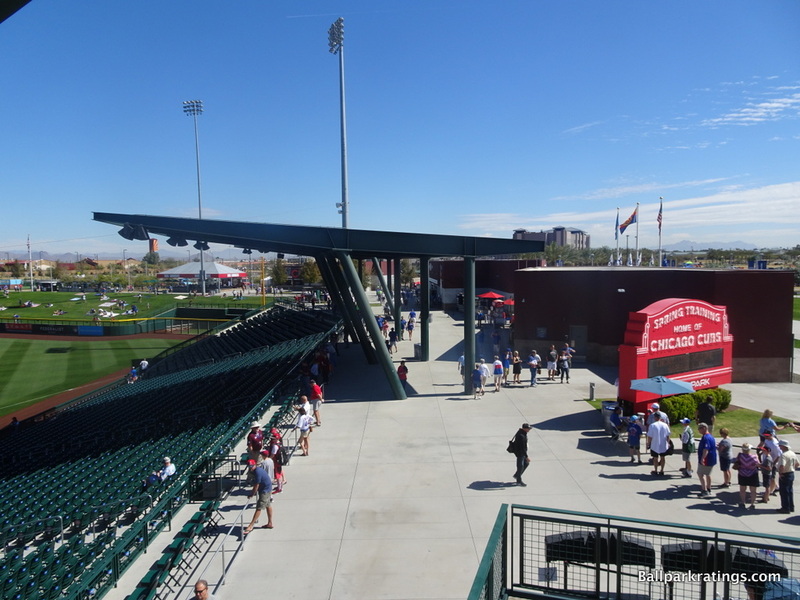 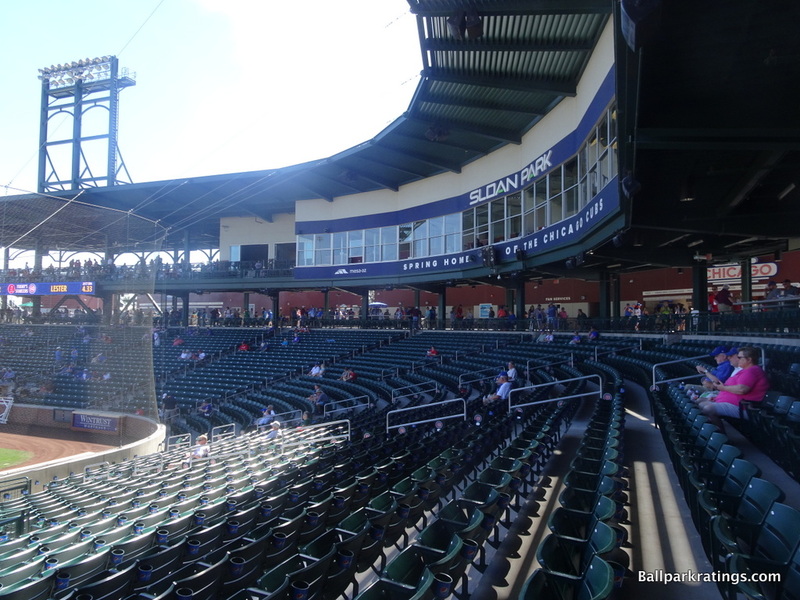 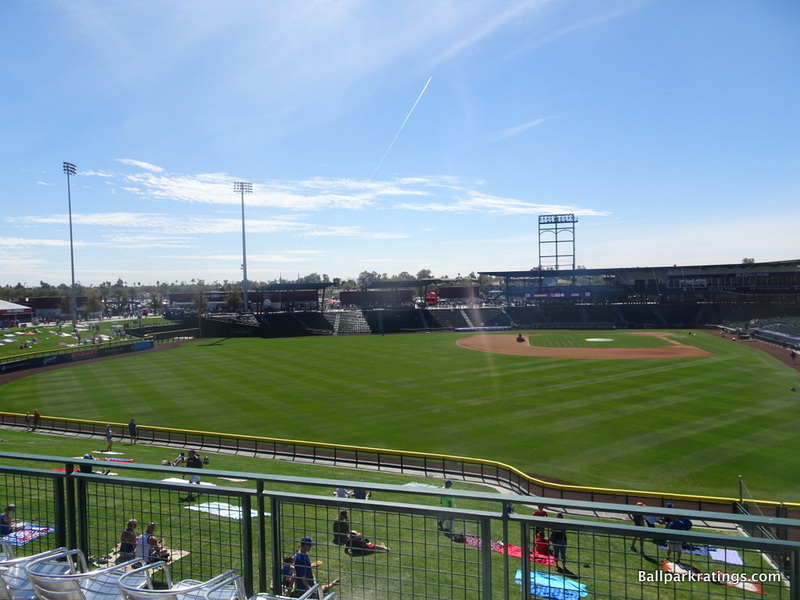 Sloan Park isn’t transcendently beautiful like the five-star resort-type edifices of Camelback Ranch or Salt River Fields at Talking Stick, but its architecture and aesthetics stand up well against the best from the Grapefruit League. 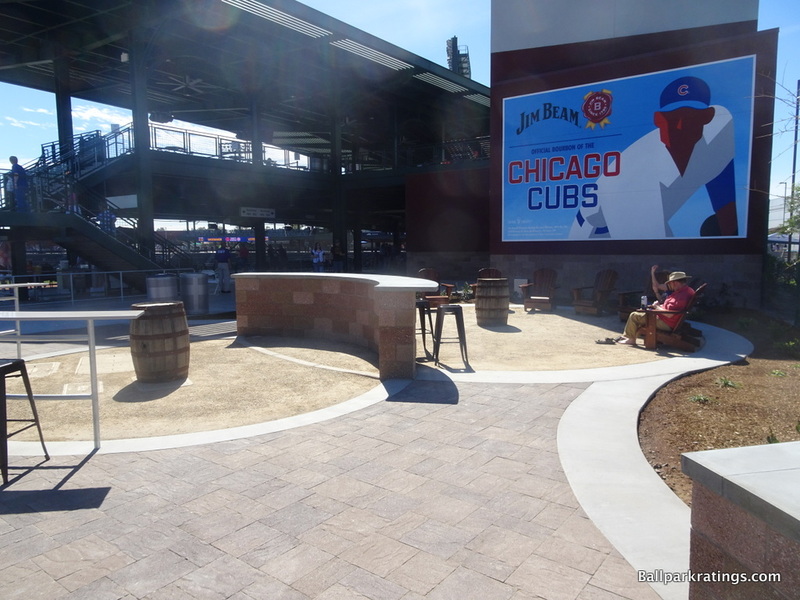 The Cubs’ new park resembles Wrigley Field with a Southwestern influence. 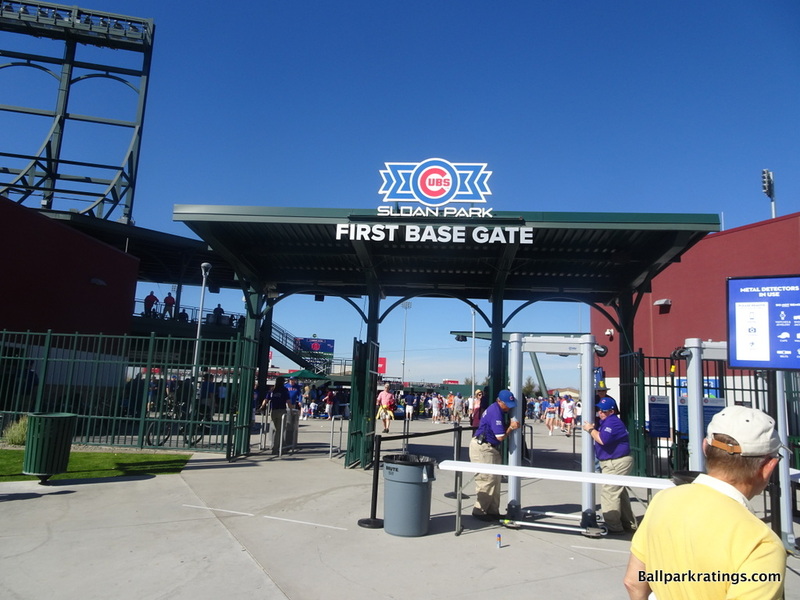 The façade features a desert color scheme with red adobe topping natural sand brick combined with the arched green steelwork of Wrigley. 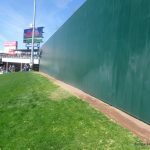 In the interest of intimacy, the perceptual scale is reduced by breaking up the facade into a series of different structures. 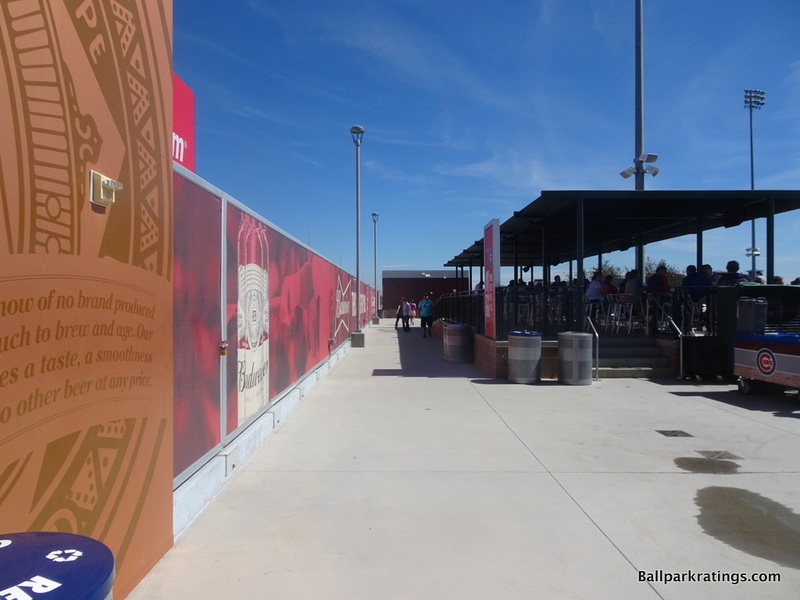 Distinctive team-related ornamentation further accentuates the scene. 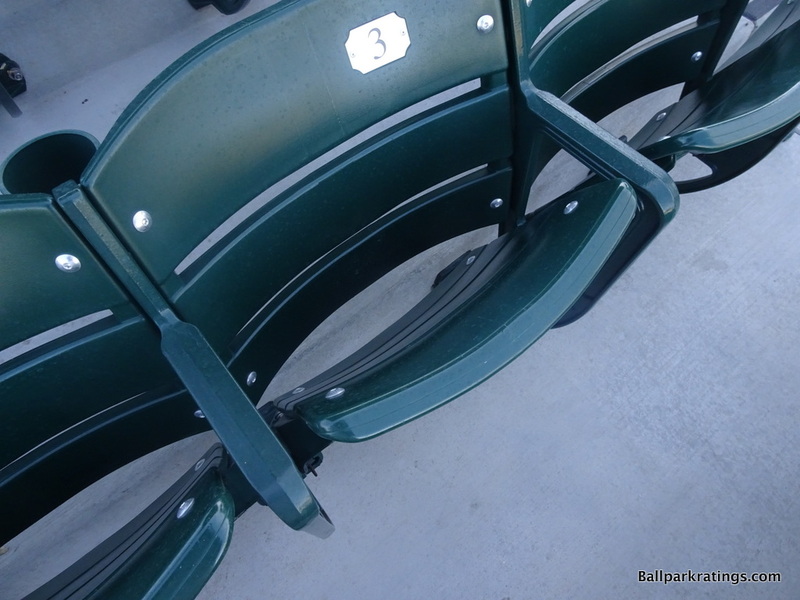 The interior aesthetics are also defined by features intended to remind fans of home fused with local characteristics. 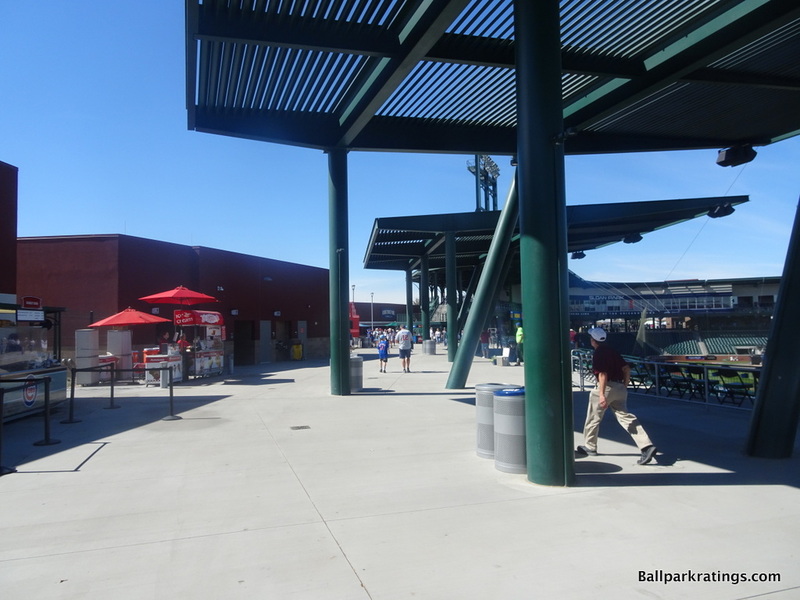 Green arched light towers and trellised roofing punctuate the interior vibe. 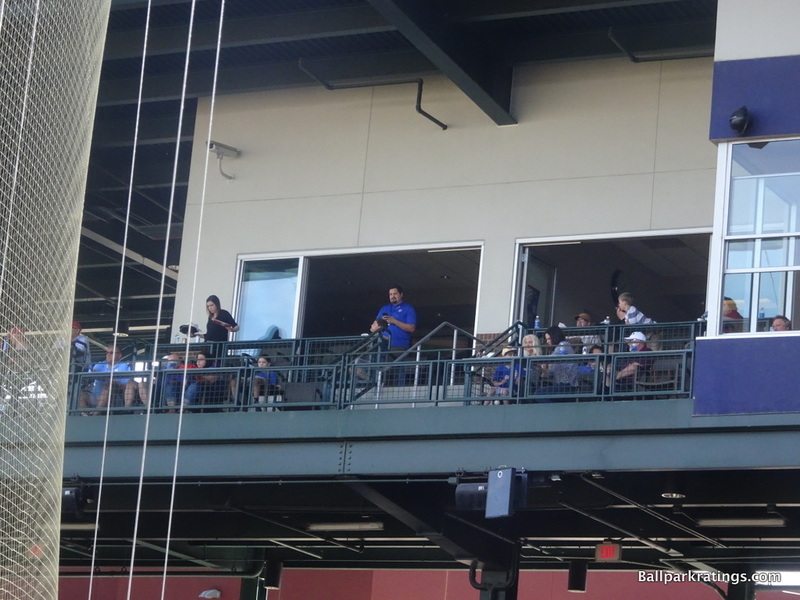 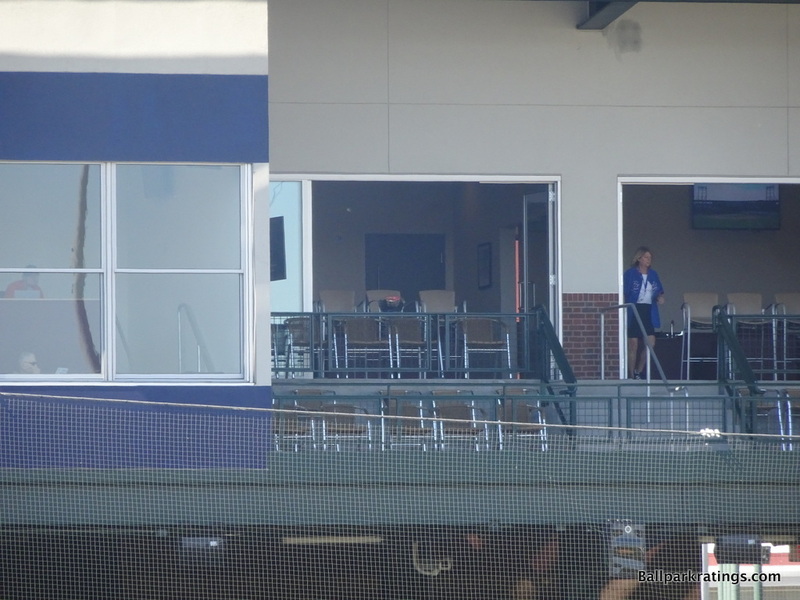 The press box consists of a similar ecru color seen at Wrigley. 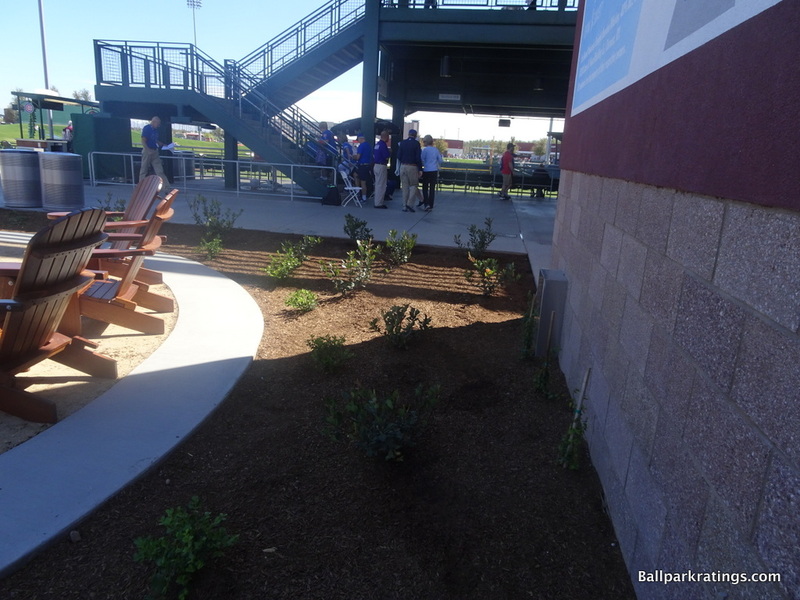 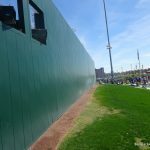 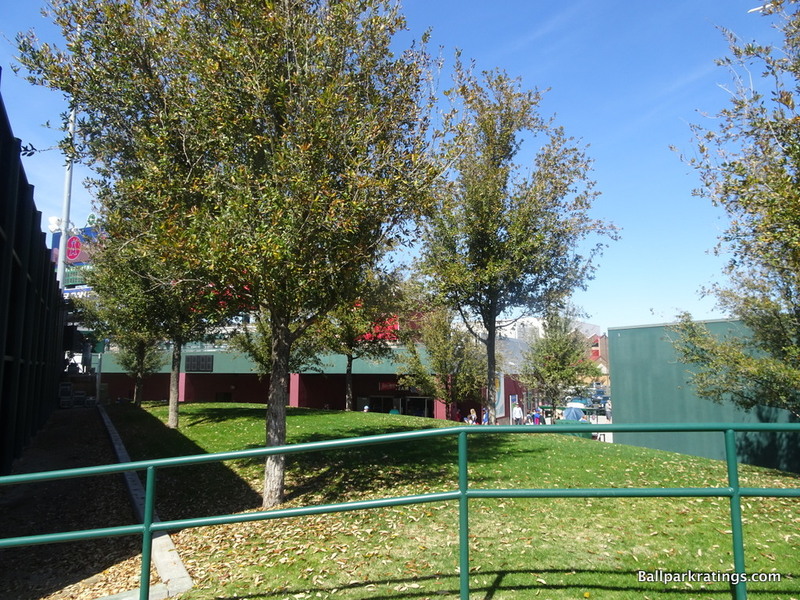 Sloan Park doesn’t have ivy hanging from the outfield walls, but the completely continuous outfield berm has a similar effect. 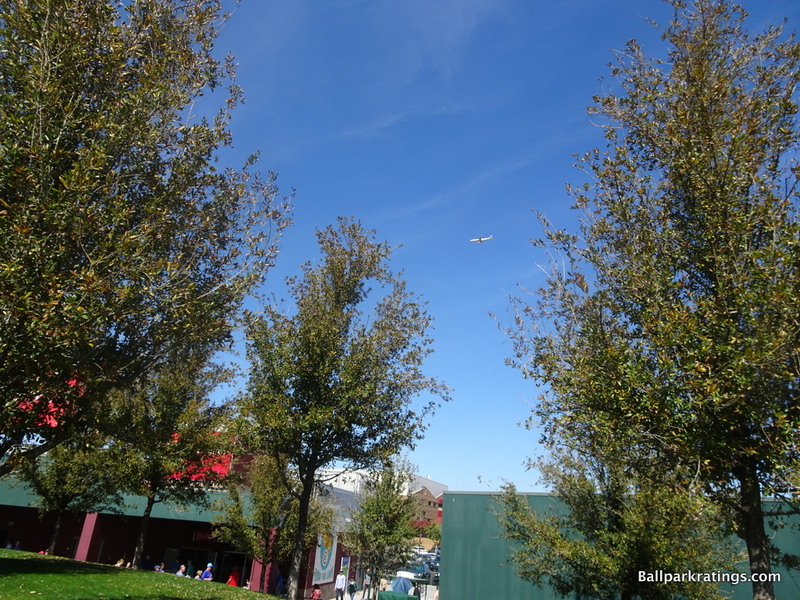 Beautiful mountain views linger in the background. 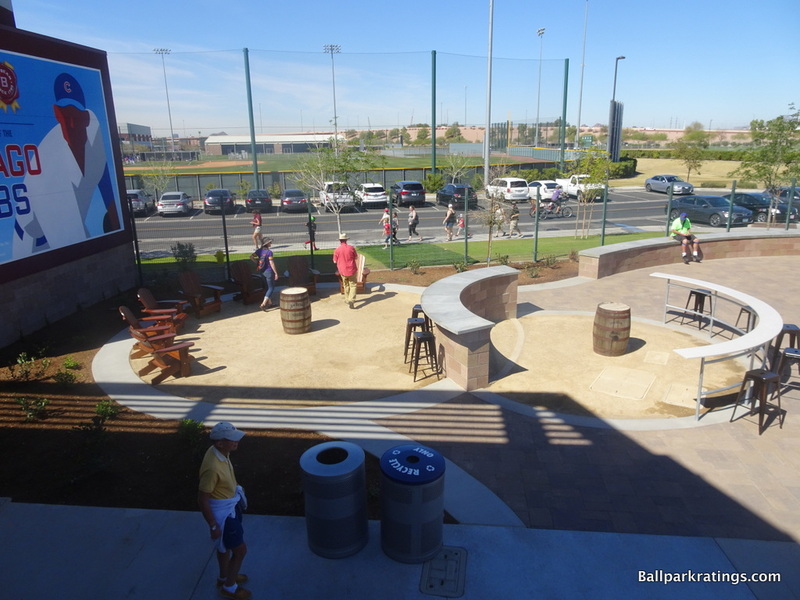 Sloan Park is bursting with ballpark personality and distinctive design cues. 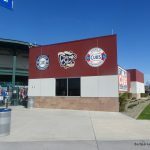 On the outside, painted emblems show the evolution of Cubs logos. 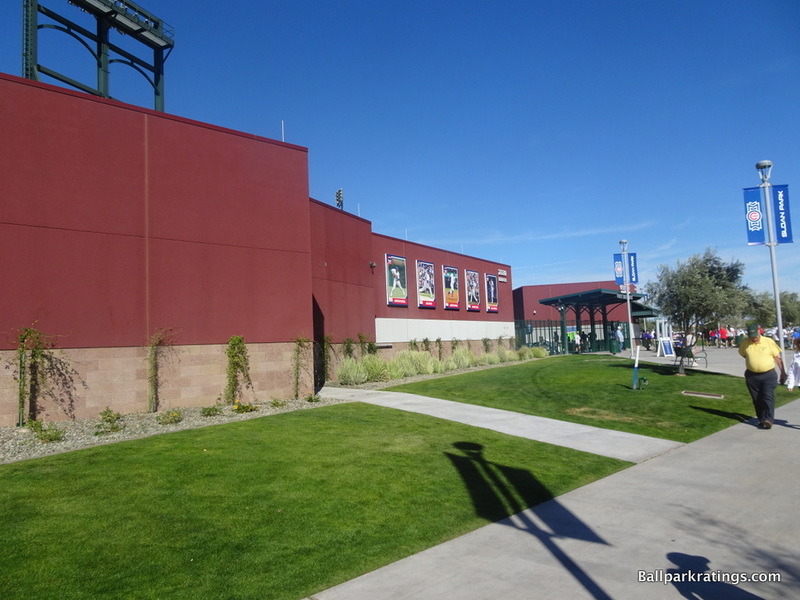 Team murals and other paintings also adorn the façade. 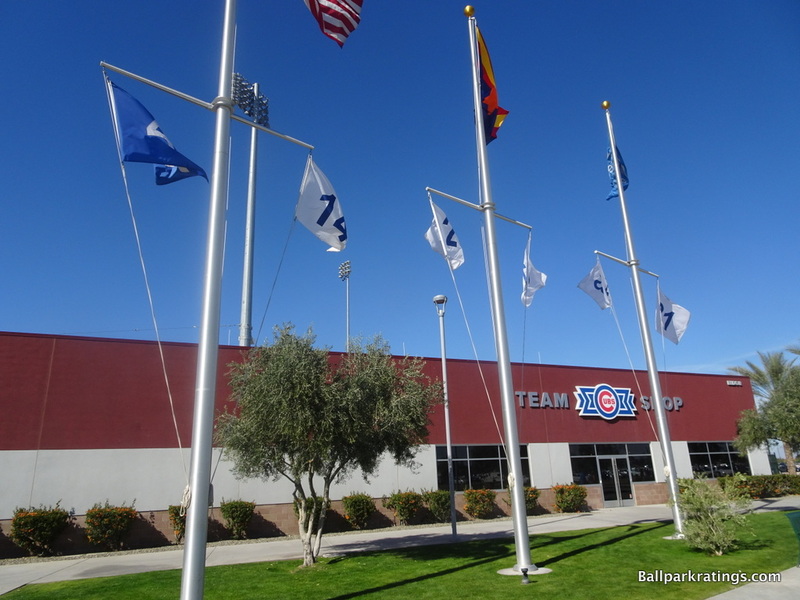 Championship flags and retired numbers hang from light poles outside the park. 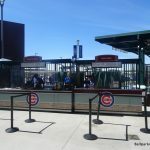 Streets are named after those surrounding Wrigley (Clark, Waveland, and Sheffield). 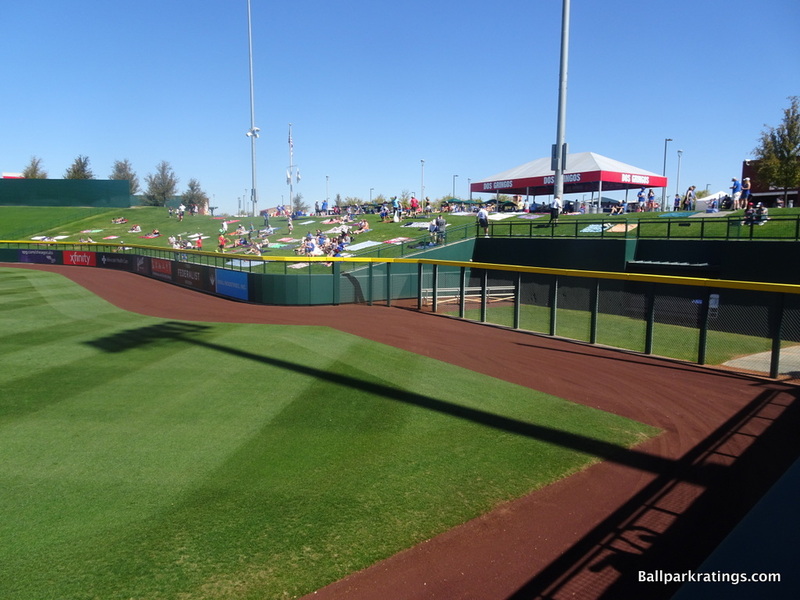 On the inside, the grade of the berm is designed to match that of Wrigley’s famous bleachers. 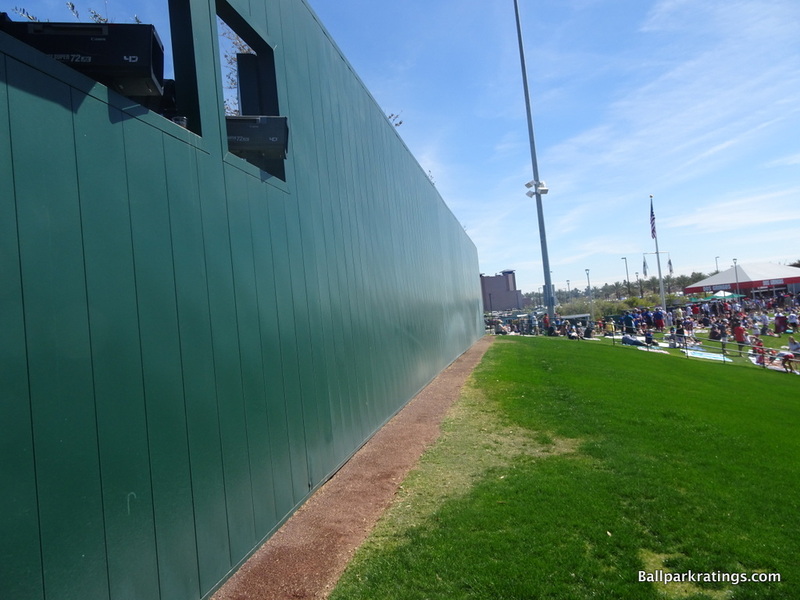 The backstop is red brick just like home, and an old-fashioned analog clock tops the scoreboard. 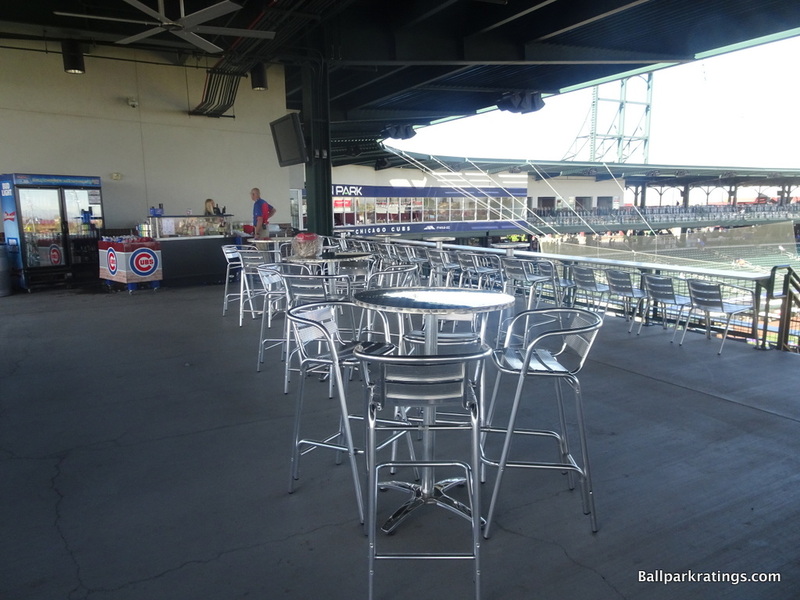 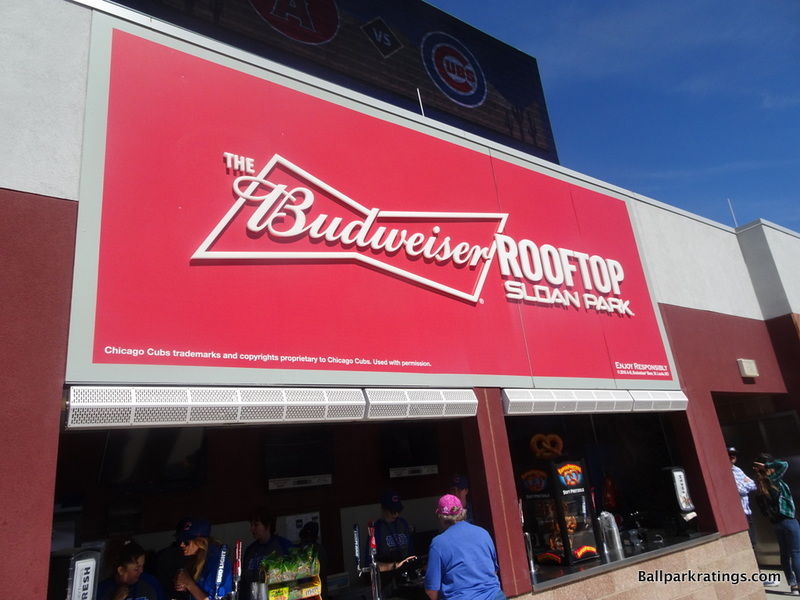 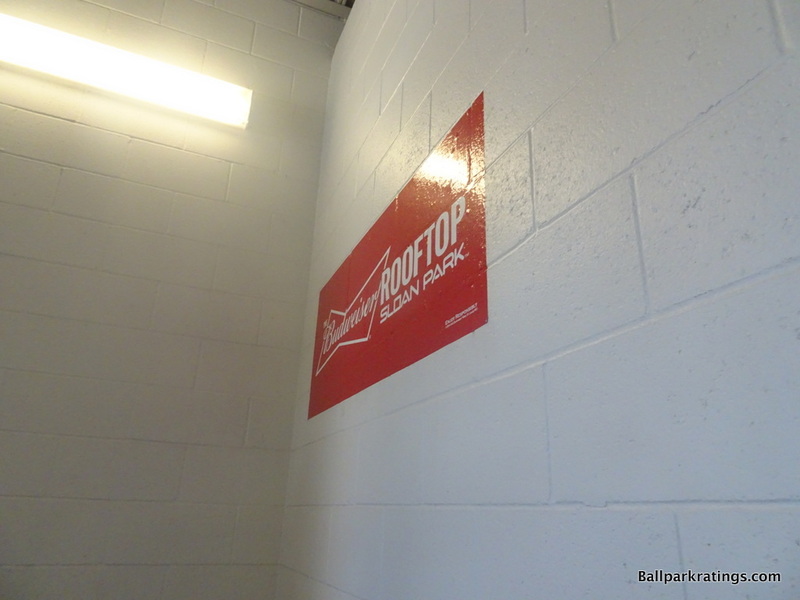 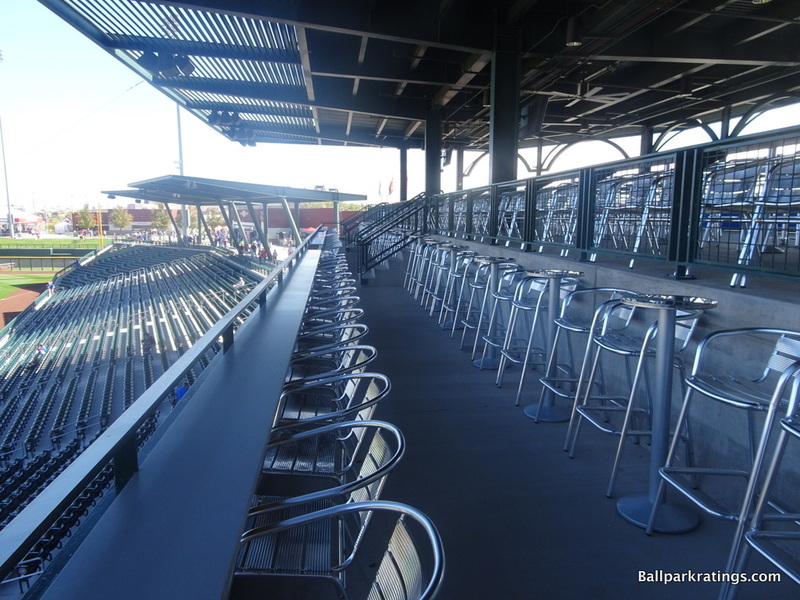 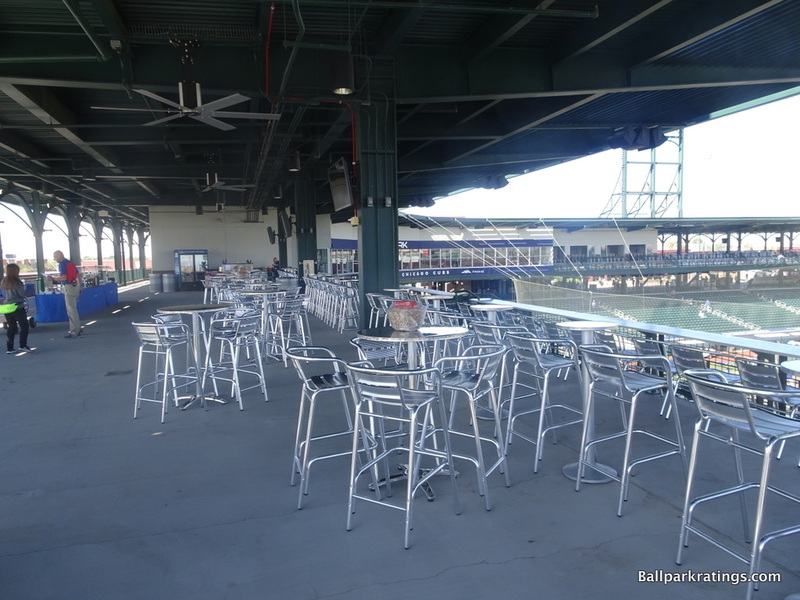 A left field rooftop party deck described below emulates Wrigley’s rooftop bleachers. 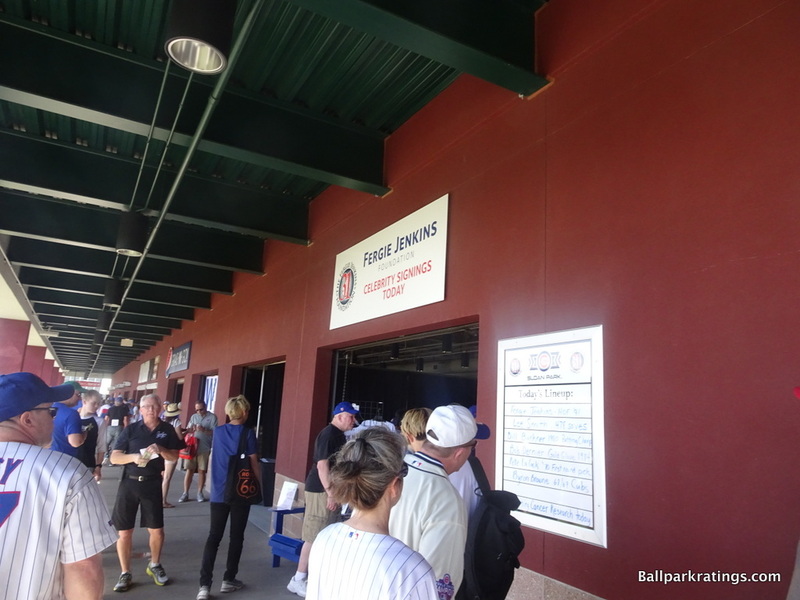 Retired numbers are displayed below the rooftop and classic scoreboards hang from the sides of the grandstands. 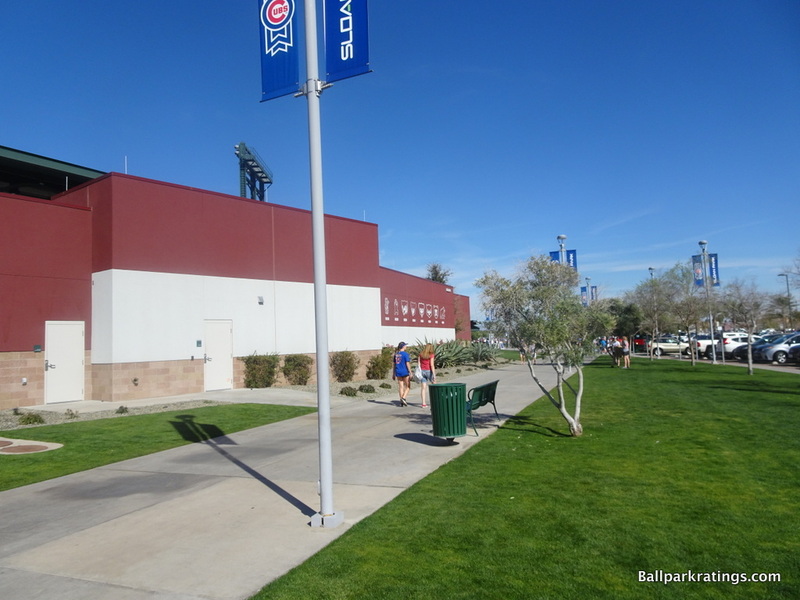 Dimensions are proportional (but not identical due to the Arizona altitude) to the Friendly Confines. 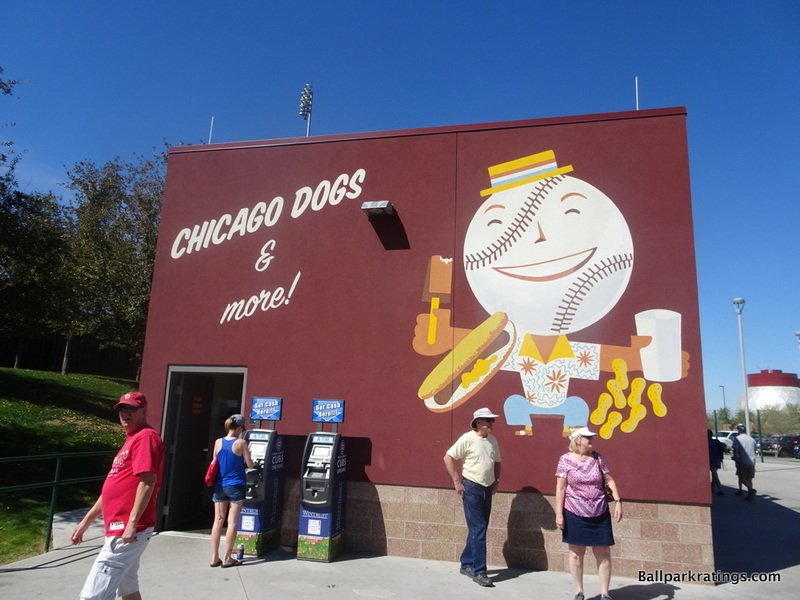 Concessions are given Chicago-related motifs and concourses feature charming painted murals. 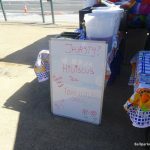 Very endearing. 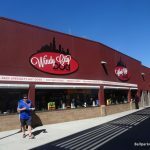 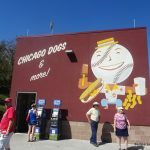 The biggest attraction is a replica of the iconic Wrigley Field marquee located on the main concourse down the right field line. 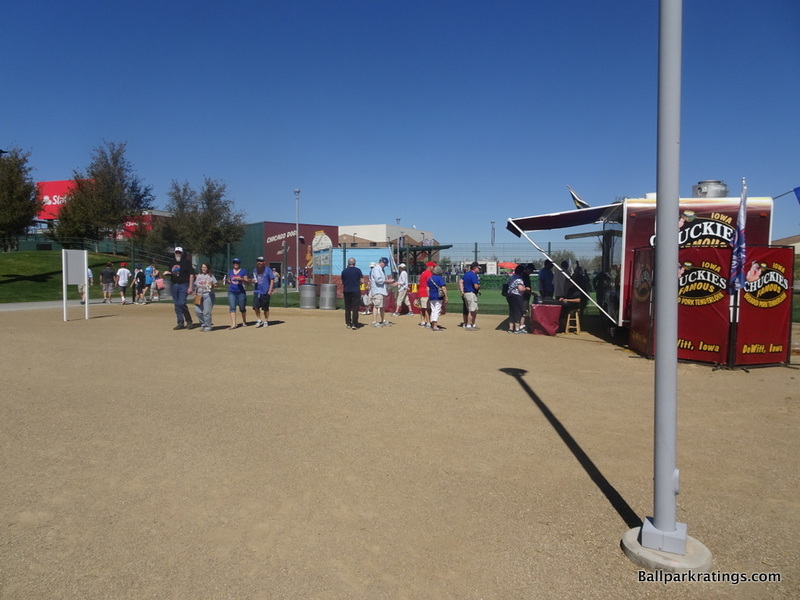 Be prepared to wait in line, but fans can put a personalized message on the marquee free of charge. 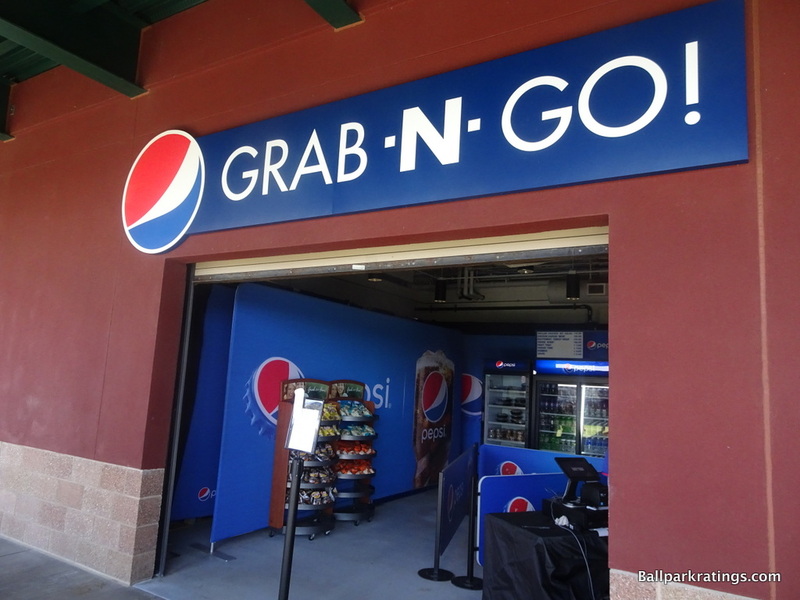 Phenomenal touch. 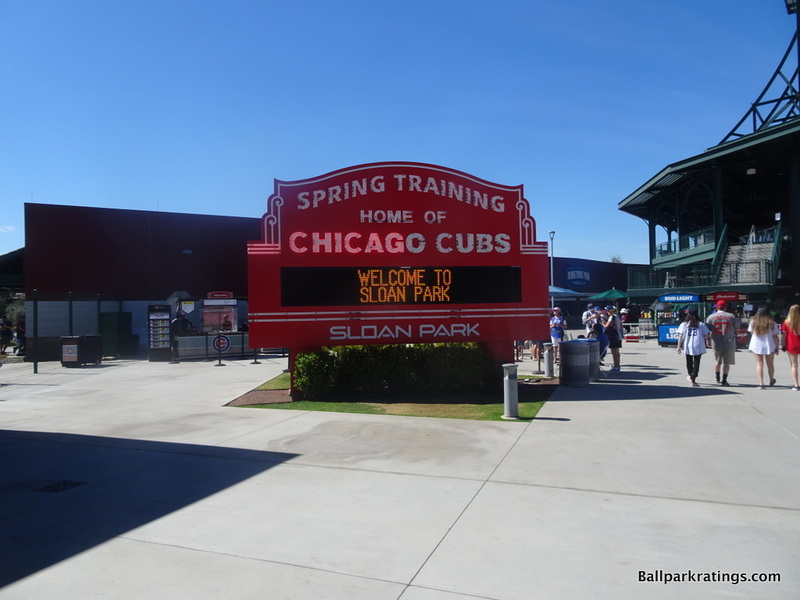 The marquee resembling the one from Wrigley Field. 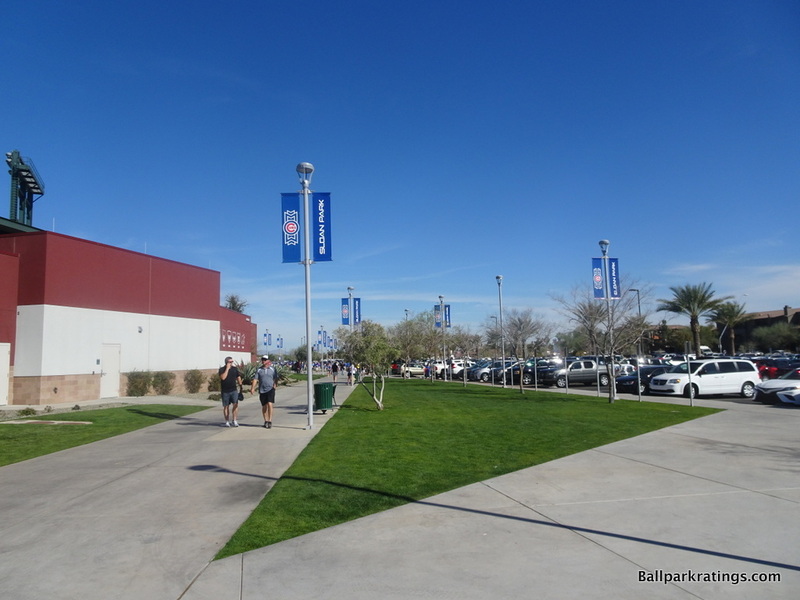 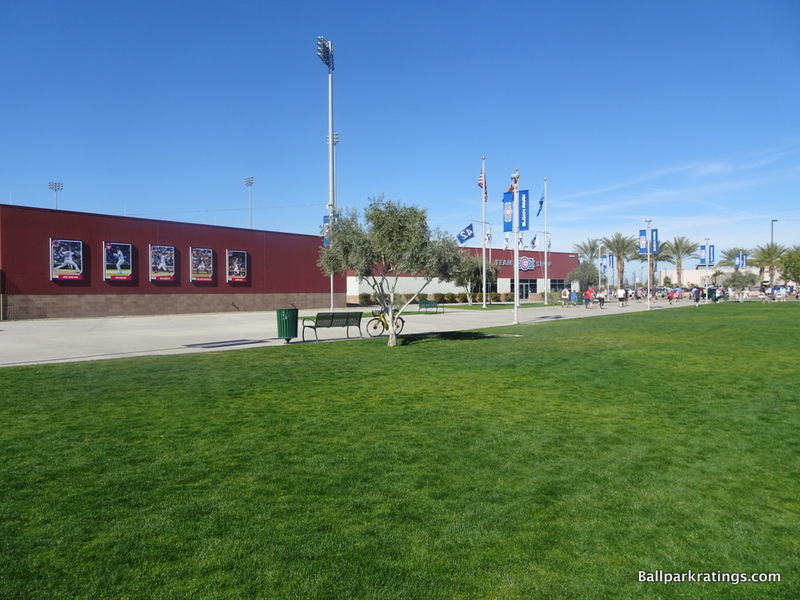 Built in the image of the other new shiny Cactus League facilities, Sloan Park is a mostly functional venue. 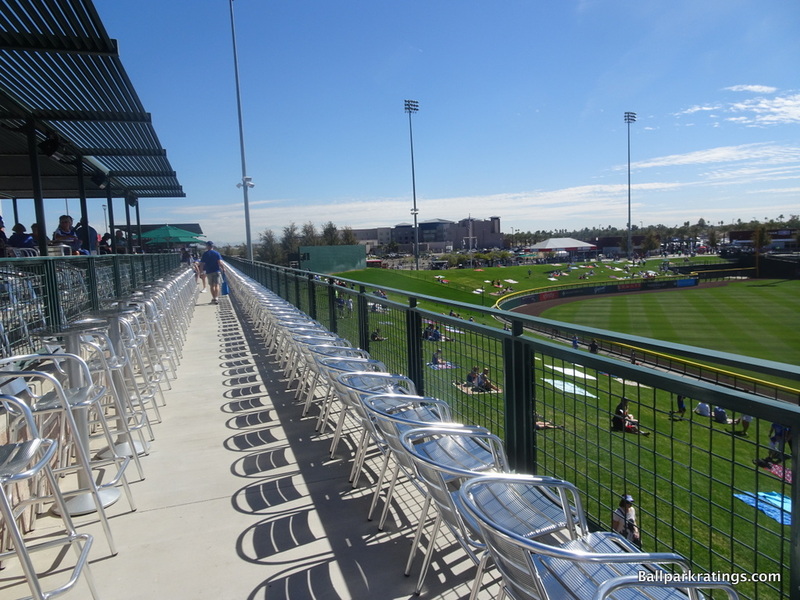 The sightlines aren’t quite as good as those at comparable parks, but they are fine. 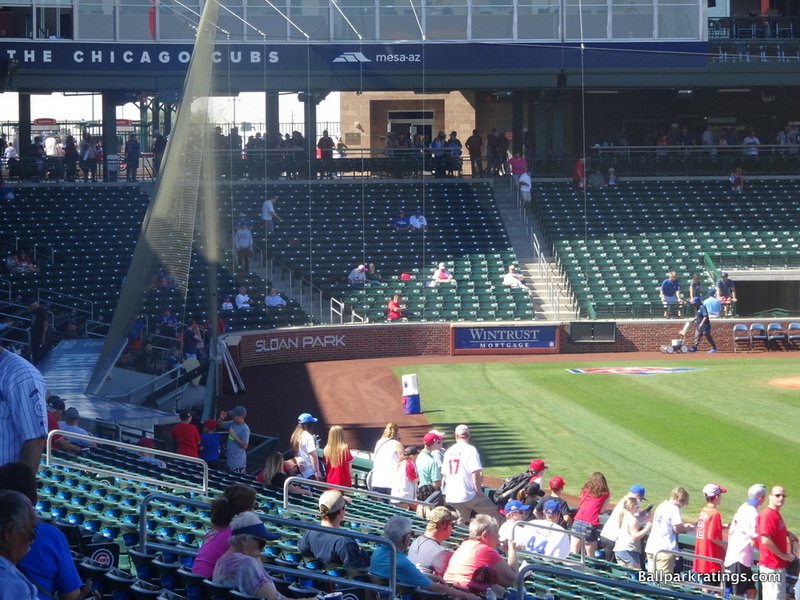 Some angles can be quirky due to the desire to mimic the backstop design of Wrigley, and there’s too much foul territory. 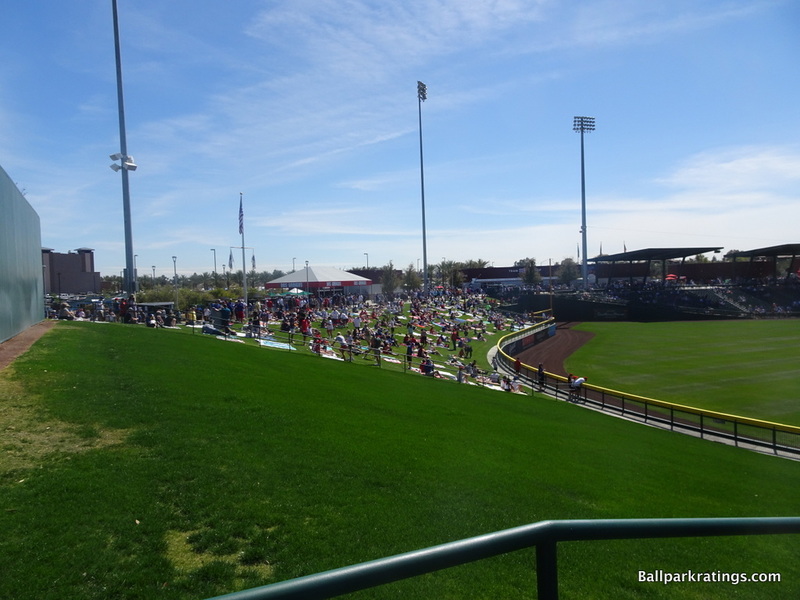 As the largest spring training venue, seating 15,000, Sloan Park still feels pretty intimate. 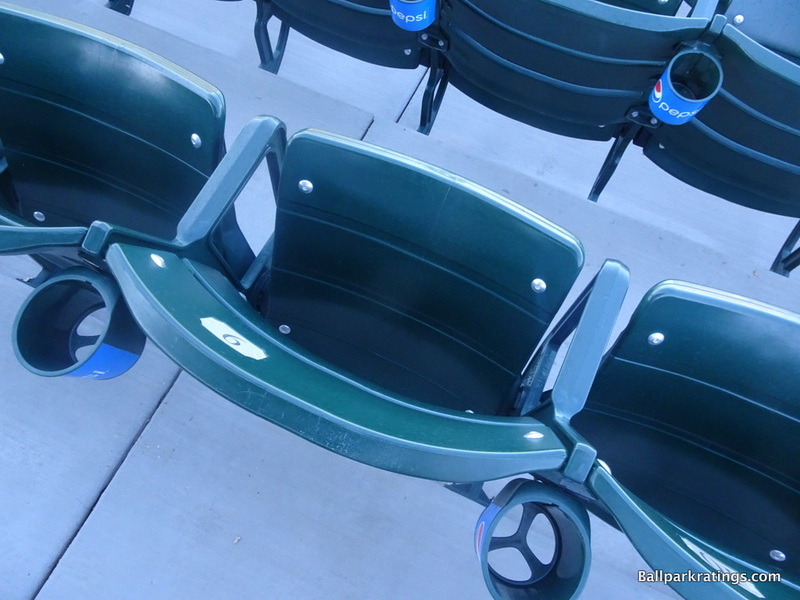 There is no cross-aisle in the seating bowl. 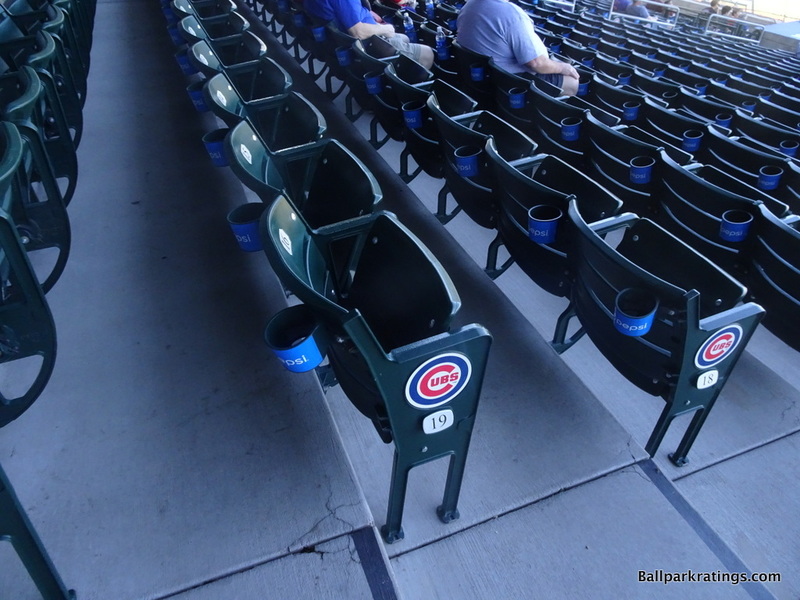 All main grandstand seats fold down and possess cupholders. 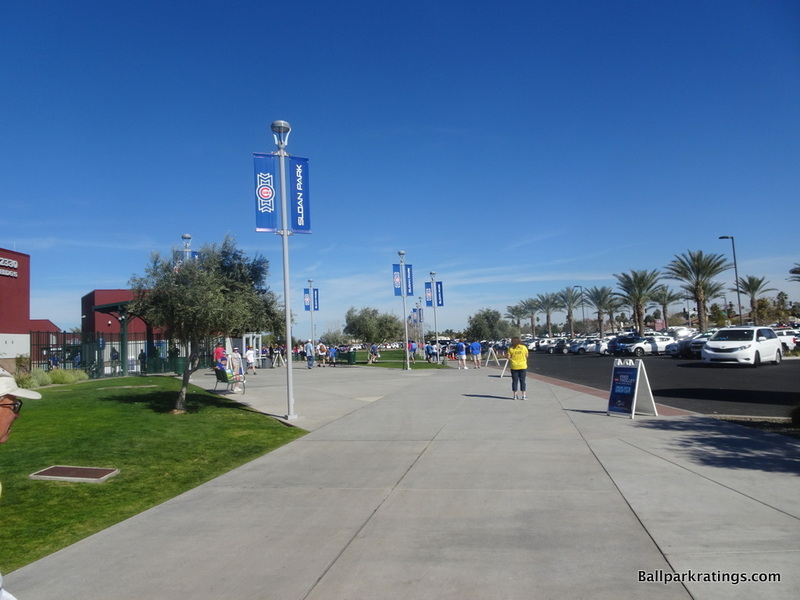 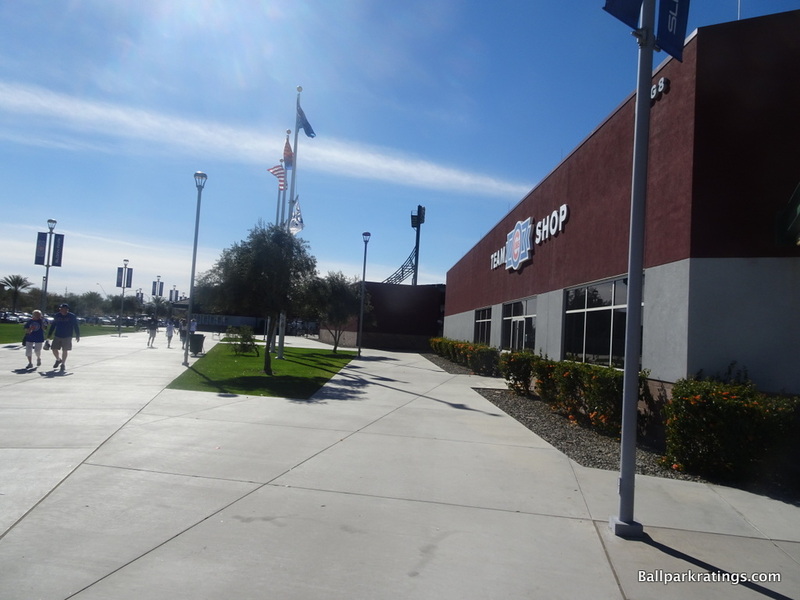 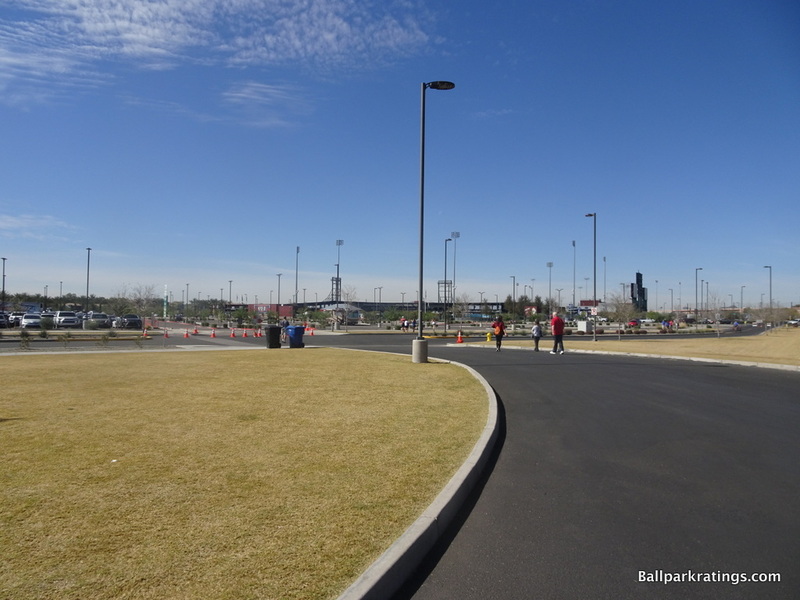 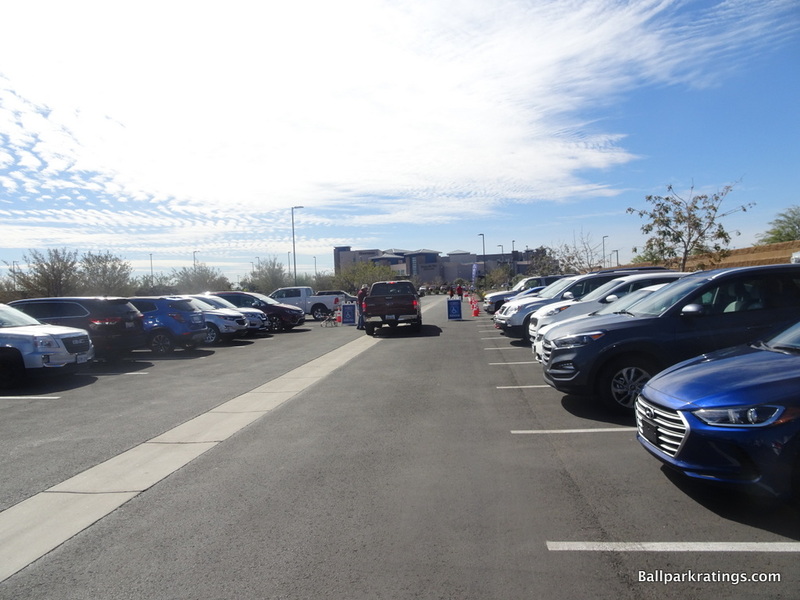 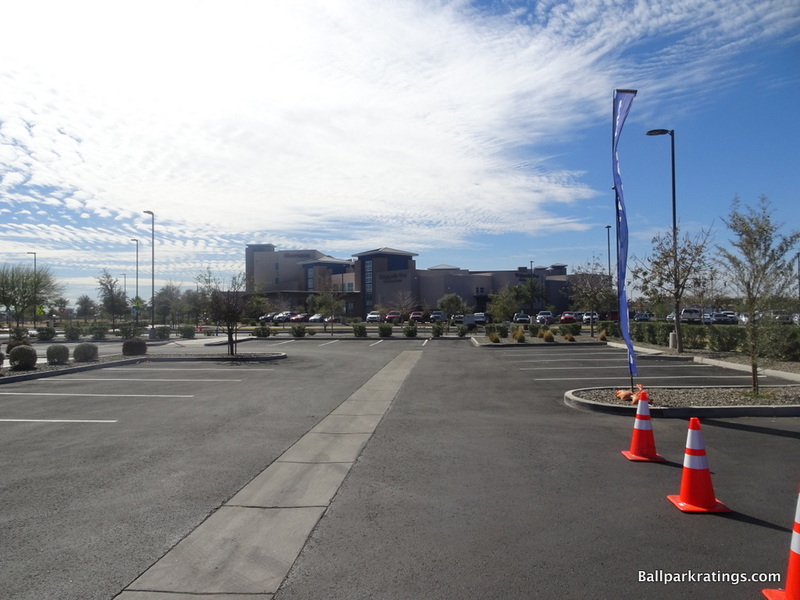 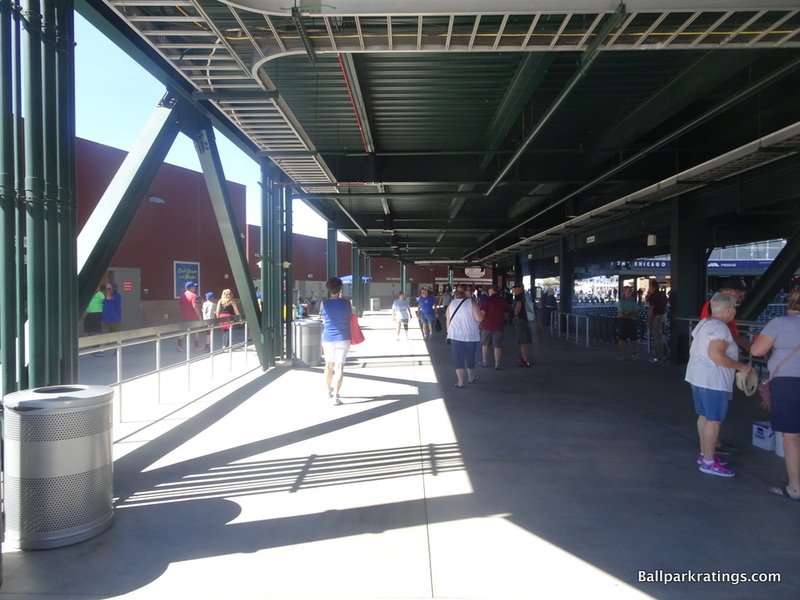 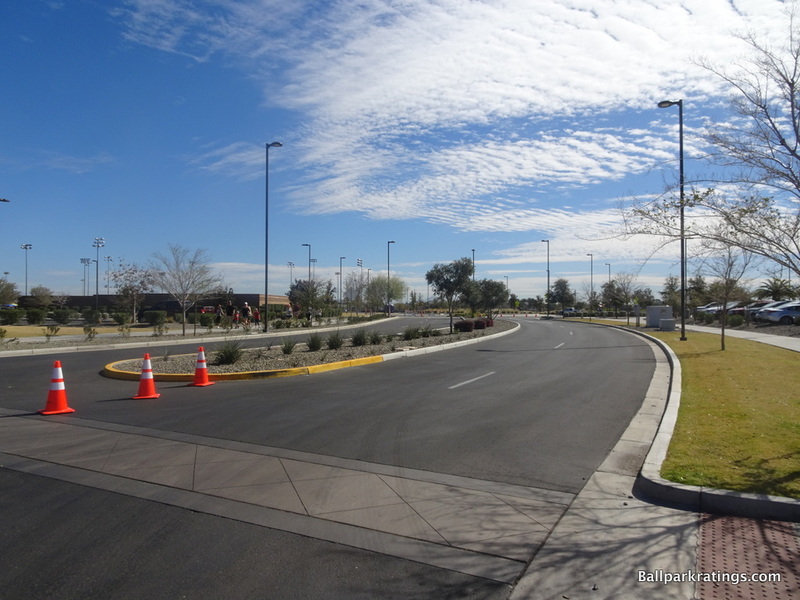 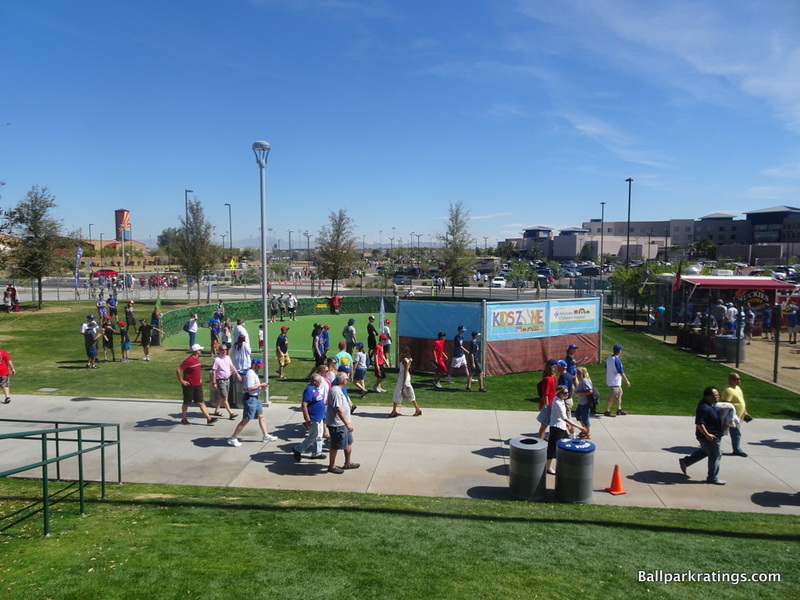 Sloan Park features the now obligatory wide, continuous, 360-degree concourse with sweeping views of the field. 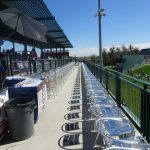 Standing room drink rails back the seating bowl. 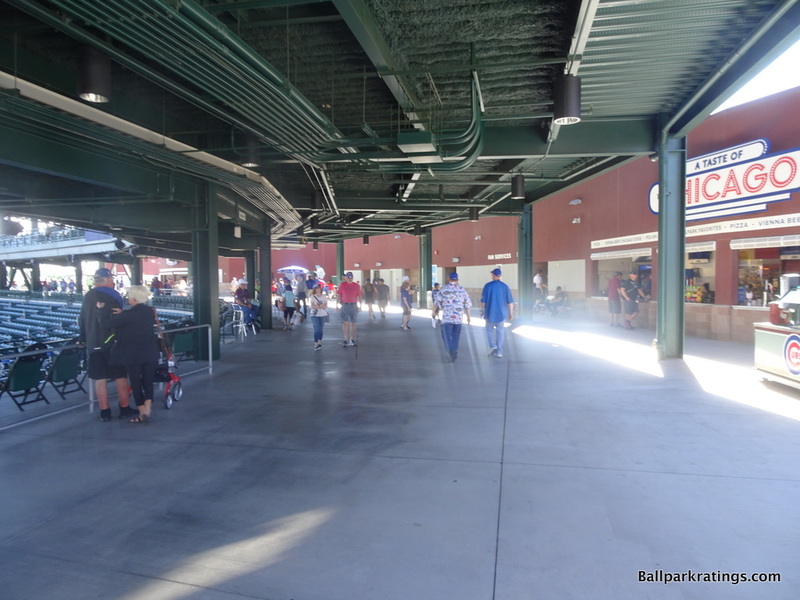 The concourse can get rather crowded due to sellout crowds, but logistically, it is excellent. 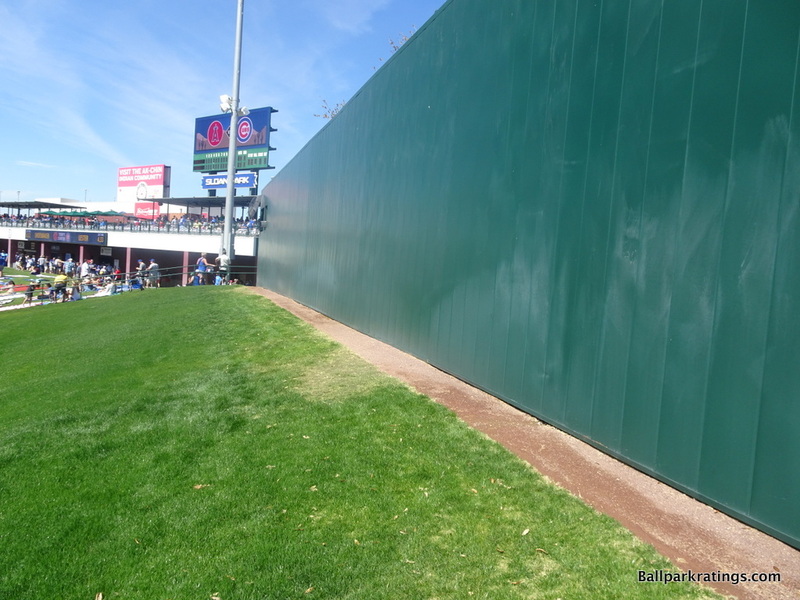 The one blemish is that it gets far too narrow in left field. 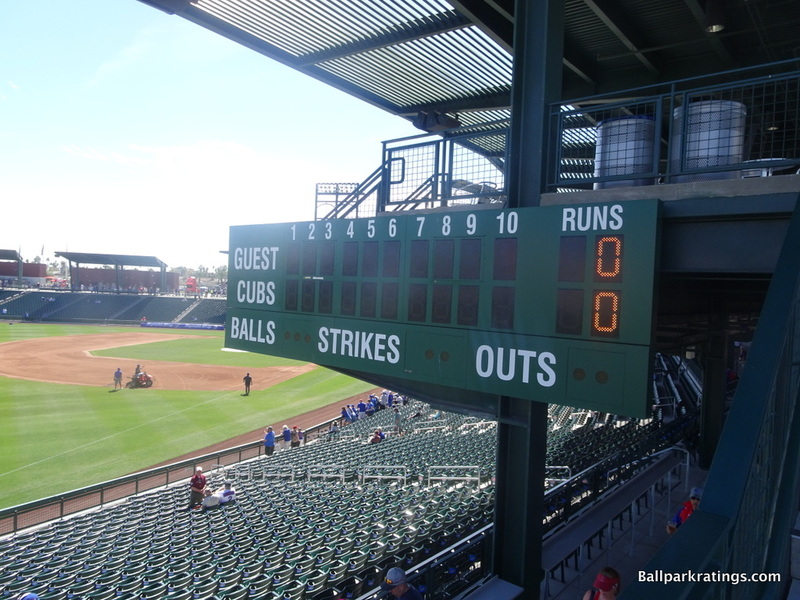 Hovered uncomfortably high above left field and small for the current era, the videoboard is a bit disappointing. 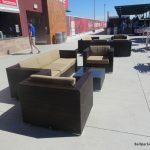 It’s just sufficient. 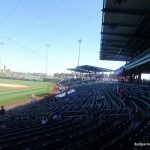 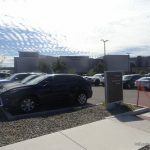 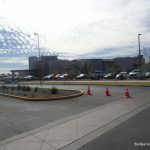 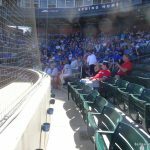 All of this was pretty much expected from a nine-figure complex built to emulate Wrigley Field and functionally match the best of the Cactus League. 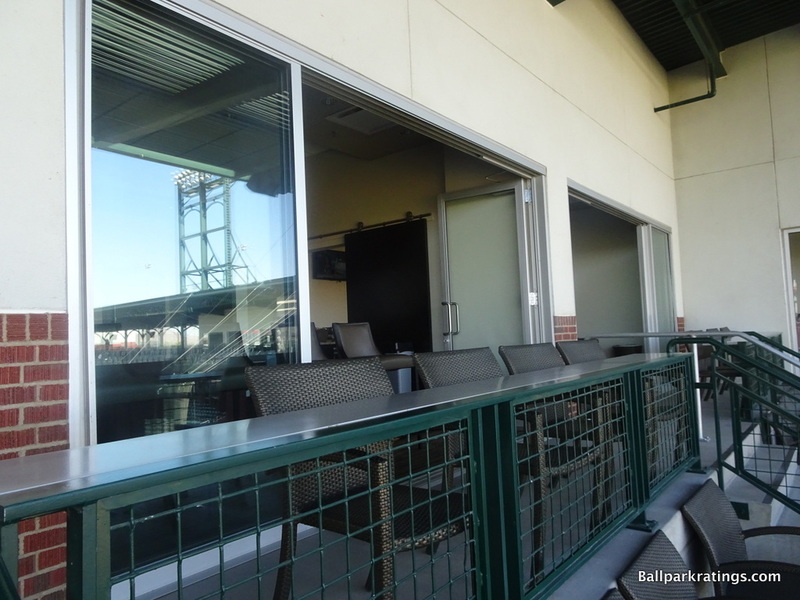 The x-factor would be the amenities. 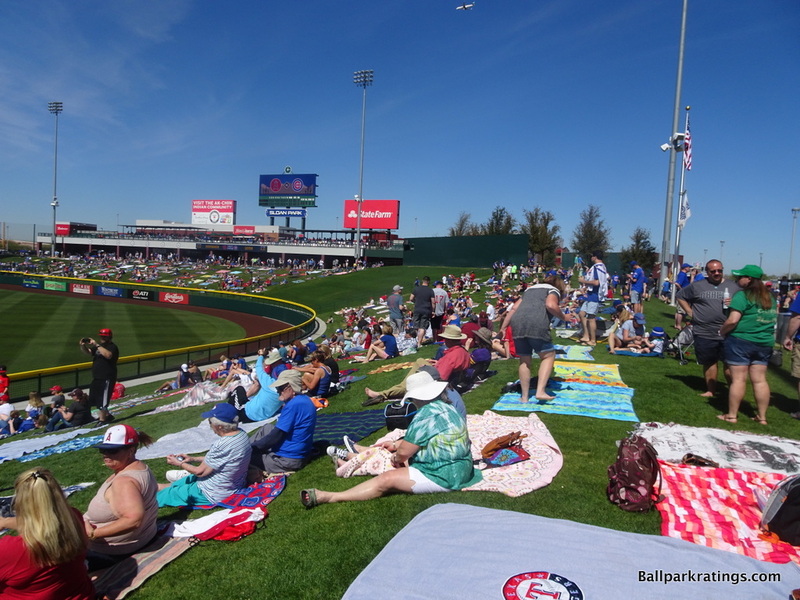 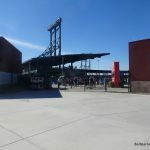 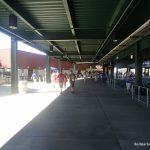 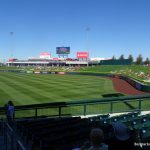 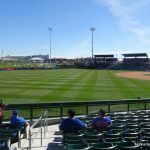 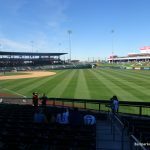 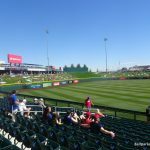 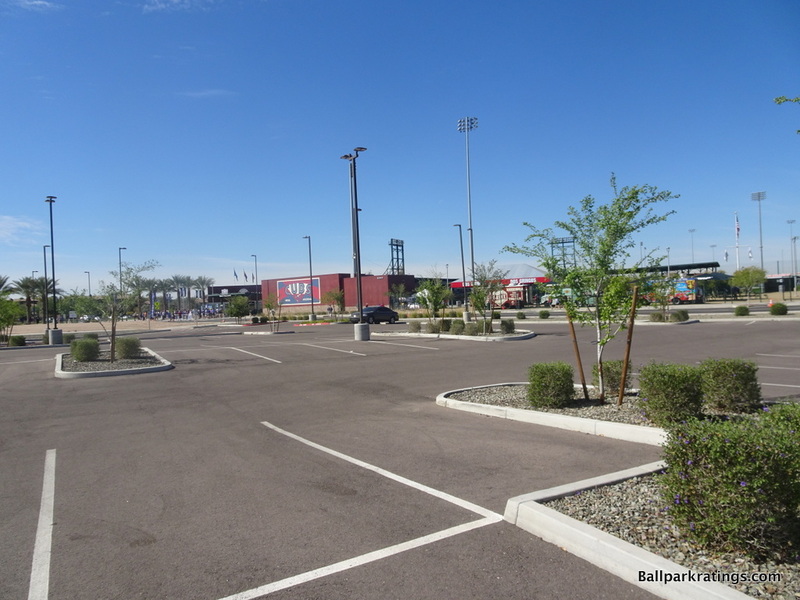 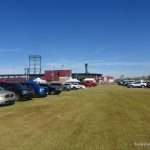 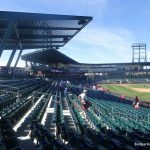 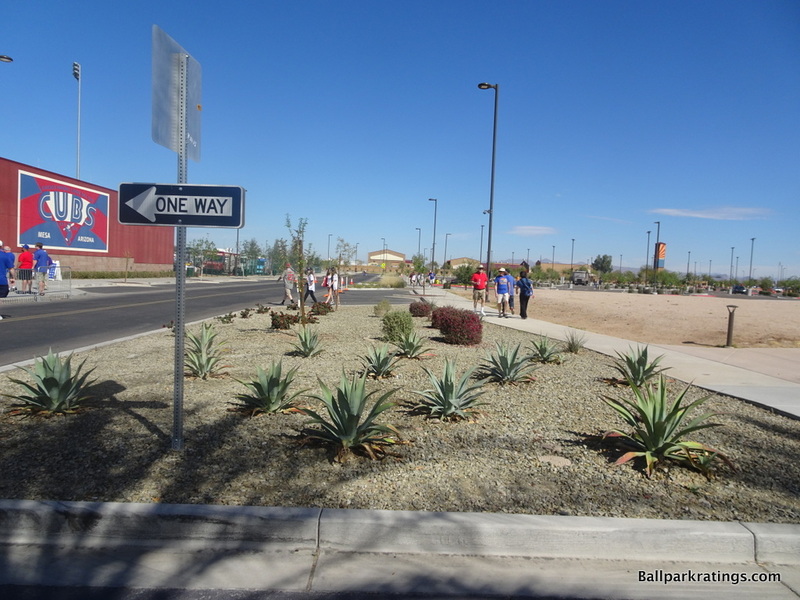 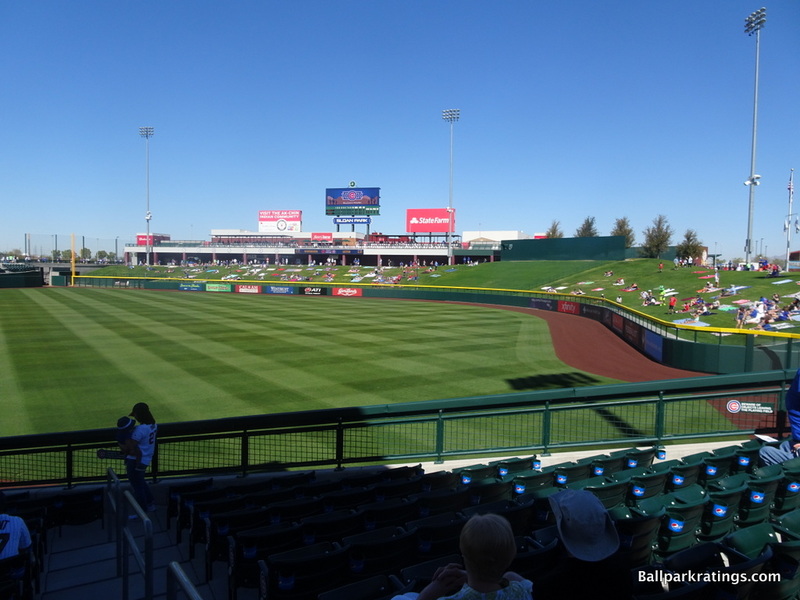 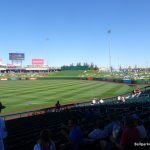 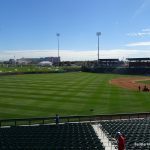 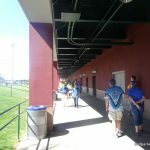 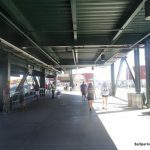 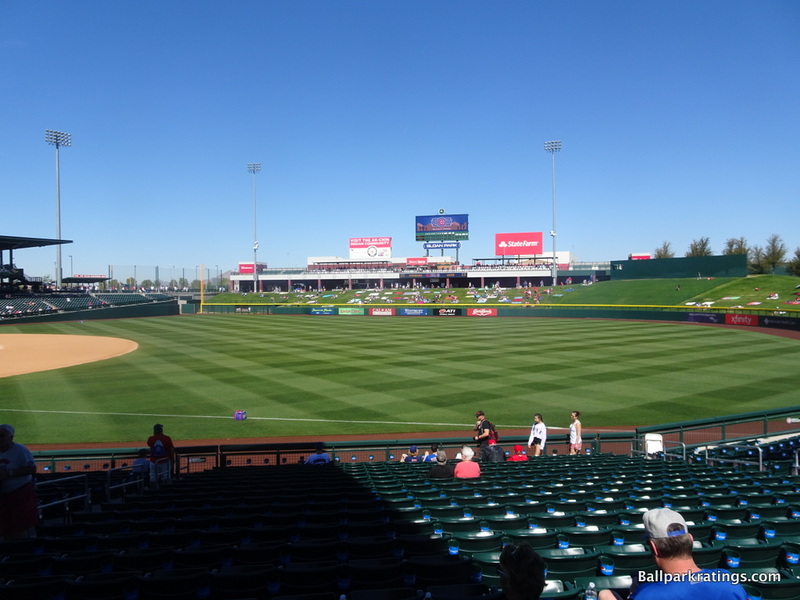 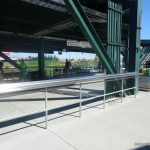 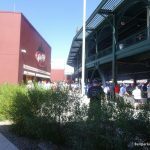 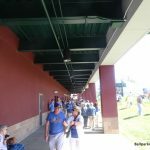 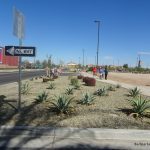 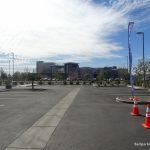 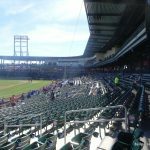 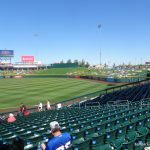 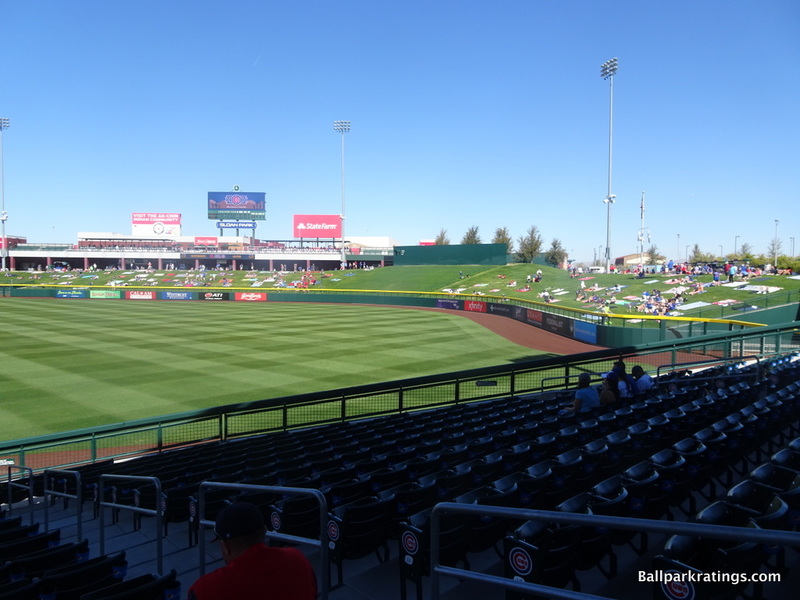 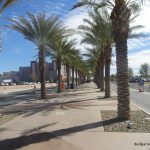 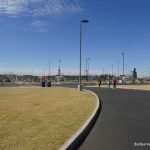 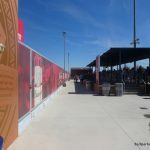 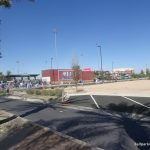 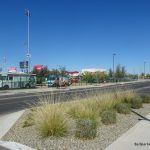 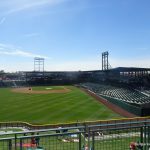 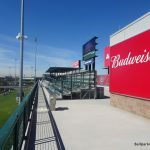 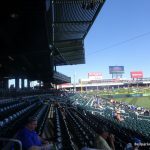 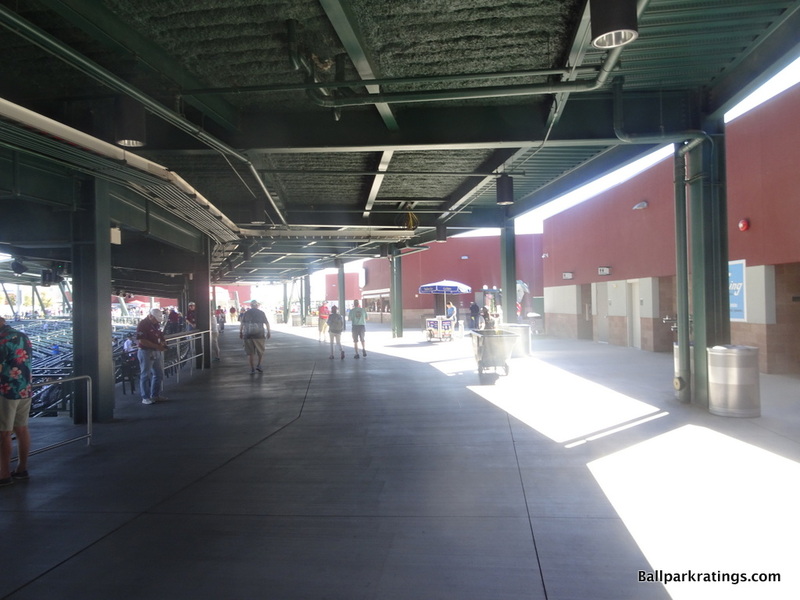 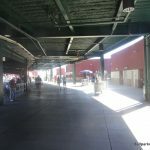 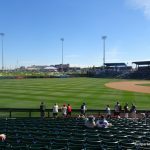 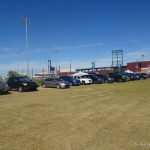 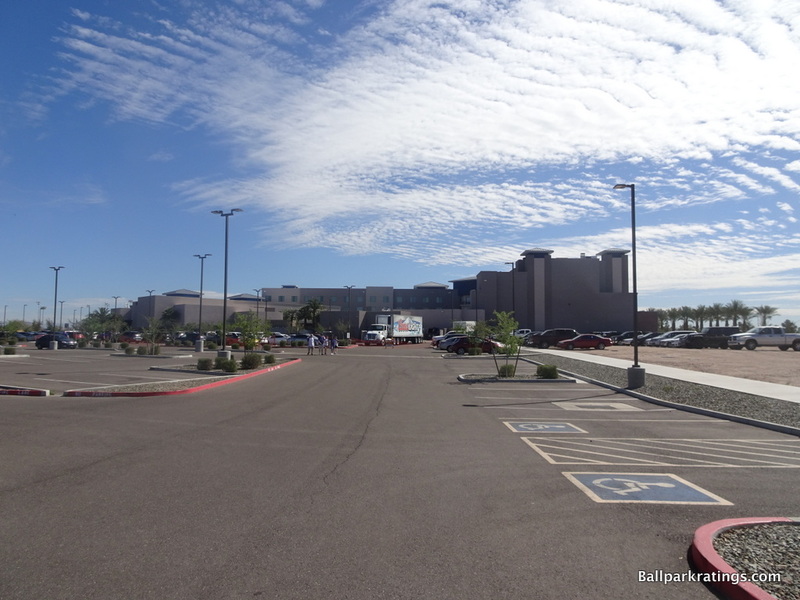 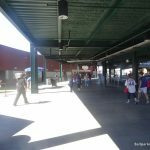 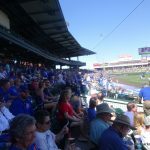 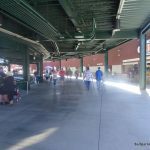 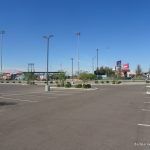 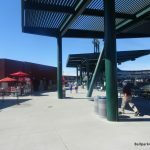 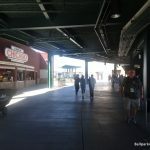 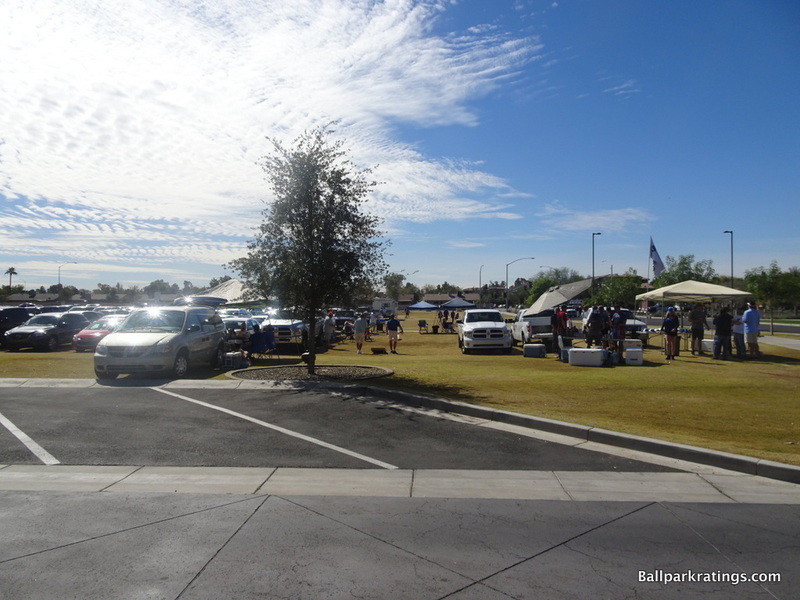 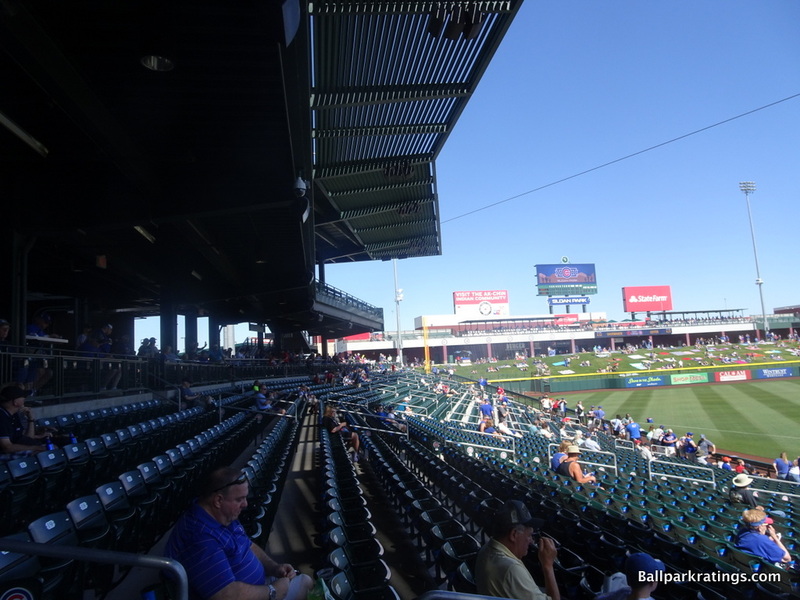 Would Sloan Park go the way of the analogous project JetBlue Park (Red Sox mini-Fenway Park) and assemble a comparatively downscaled scene, or go above and beyond with fan-friendly features like Salt River Fields? 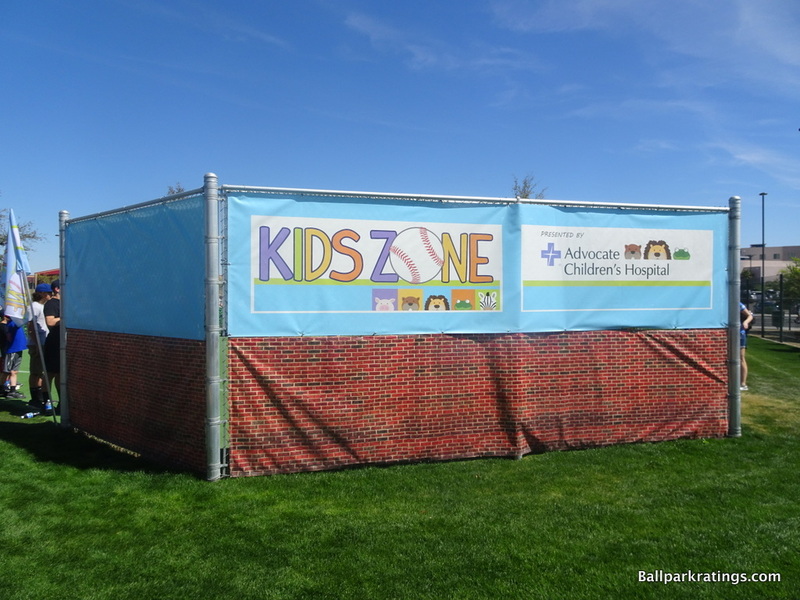 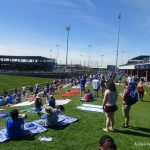 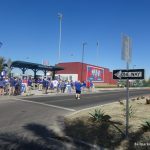 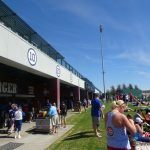 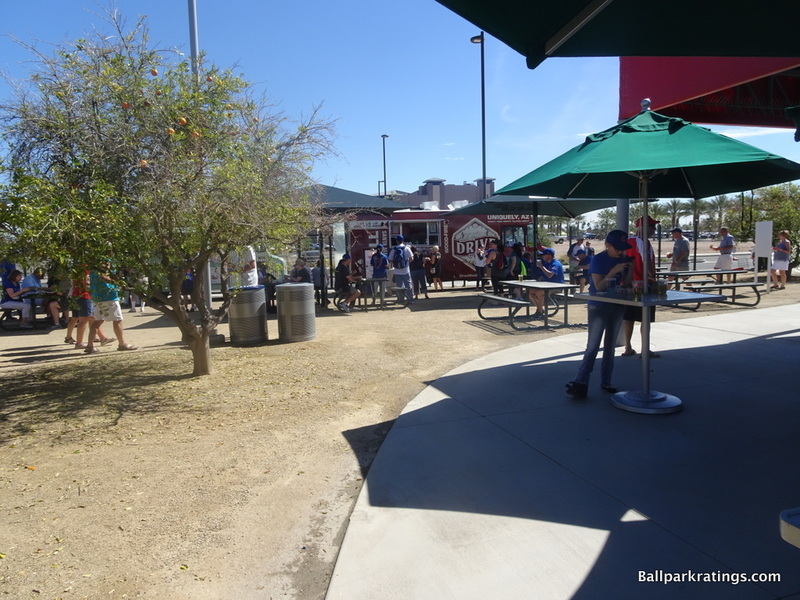 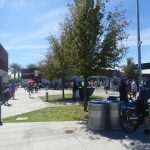 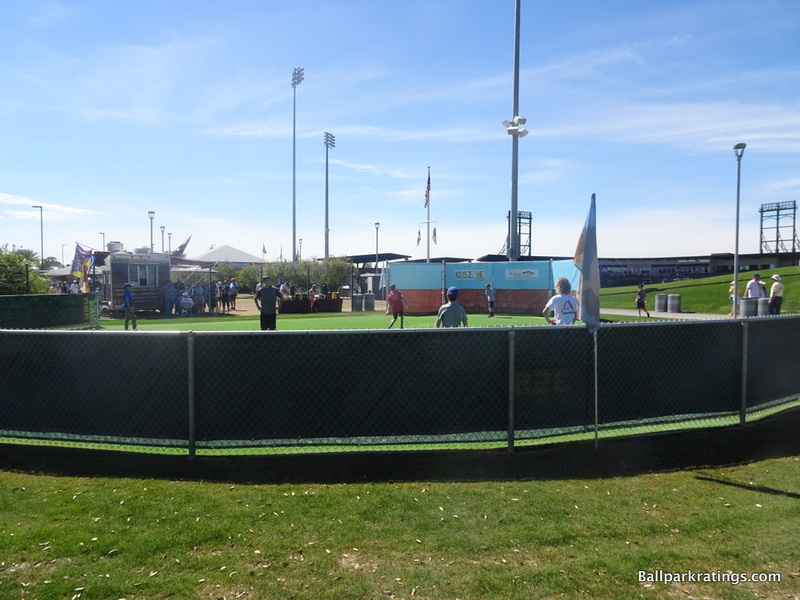 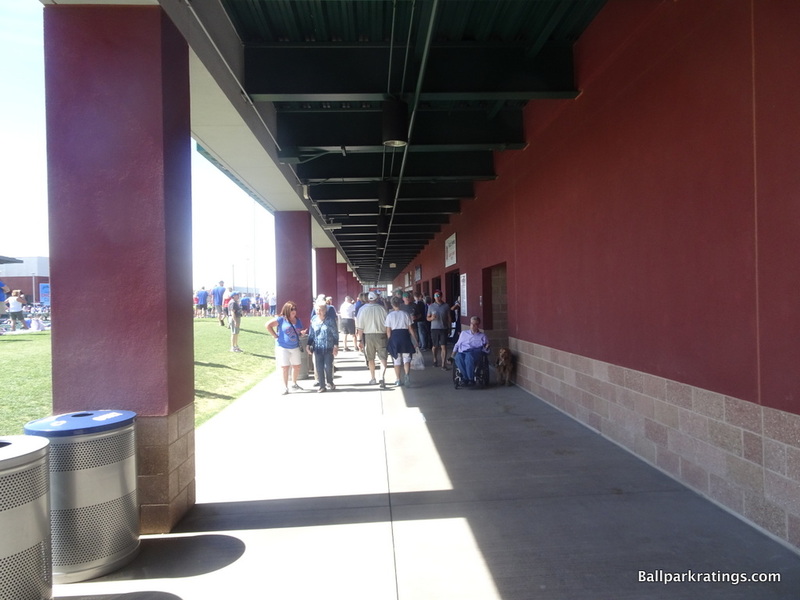 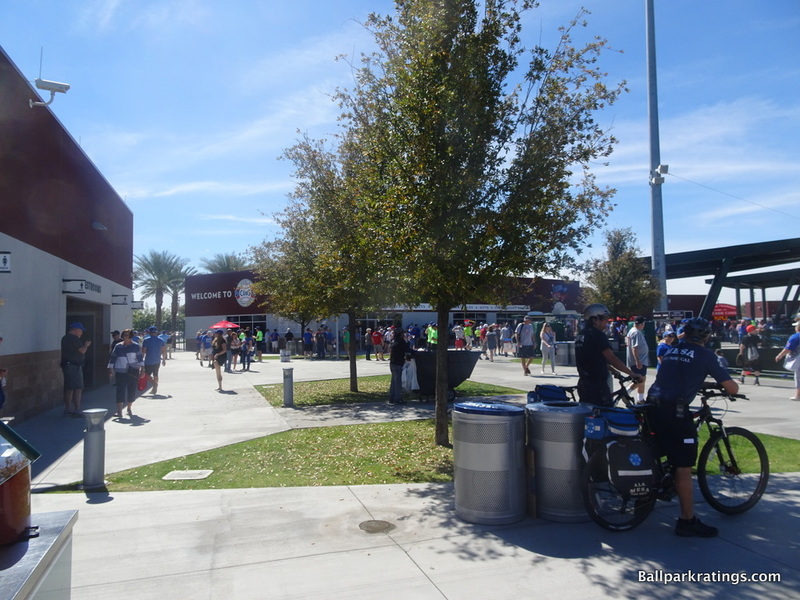 The answer tilts definitively toward the latter, as Sloan Park has some of the most expansive fan amenities in spring training. 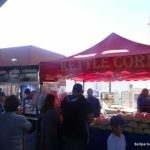 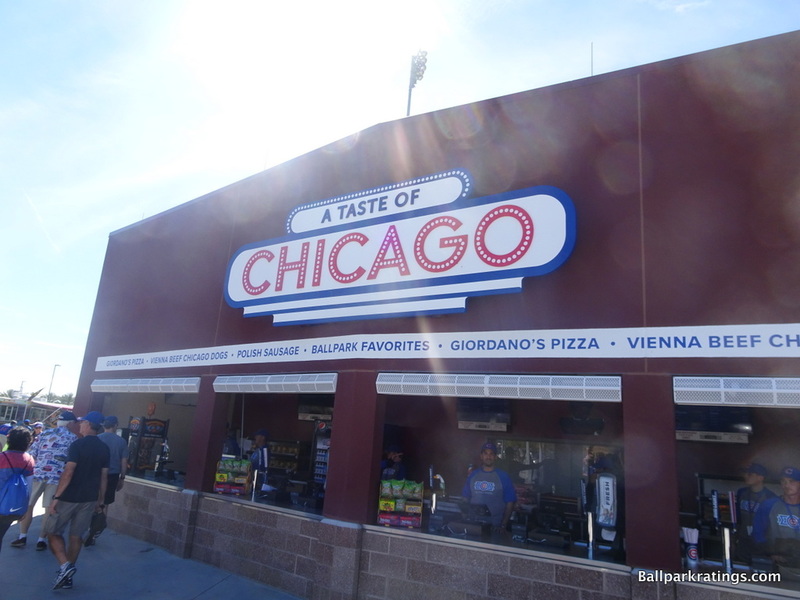 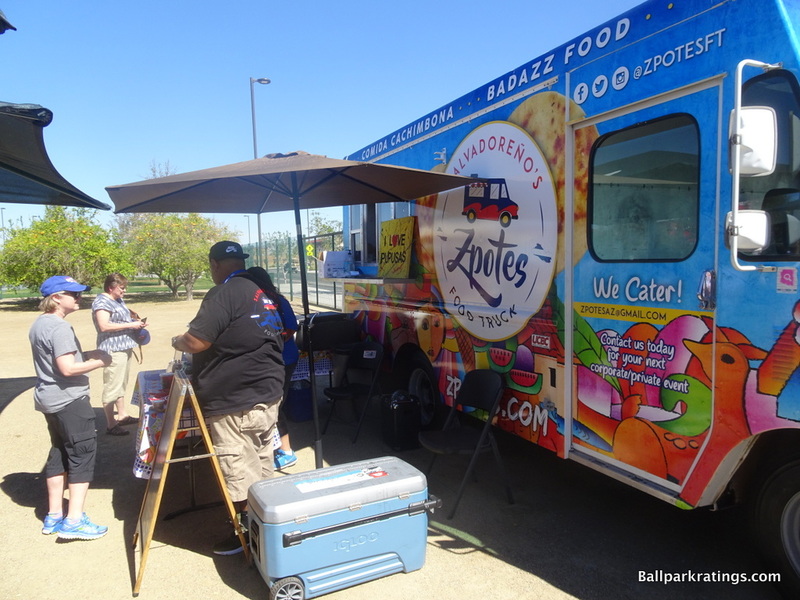 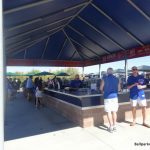 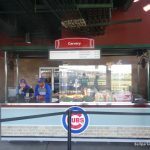 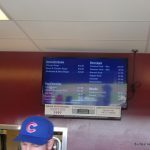 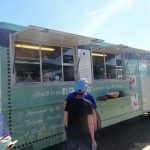 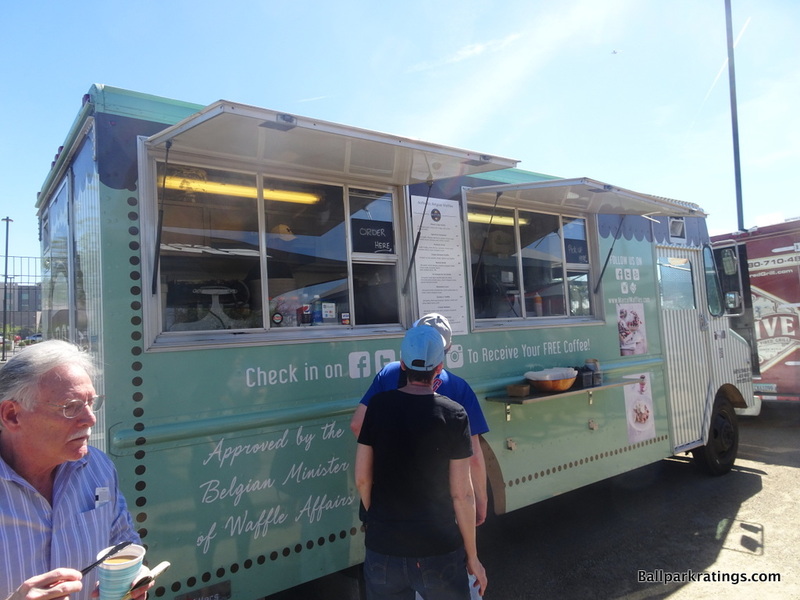 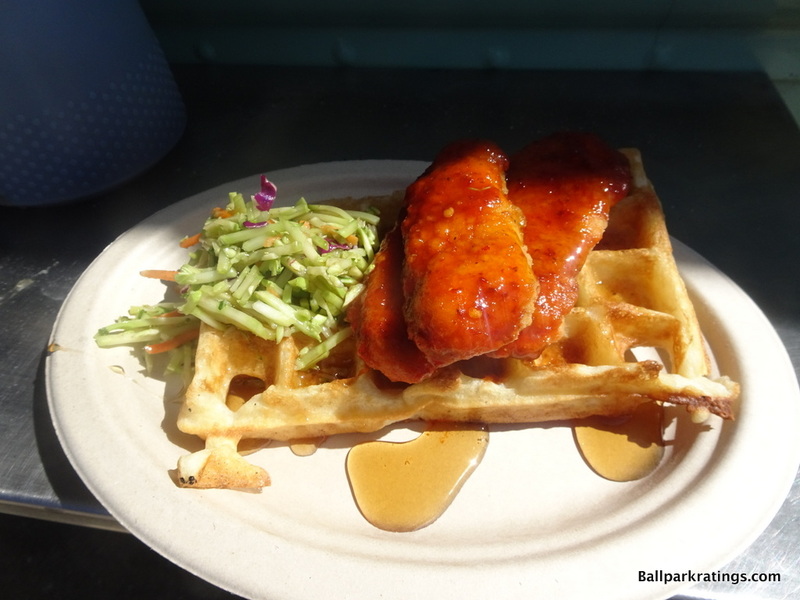 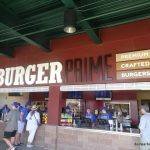 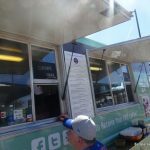 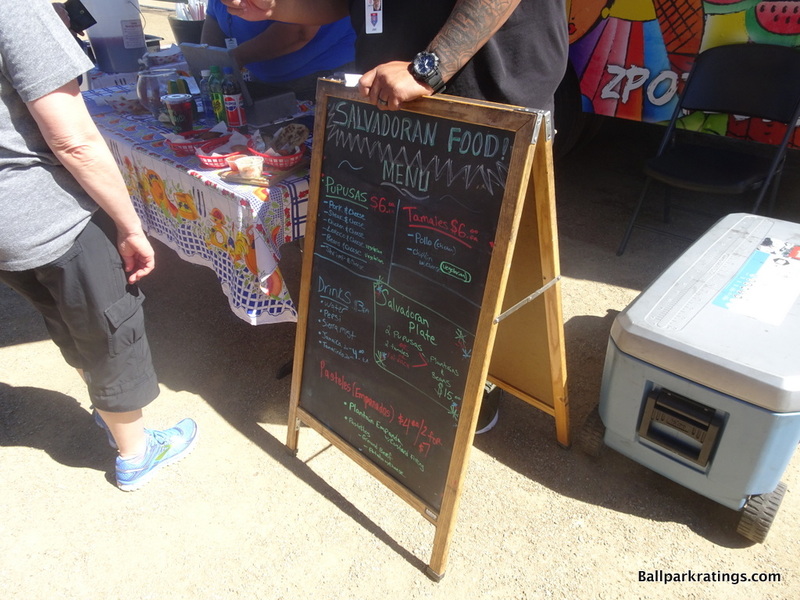 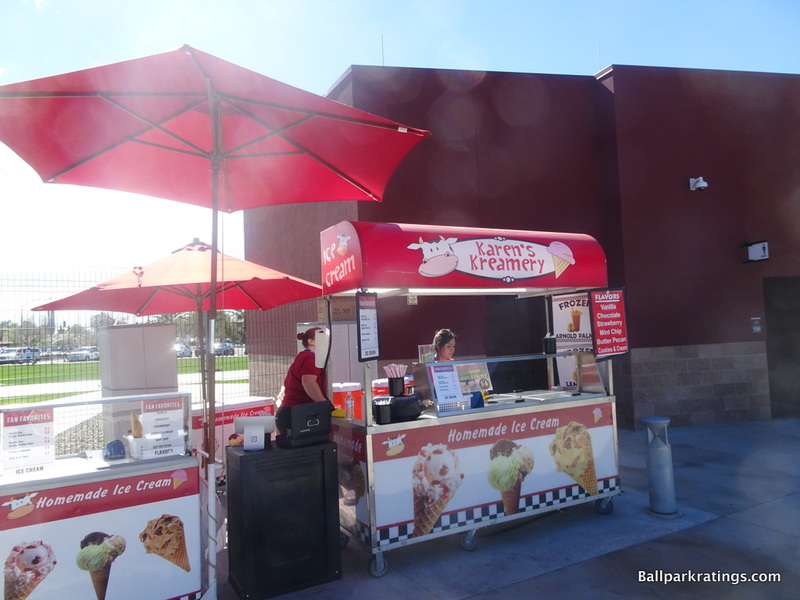 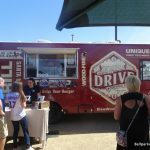 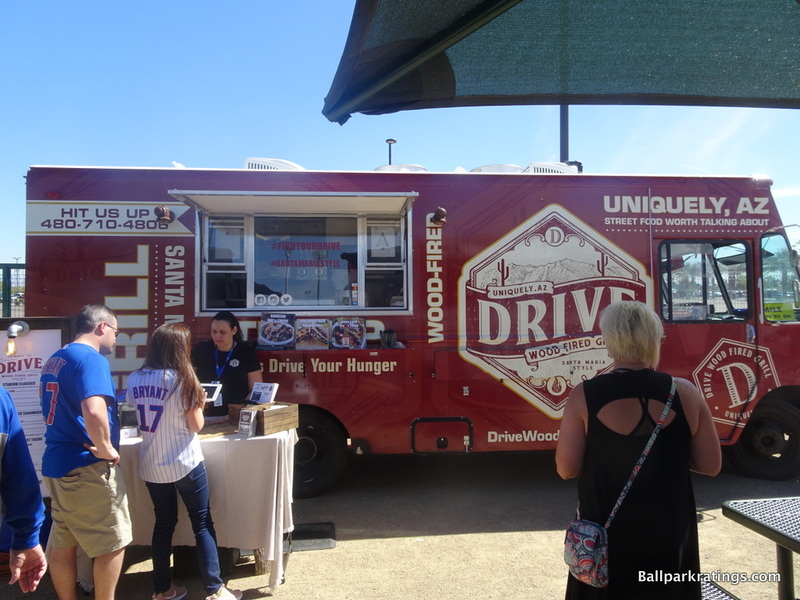 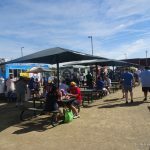 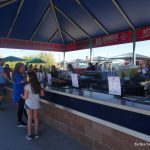 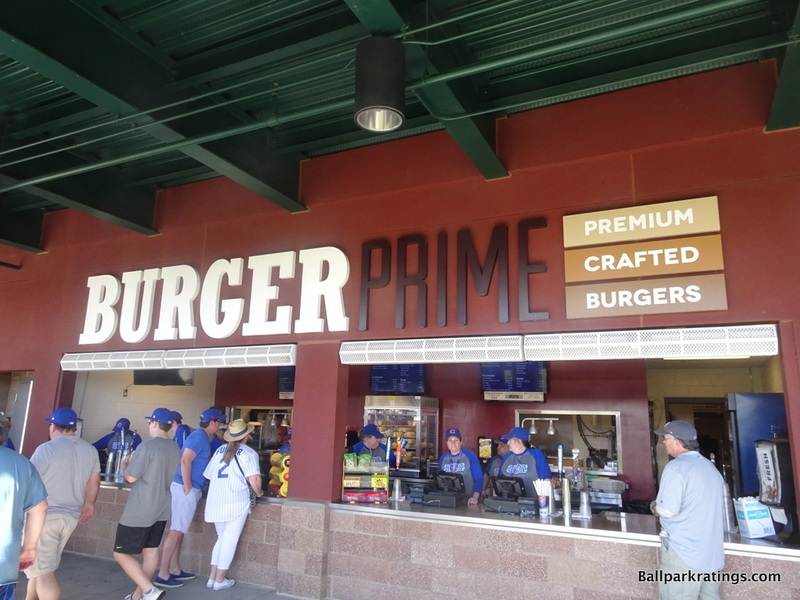 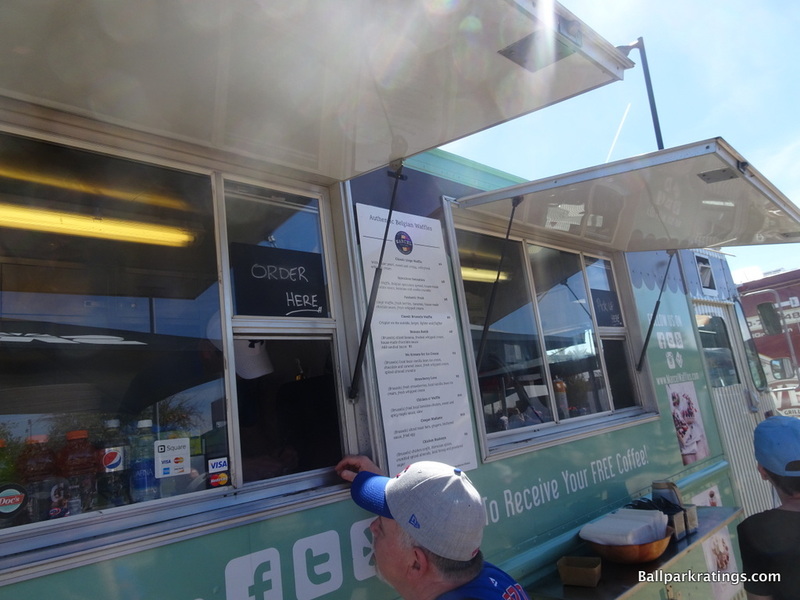 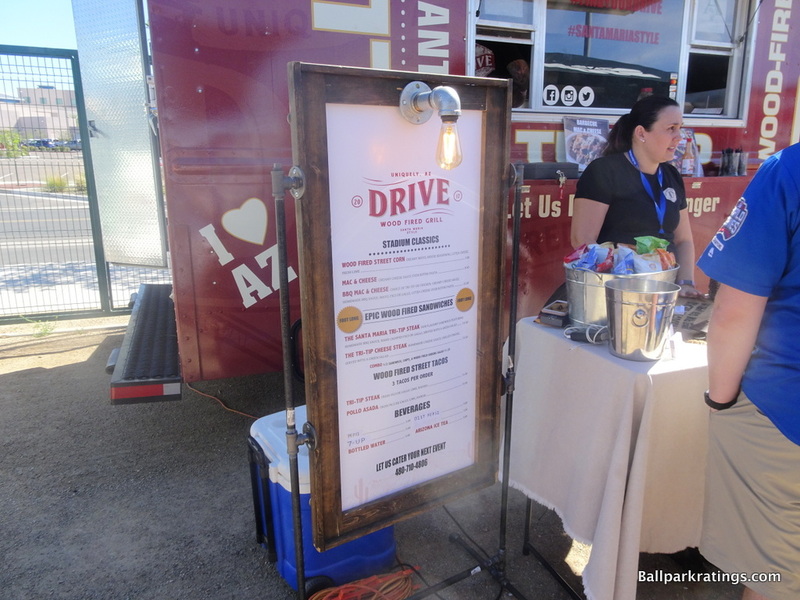 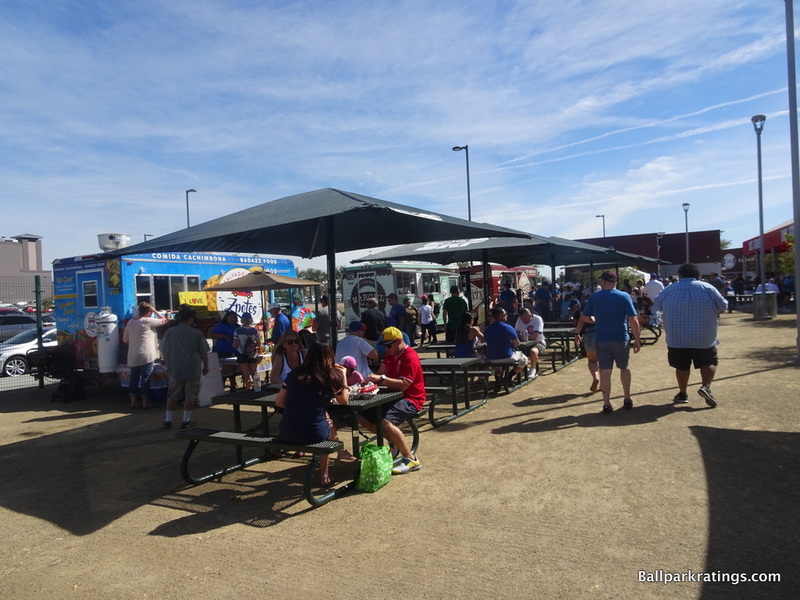 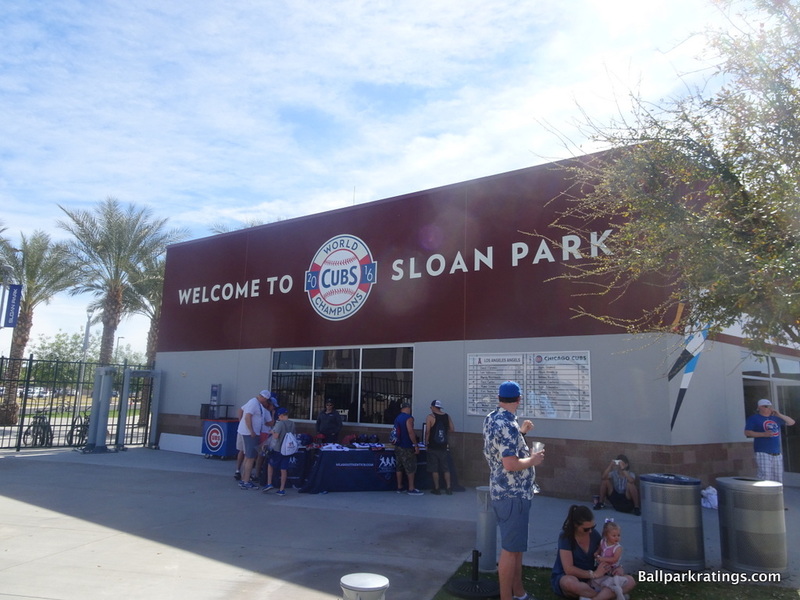 Highlighted by Chicago specialties and flavorful local food trucks, Sloan Park’s varied and tasty concessions are some of the best in spring training. 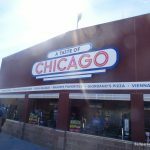 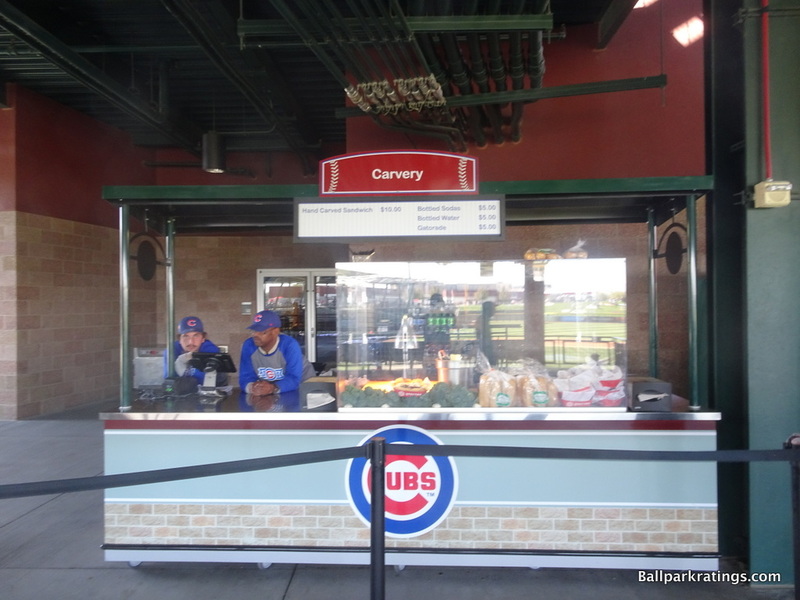 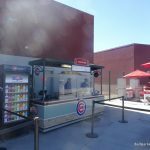 On the main concourse, fans will find more standard options like BBQ, craft burgers, hand carved sandwiches, meatball subs, Italian beef items, and Chicago’s own Giordano’s stuffed pizza. 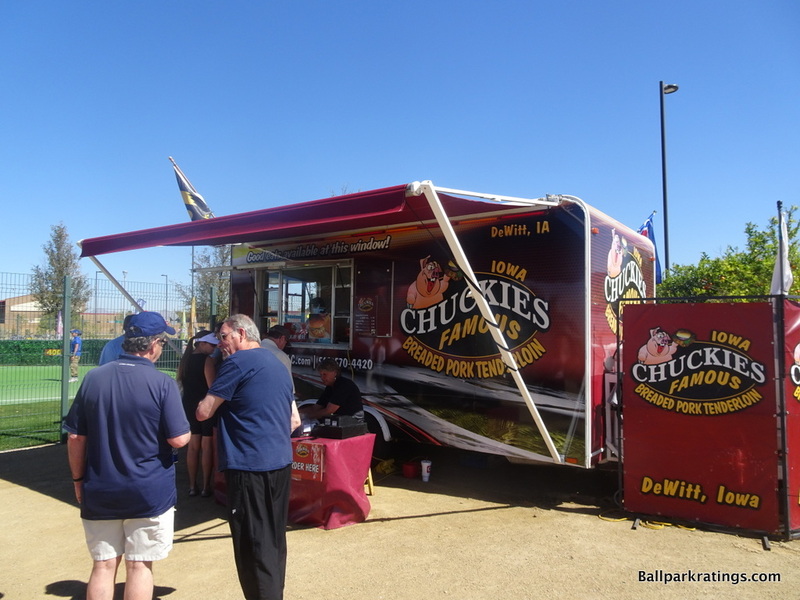 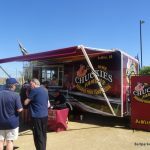 Iowa Chuckie’s Pork Tenderloin is a mainstay, but rotating food trucks in right field are the showstopper. 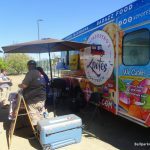 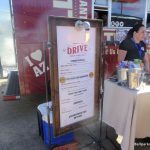 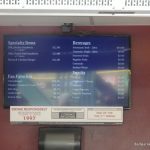 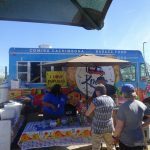 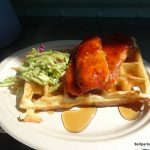 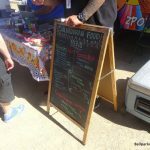 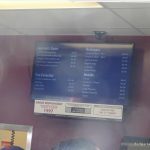 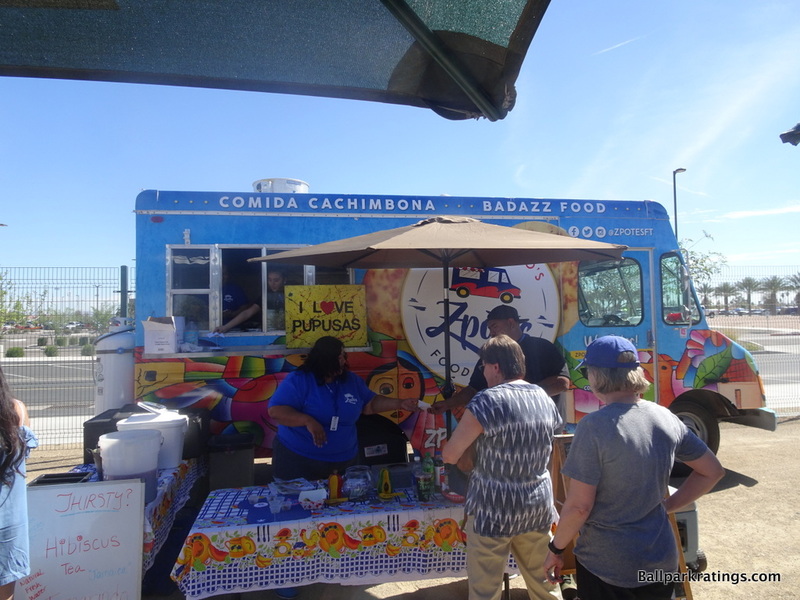 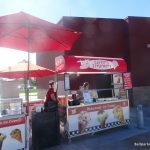 Past delicacies have included Salvadorian food provided by Zpotes’ “Comida Cachimbona,” breakfast from Marcel Belgian Waffles, and eclectic fare per Drive Wood Fired Grill. 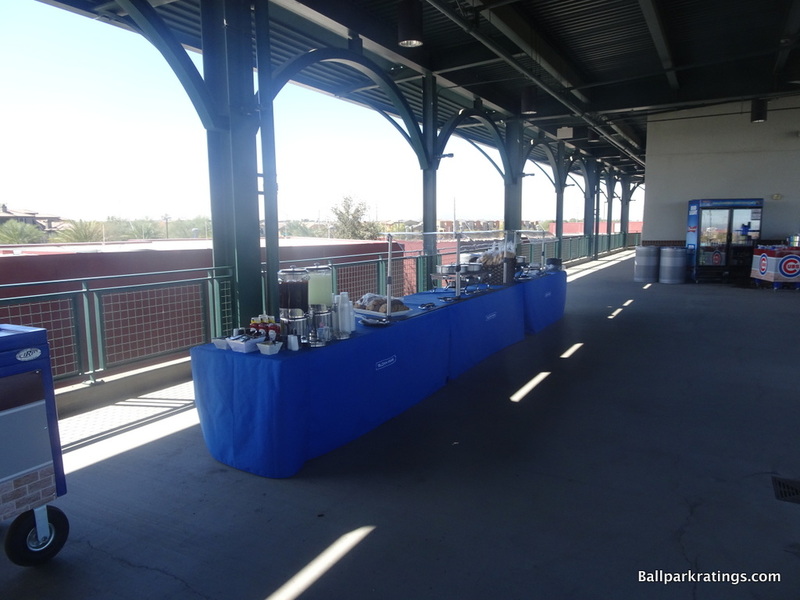 Finally, the grab-and-go station provides healthy fare like wraps, veggie trays, hummus, and crudité. 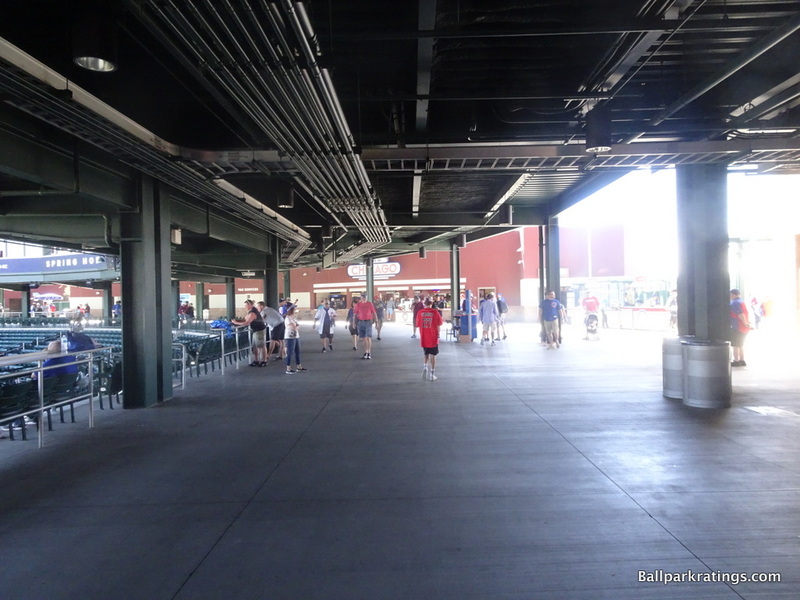 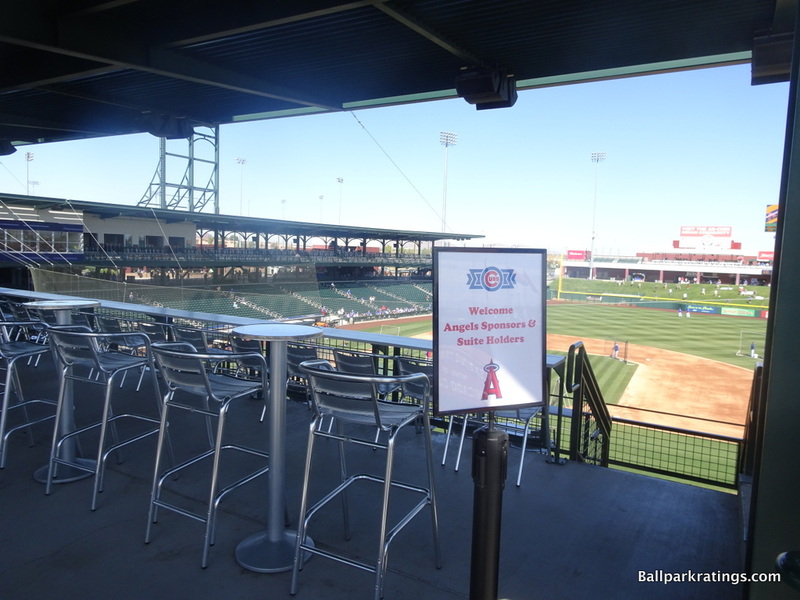 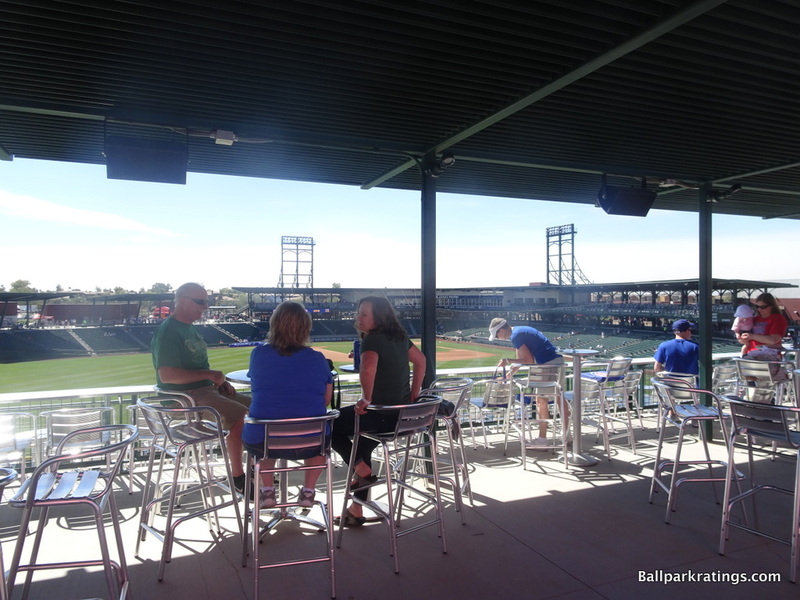 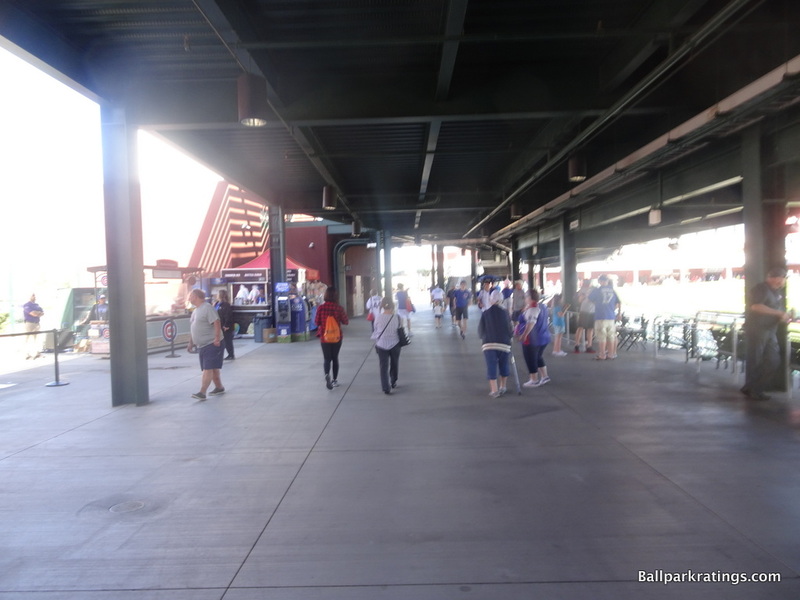 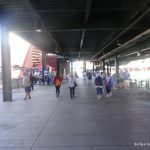 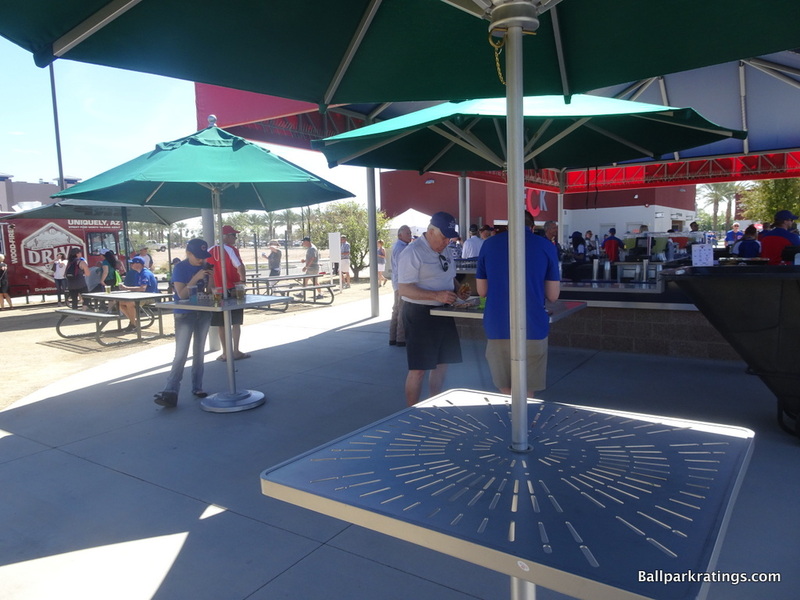 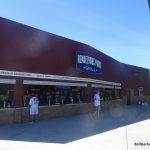 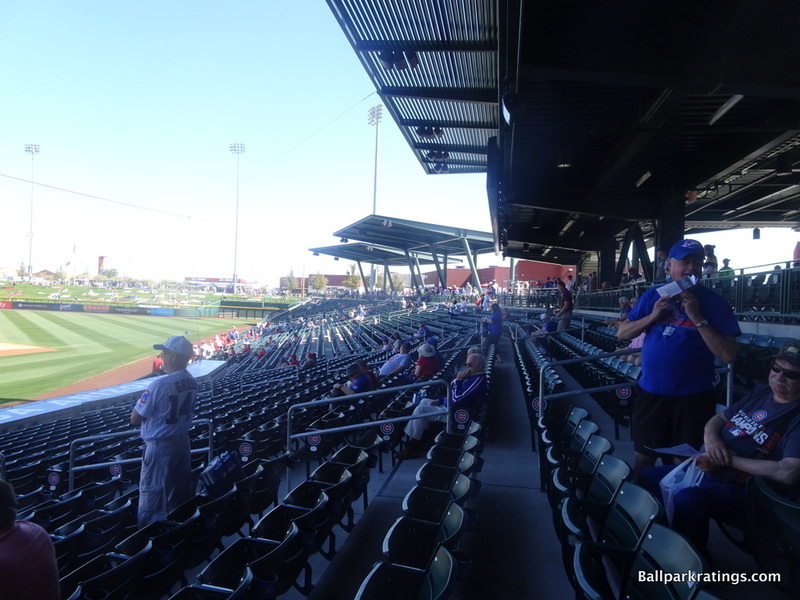 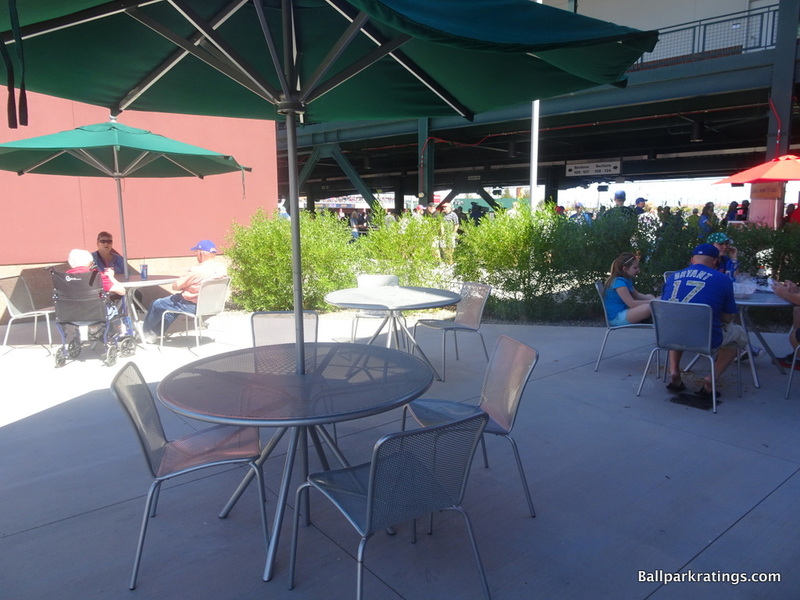 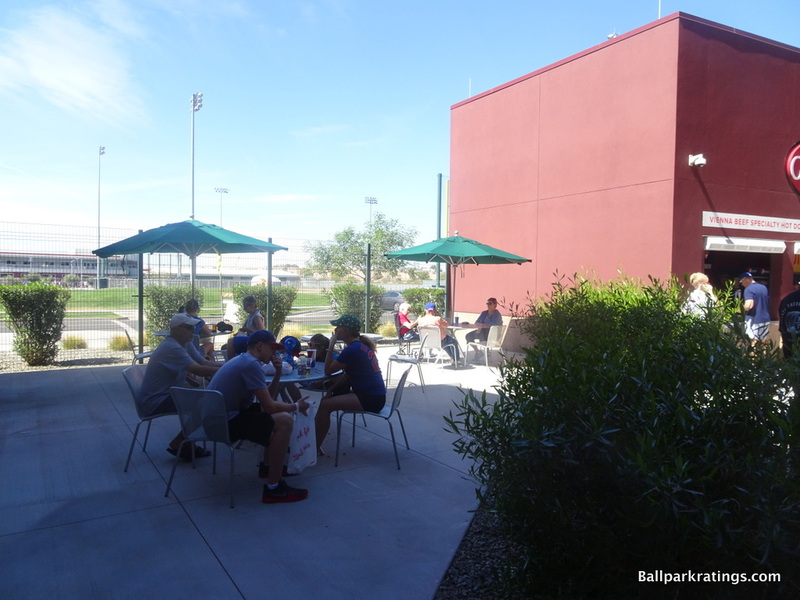 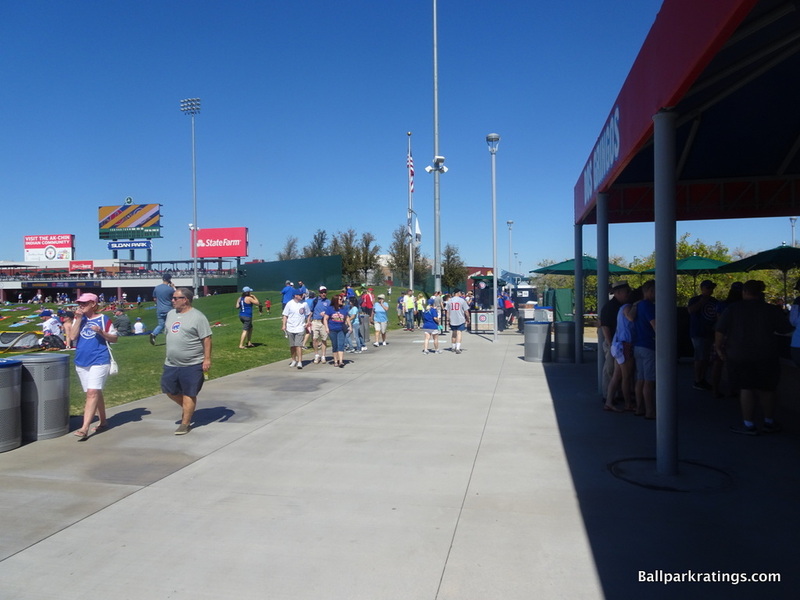 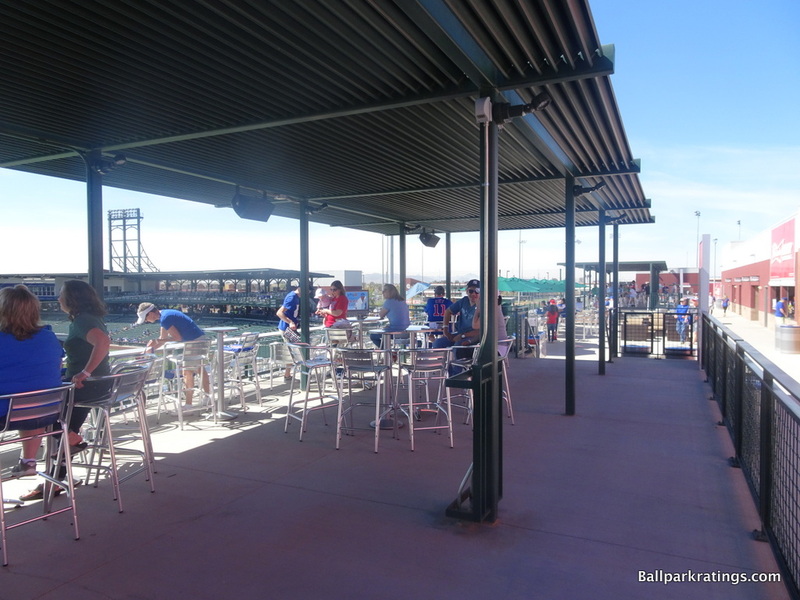 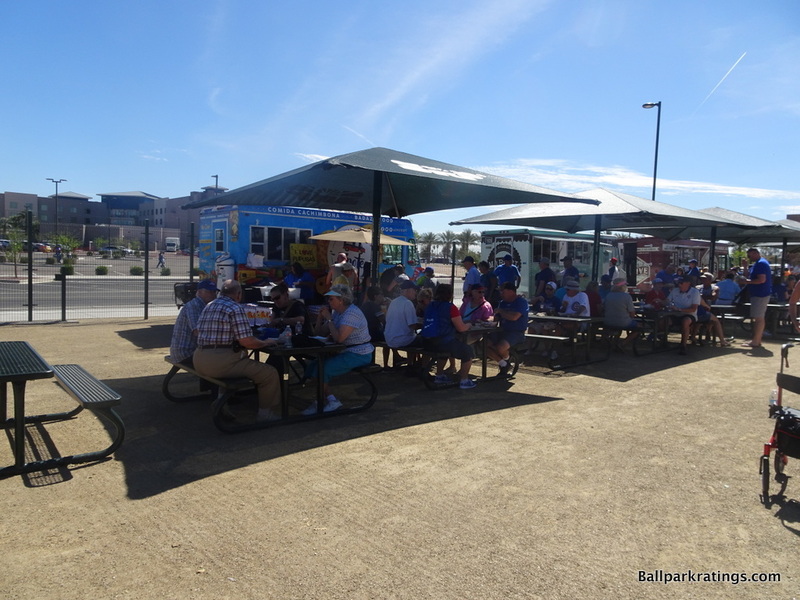 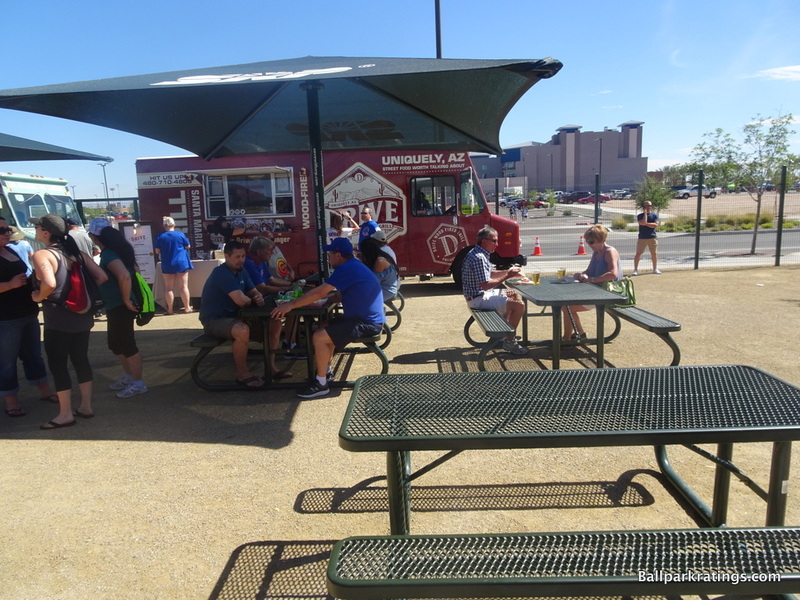 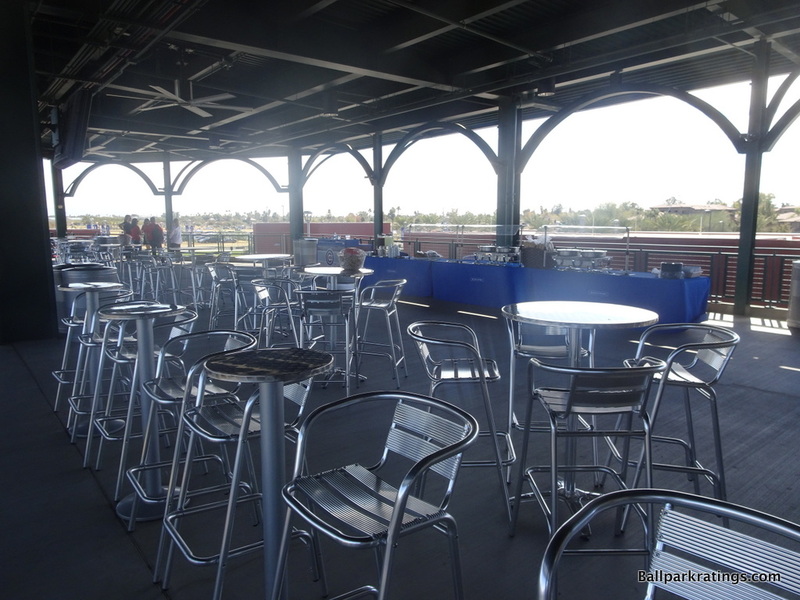 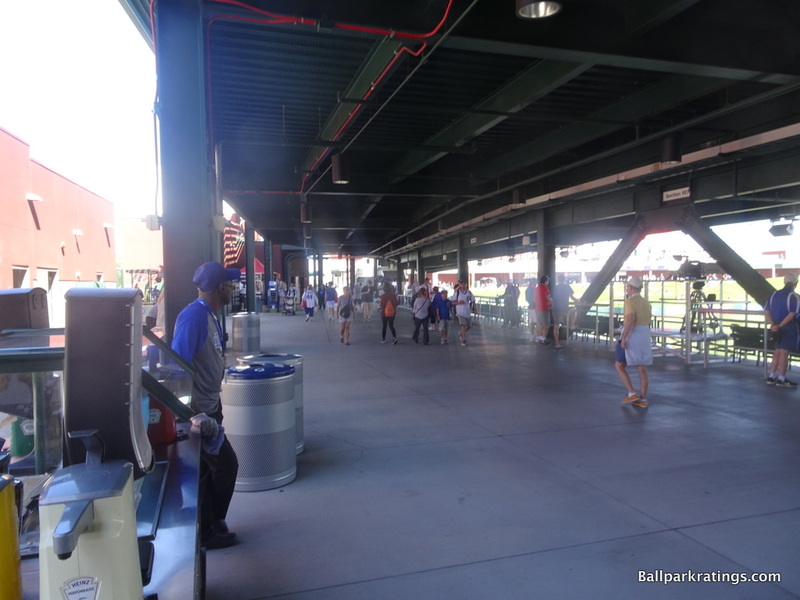 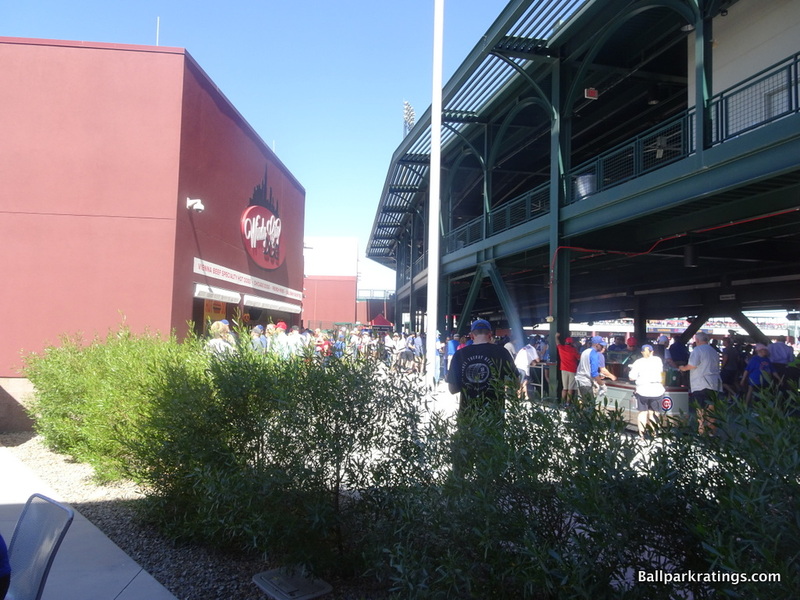 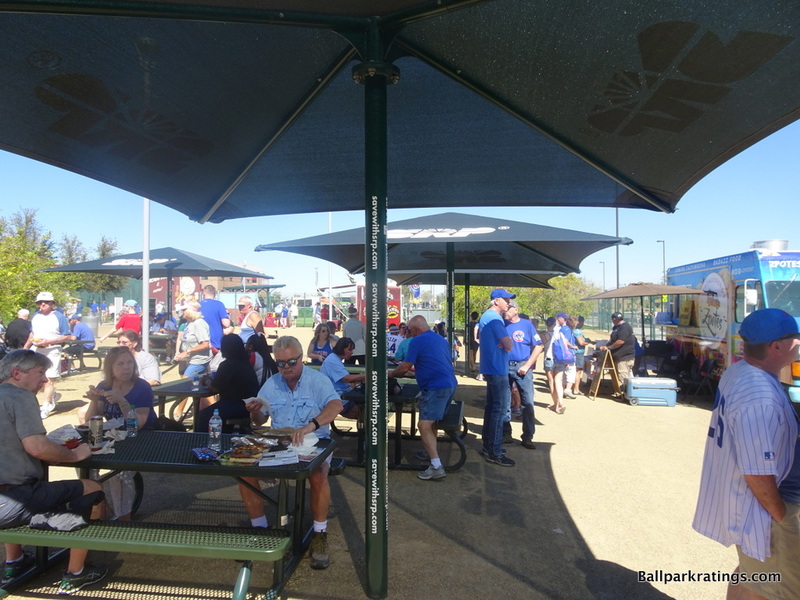 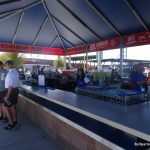 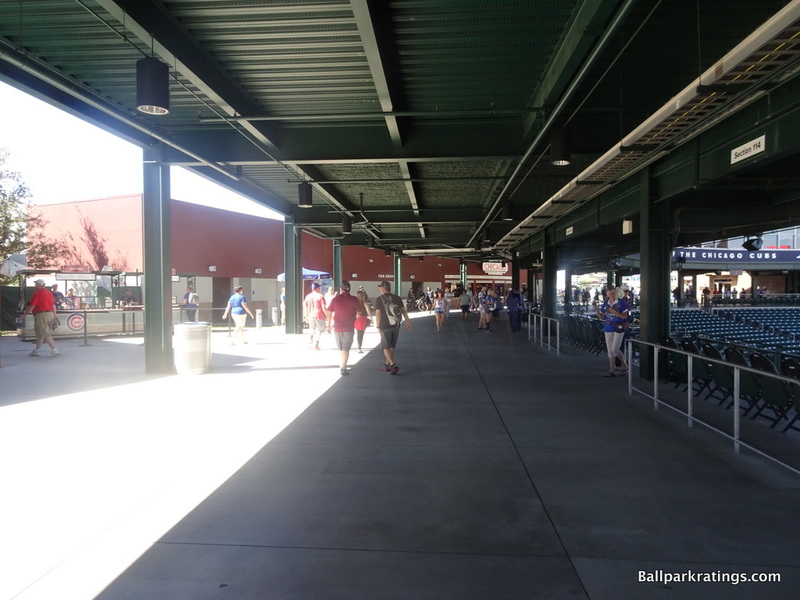 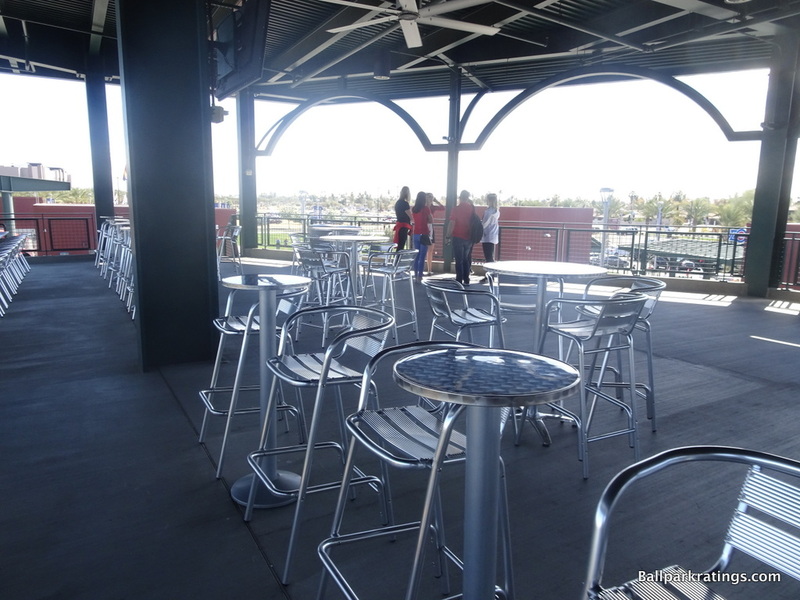 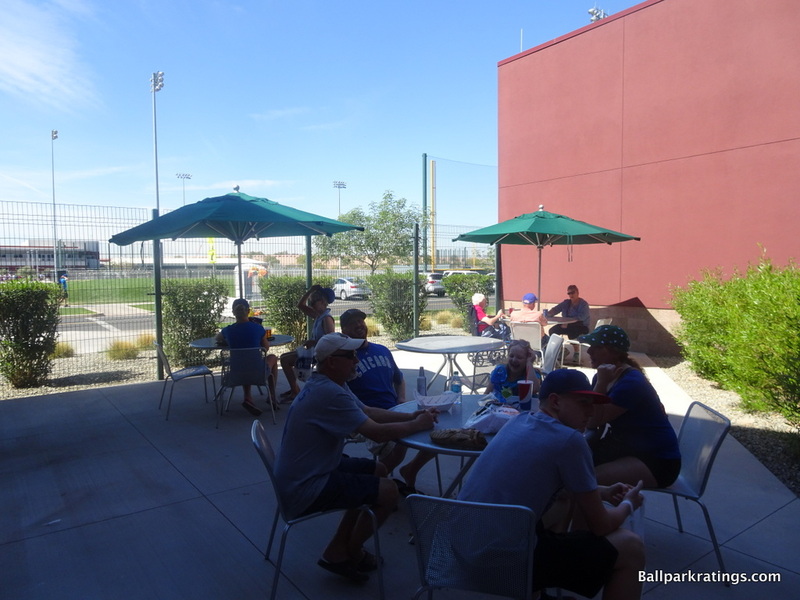 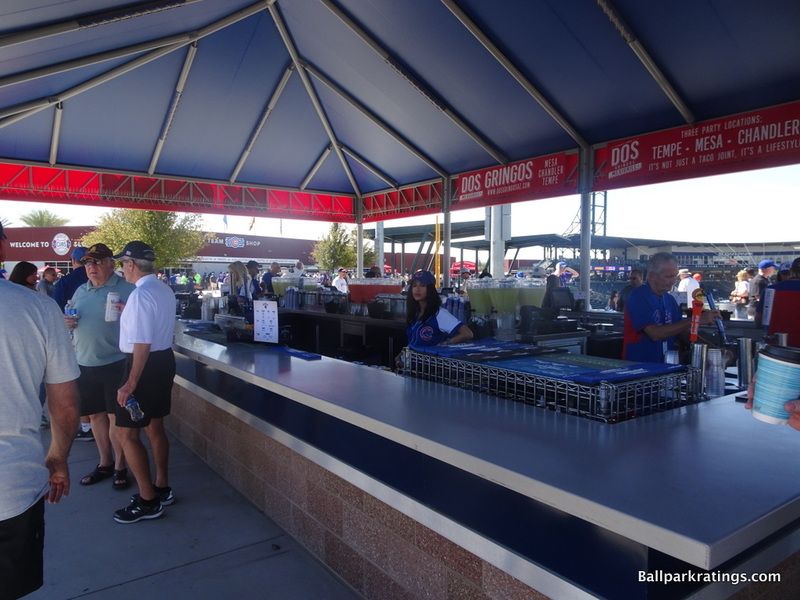 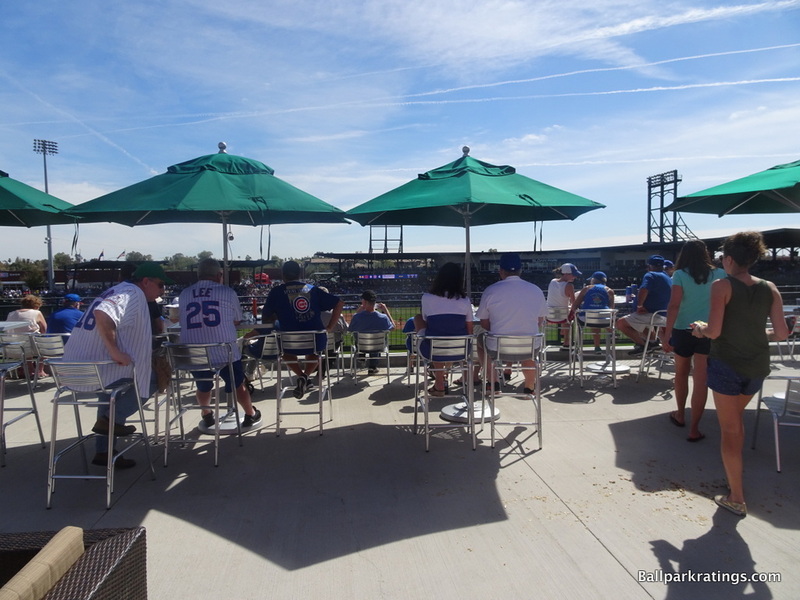 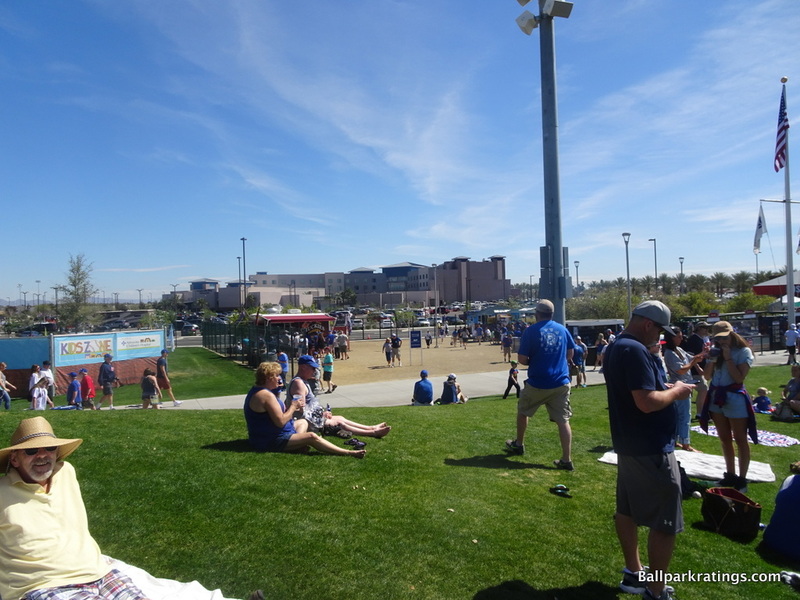 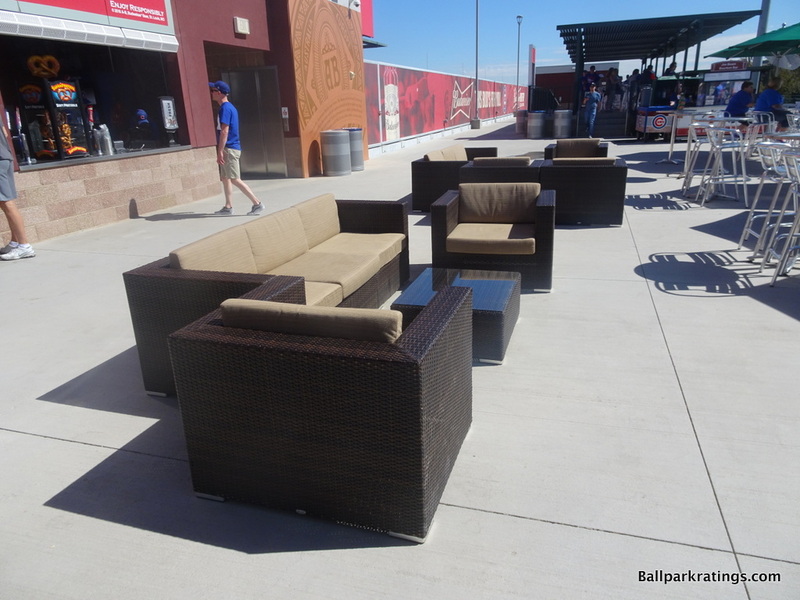 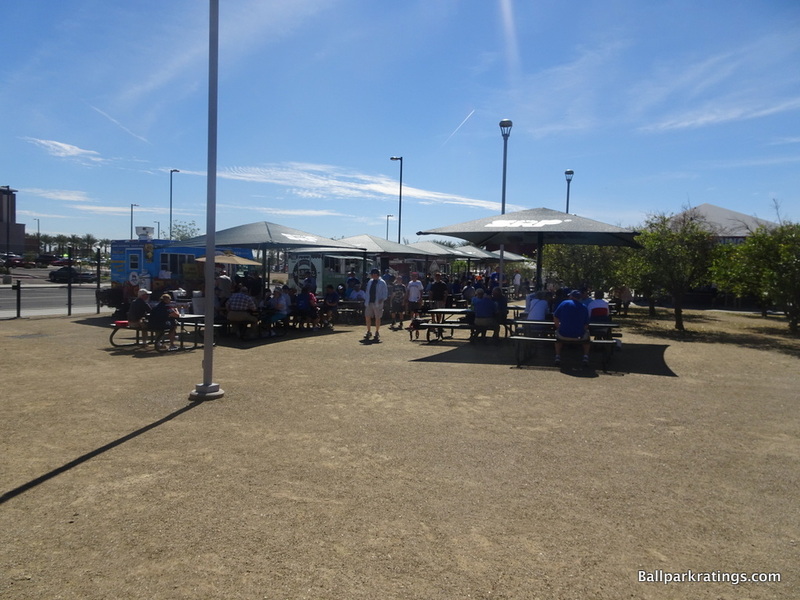 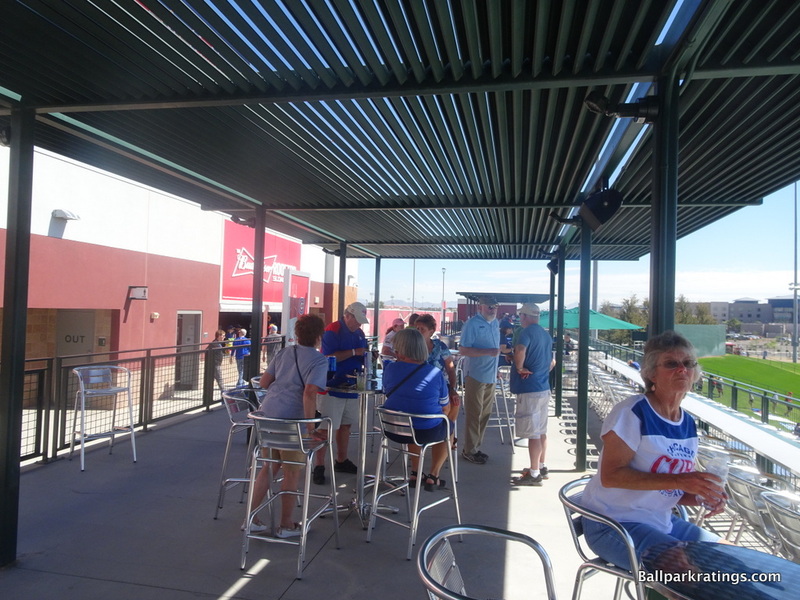 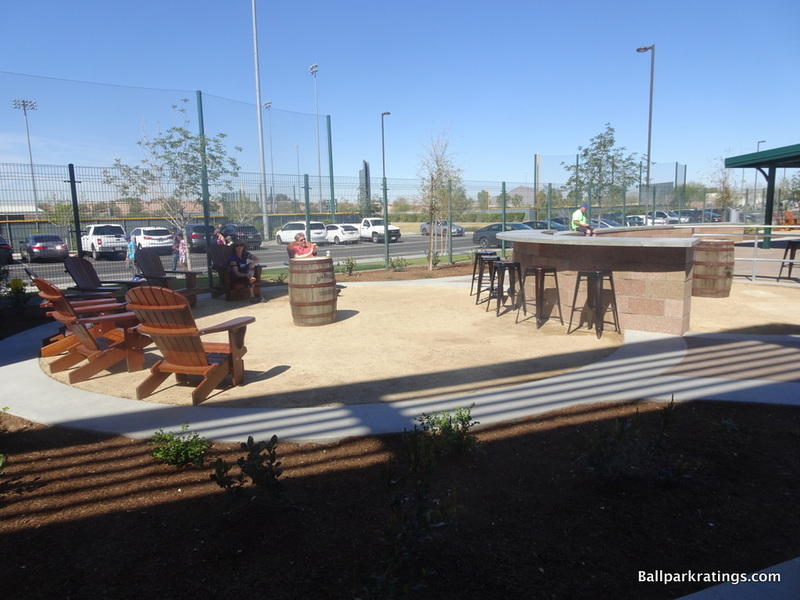 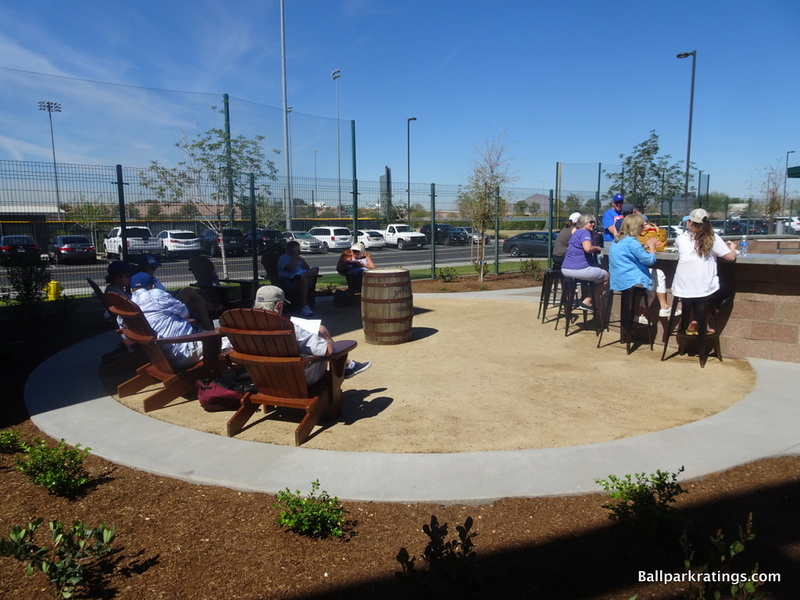 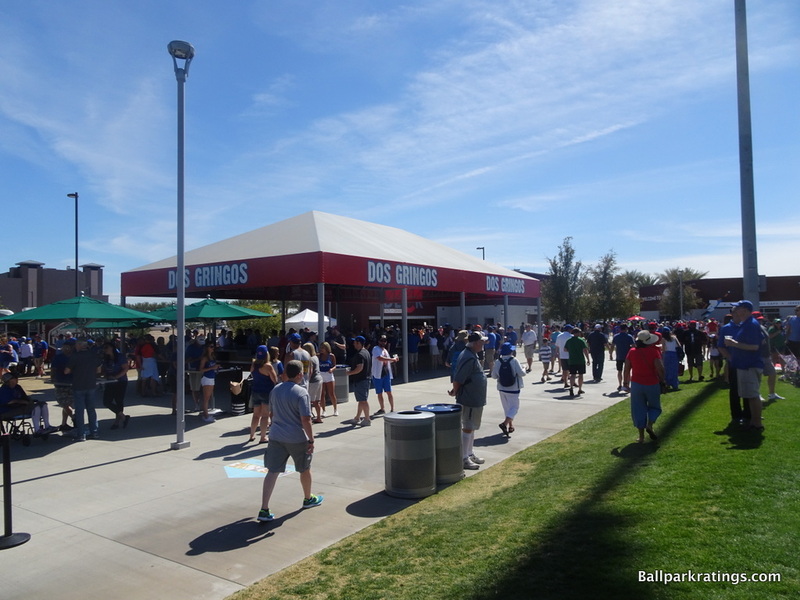 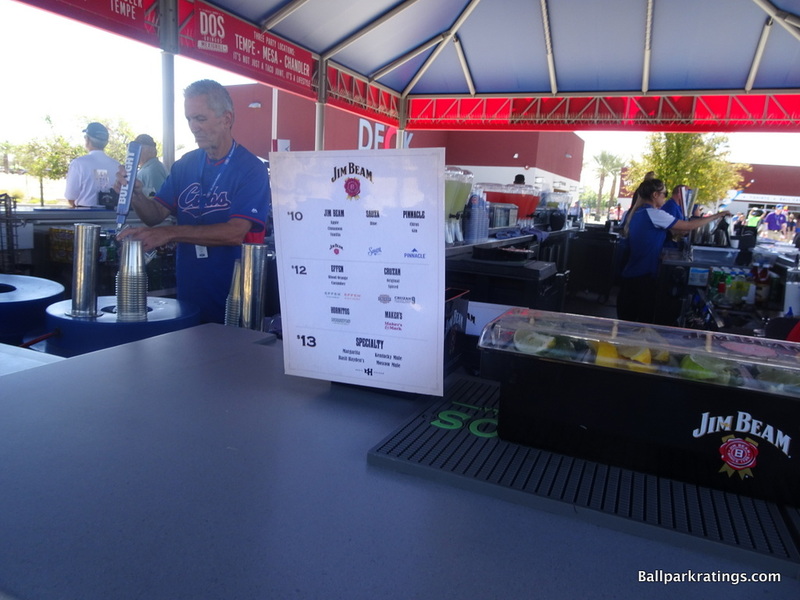 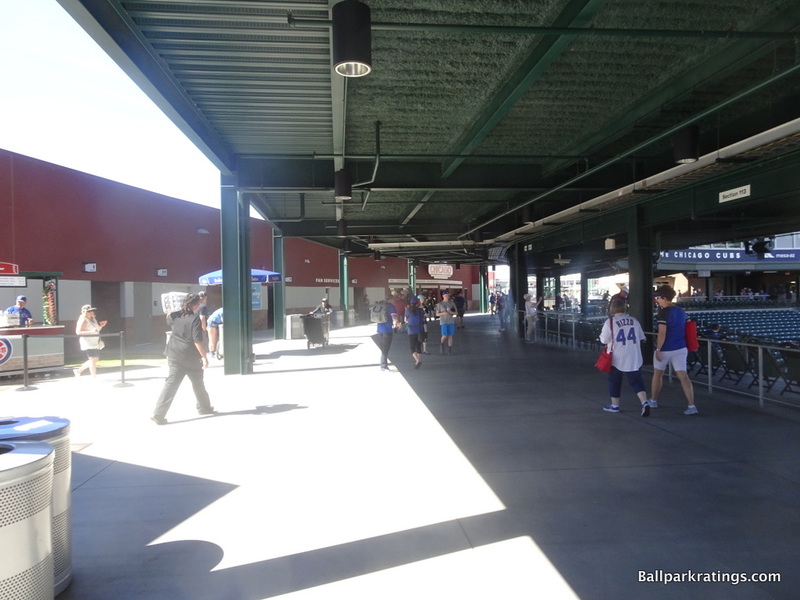 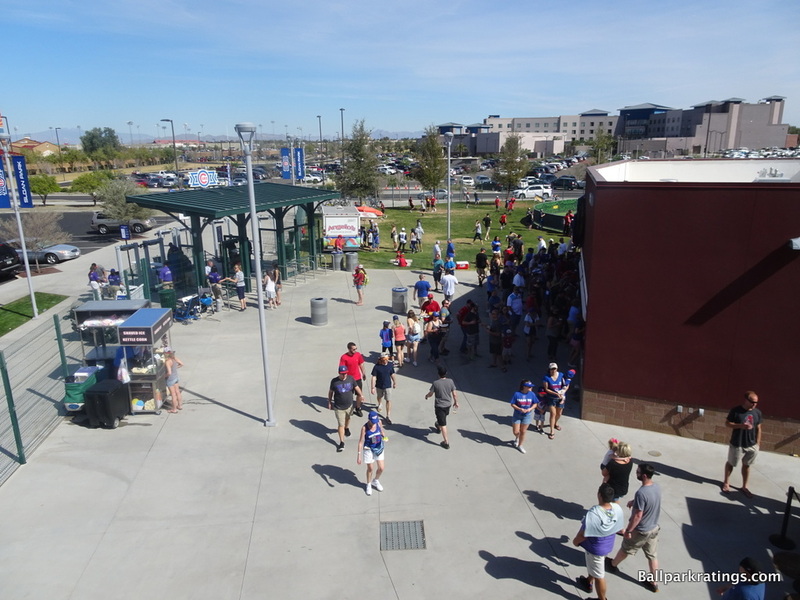 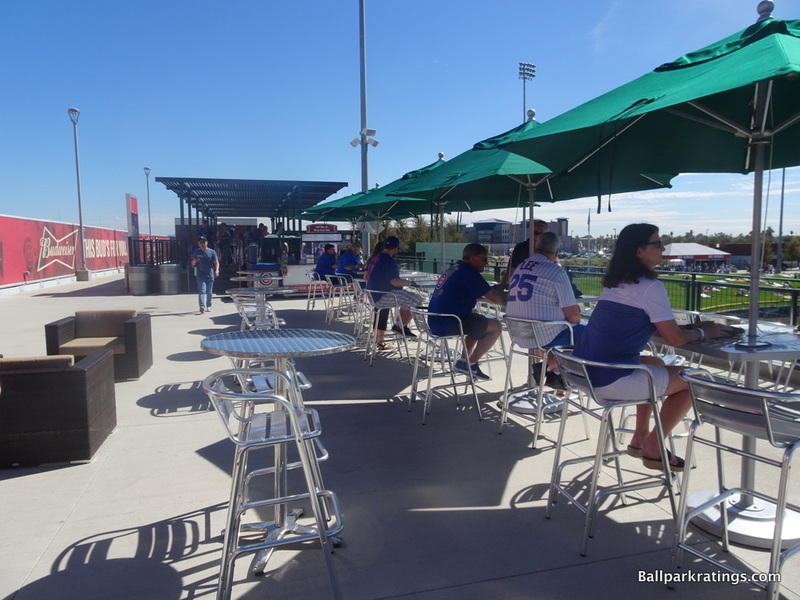 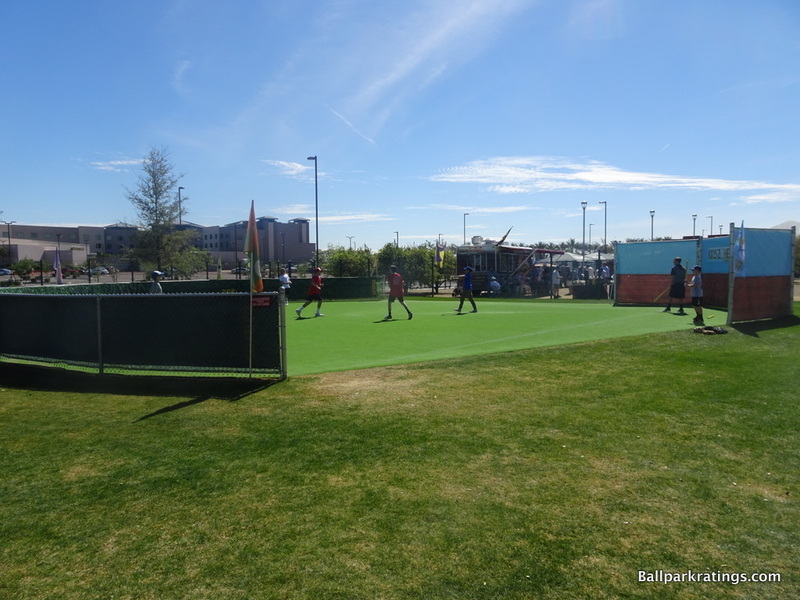 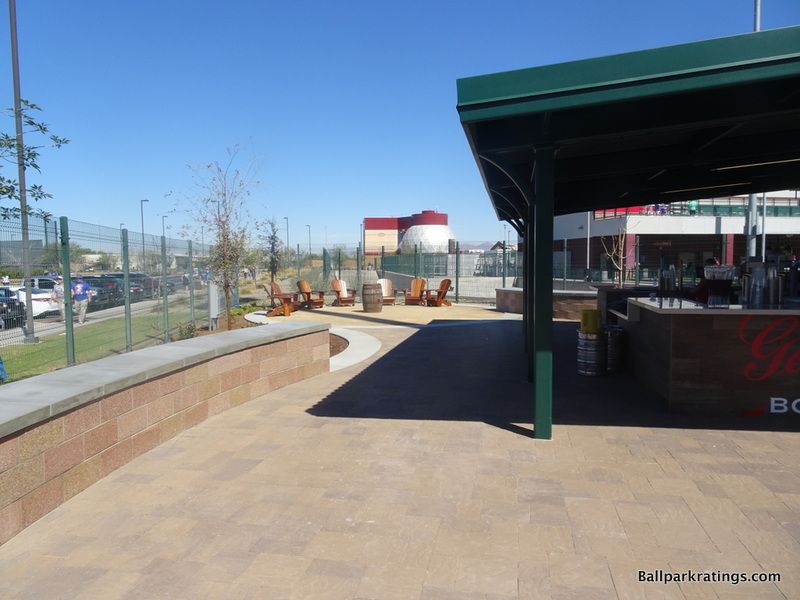 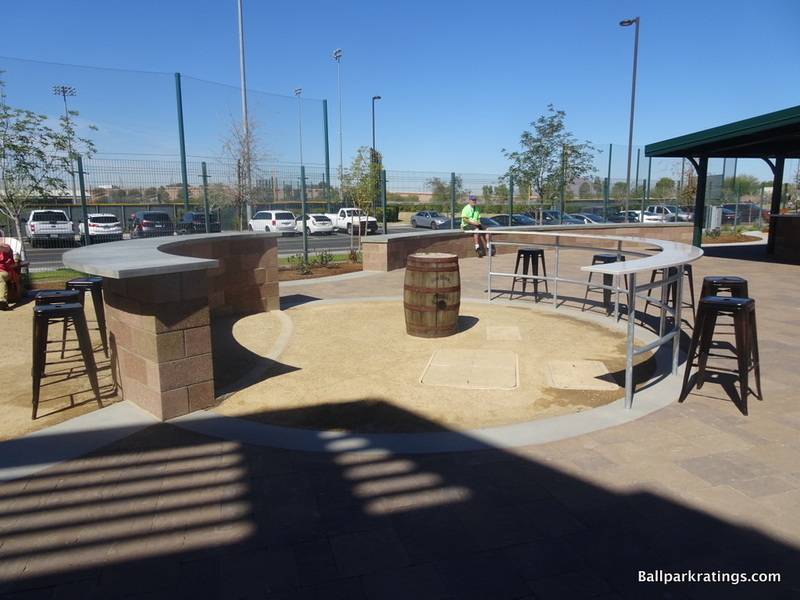 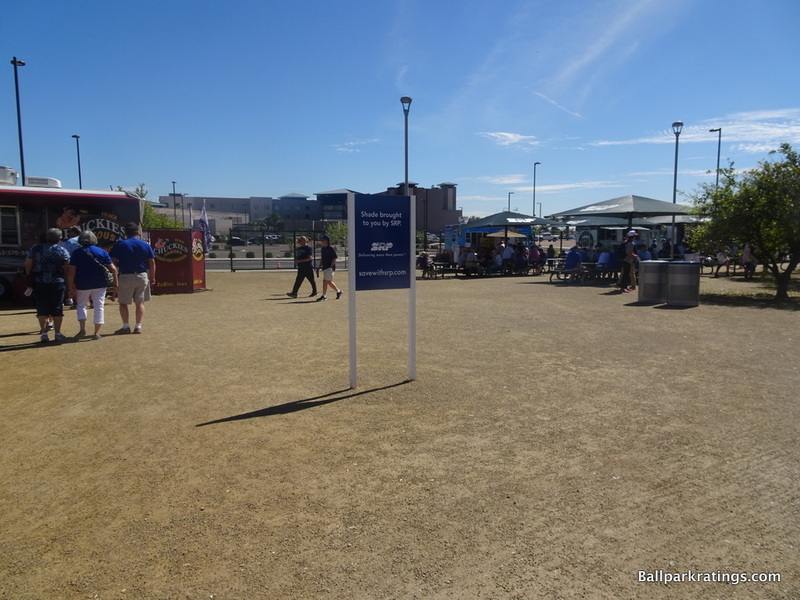 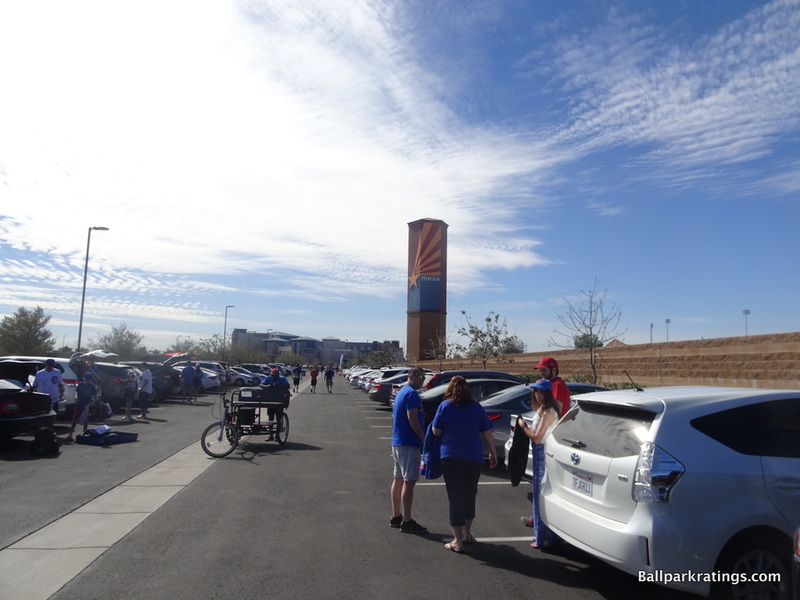 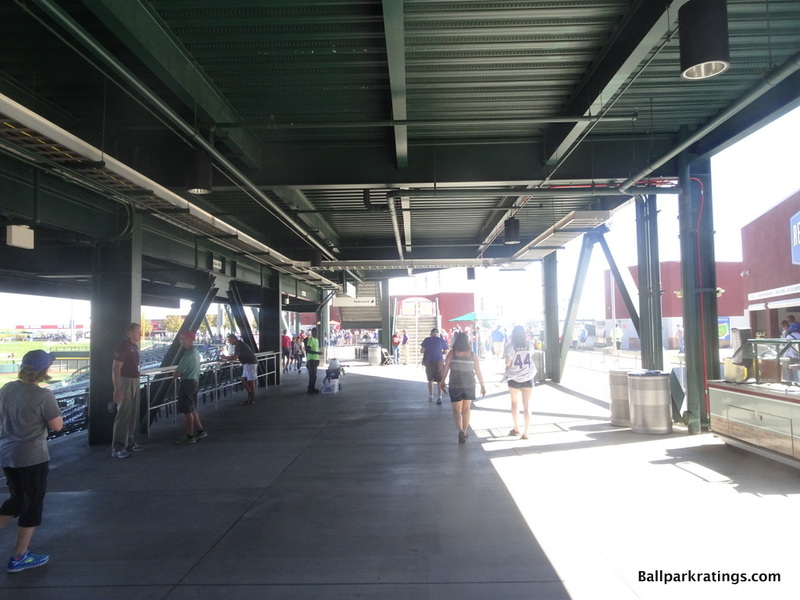 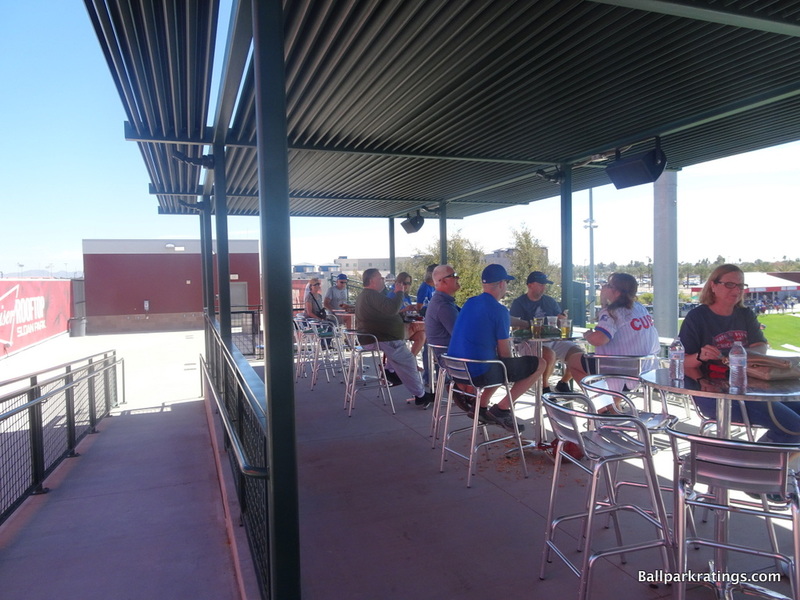 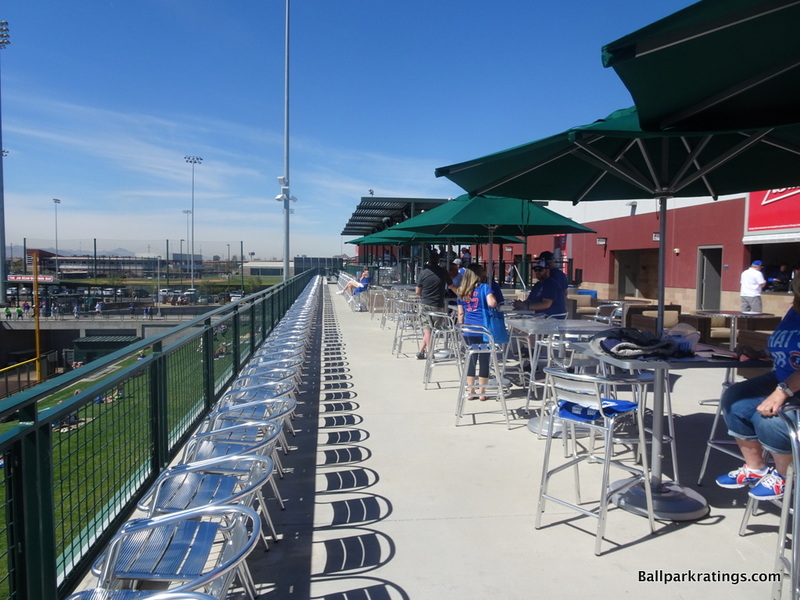 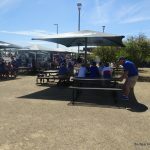 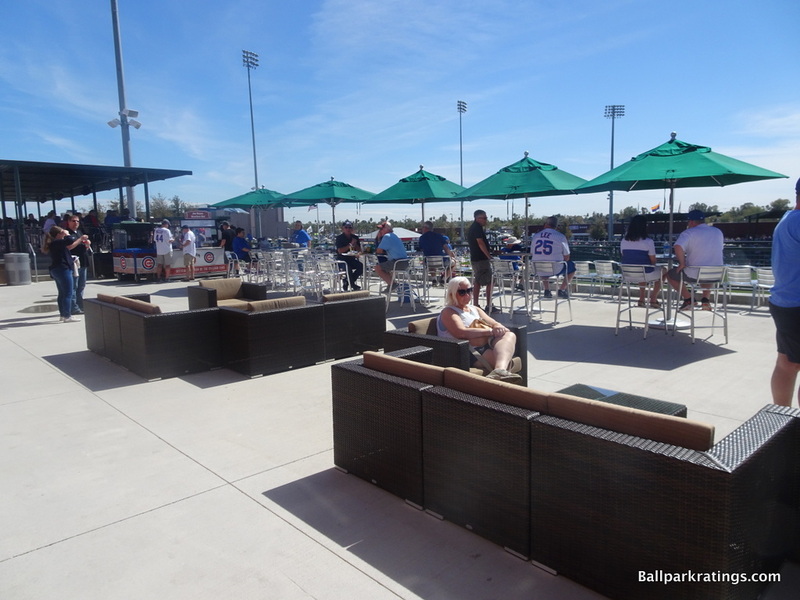 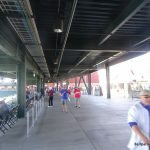 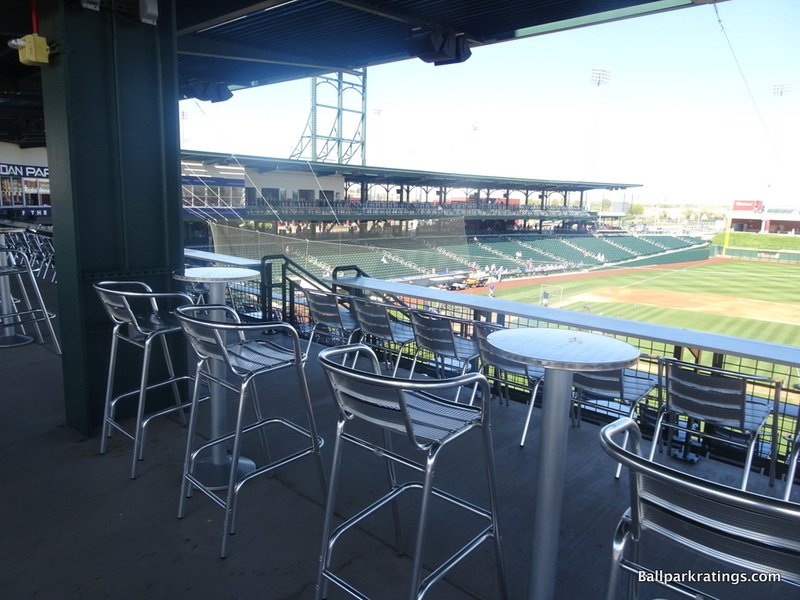 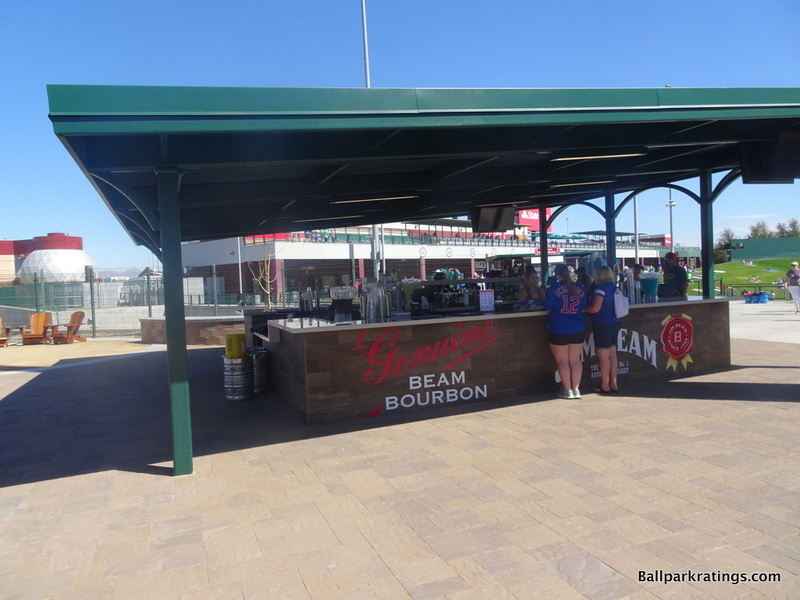 Sloan Park features great social spaces and destination bars open to all fans. 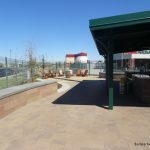 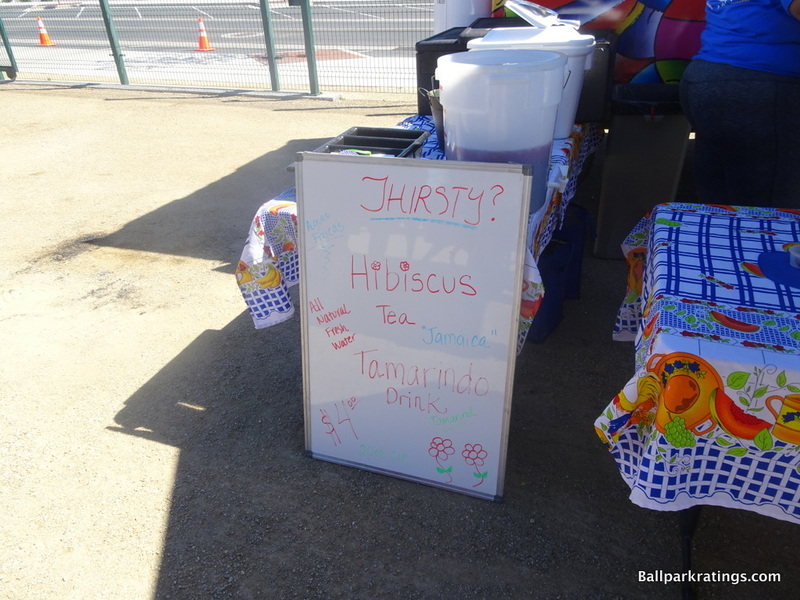 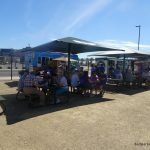 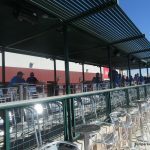 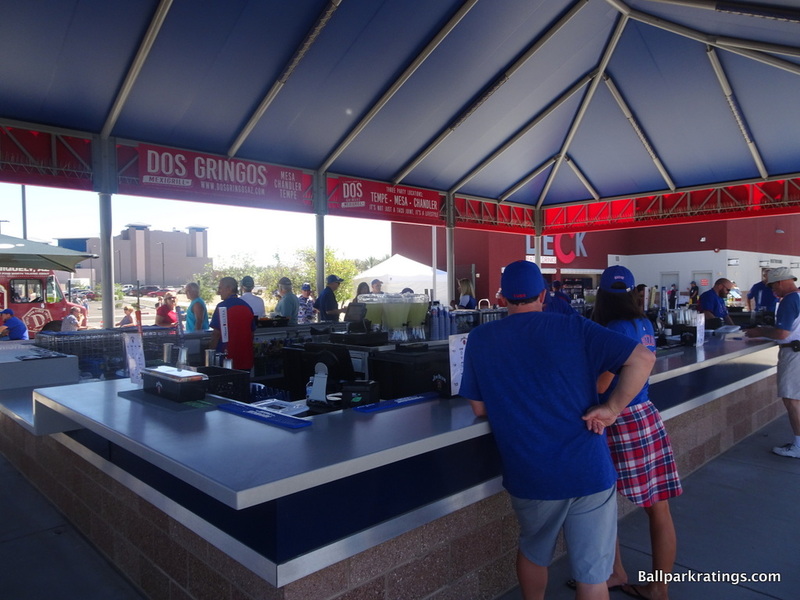 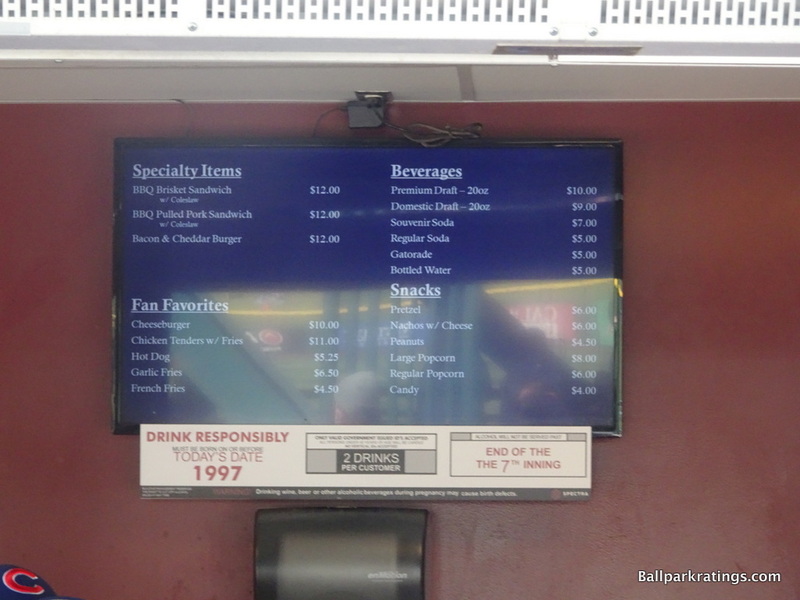 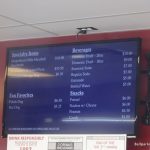 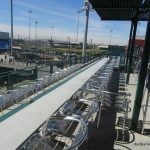 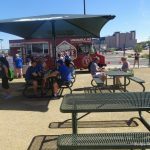 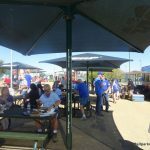 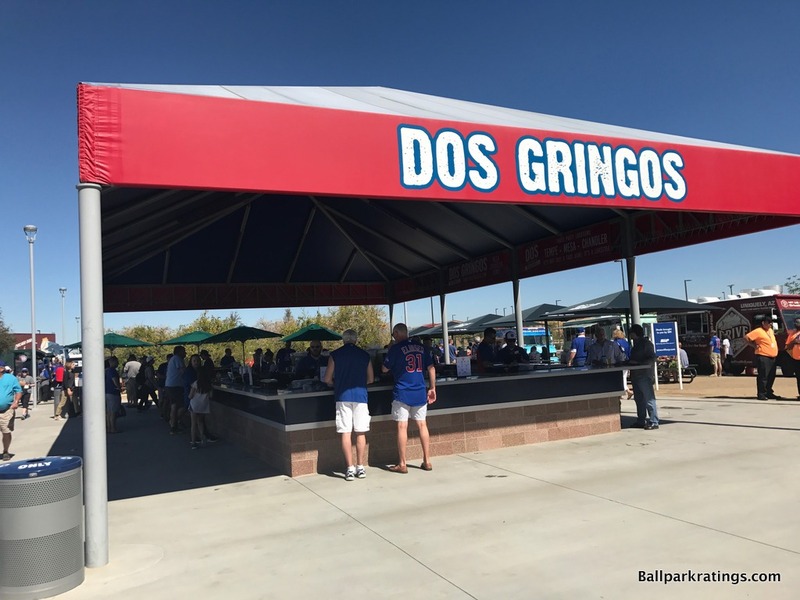 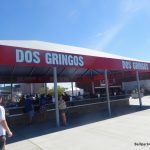 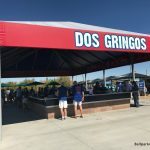 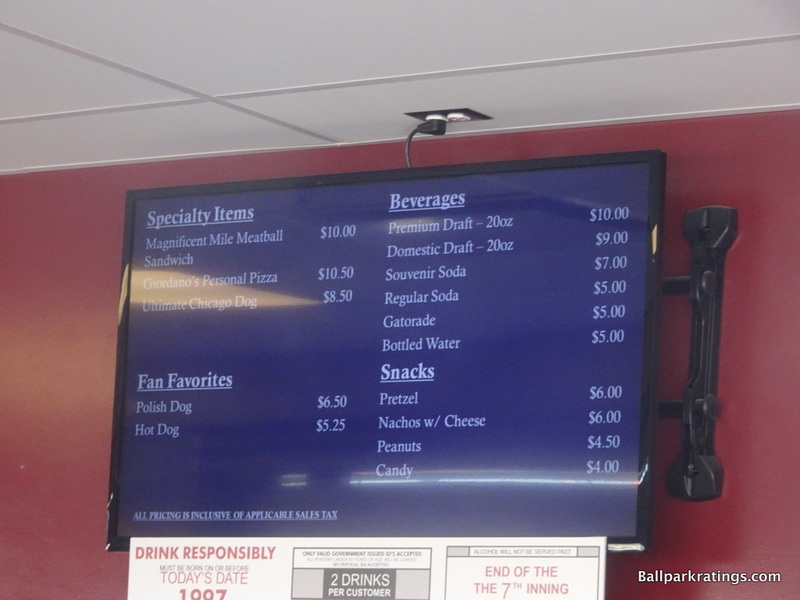 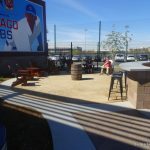 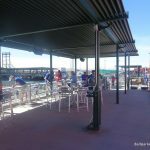 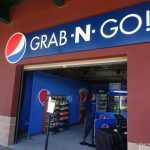 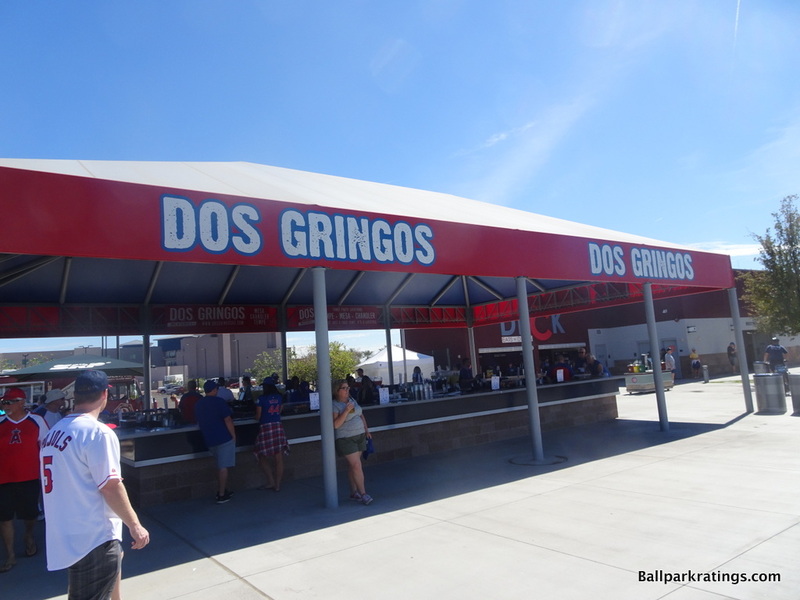 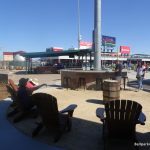 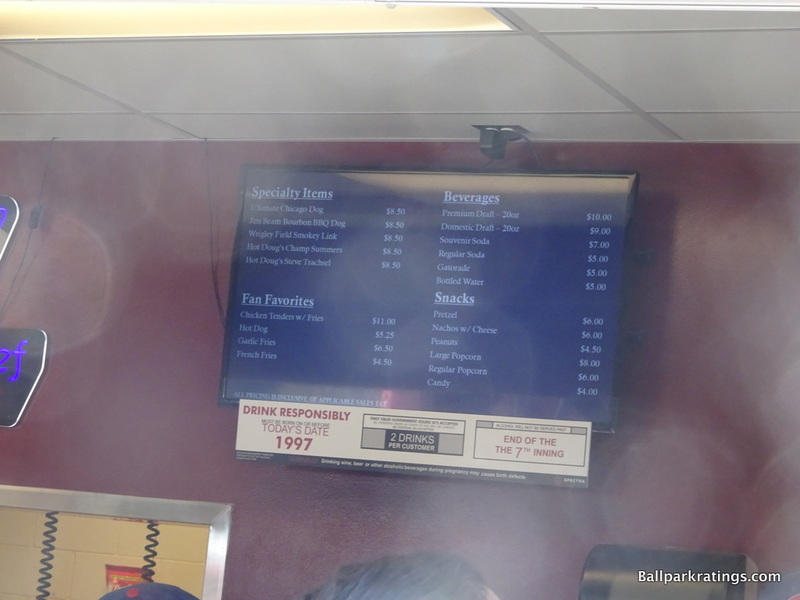 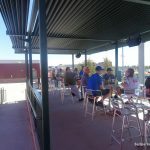 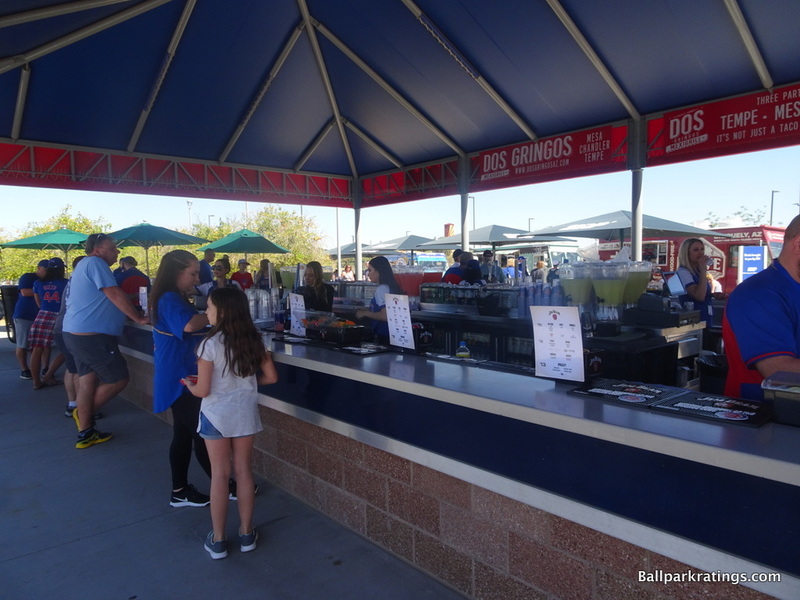 While lacking bar stools and patio seating, the full-service (and always crowded) Dos Gringos Bar in right field is Sloan Park’s signature social space. 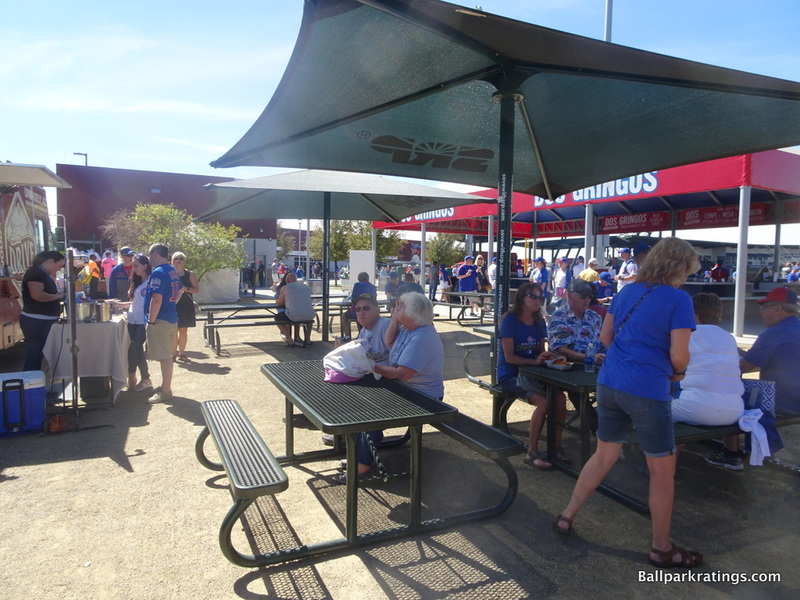 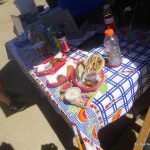 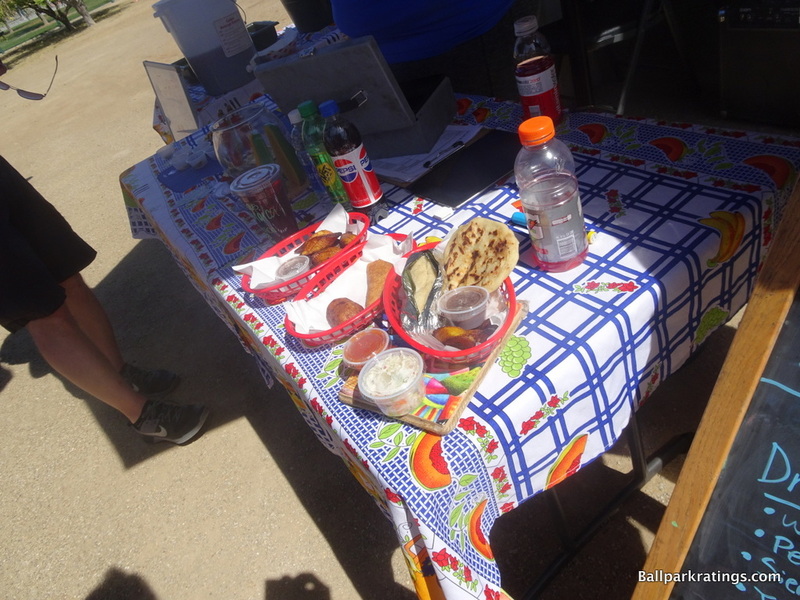 Picnic tables are set up at the Citrus Grove adjacent to the bar by the food trucks. 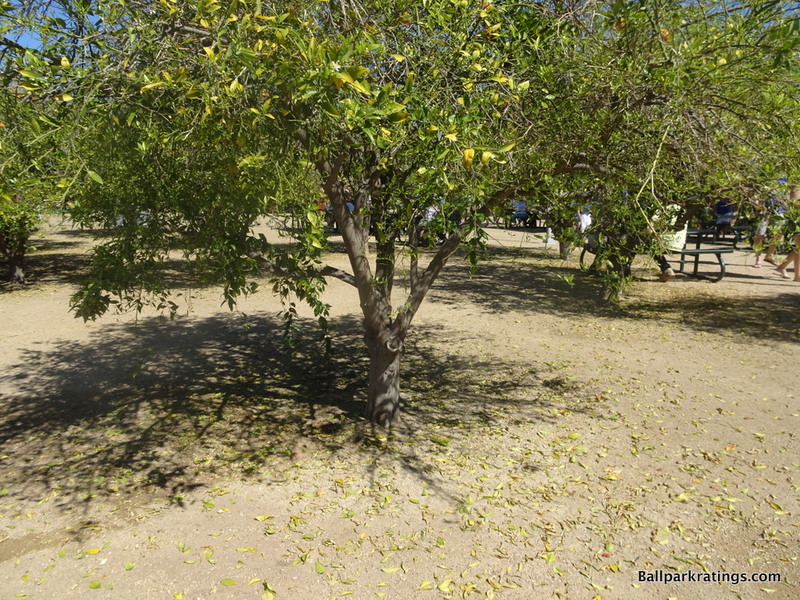 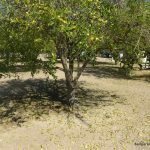 Oranges grow from trees surrounding the space. 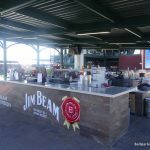 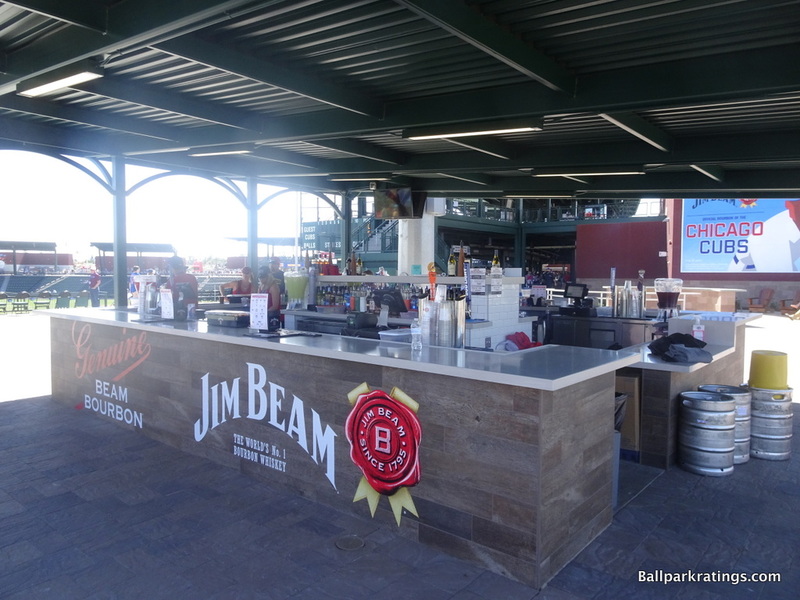 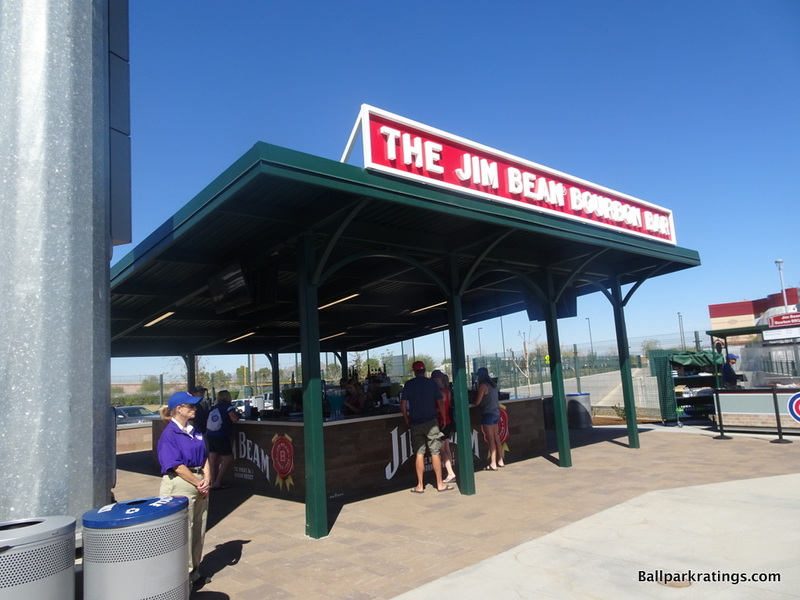 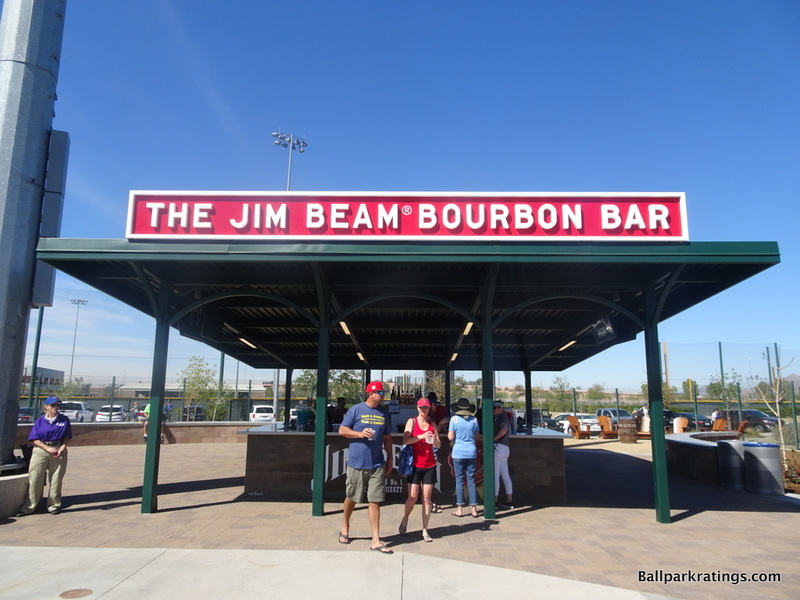 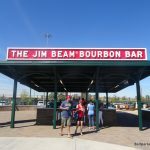 Flanked by sets of rustic brown Adirondack chairs and a circular bar seating area, the charmingly designed Jim Beam Bourbon Bar is located down the left field line. 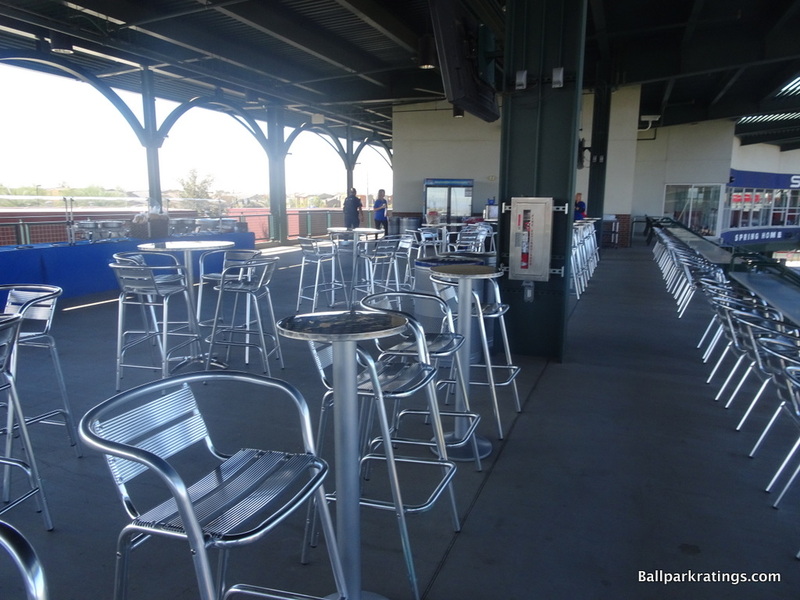 This bar is often less crowded and offers more places to sit. 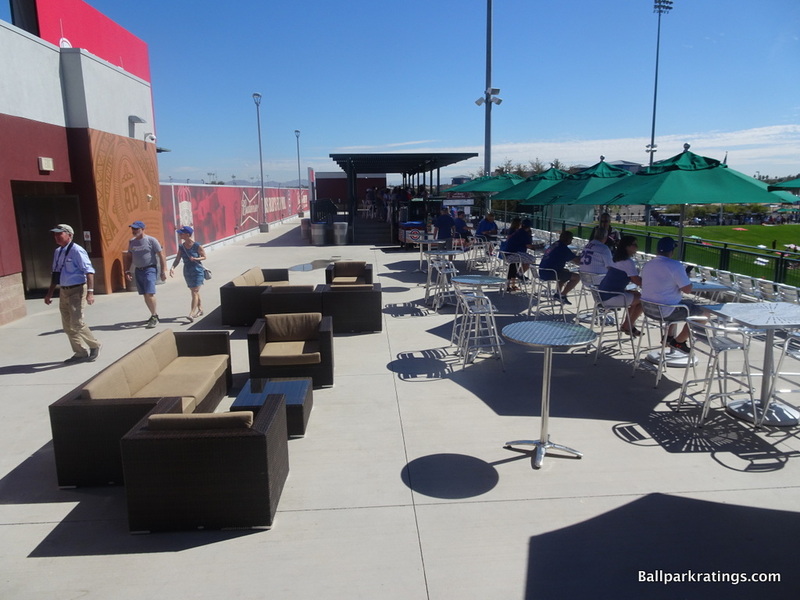 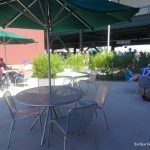 A supplementary dining patio area is located in an enclave off the main concourse by third base. 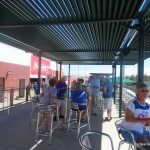 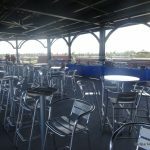 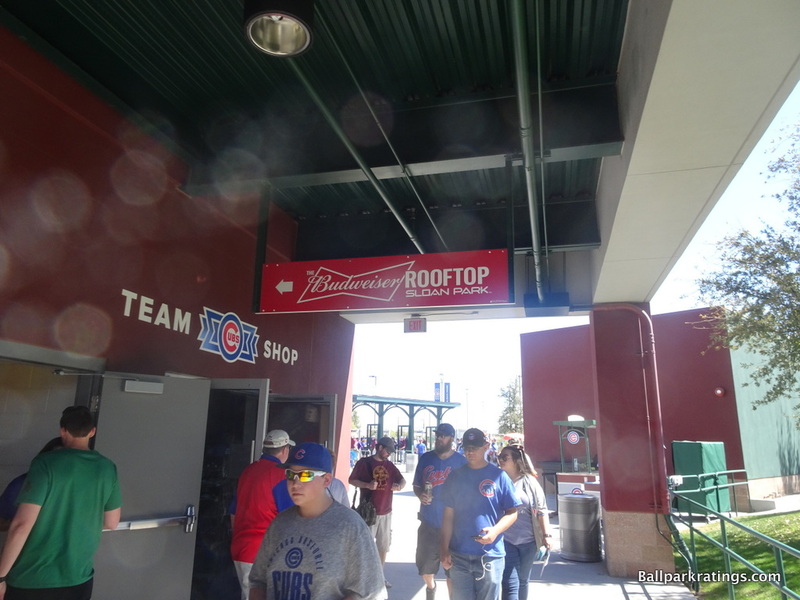 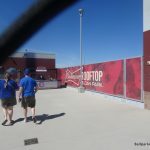 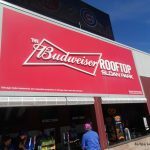 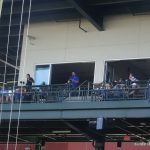 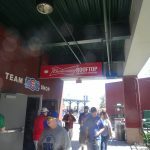 Budweiser Rooftop at Sloan Park. 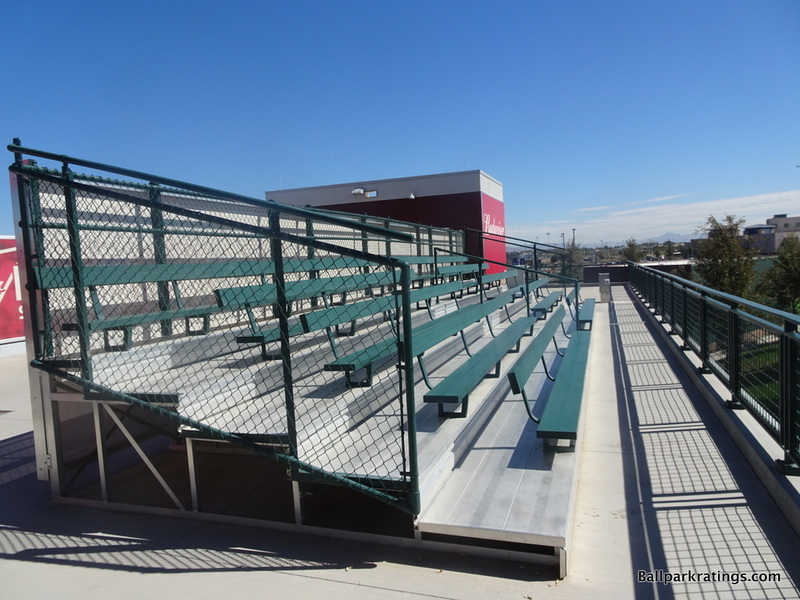 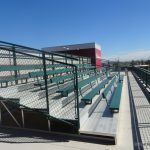 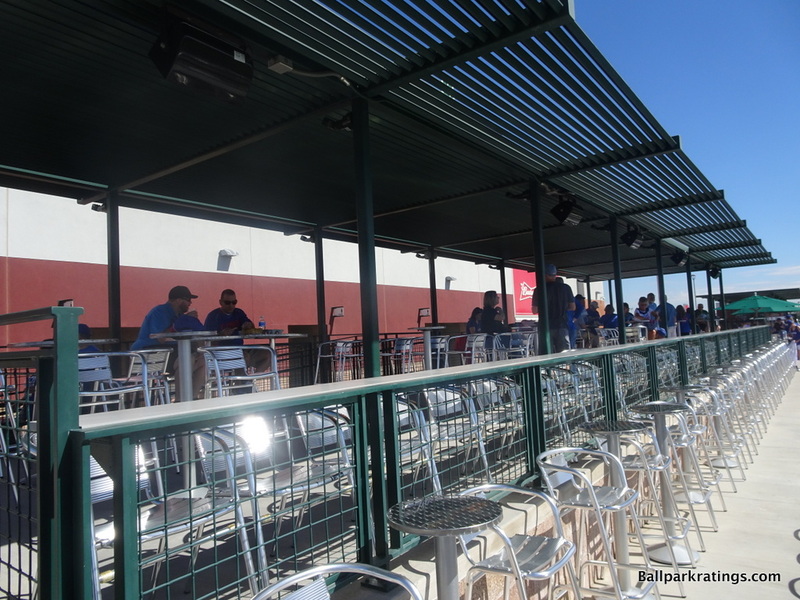 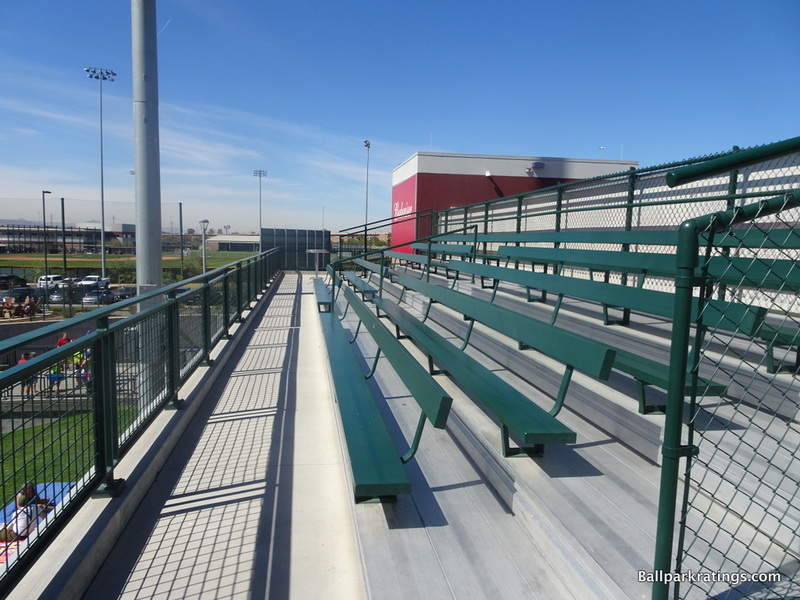 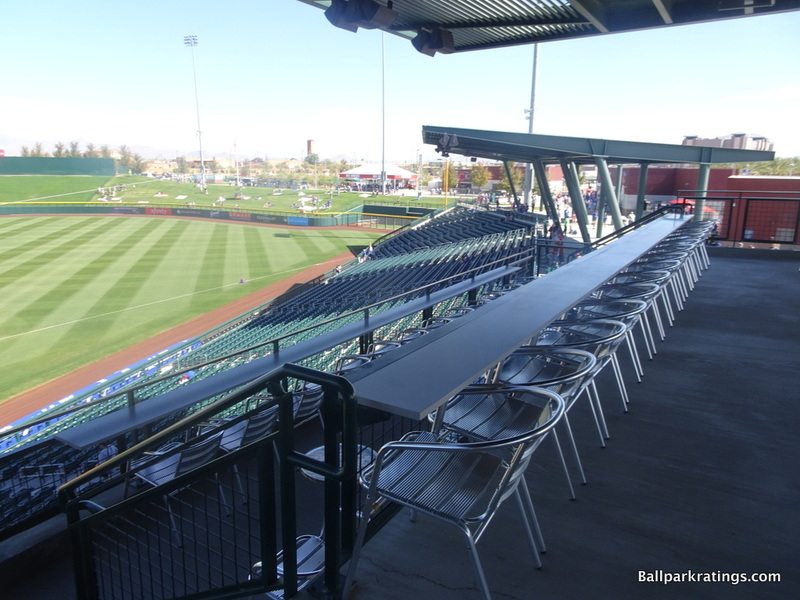 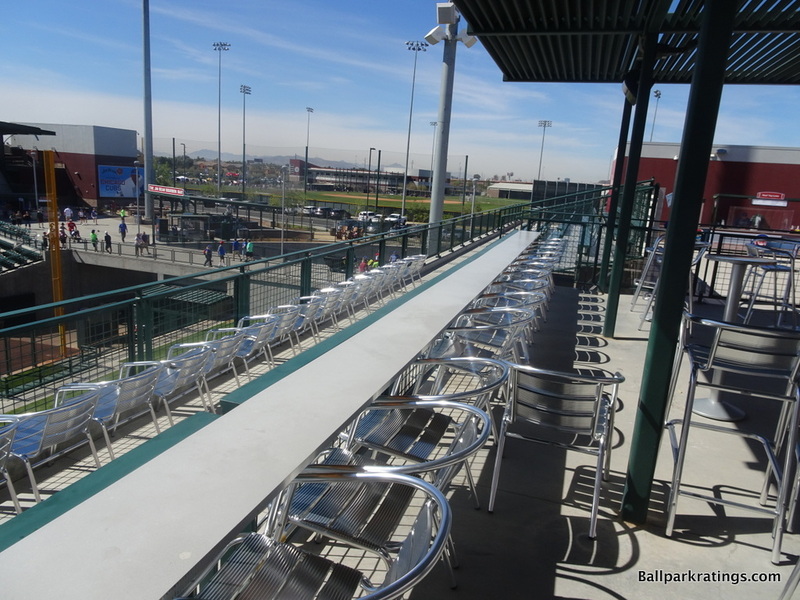 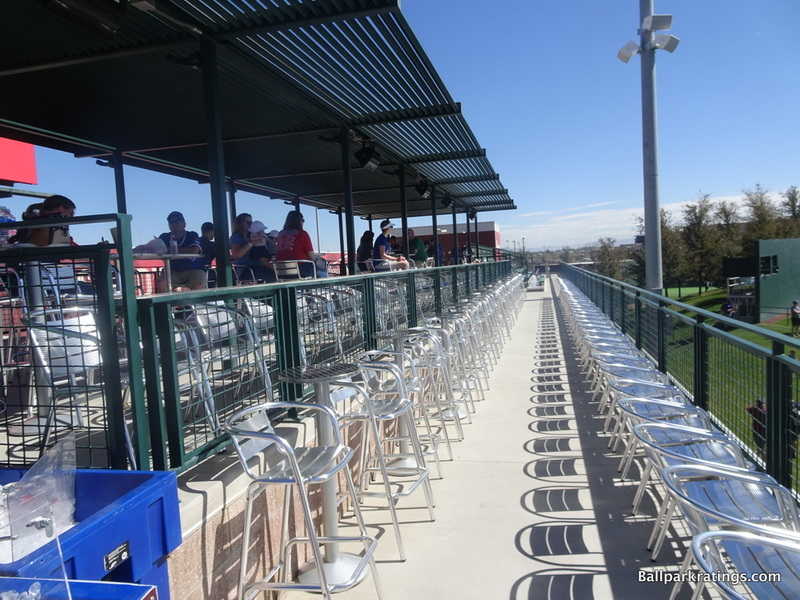 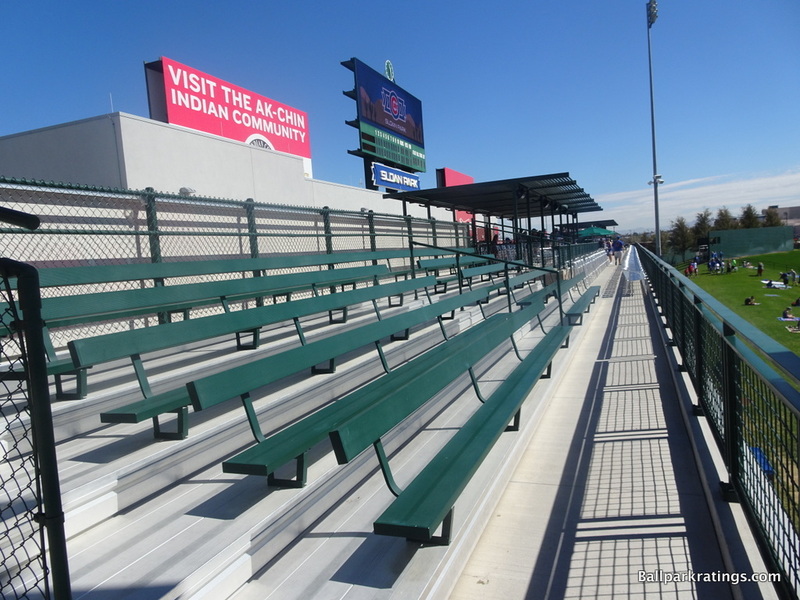 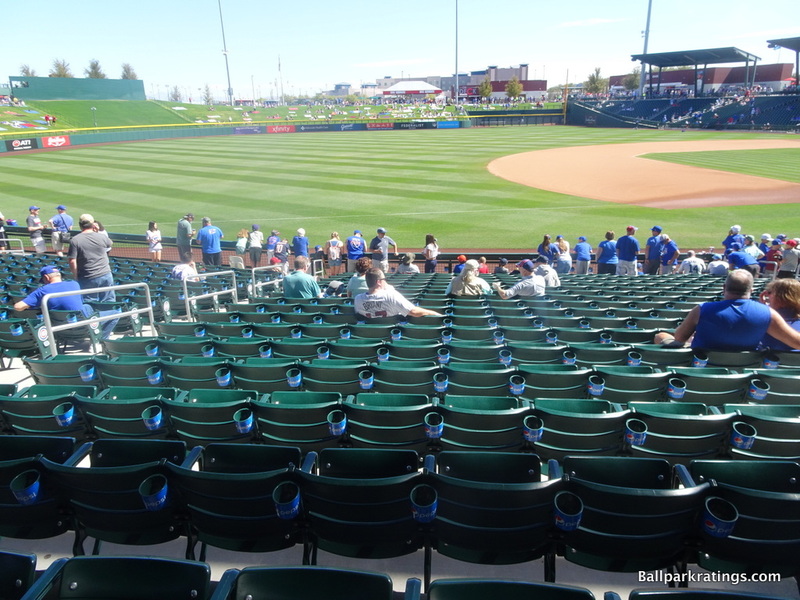 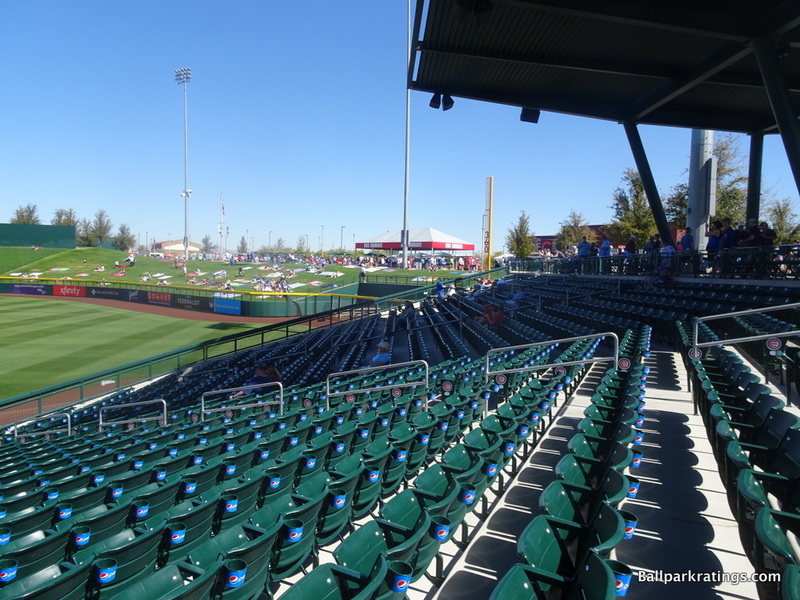 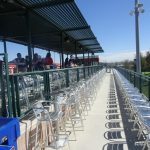 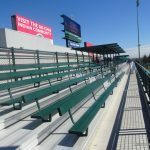 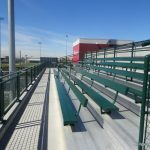 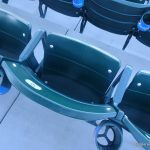 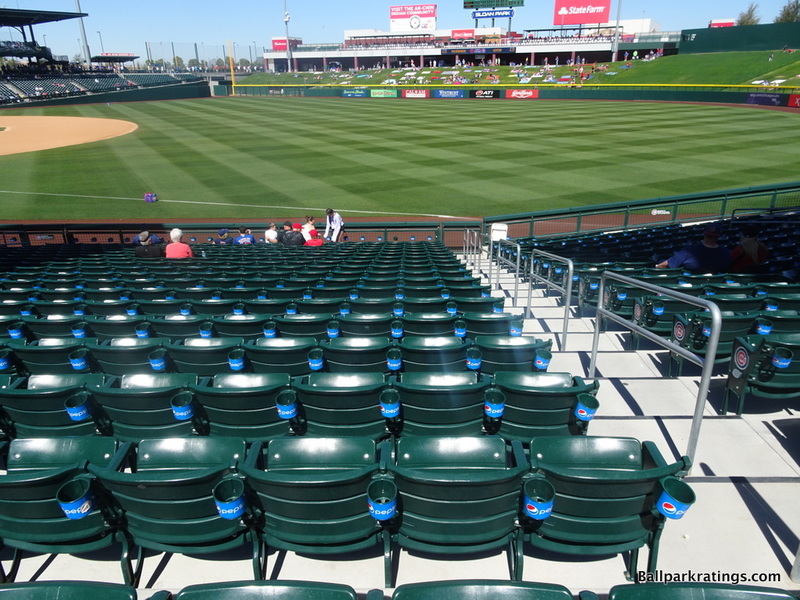 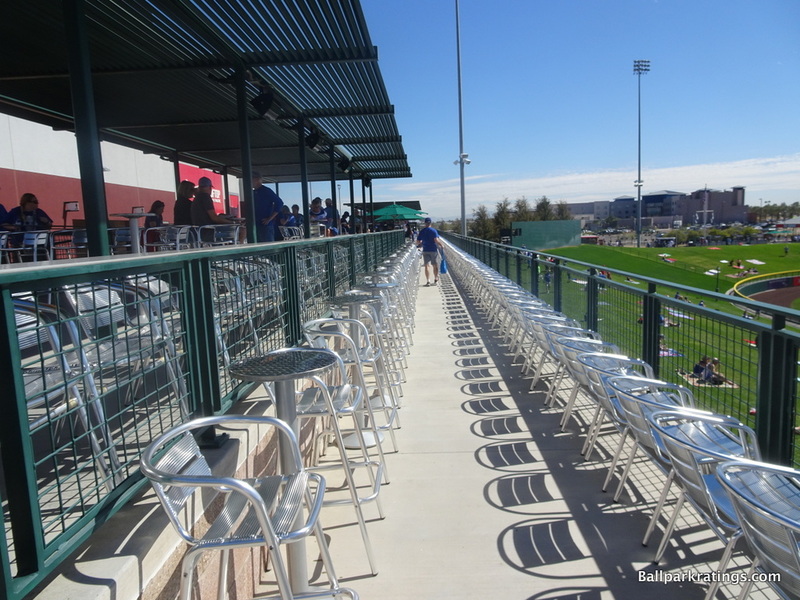 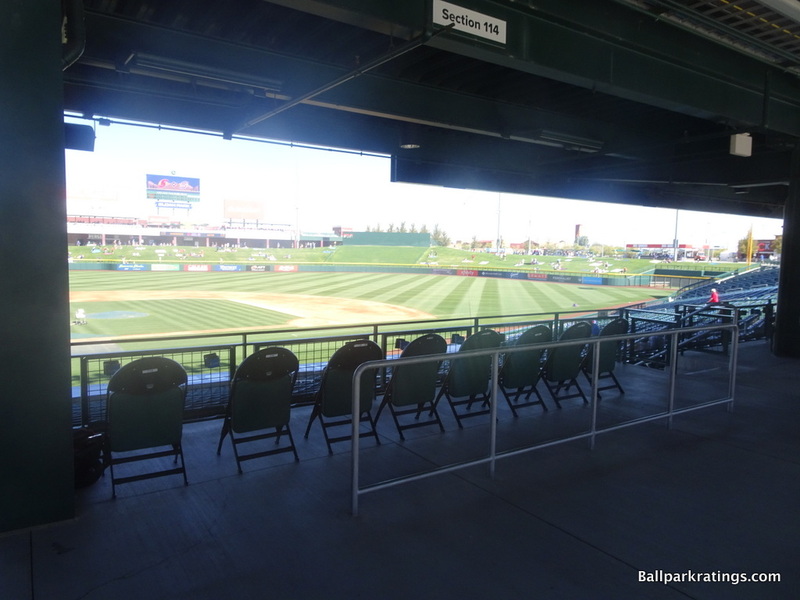 While not outstanding for a new park, Sloan Park has a fair number of premium seating options and group areas. 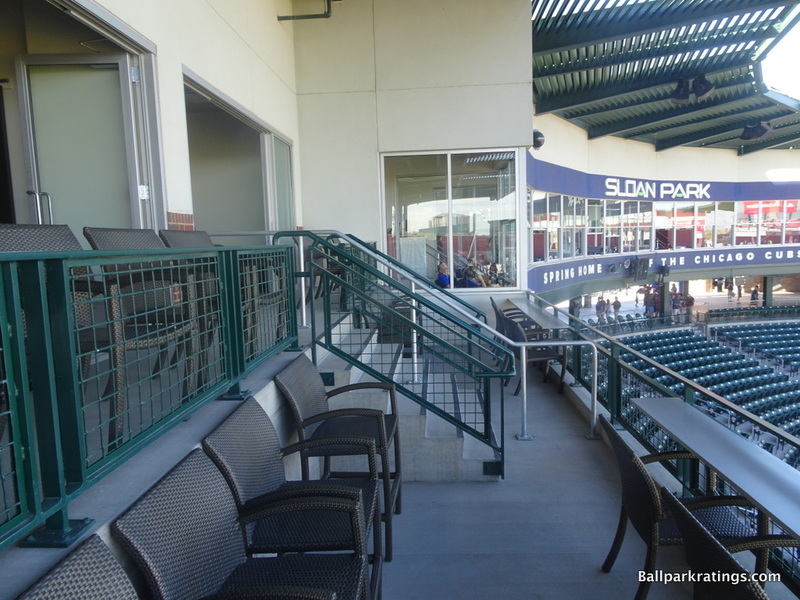 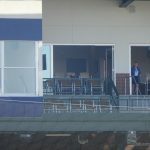 Two huge hospitality decks with metal seating are located on the mezzanine down the first and third base line. 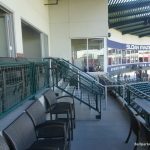 Six stylish luxury suites featuring movable wicker chairs fill out the mezzanine adjacent to the press box. 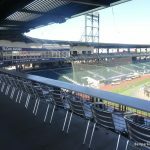 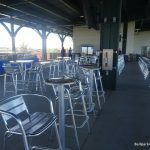 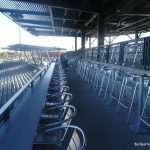 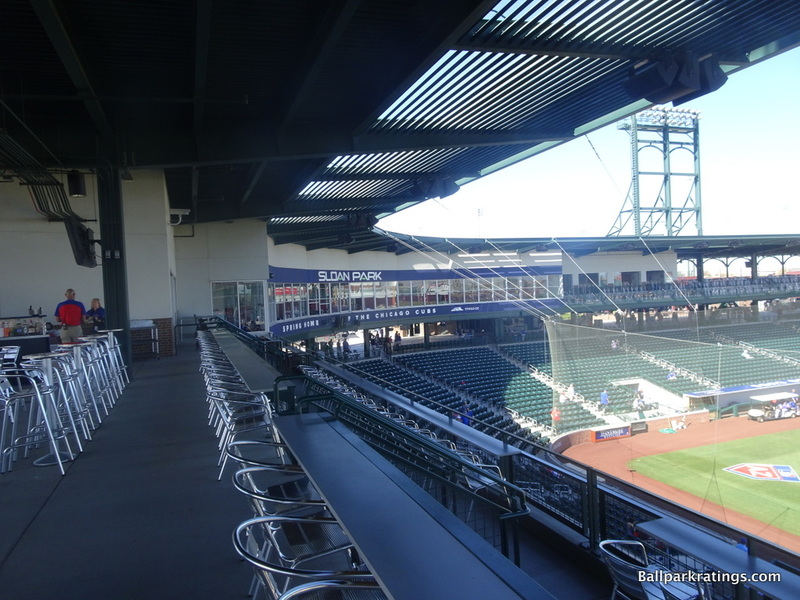 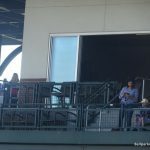 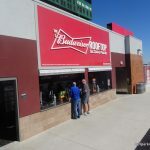 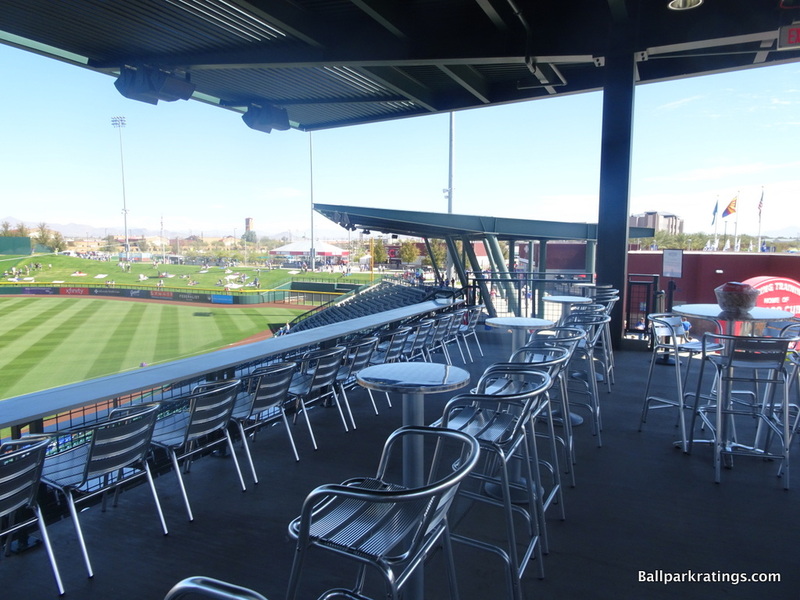 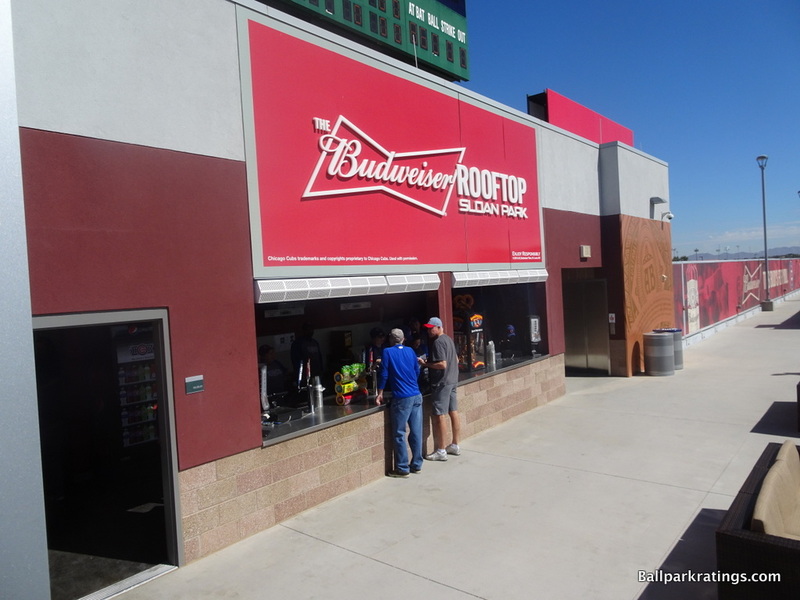 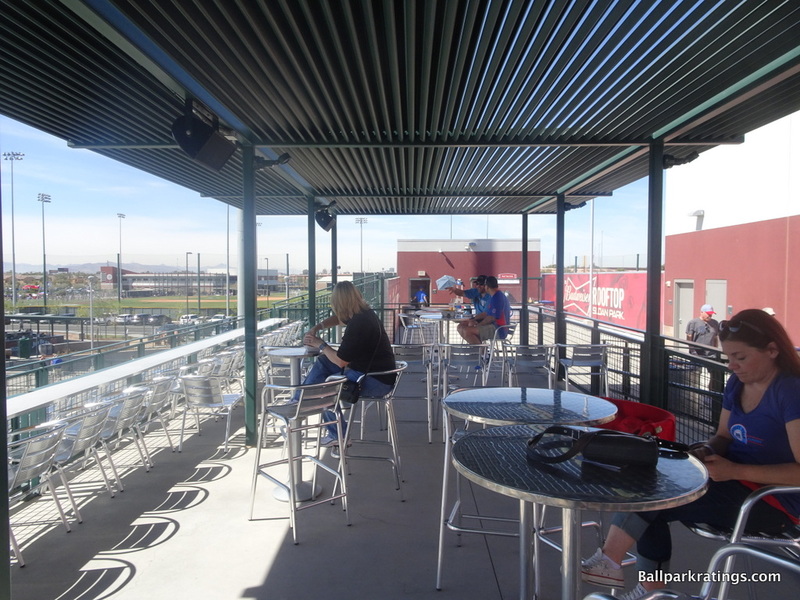 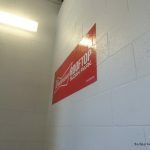 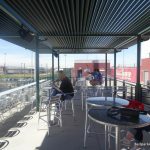 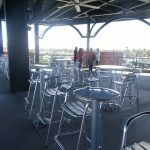 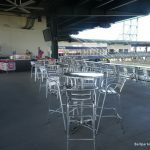 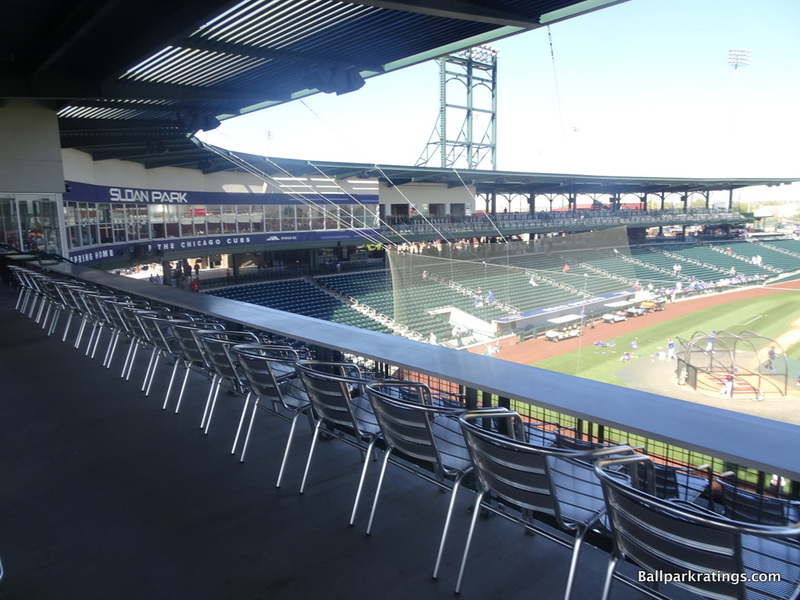 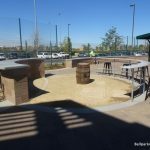 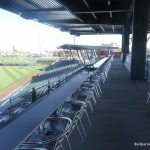 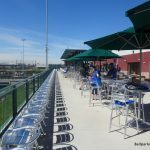 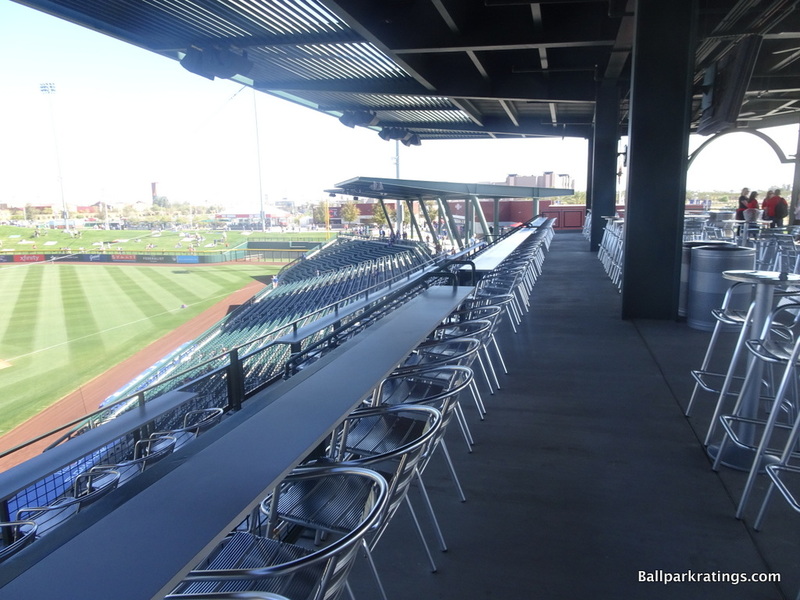 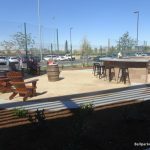 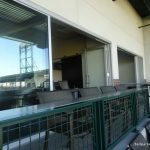 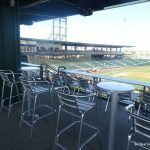 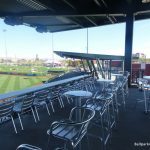 Sloan Park’s most unique exclusive space is the Budweiser Rooftop overlooking left field. 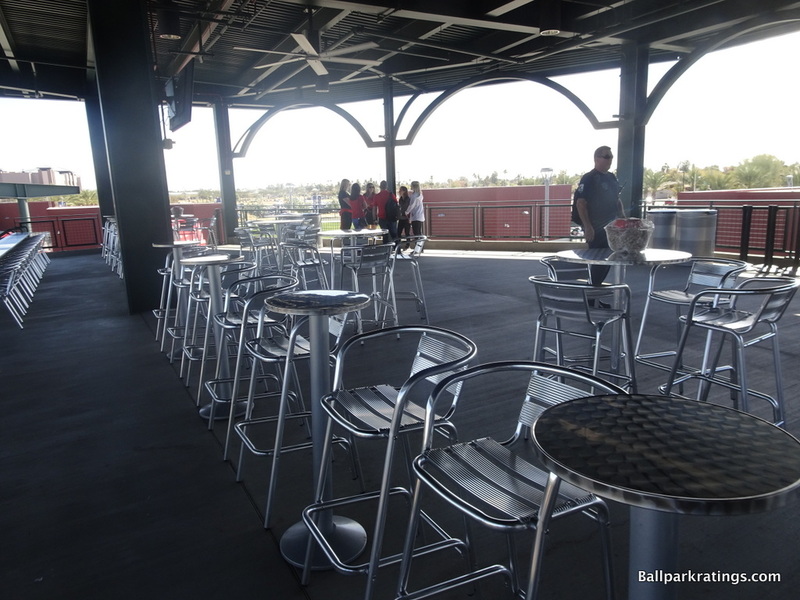 The multi-tiered space has general admission seating but requires a special ticket. 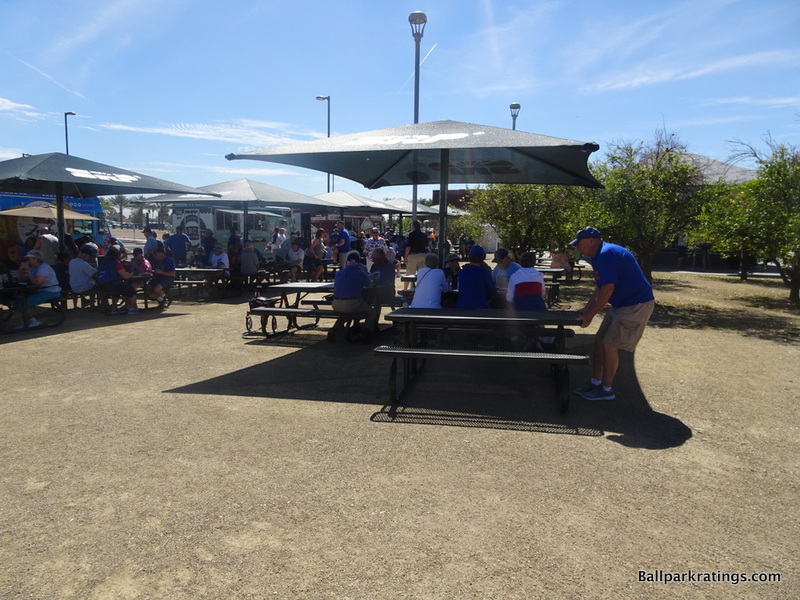 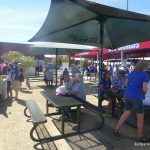 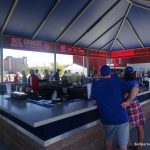 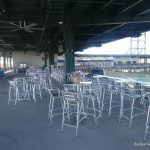 Featuring make-shift bars, couches, tables, shaded patios, movable metal chairs, and bleachers, this is a great place to hang out before or during the game. 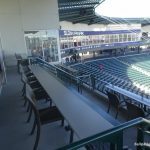 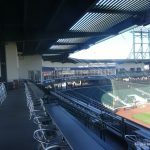 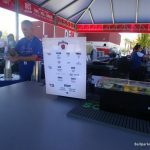 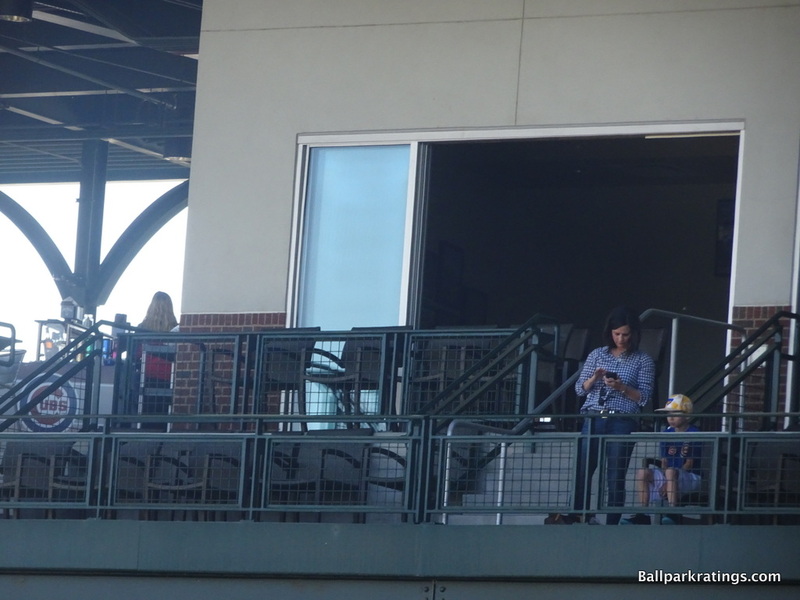 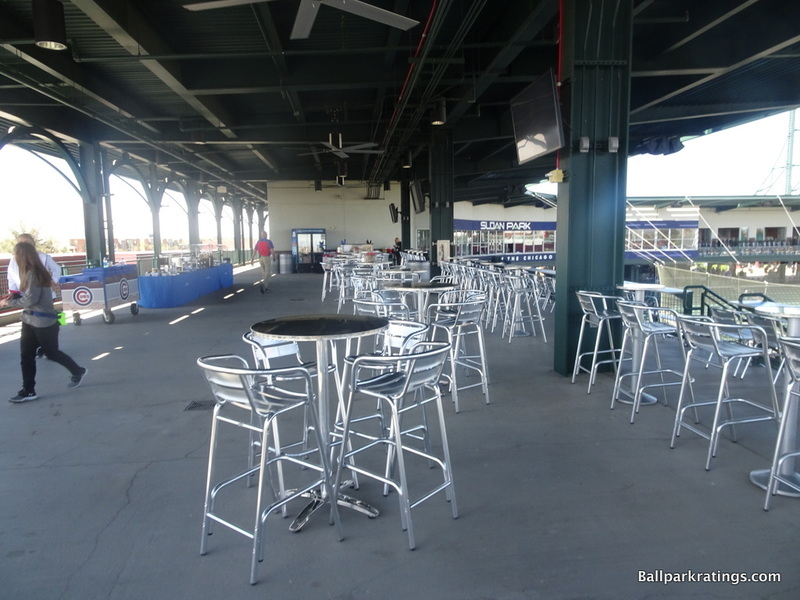 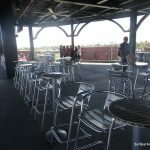 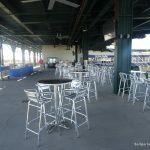 Most fans watch the entire game from here, but this space can also function as a standalone “stadium club” for pregame socializing, as many season ticket holders buy wristbands to get access in addition to possessing a seat around the infield. 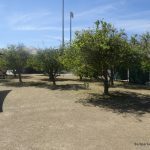 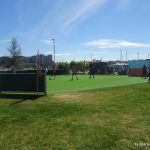 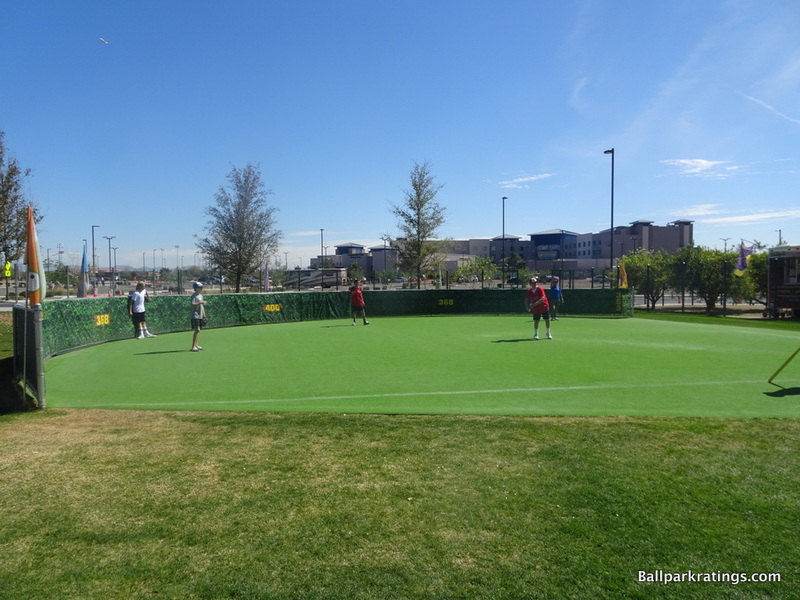 With a turf field and mock ivy, Sloan Park has a nice Wiffle ball field for the kids. 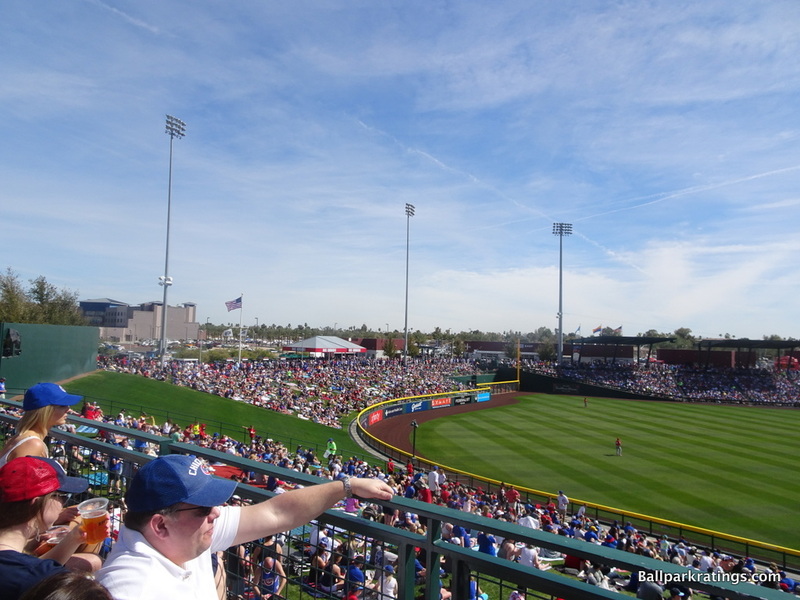 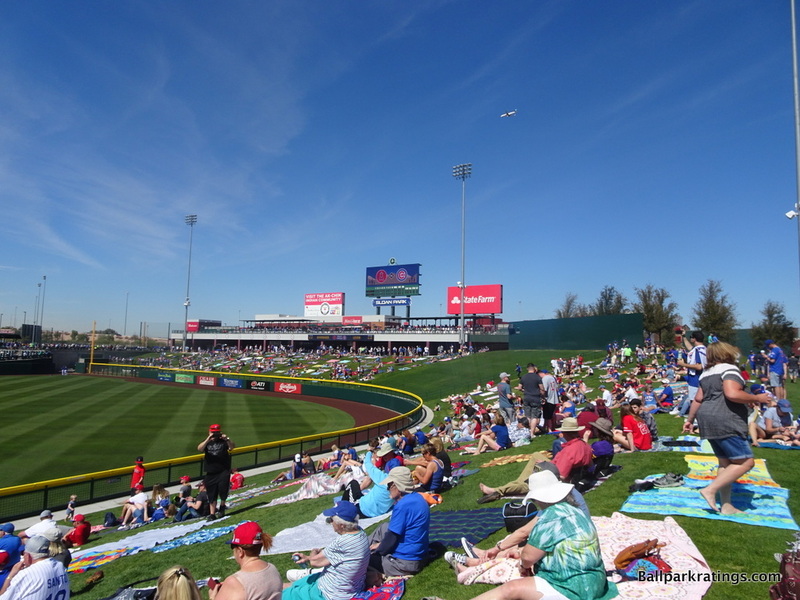 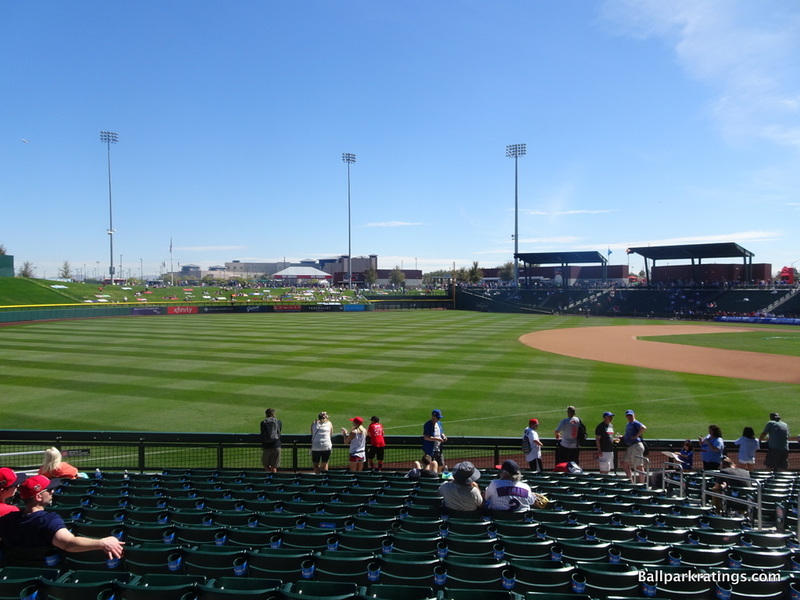 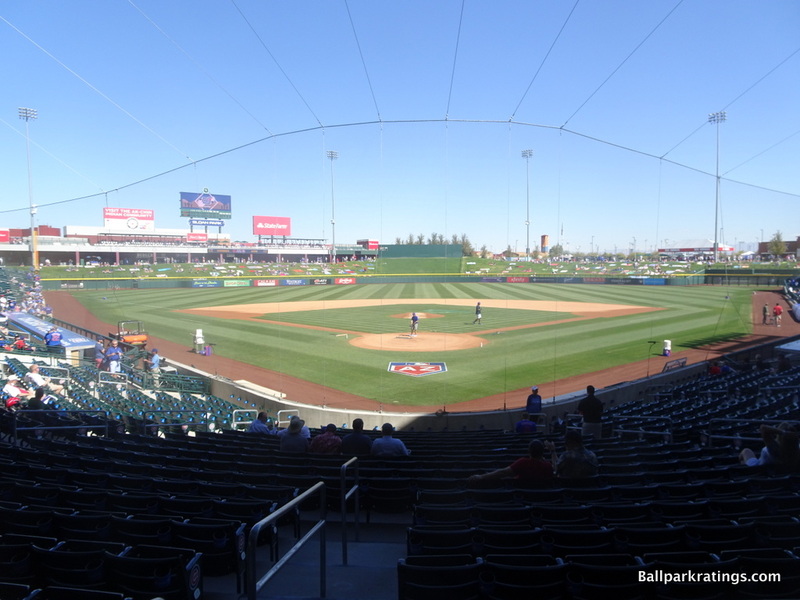 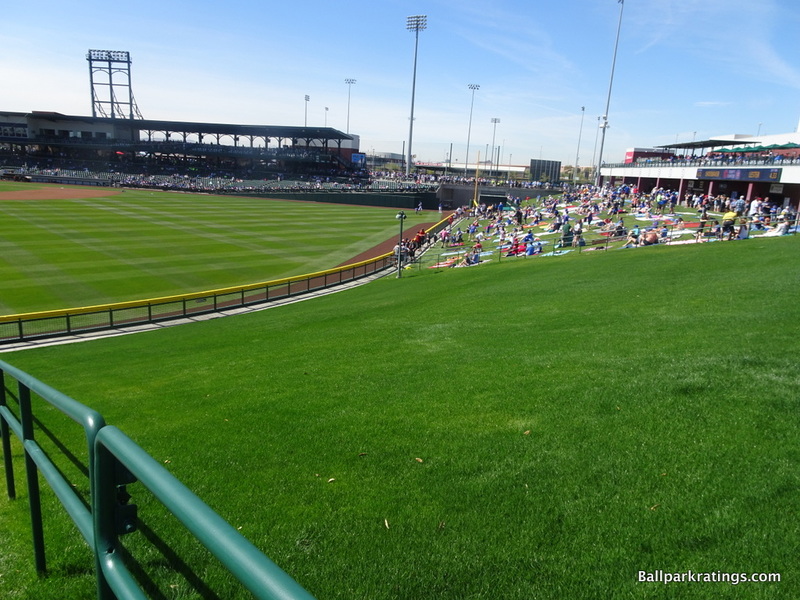 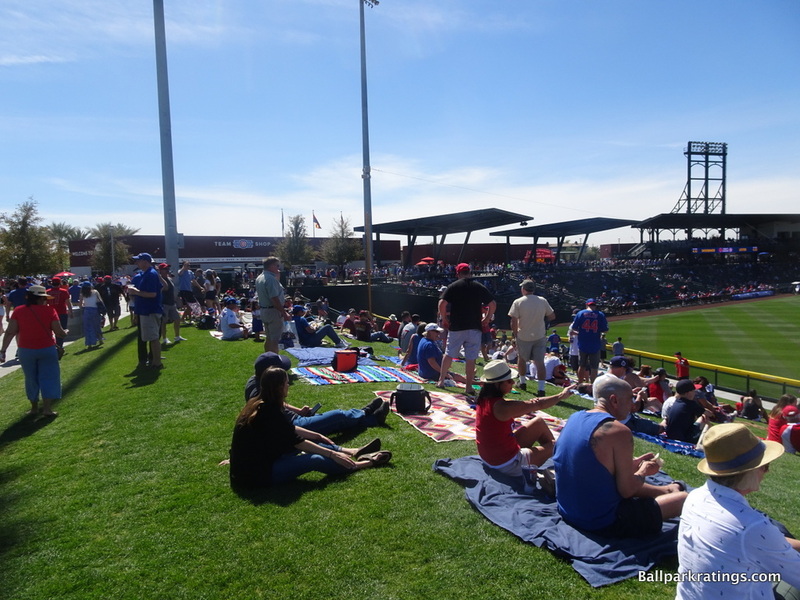 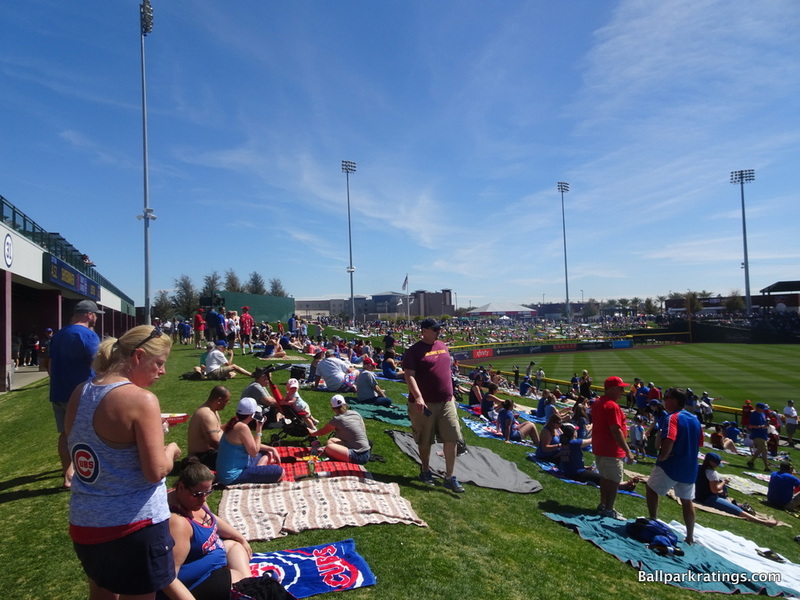 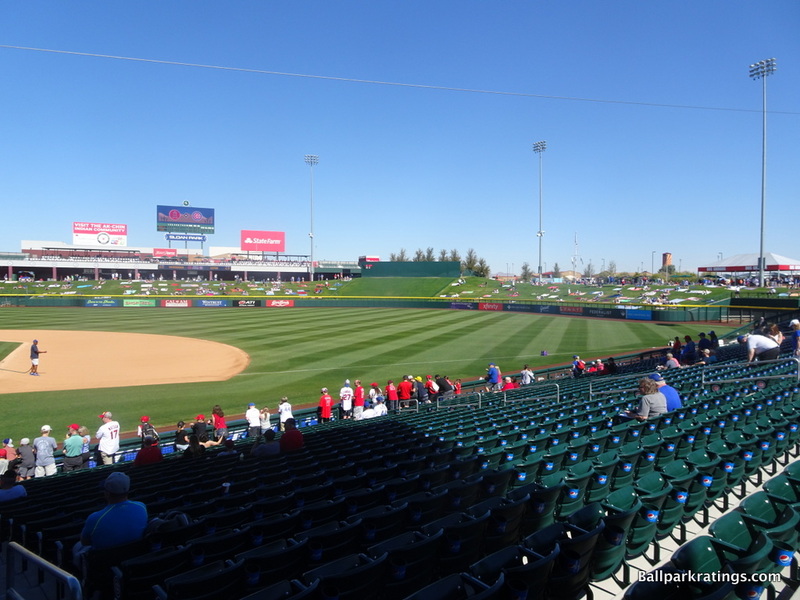 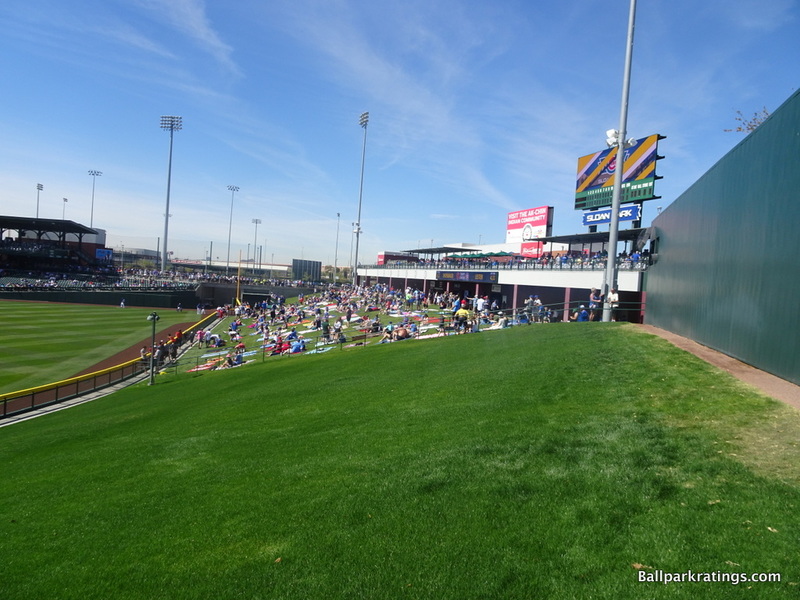 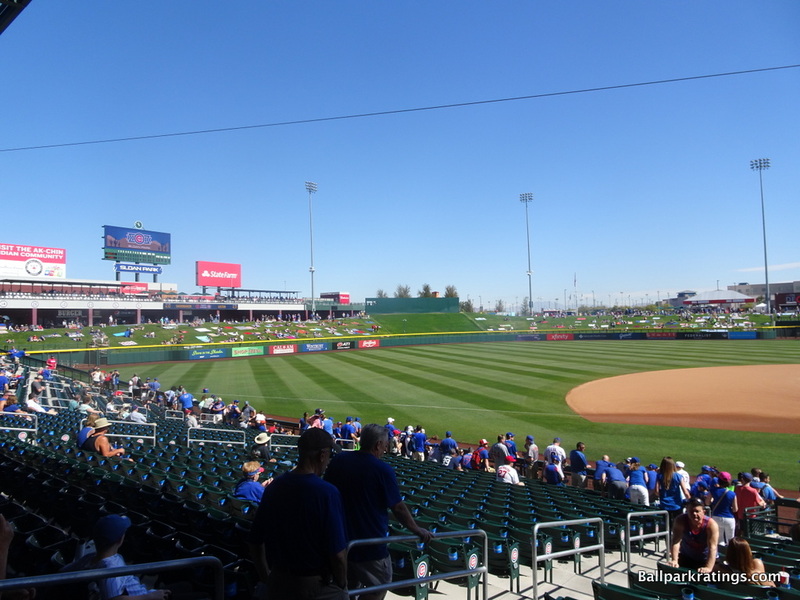 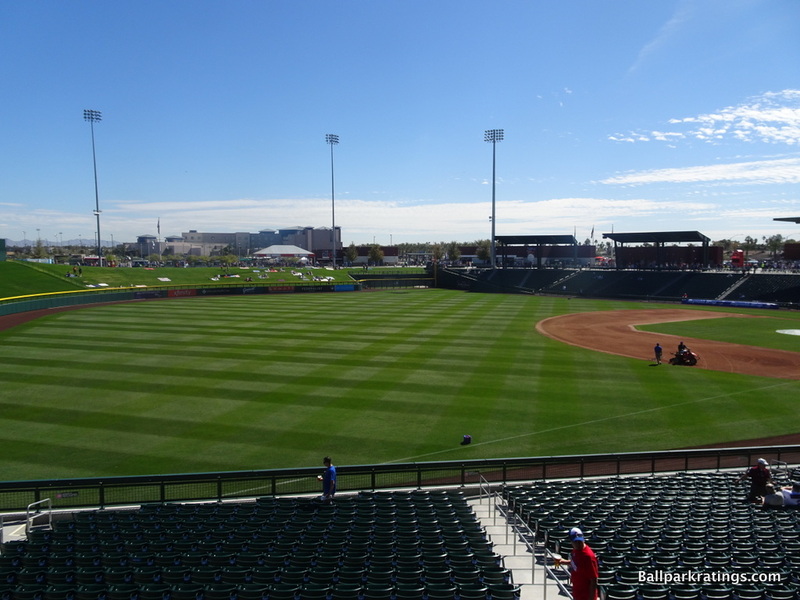 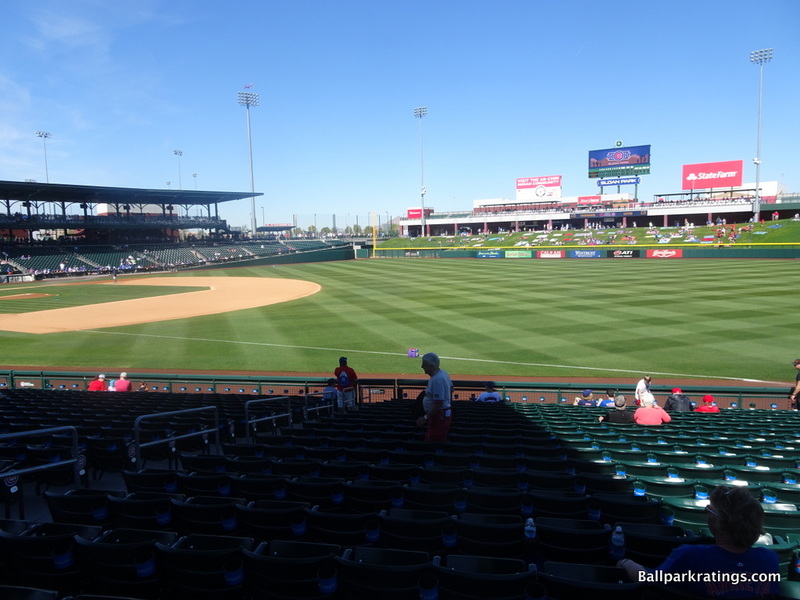 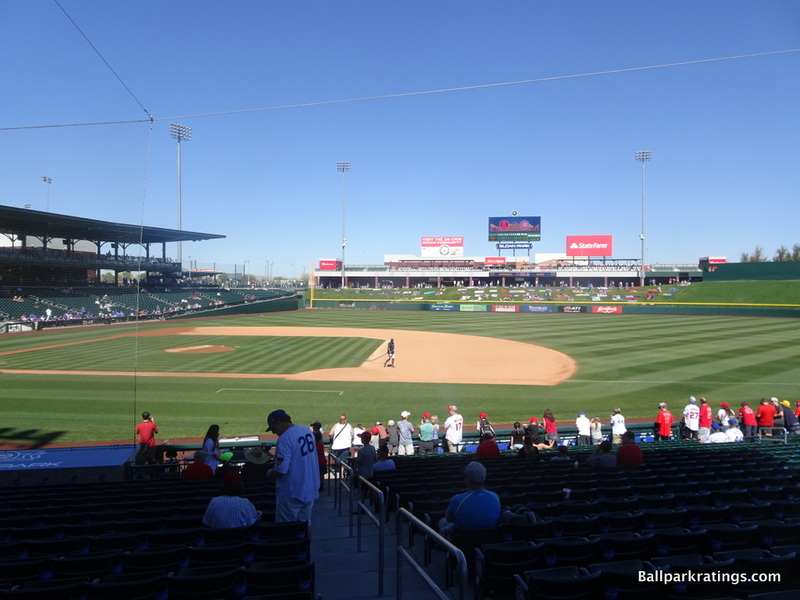 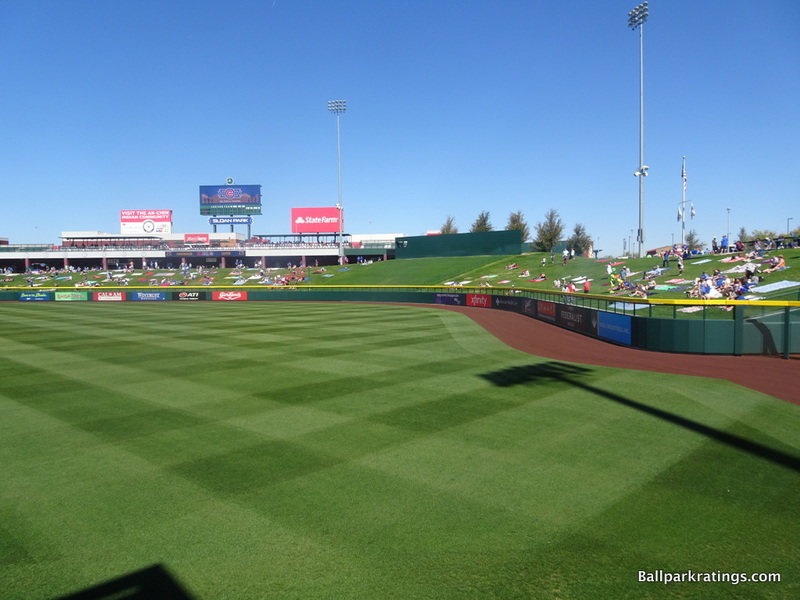 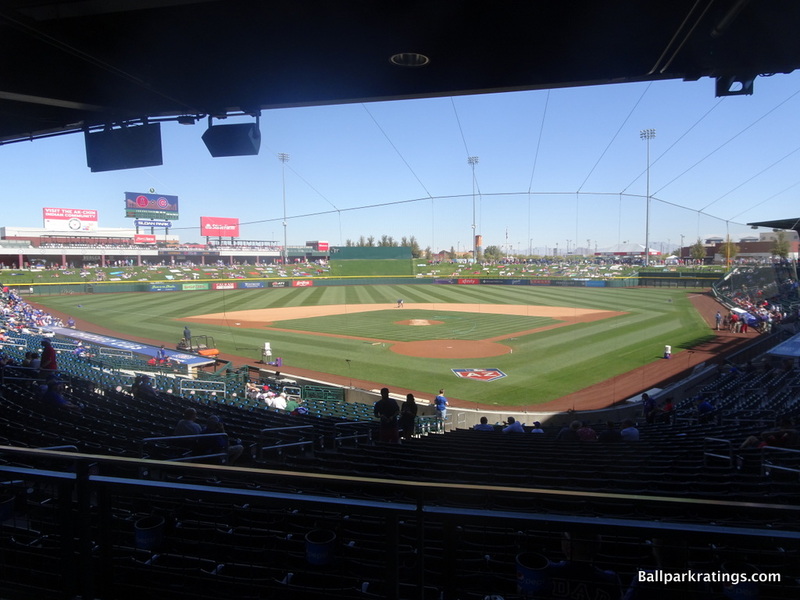 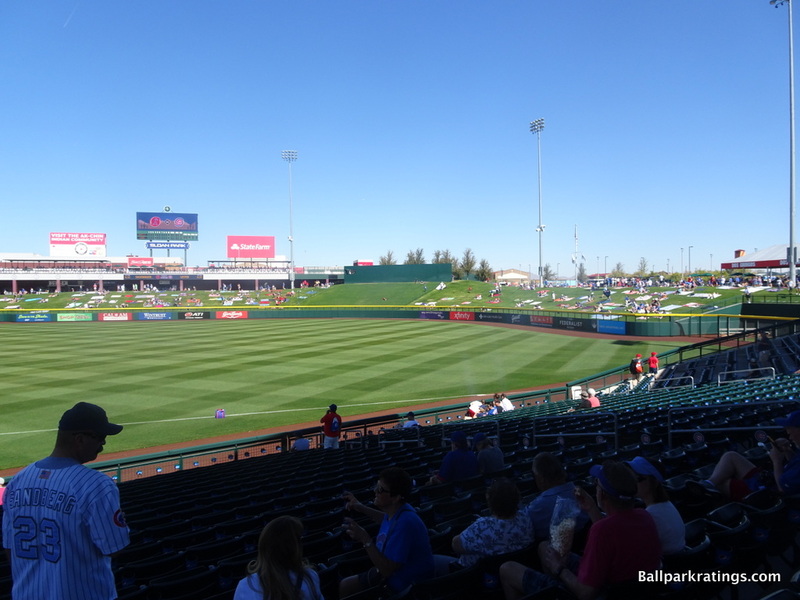 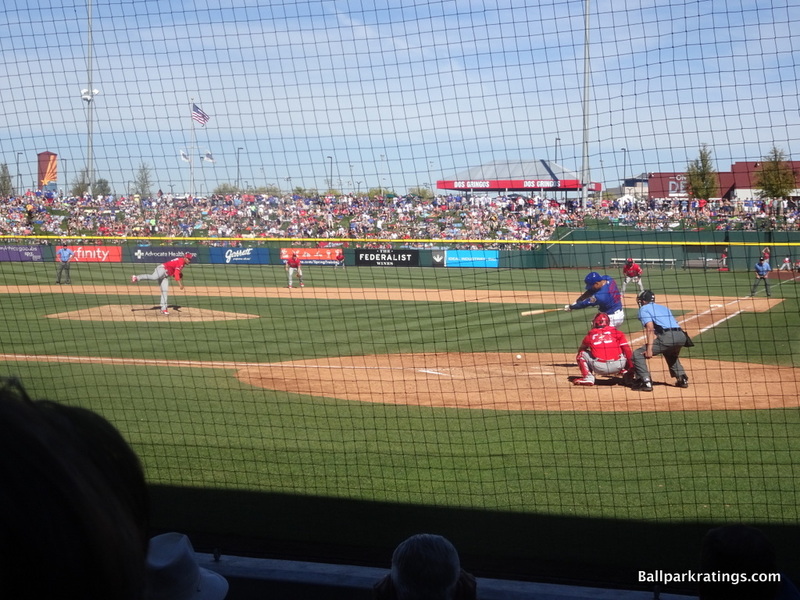 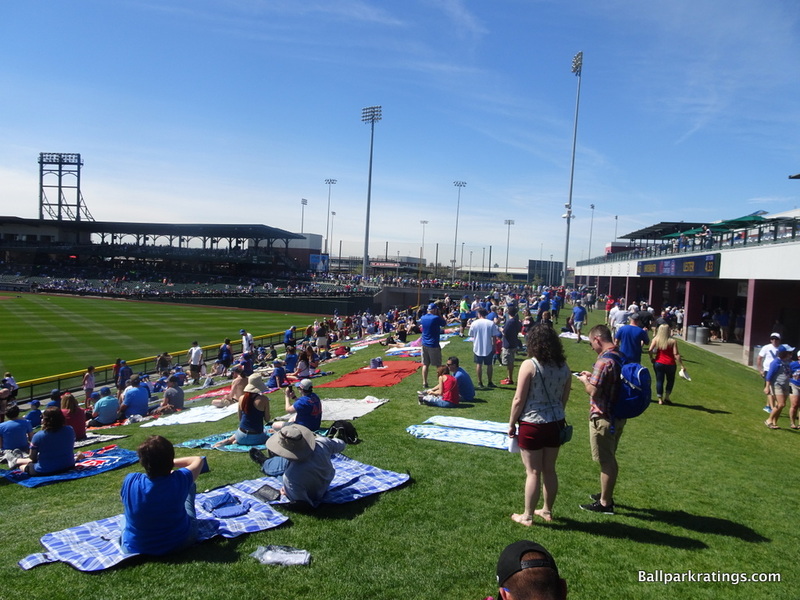 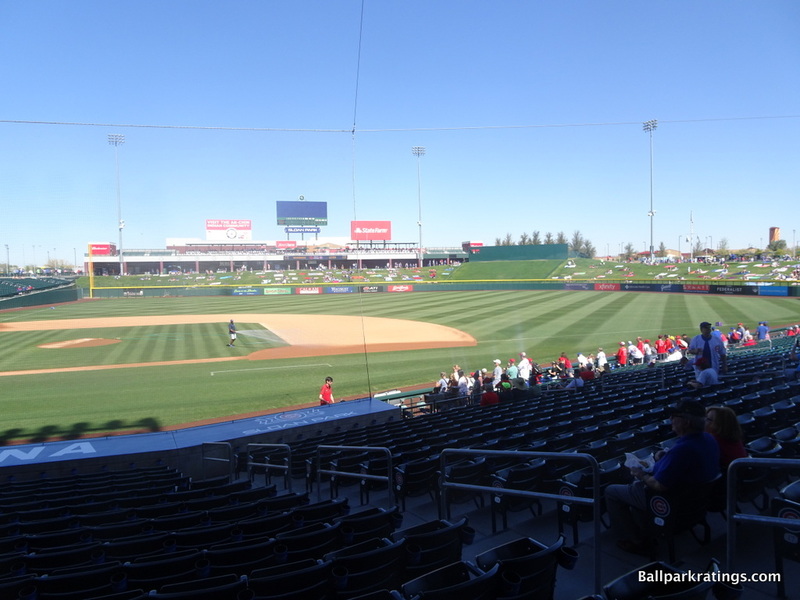 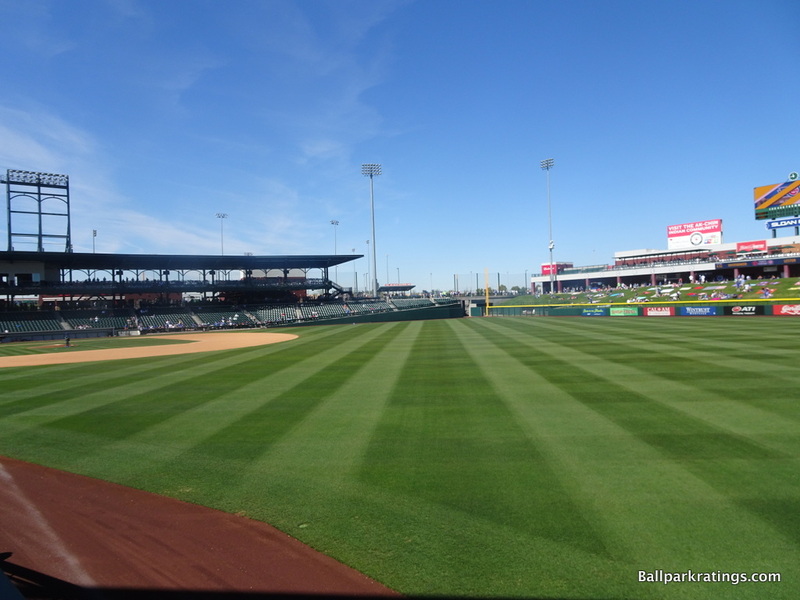 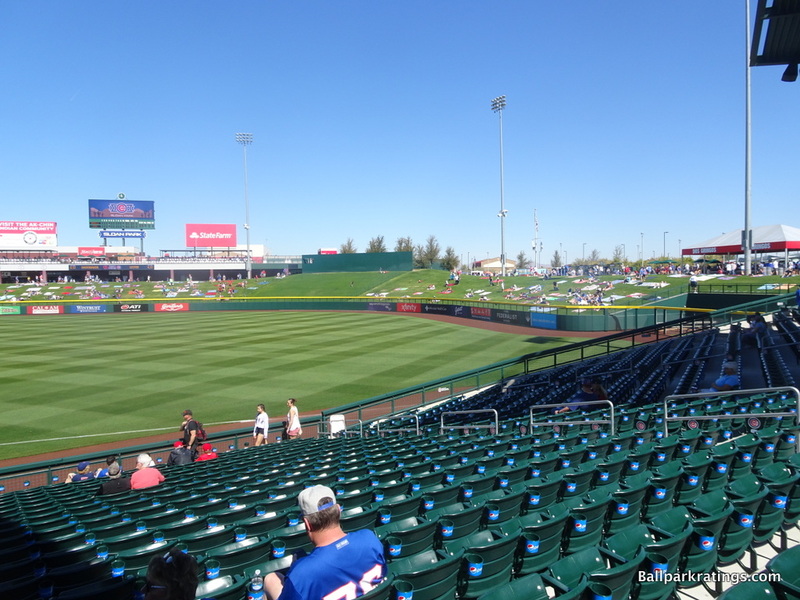 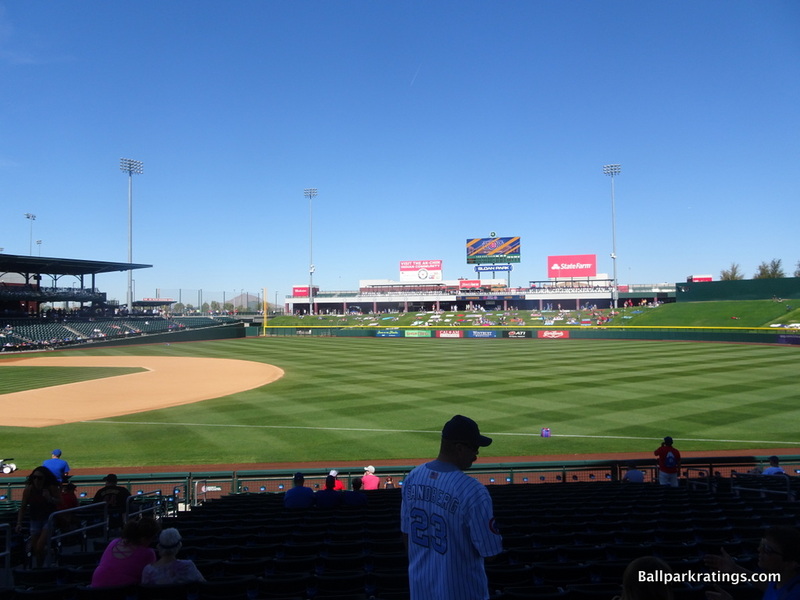 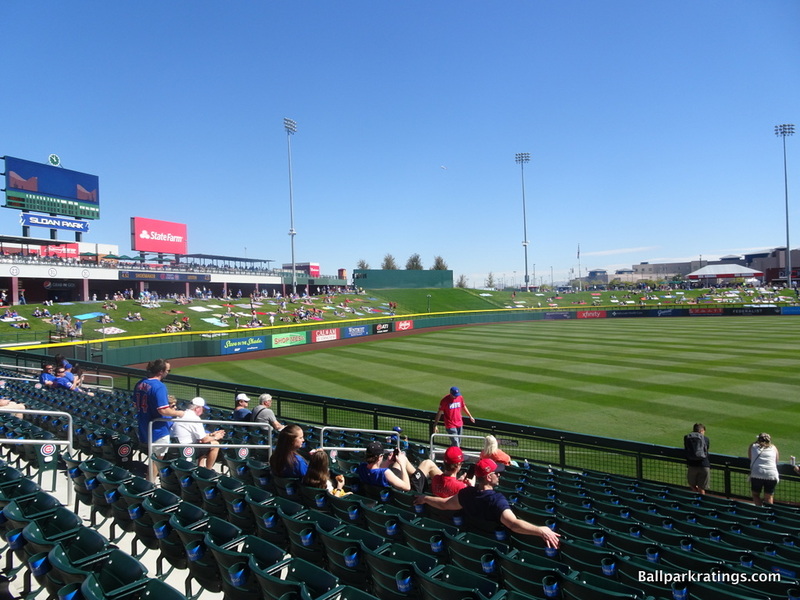 Some argue Sloan Park is the best spring training ballpark, and I wouldn’t go out of my way to quibble with them. 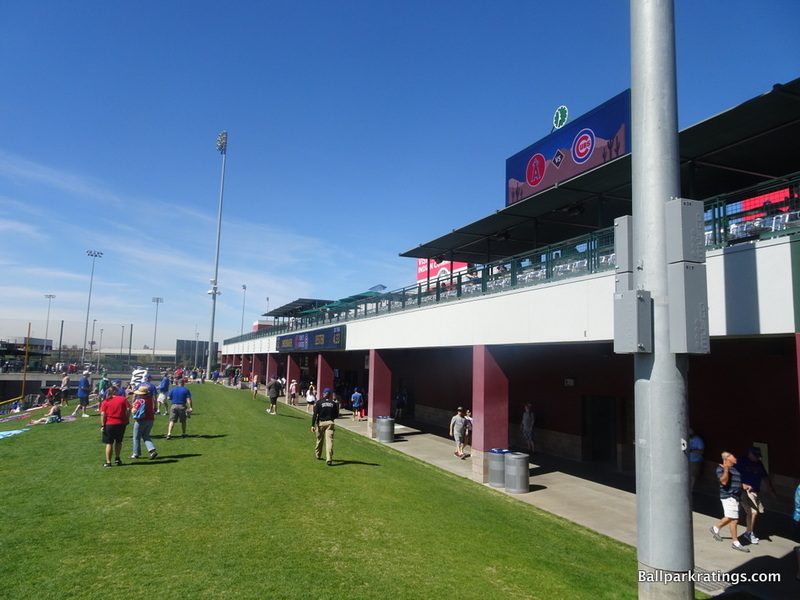 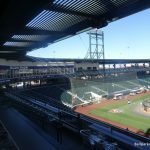 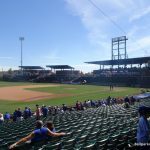 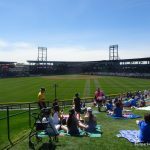 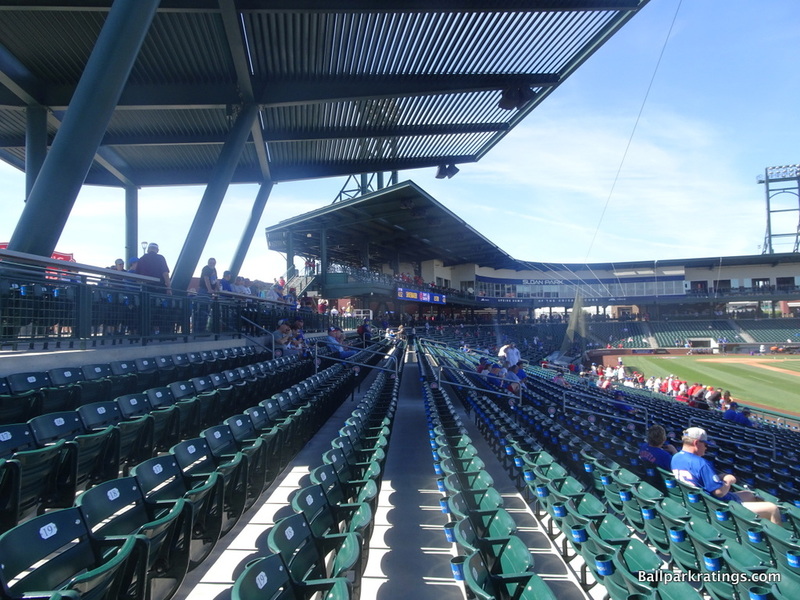 It has most of the requisite features of other top-tier Cactus League facilities while recalling one of the greatest venues in all of sports, Wrigley Field. 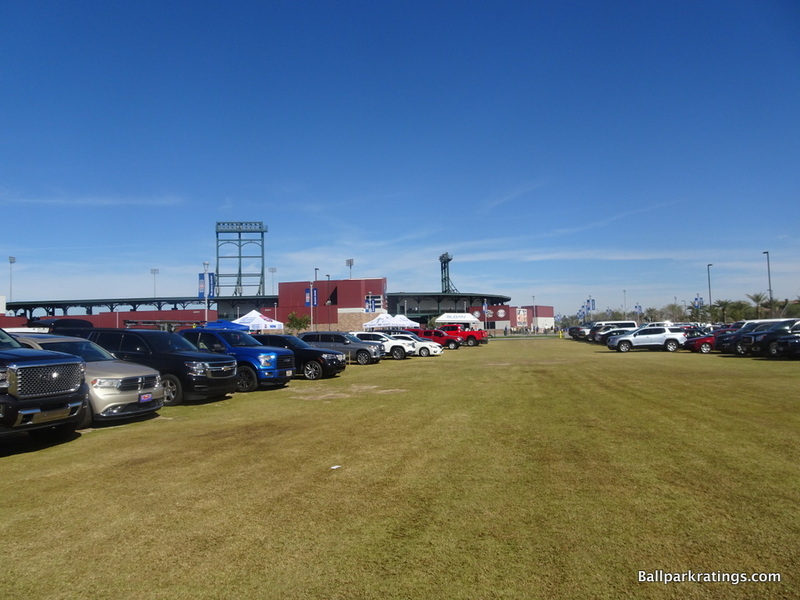 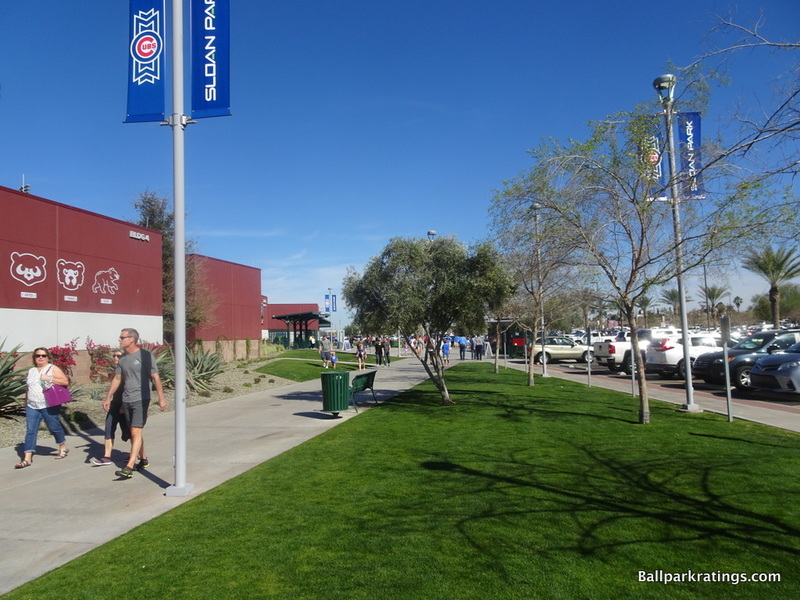 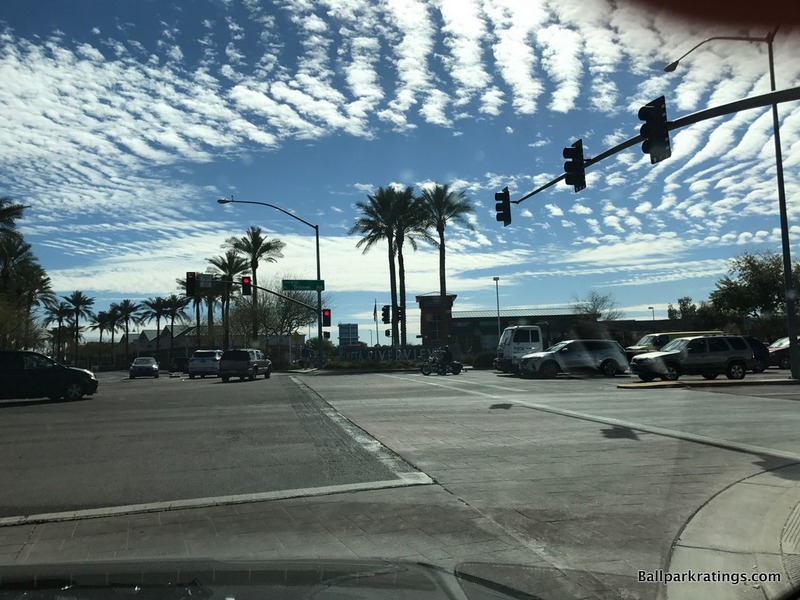 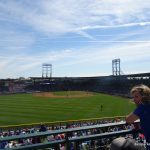 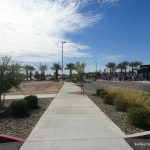 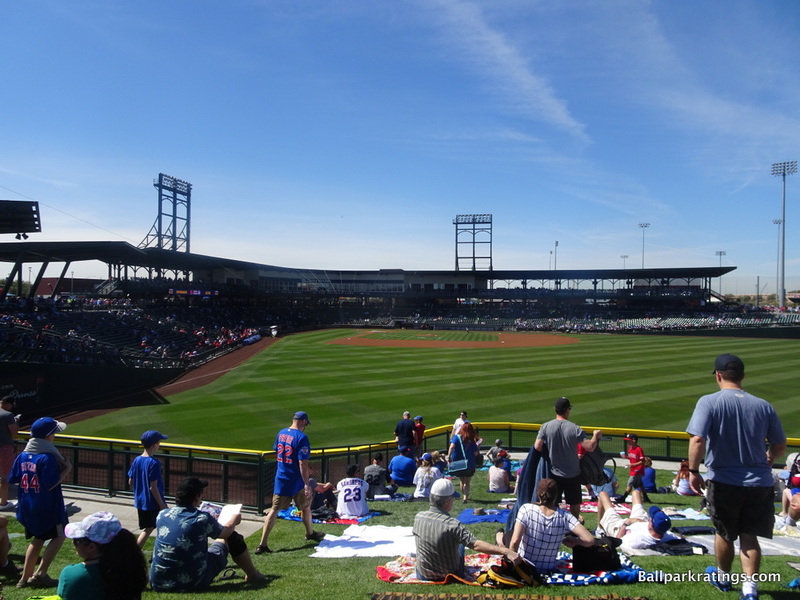 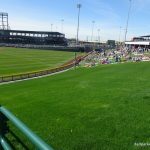 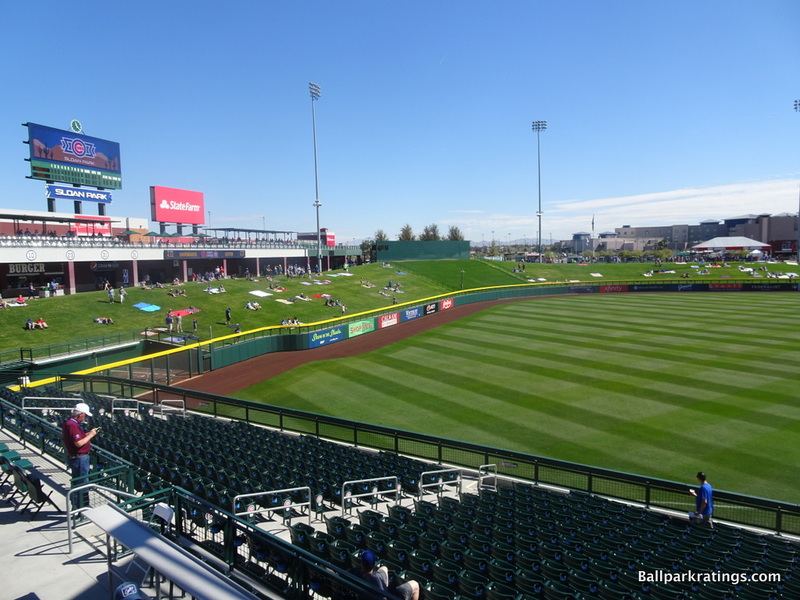 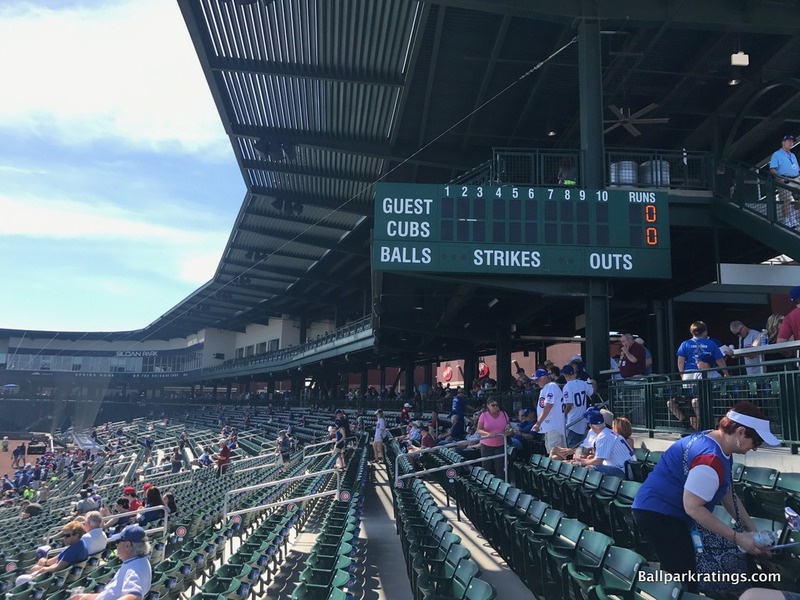 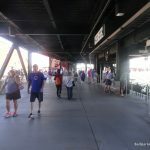 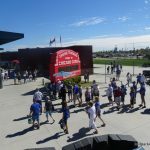 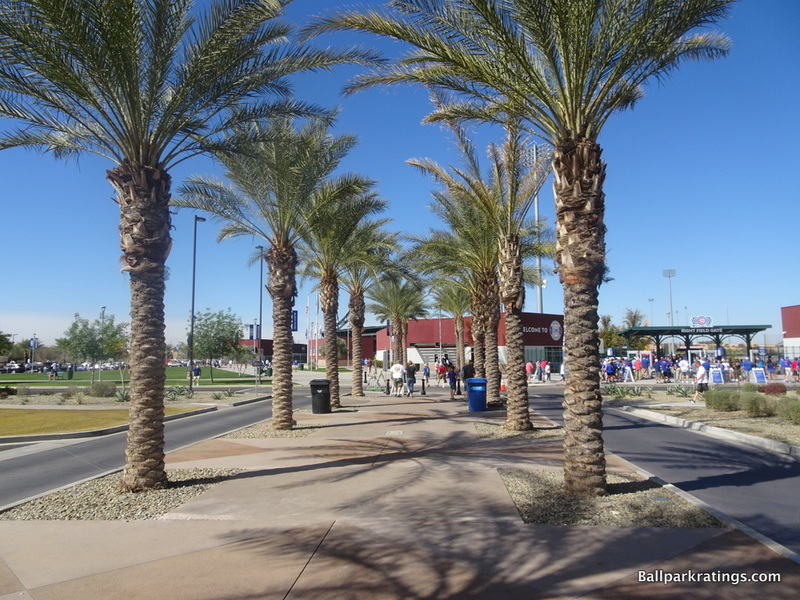 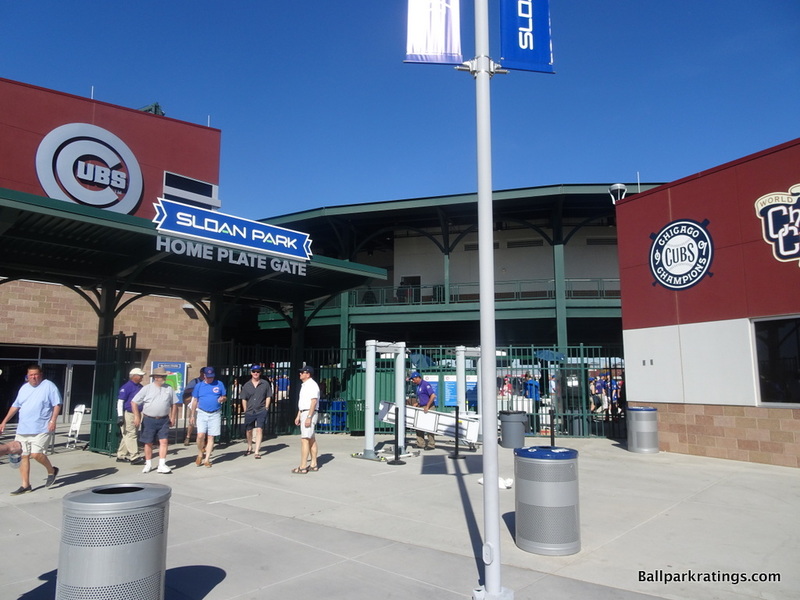 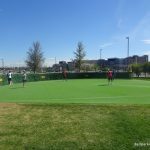 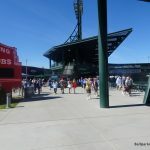 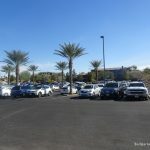 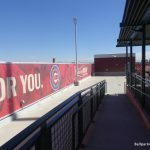 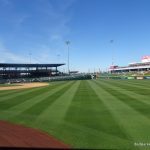 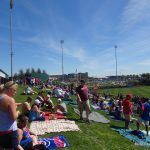 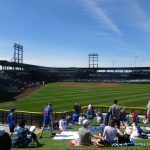 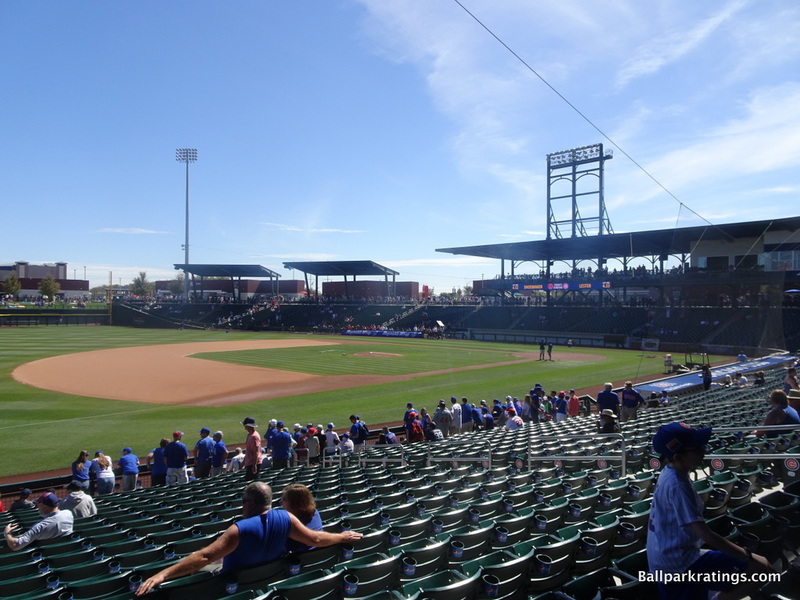 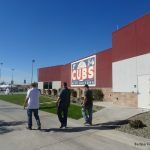 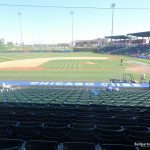 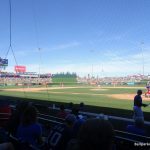 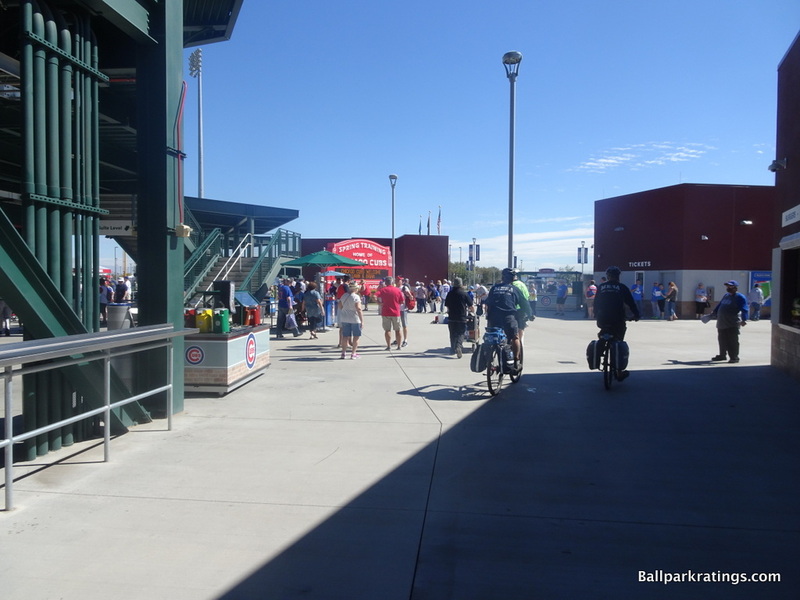 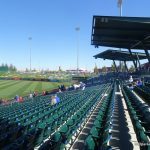 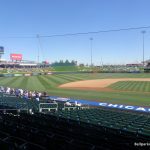 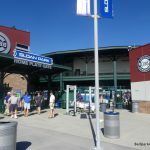 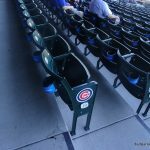 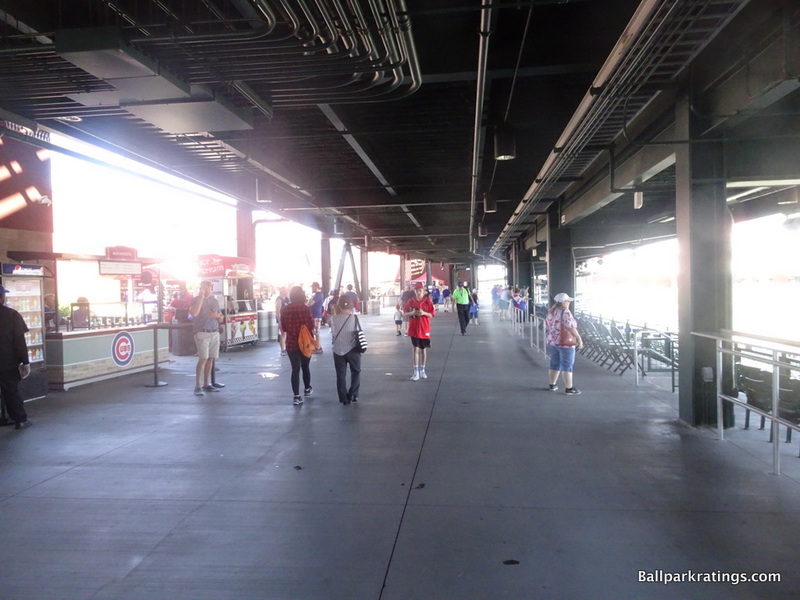 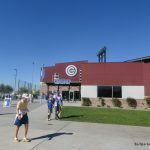 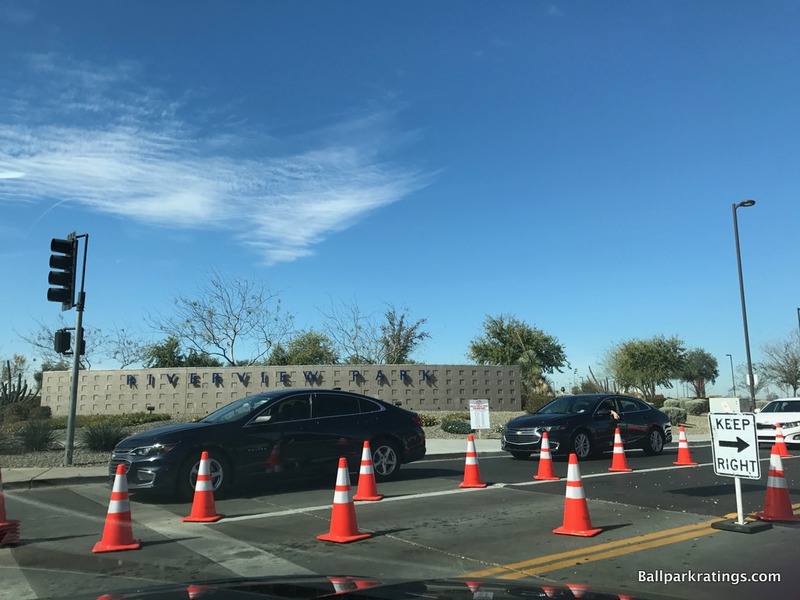 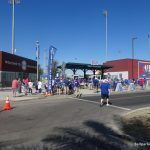 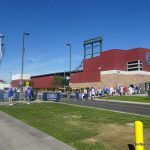 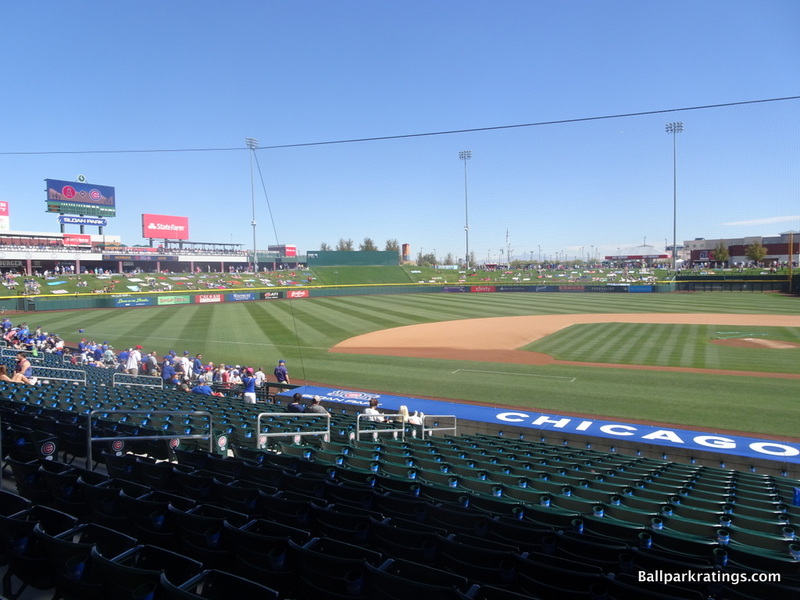 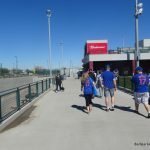 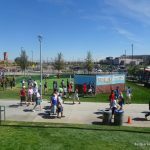 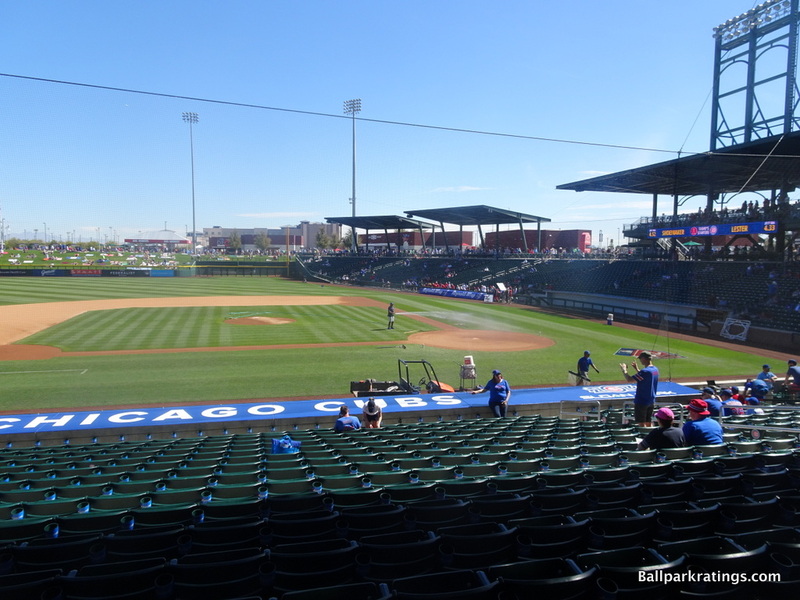 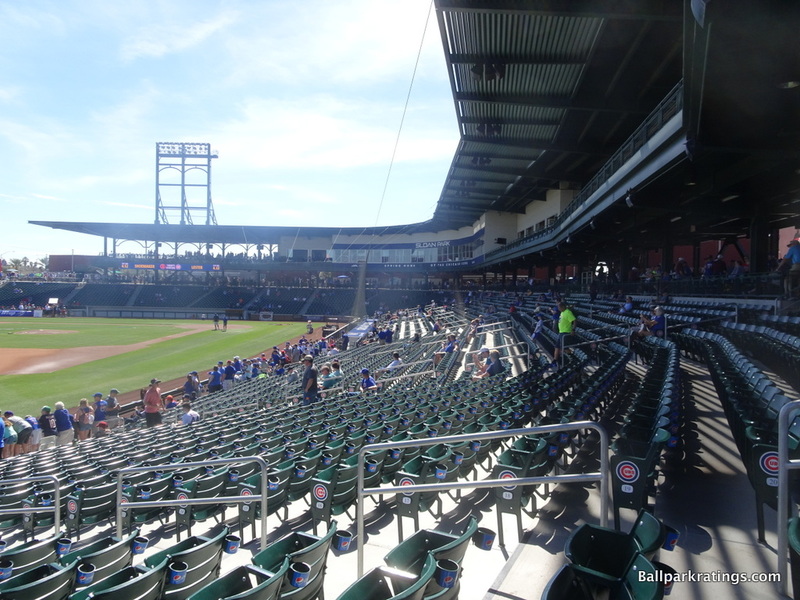 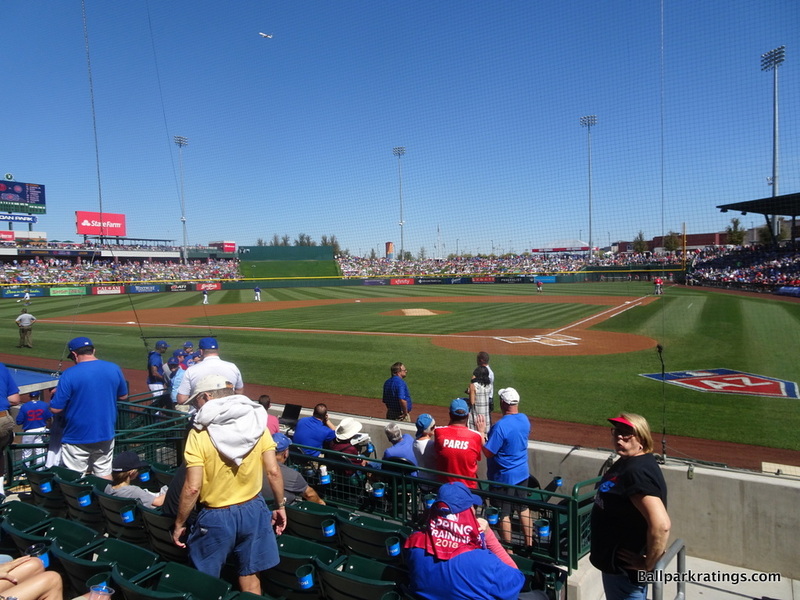 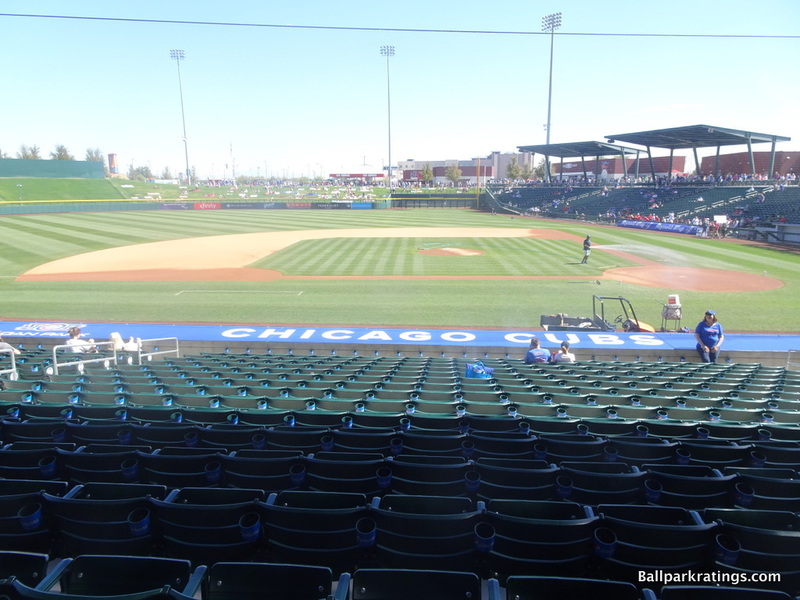 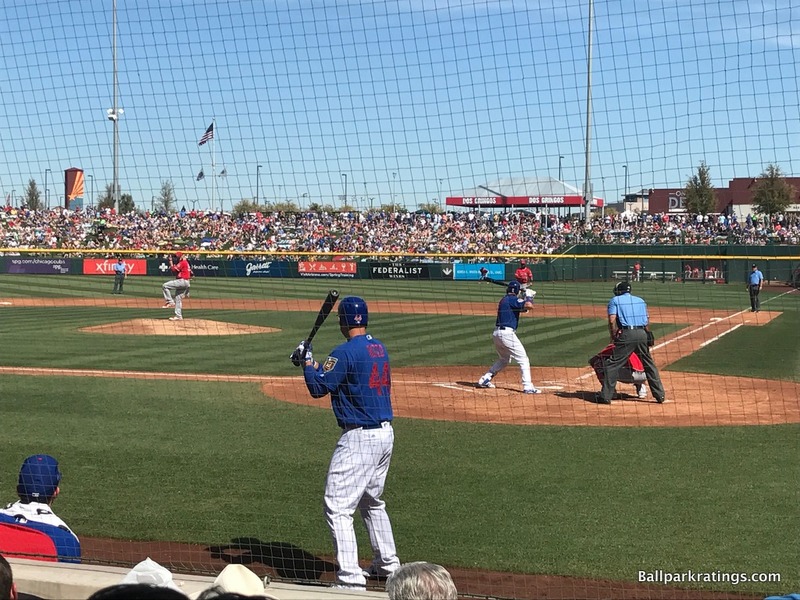 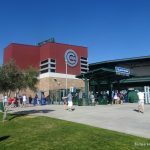 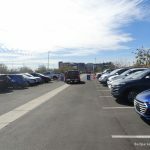 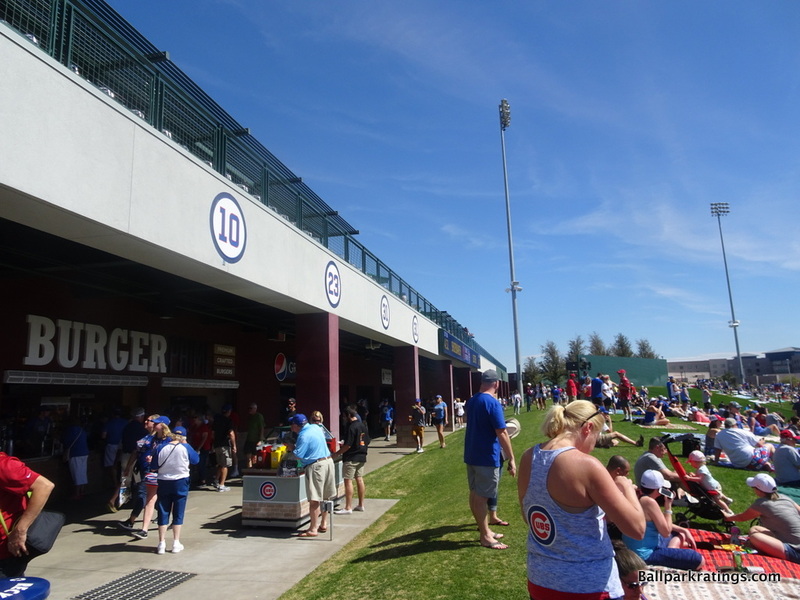 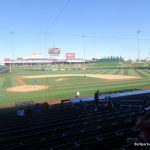 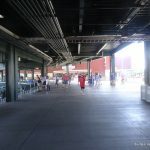 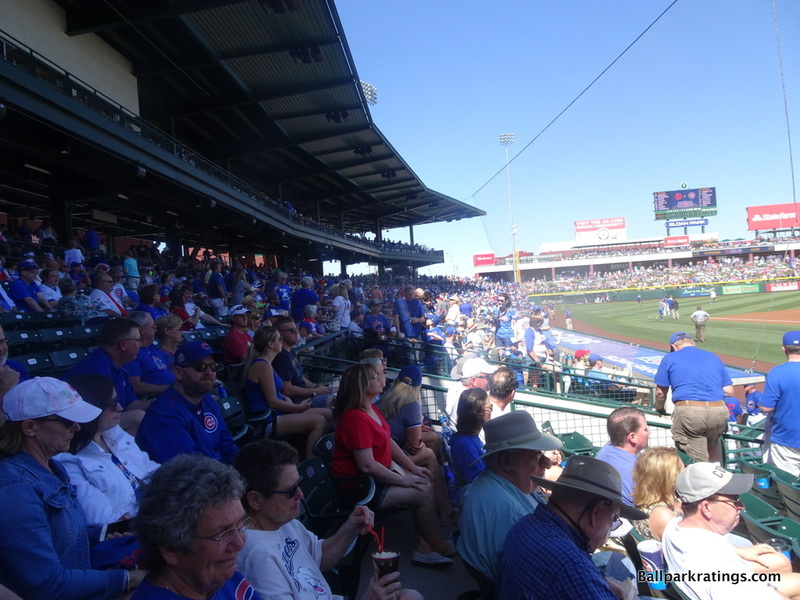 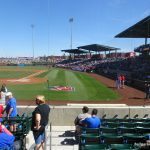 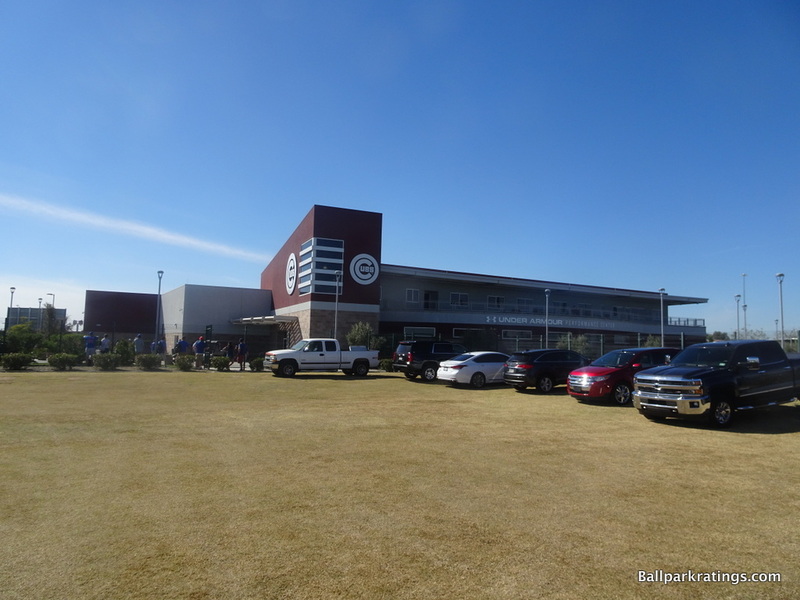 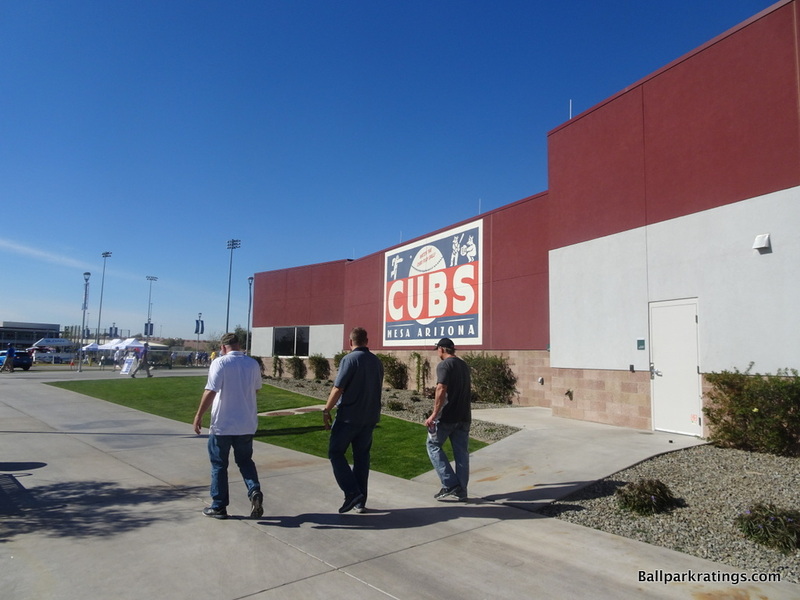 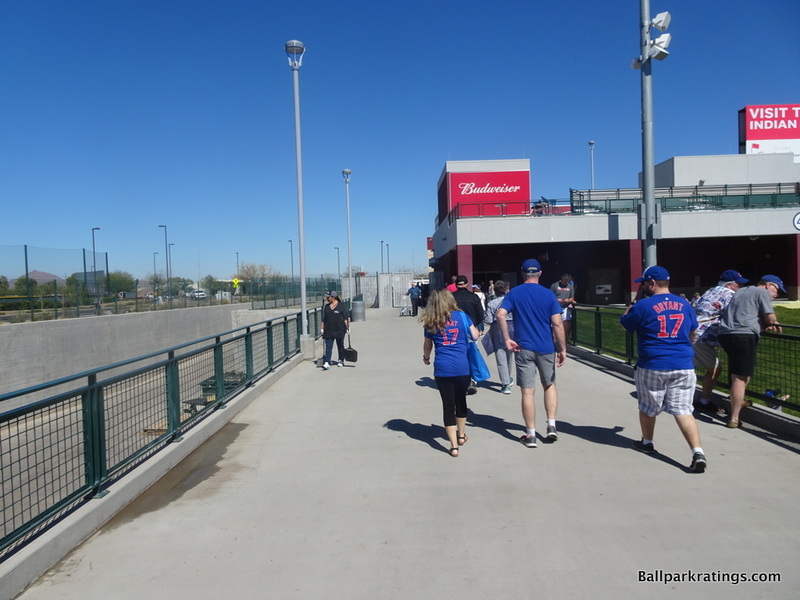 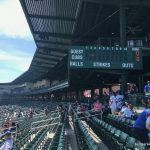 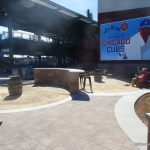 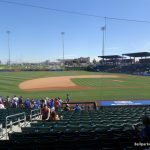 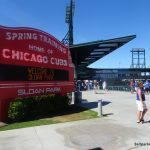 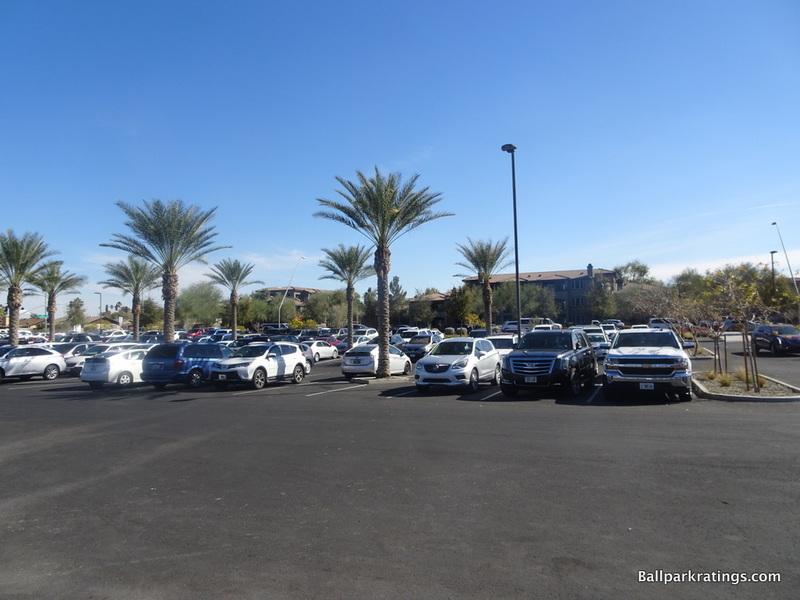 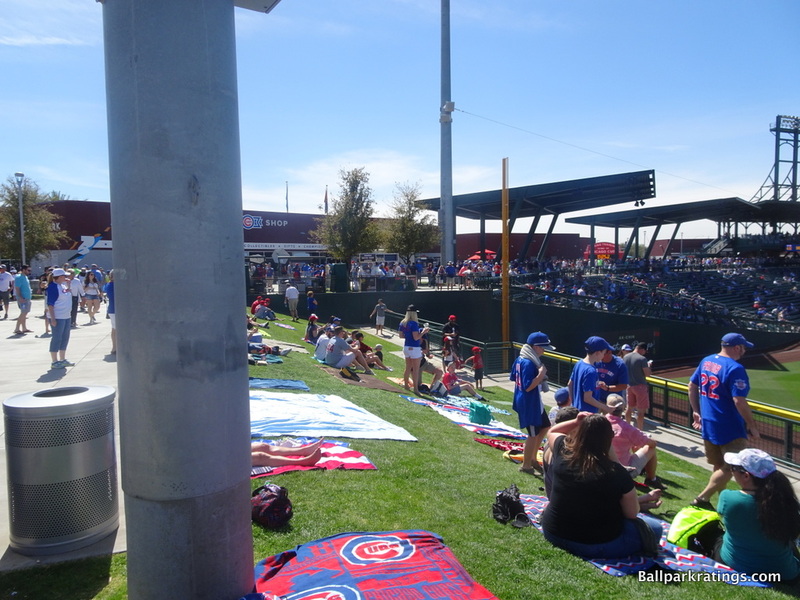 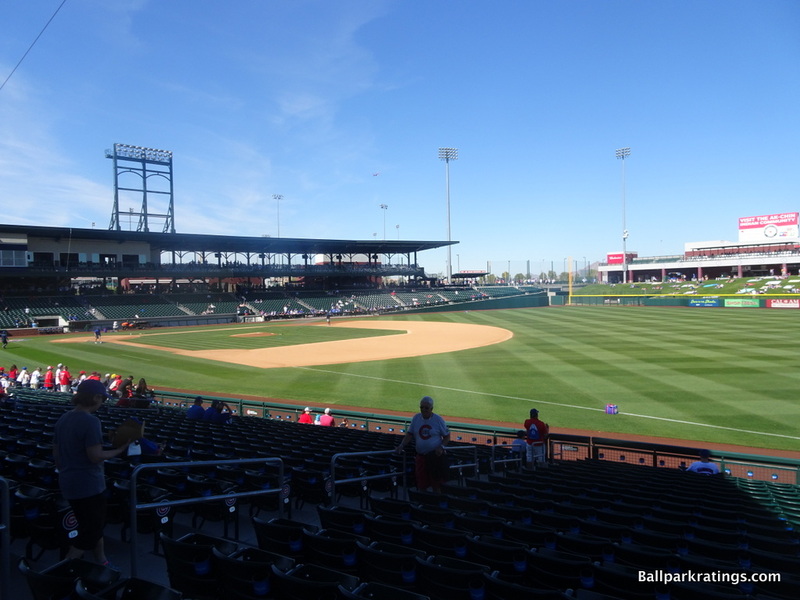 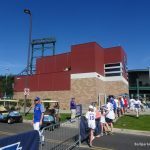 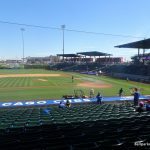 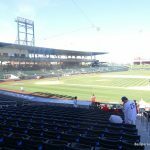 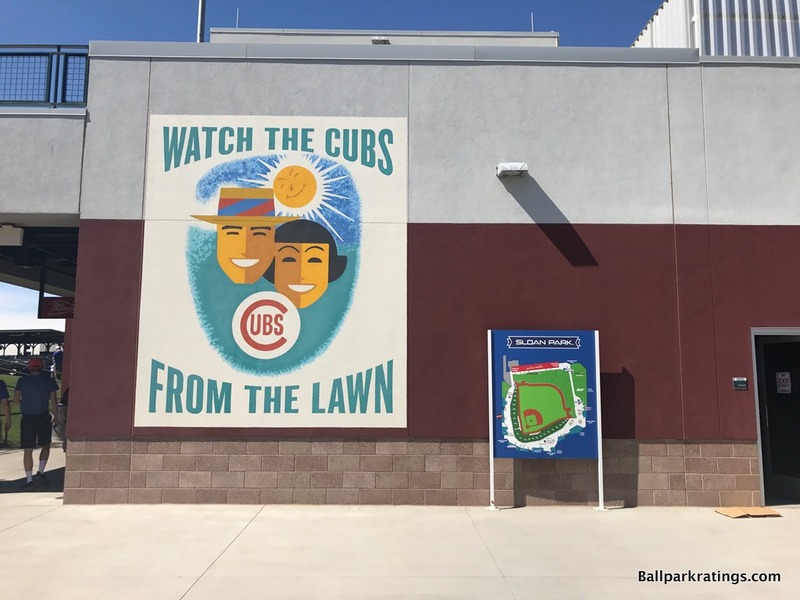 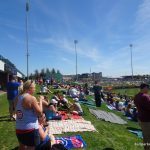 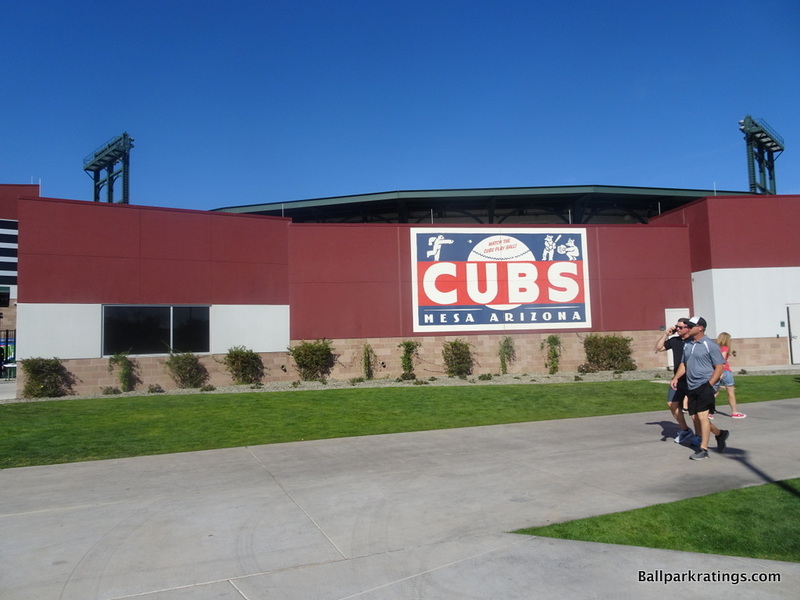 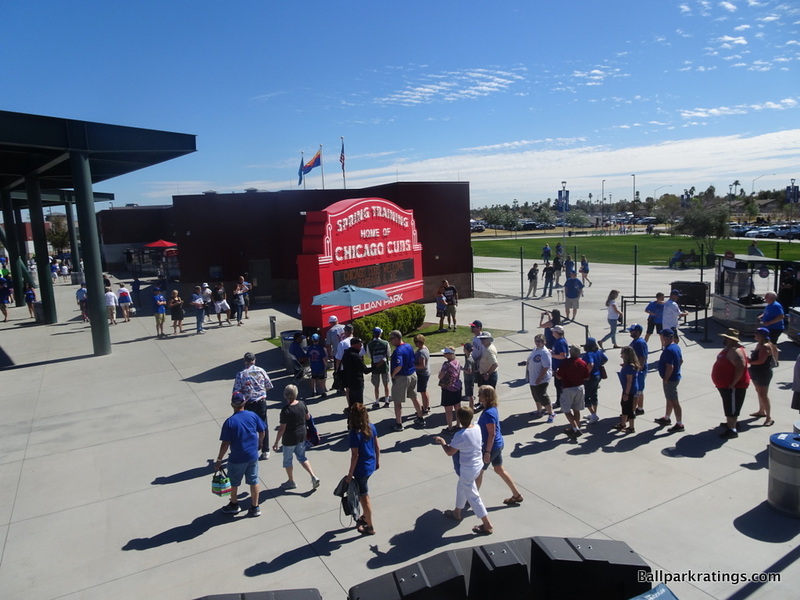 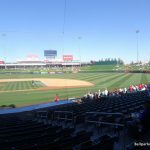 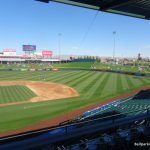 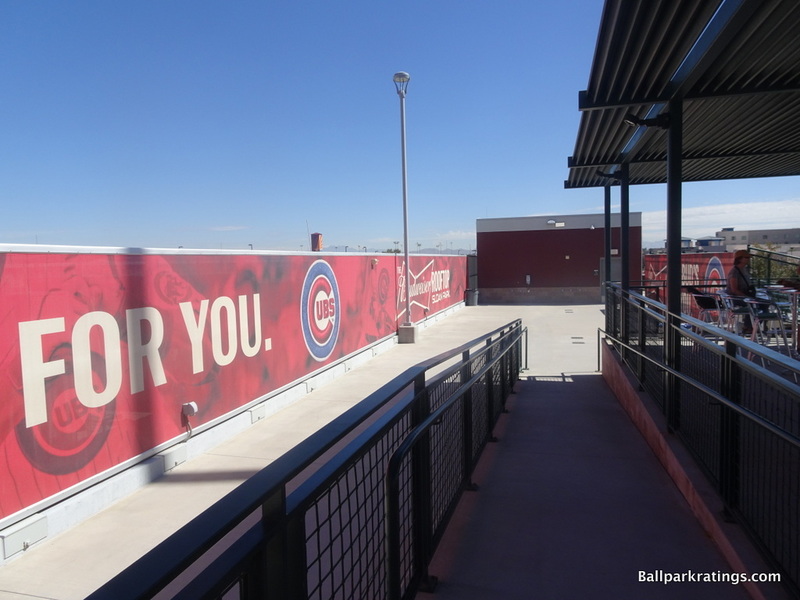 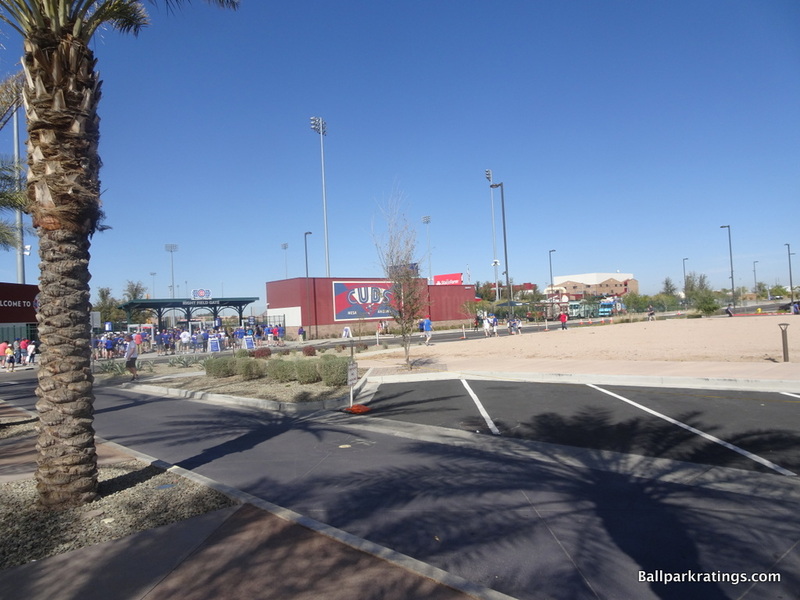 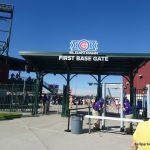 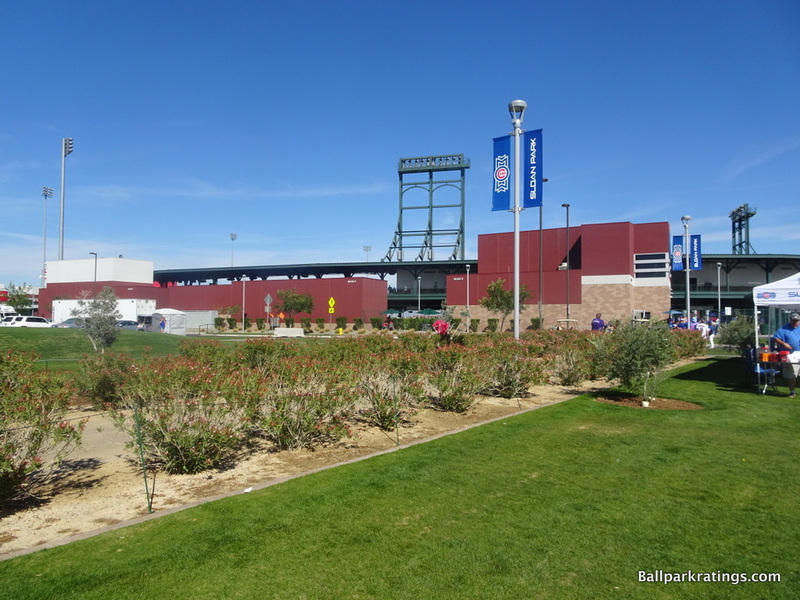 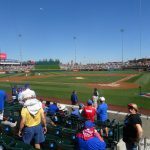 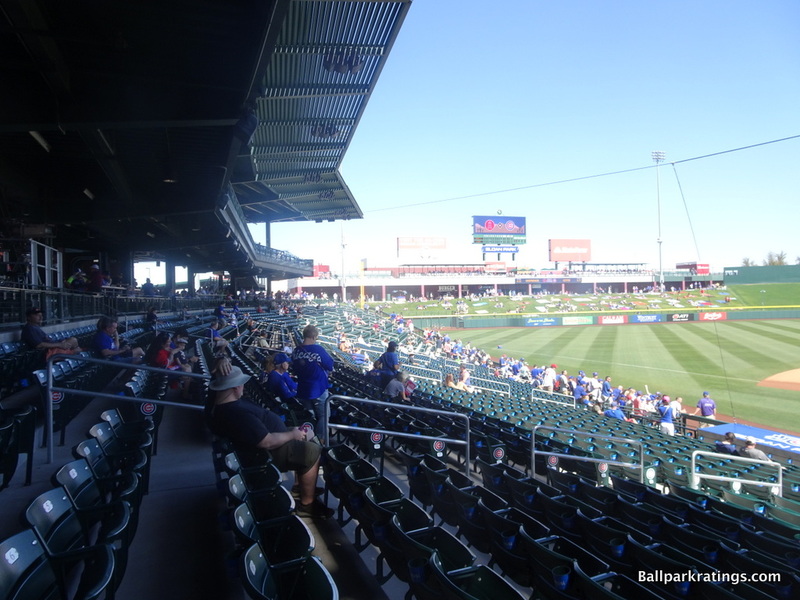 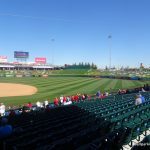 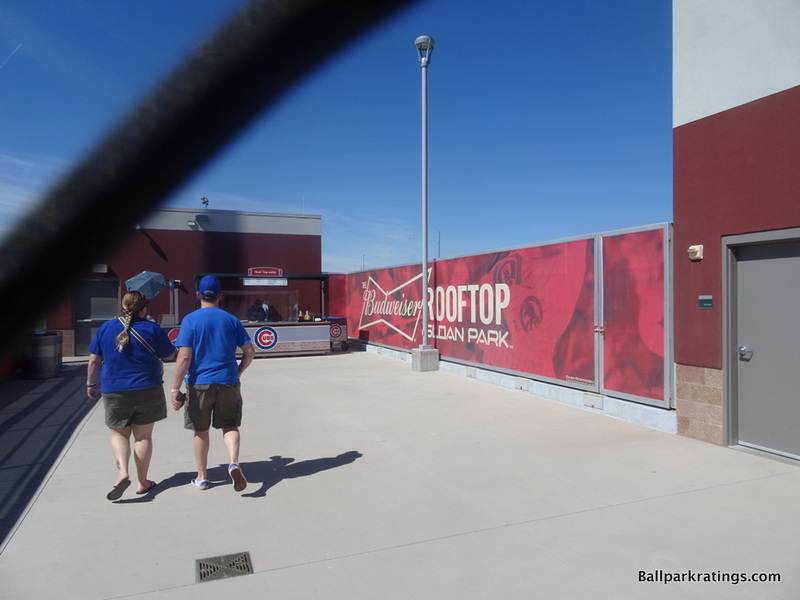 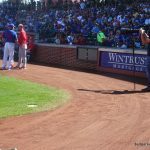 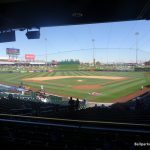 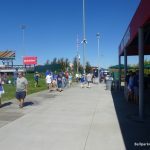 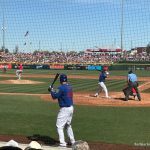 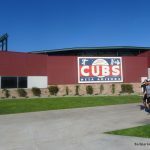 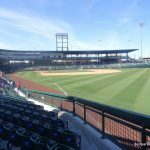 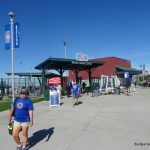 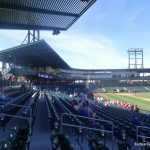 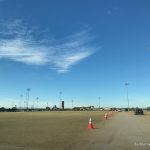 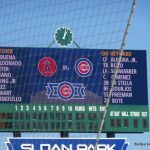 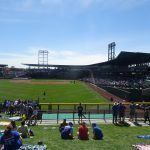 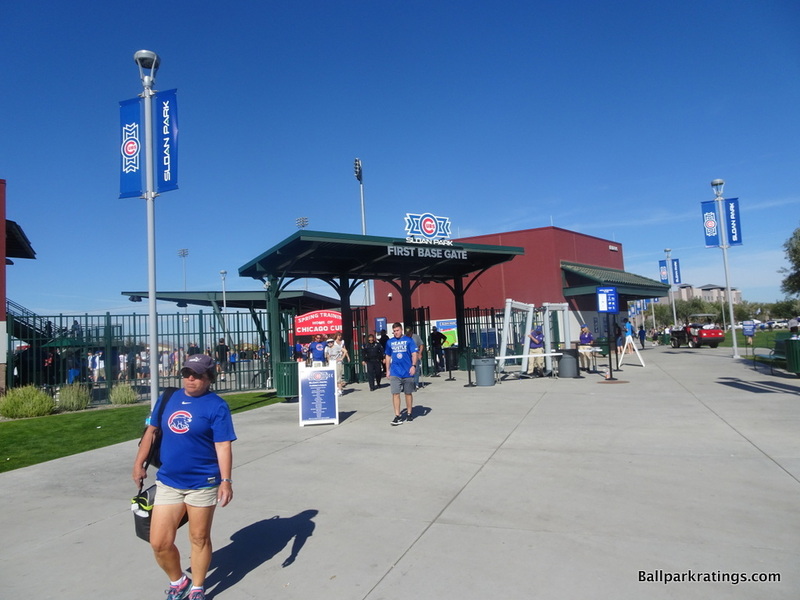 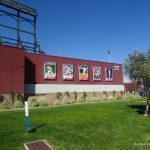 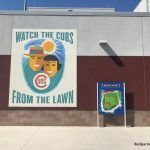 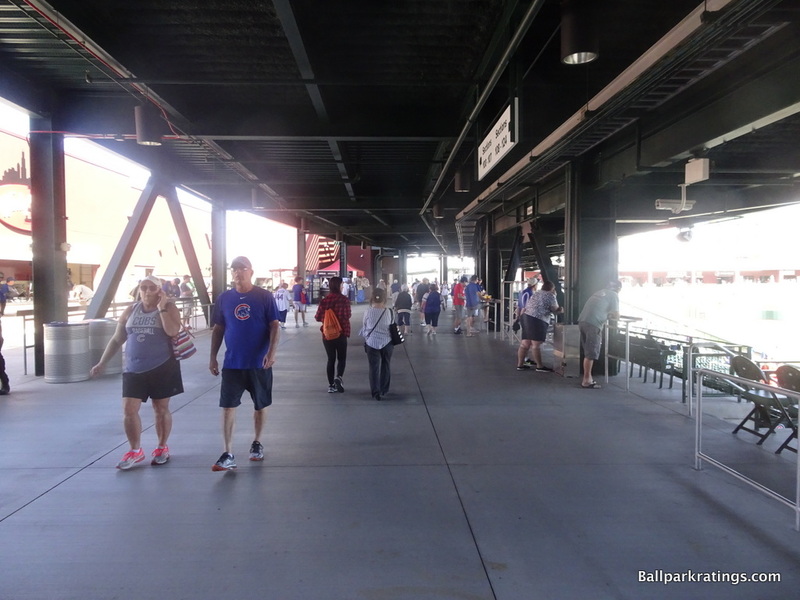 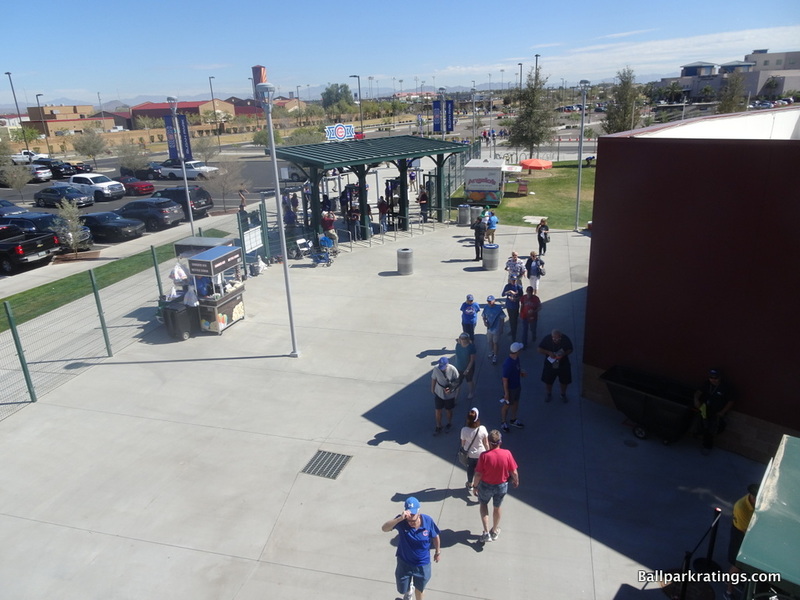 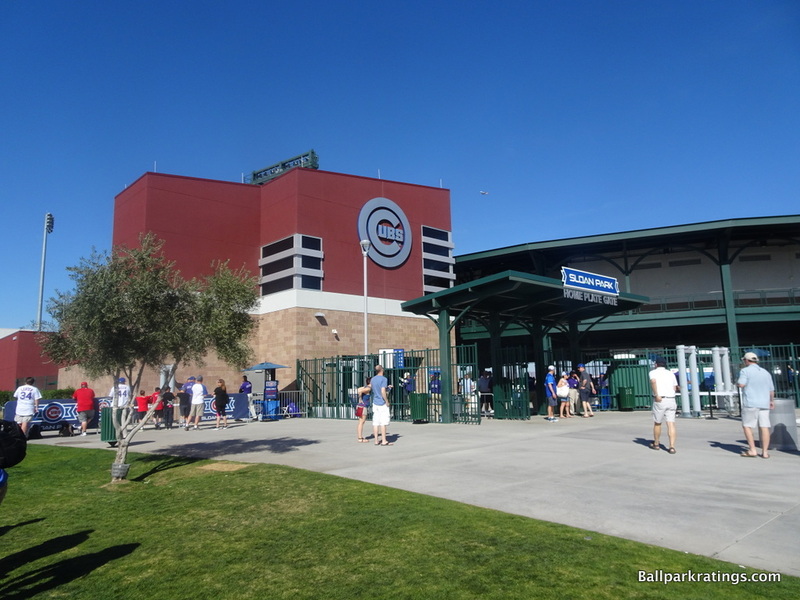 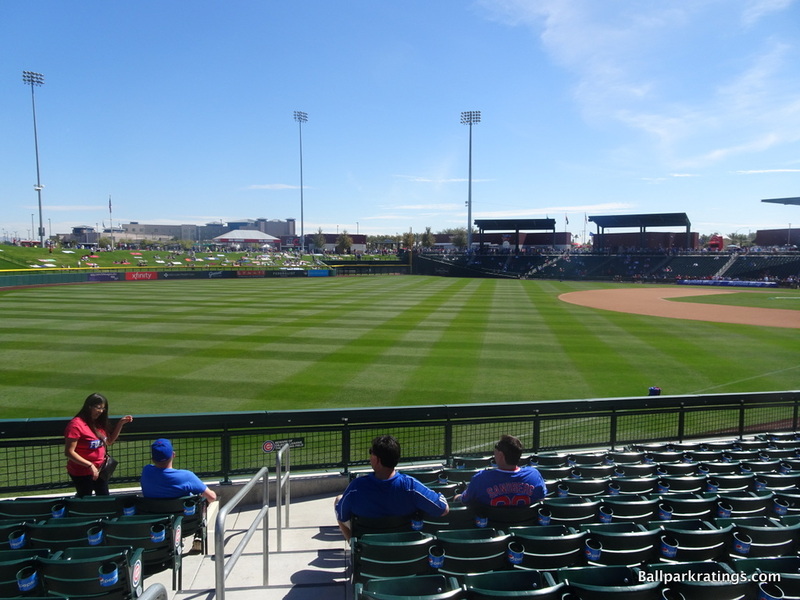 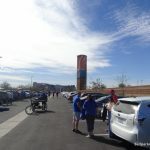 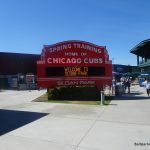 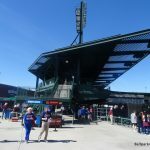 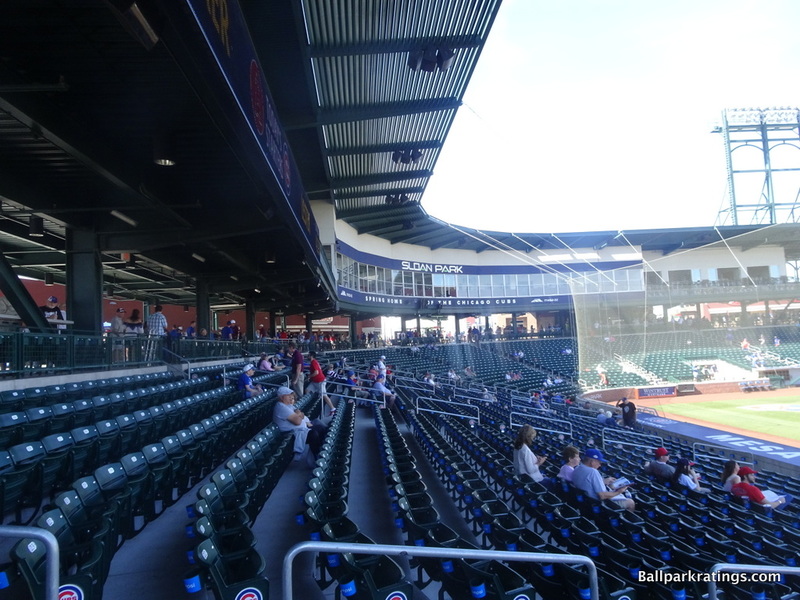 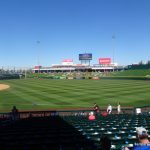 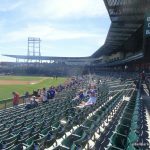 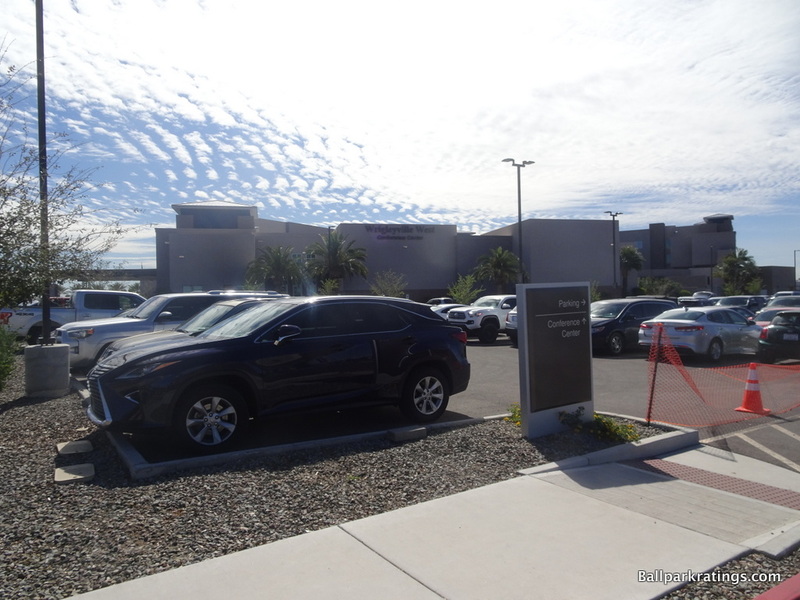 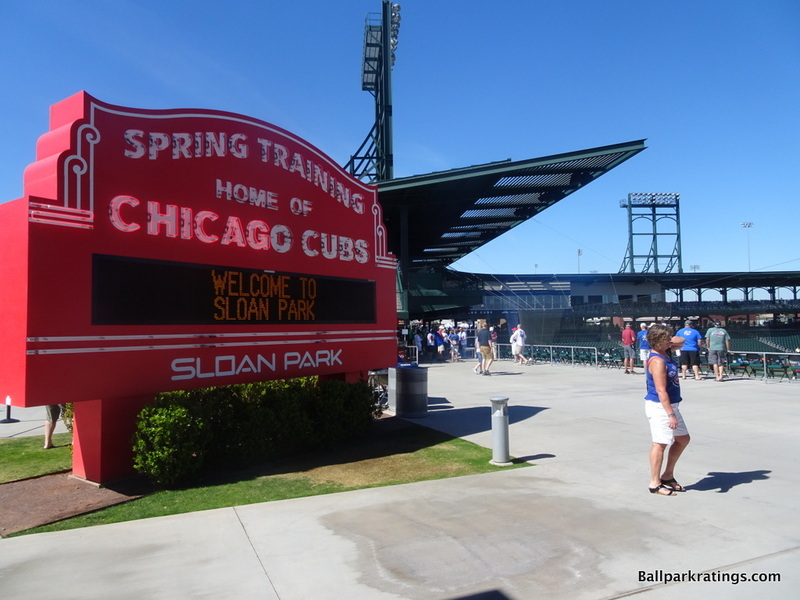 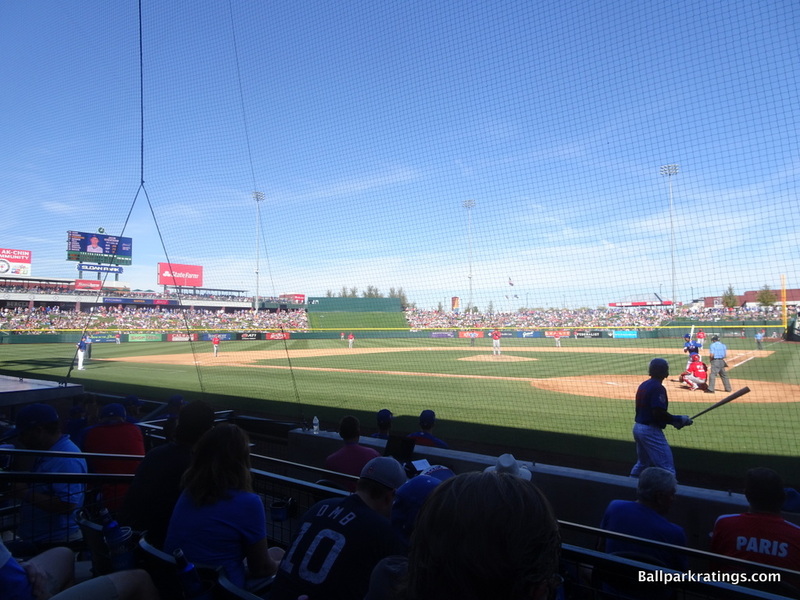 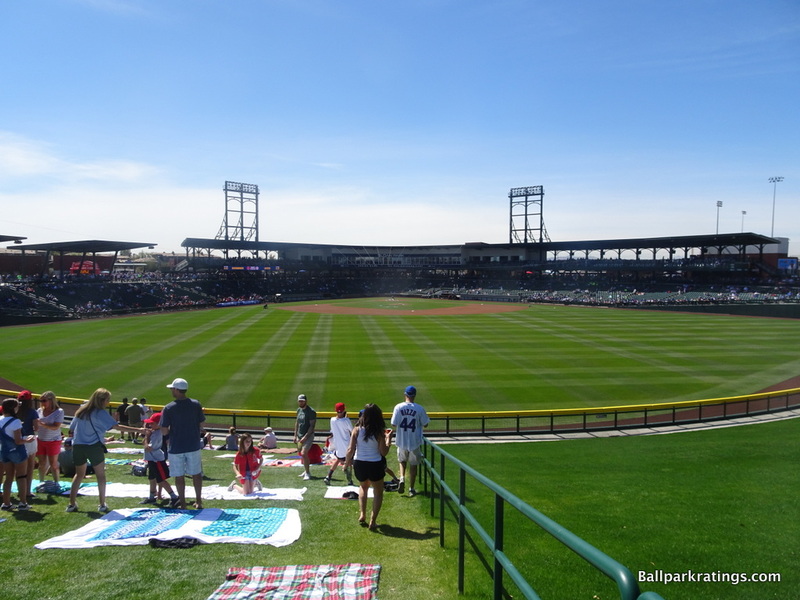 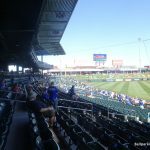 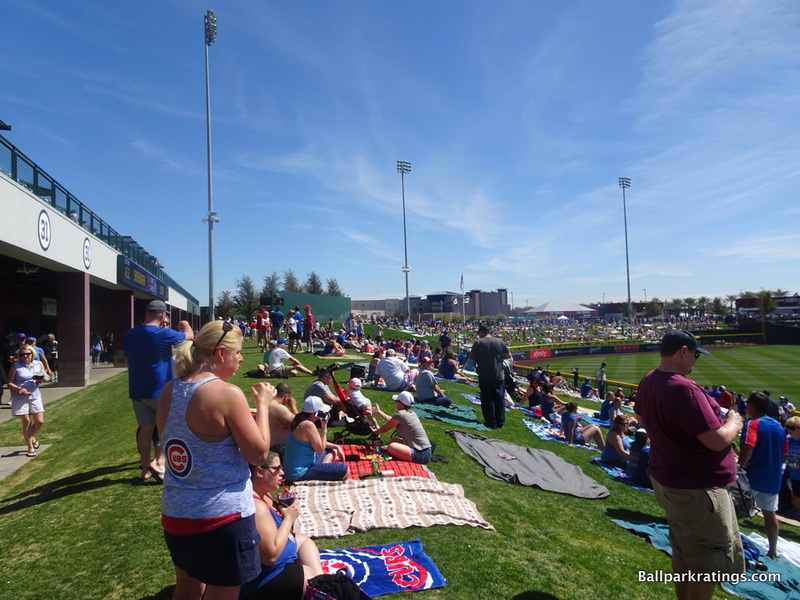 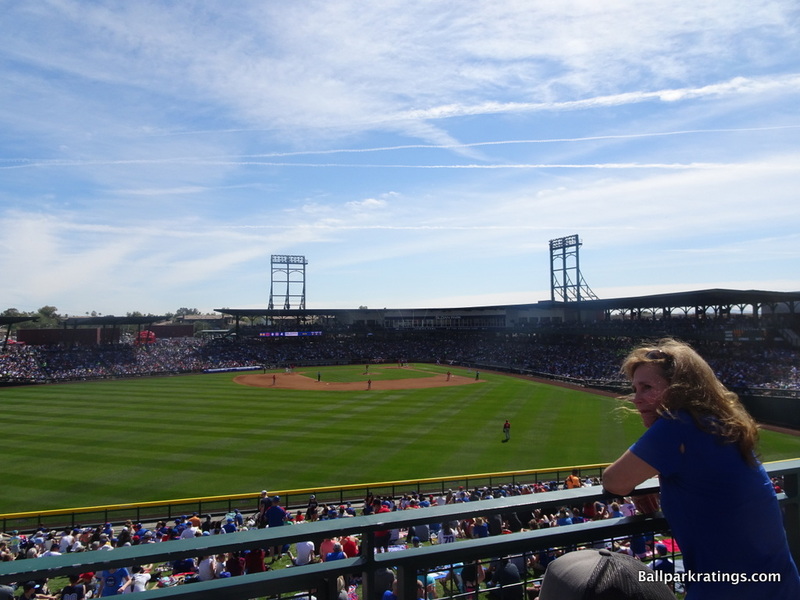 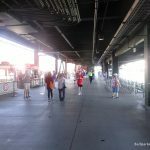 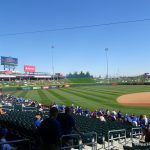 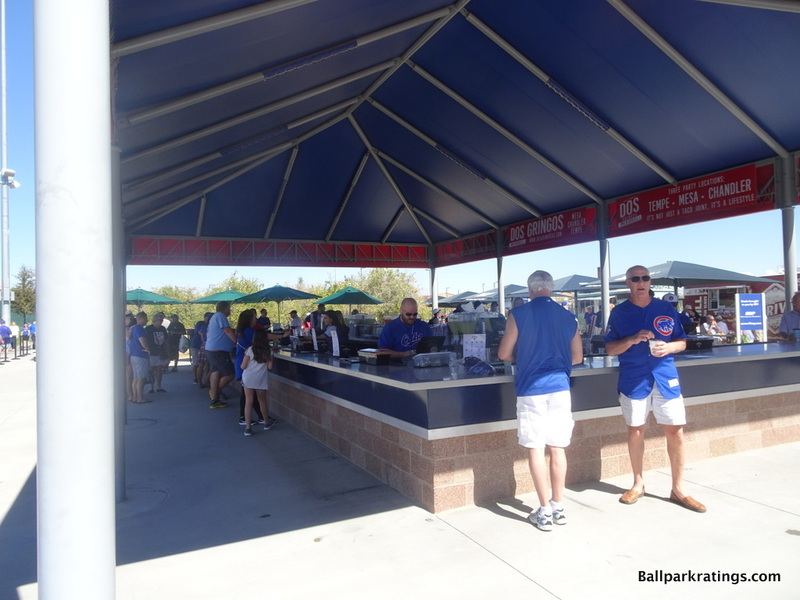 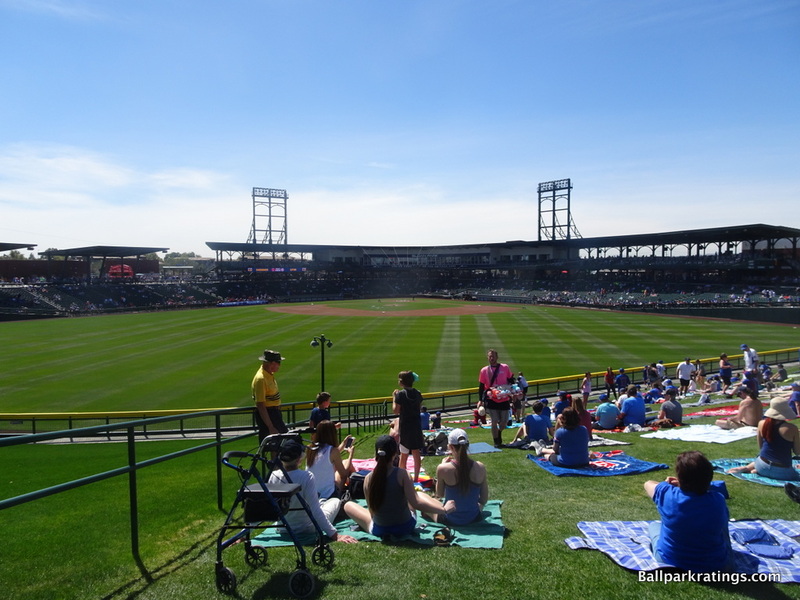 Without any major flaws and plenty of outstanding features, Sloan Park possesses all of the essentials and lovely aesthetics, but it stands near the top for its perfect mix of Cubs’ tradition and state-of-the-art amenities.